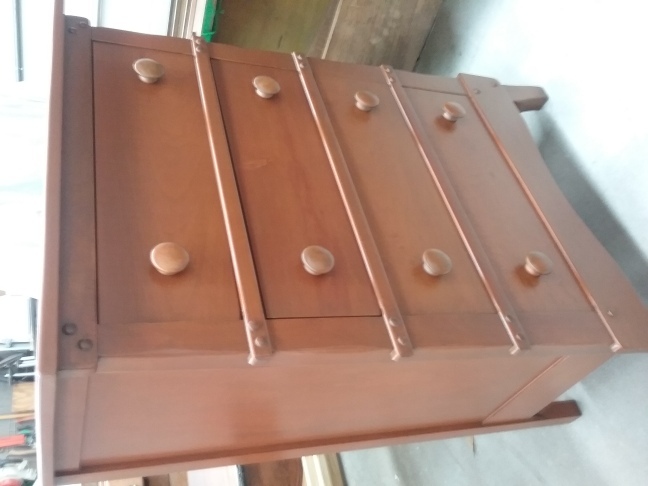 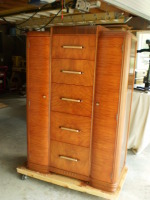 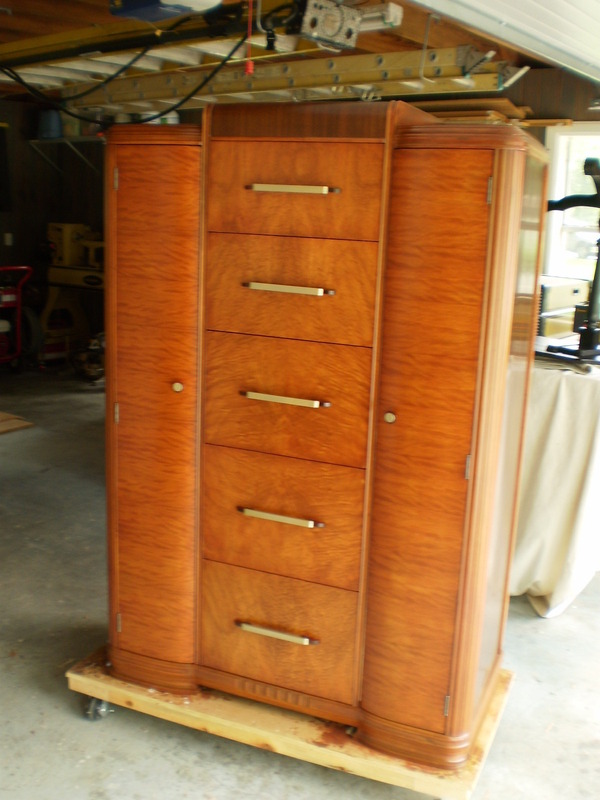 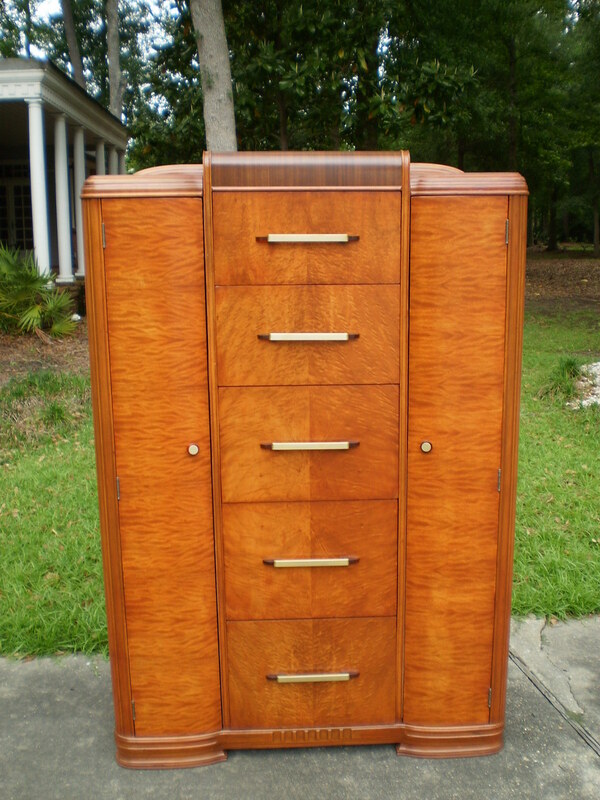 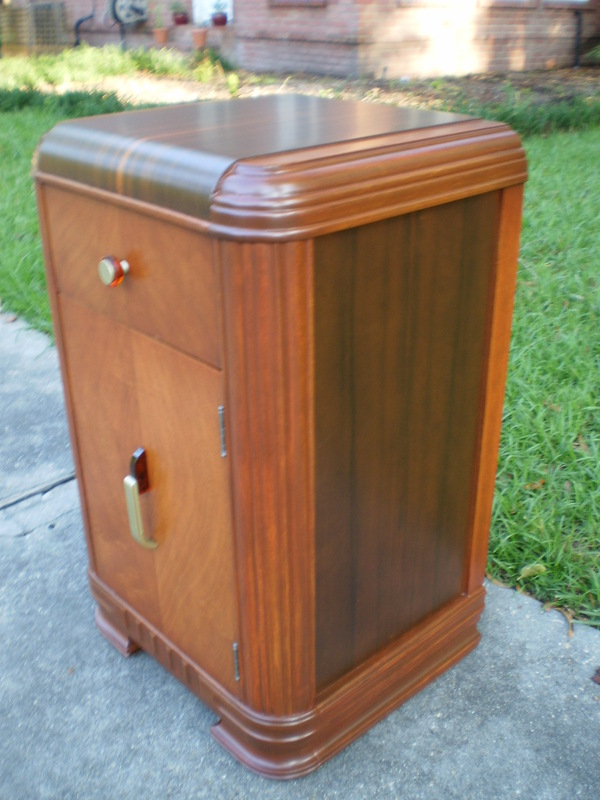 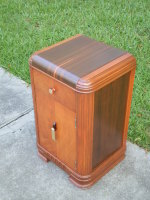 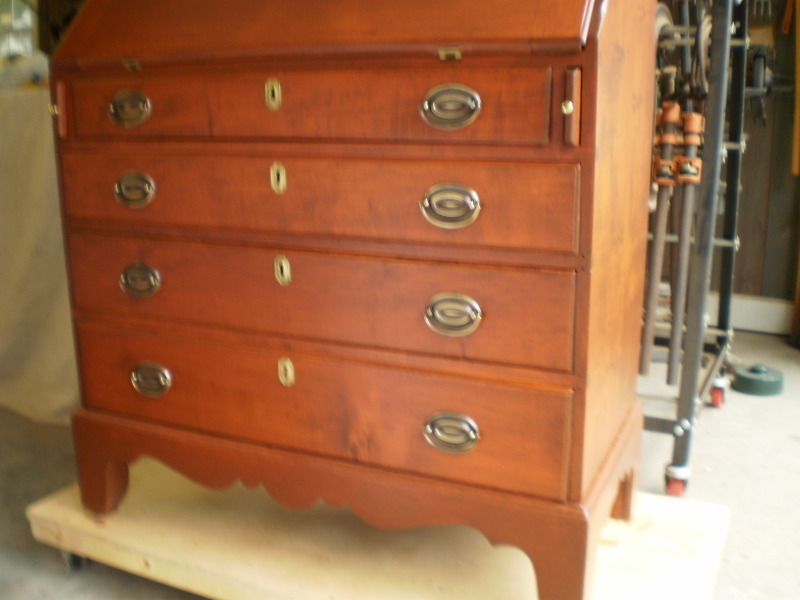 This piece of furniture was a pleasure to restore. 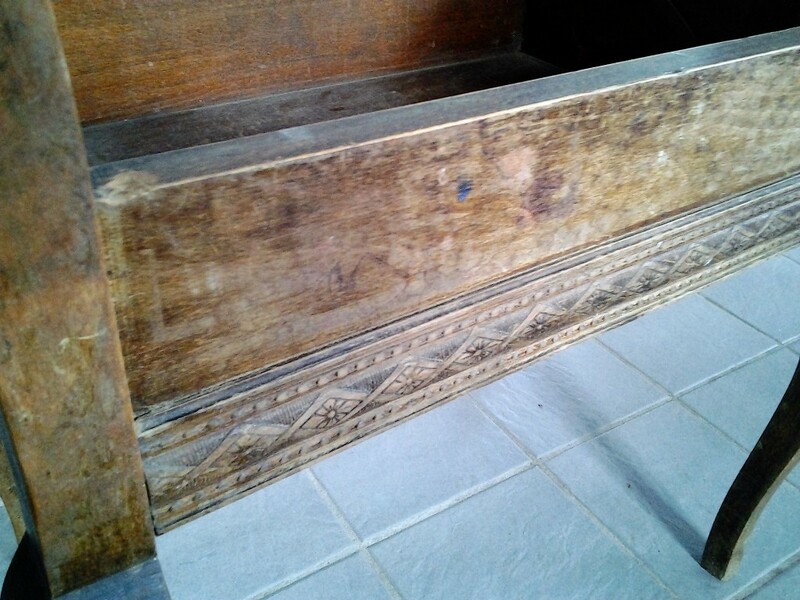 This was an old coffee table that was originally bought in the Philippines. 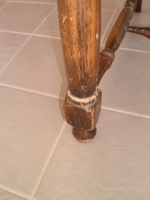 One leg had been repaired at least twice, but still was not stable. 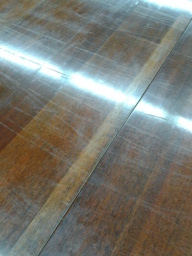 Also, there were water stains on the surface. 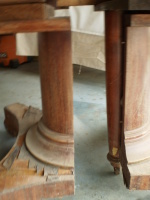 After the restoration, the owner couldn't determine which leg was broken. 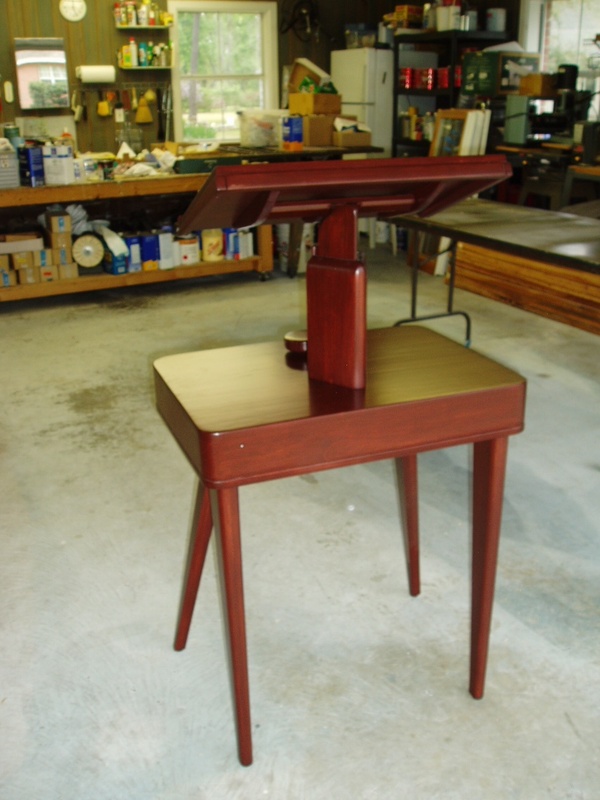 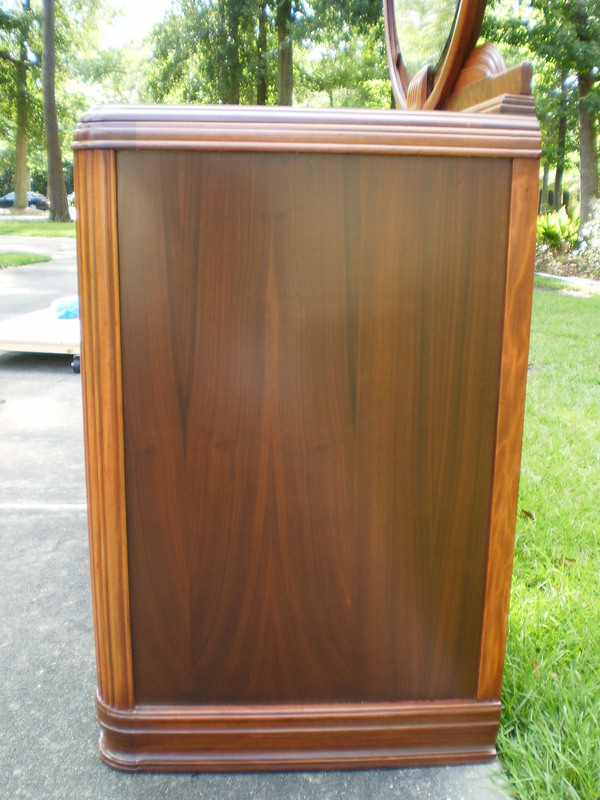 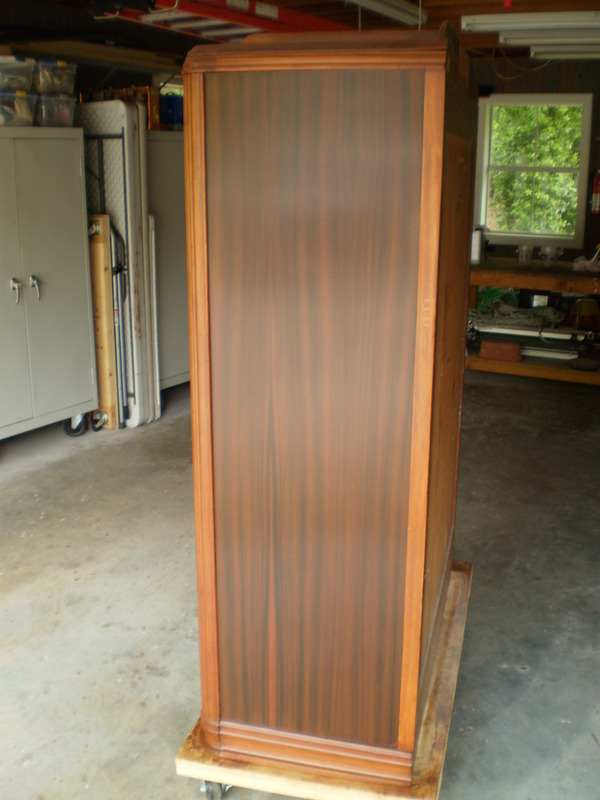 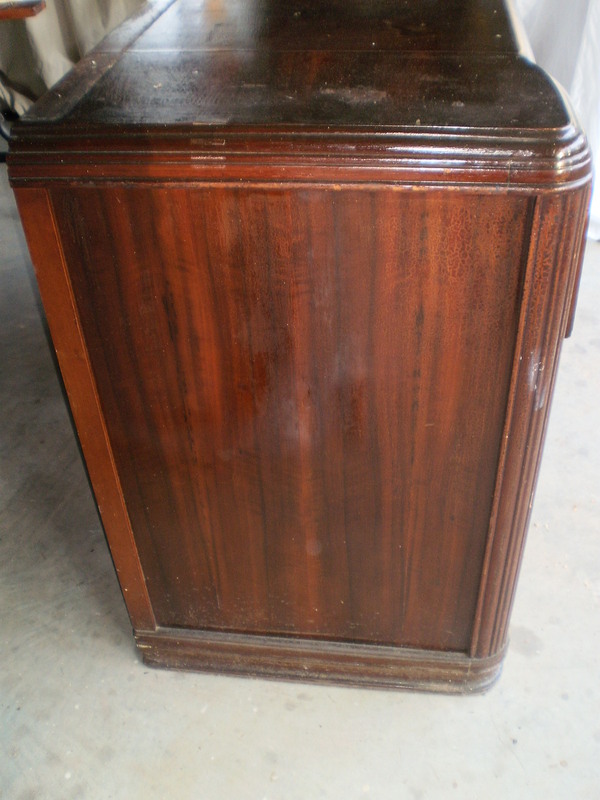 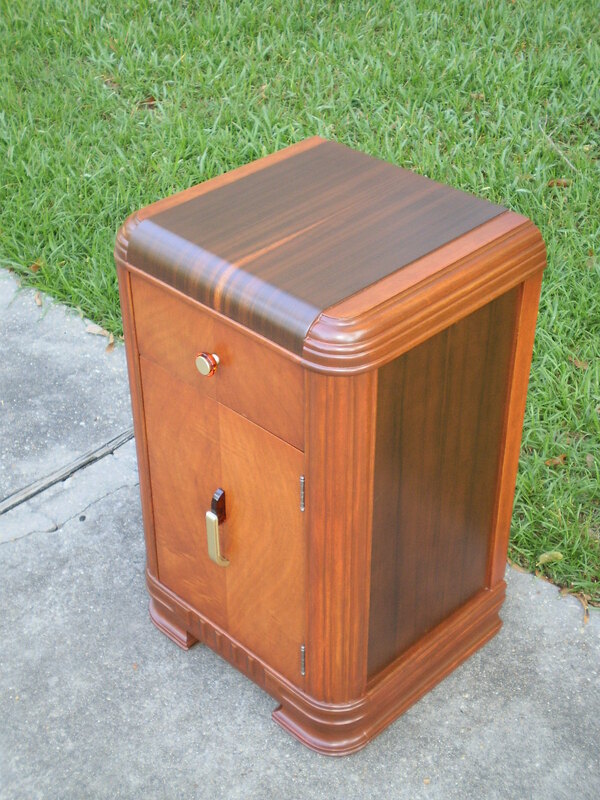 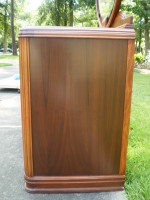 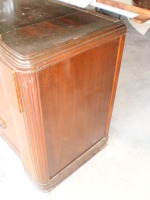 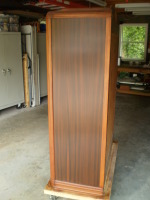 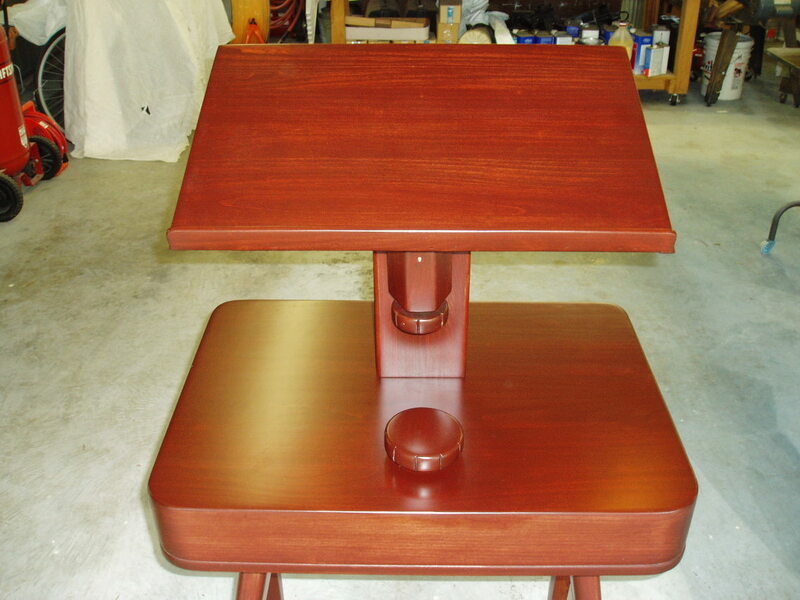 This lectern was in need of repair - the lift mechanism was broken and needed completely refinishing. 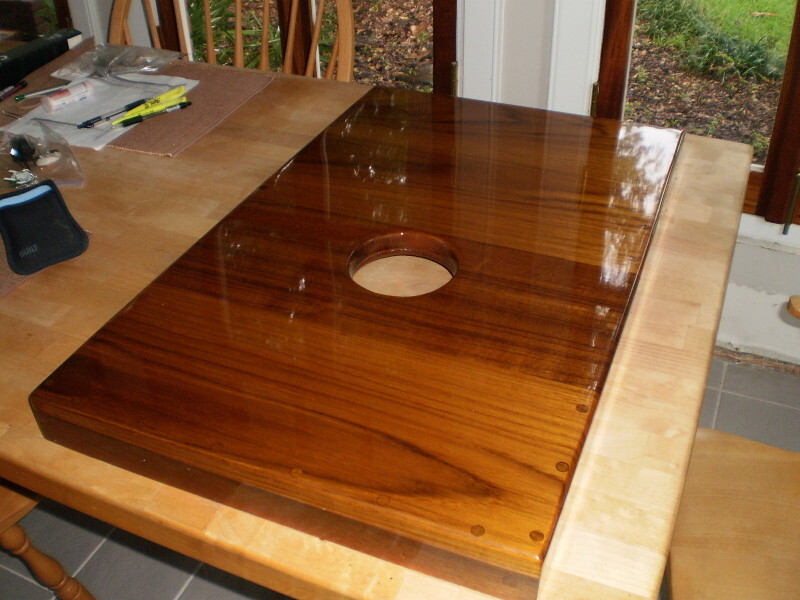 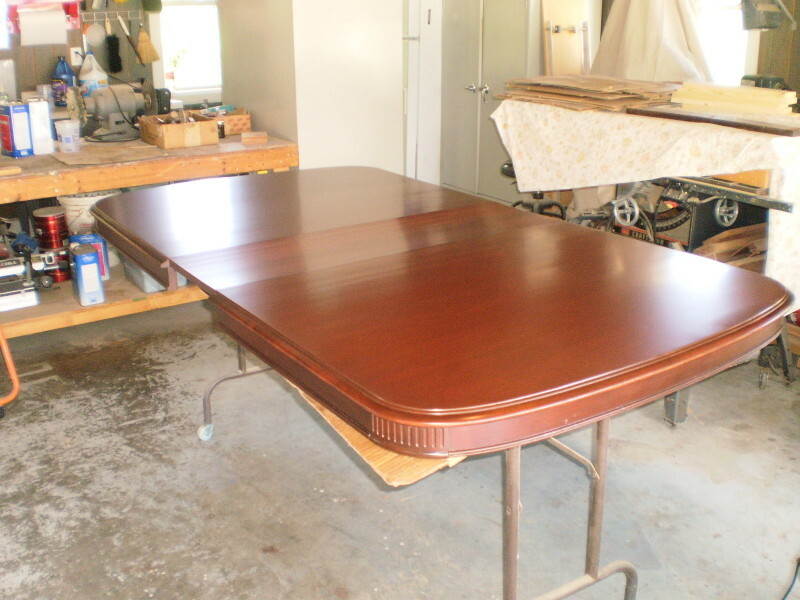 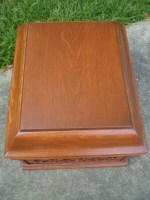 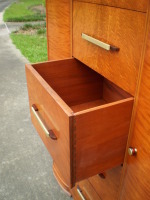 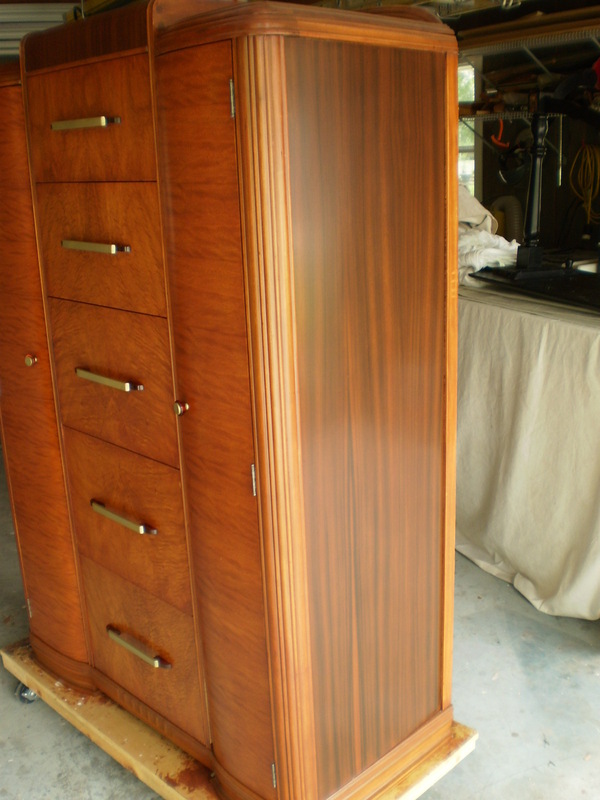 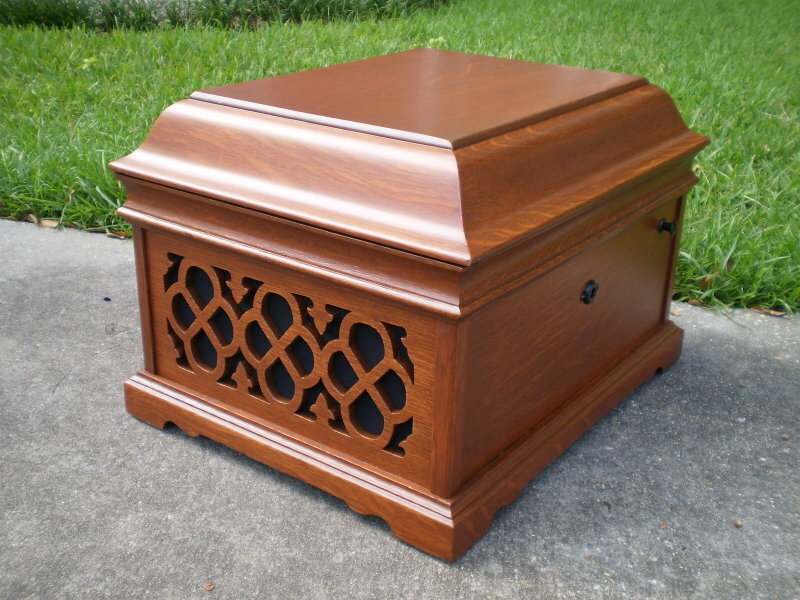 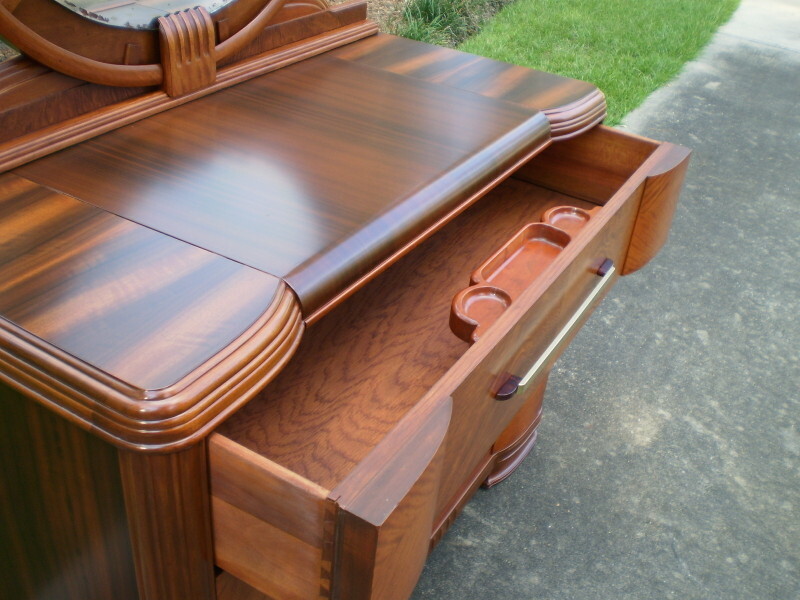 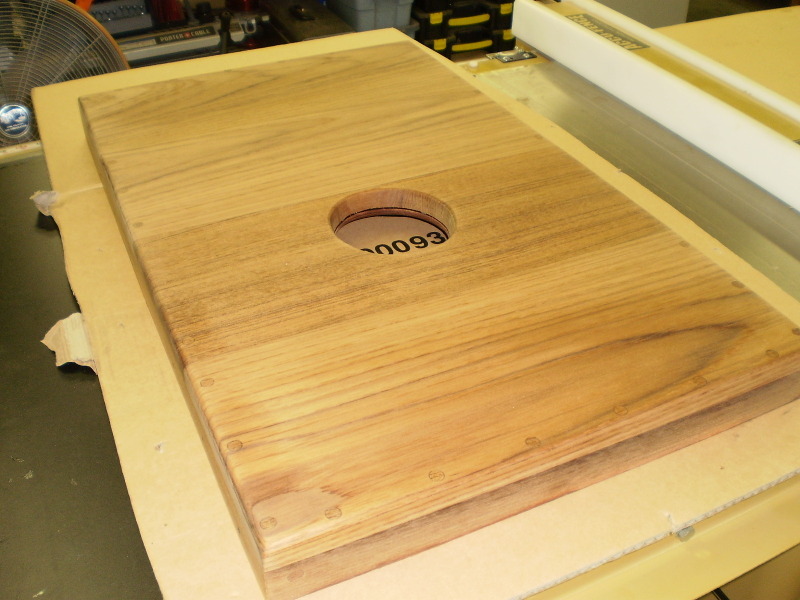 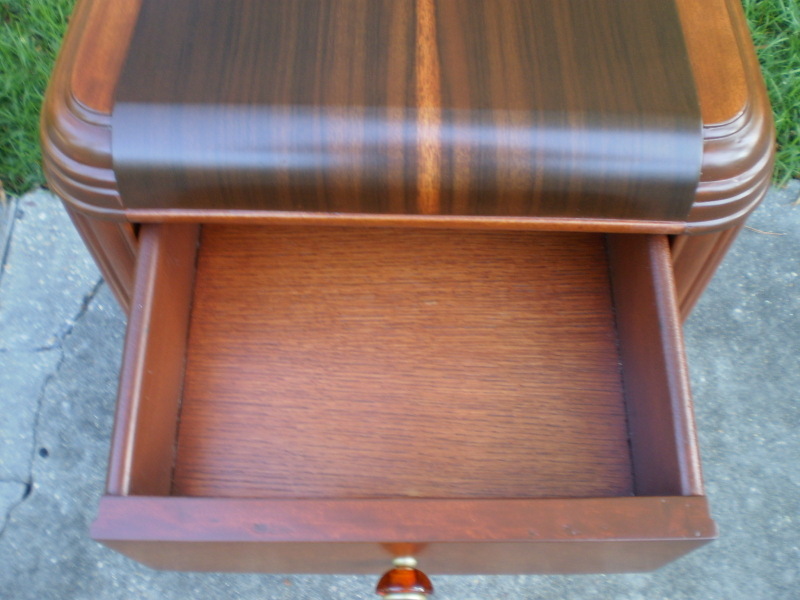 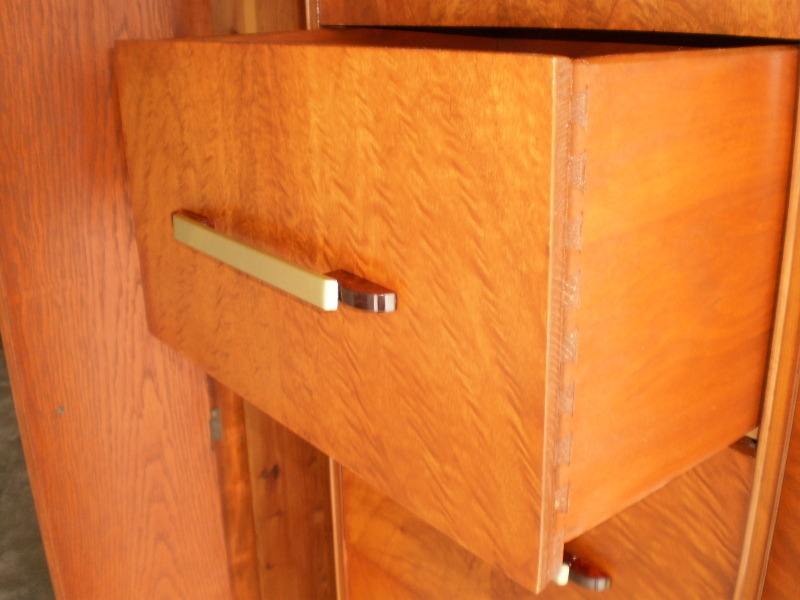 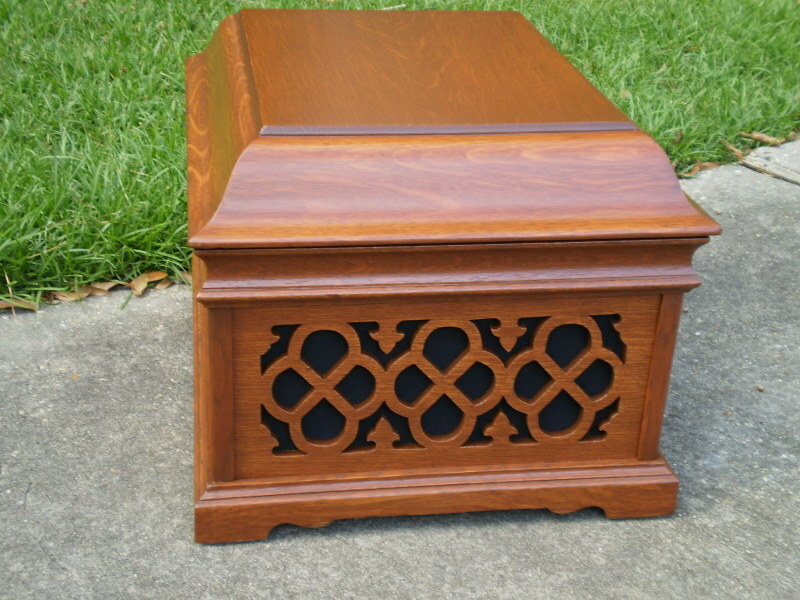 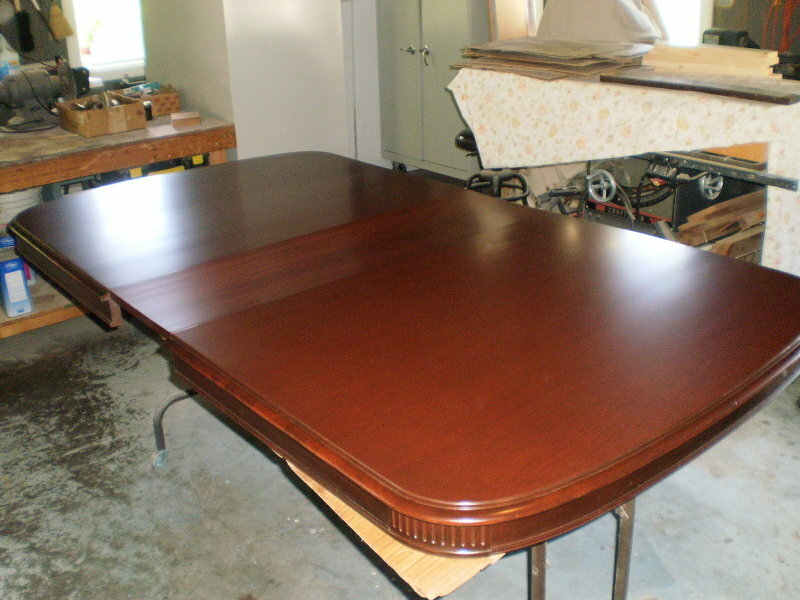 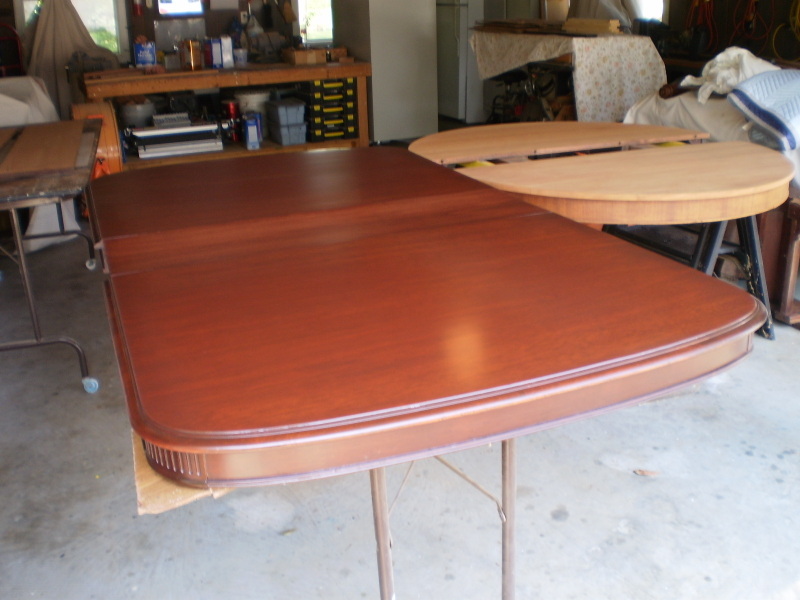 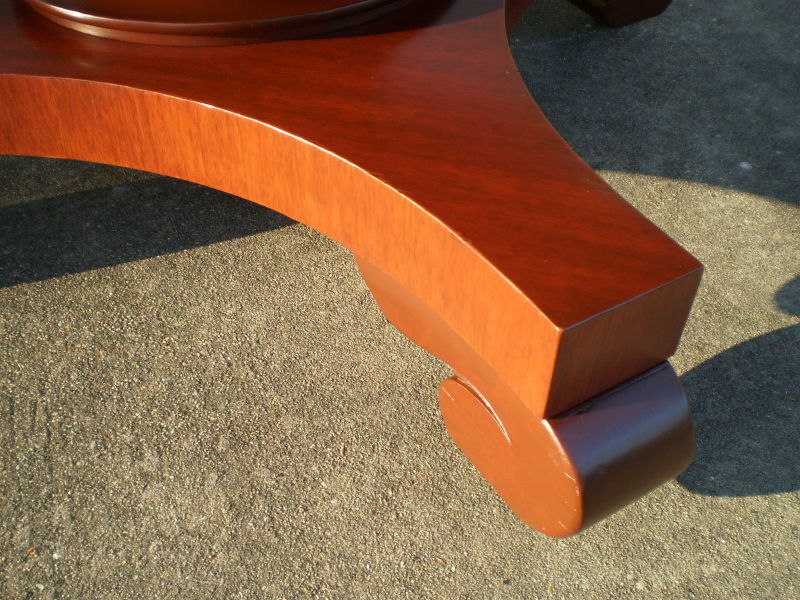 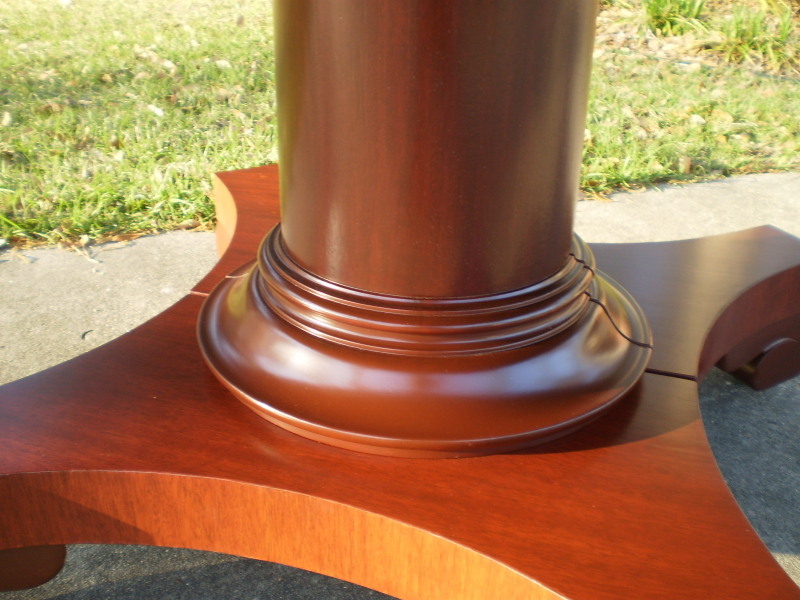 Once the finish was stripped, it was stained a rich mahogany stain and then refinished with a conversion varnish. 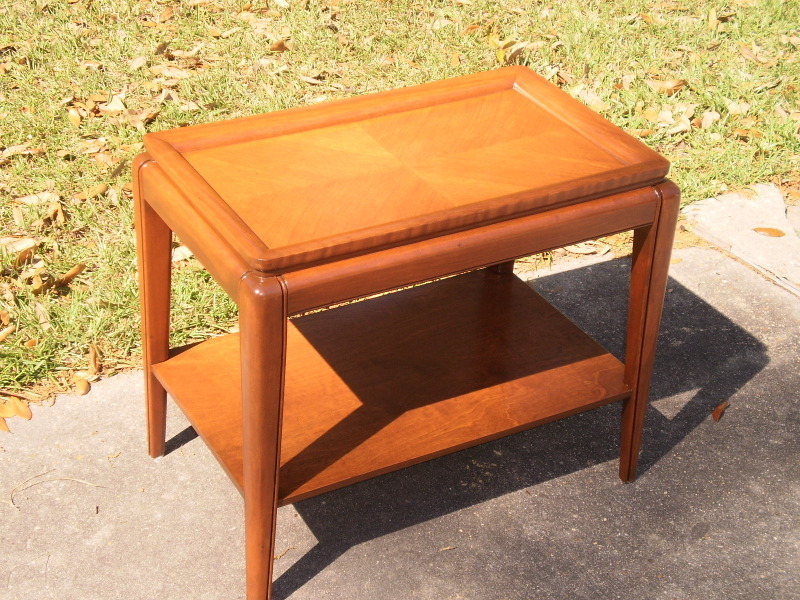 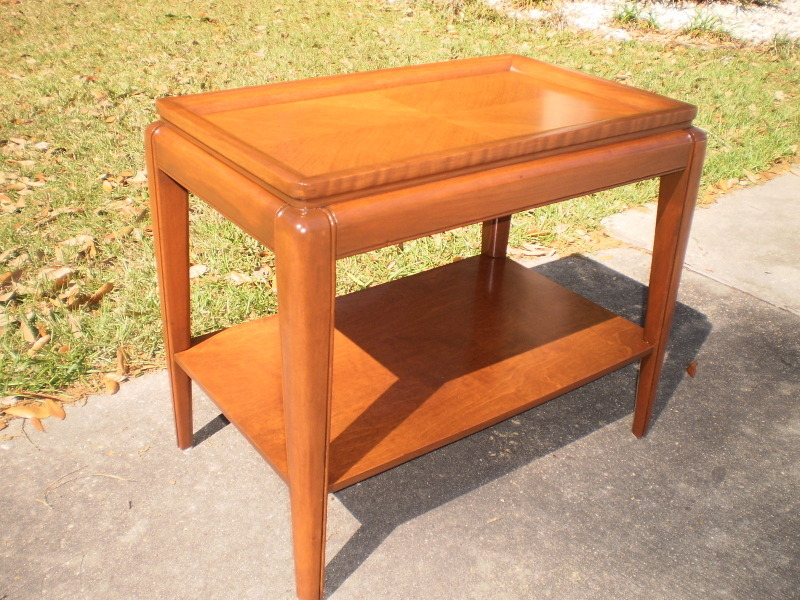 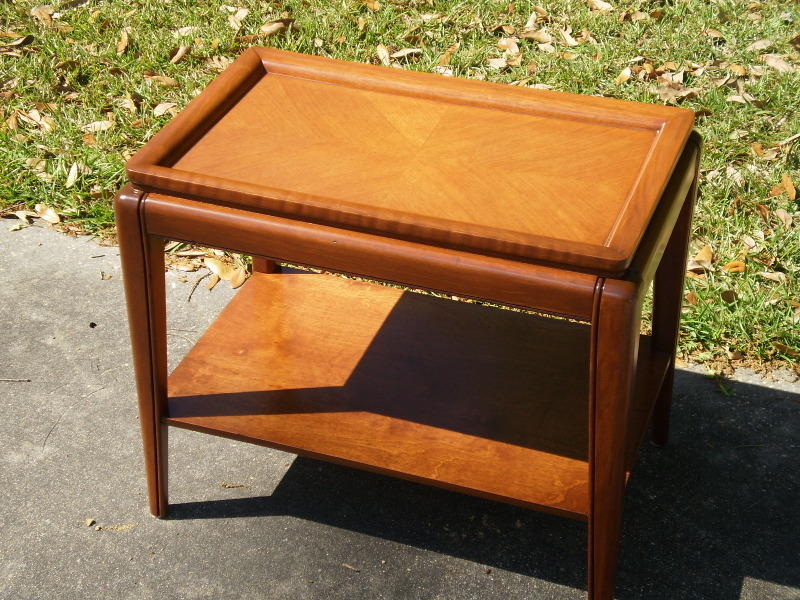 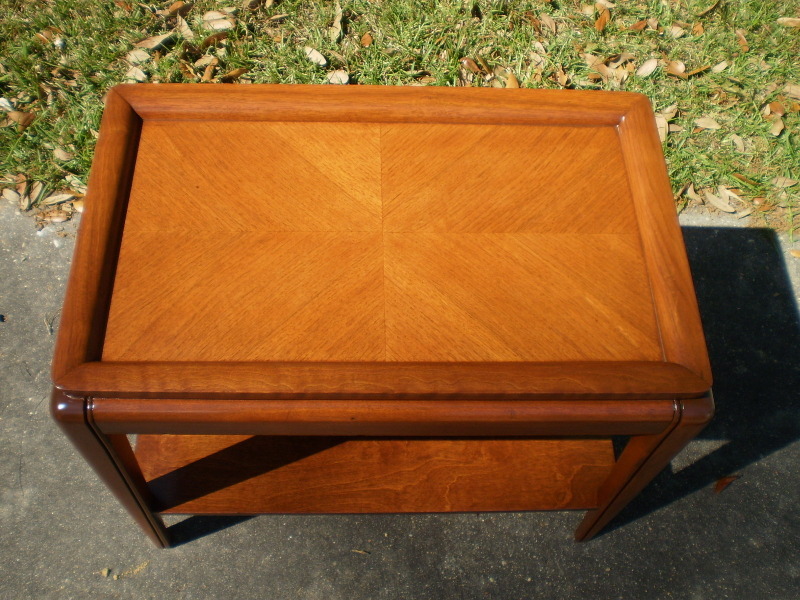 This is a 40 year old Ethan Allen solid maple side table. 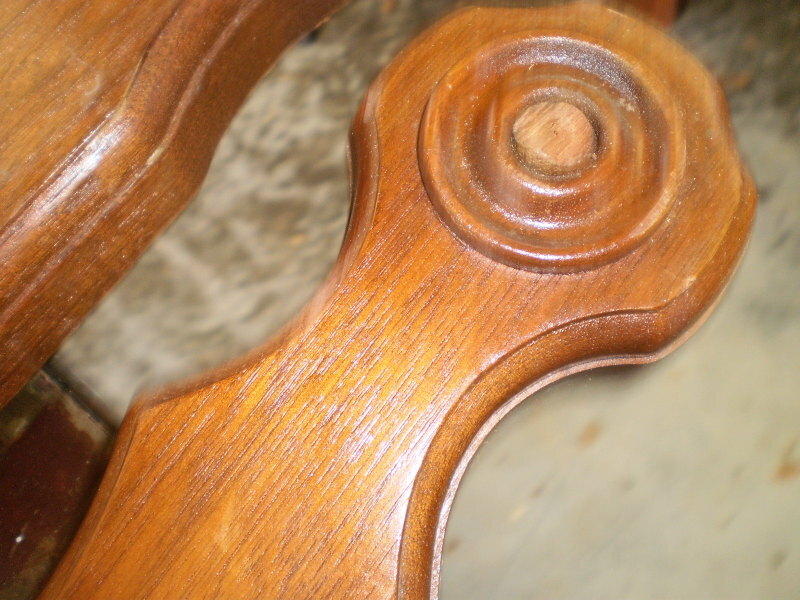 The finish was cracking and was in need of some TLC. The table was stripped without raising the grain or compromising the original shade of antique maple. 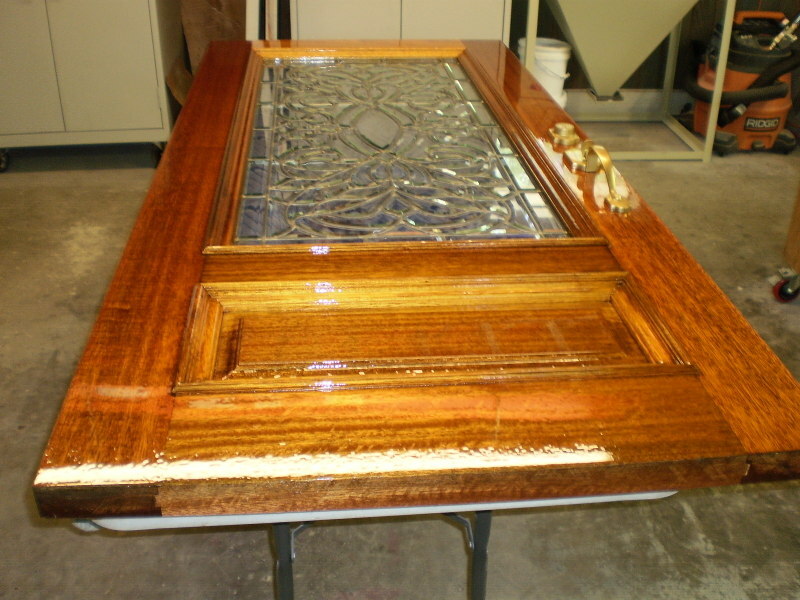 It was refinished with conversion varnish. 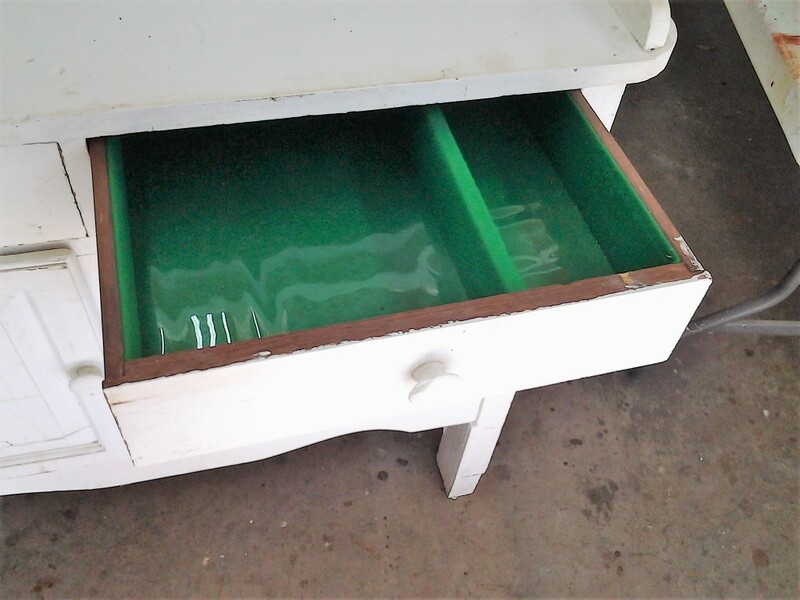 It's good for another 40 years! 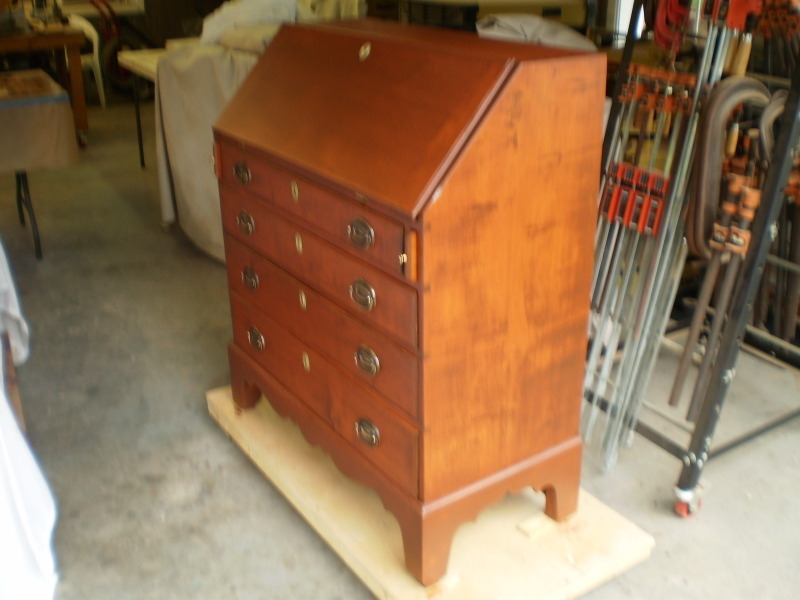 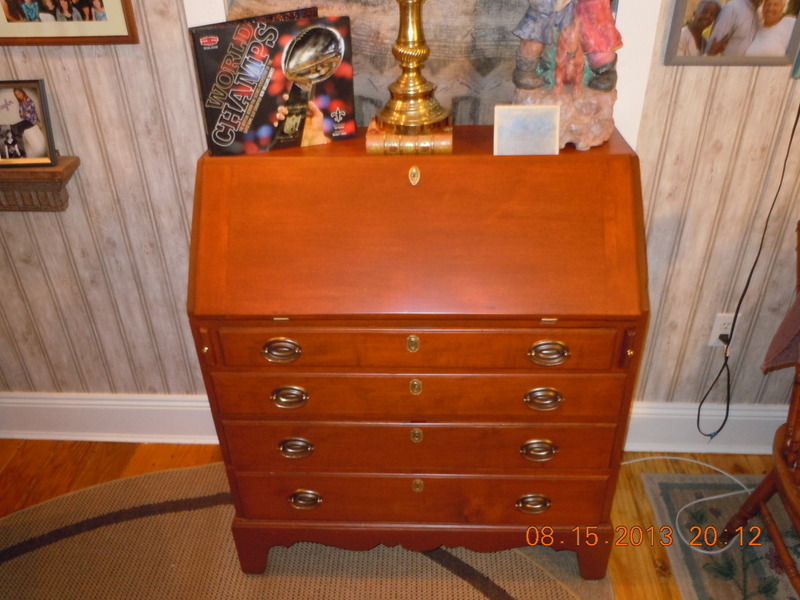 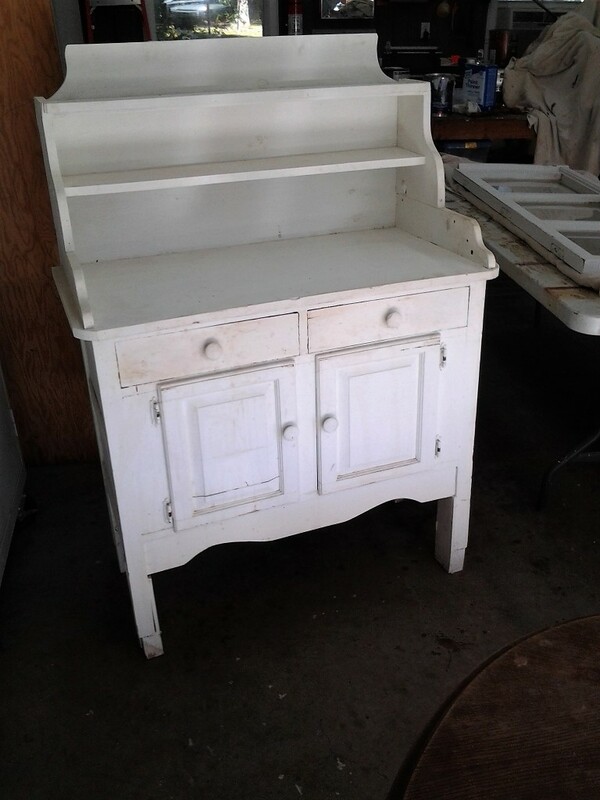 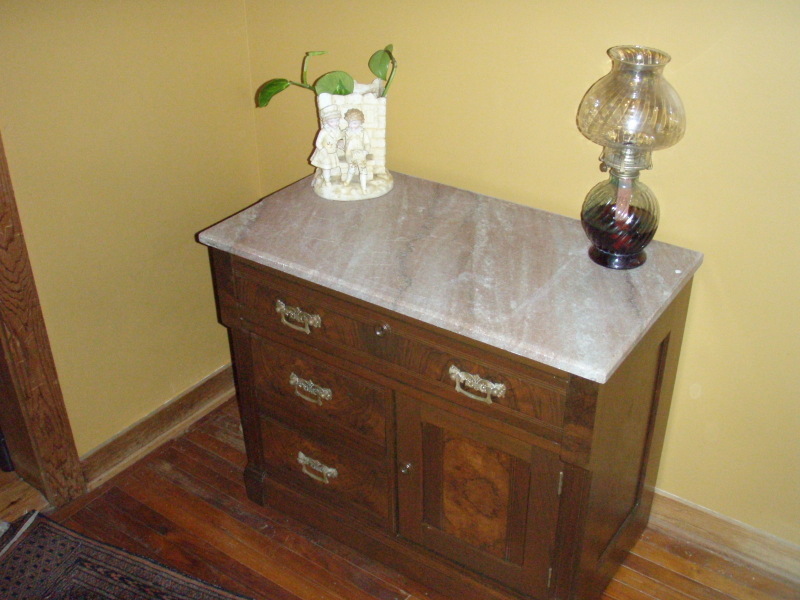 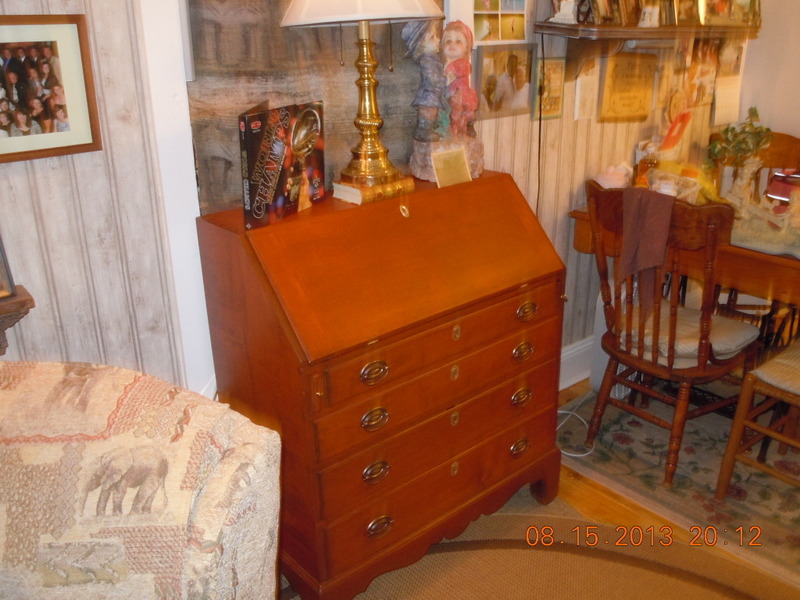 Now this piece of furniture was a joy to restore. This is a 40 year old piano bench that through many years of little Mozart hopefuls, had been scratched and nicked up pretty bad. 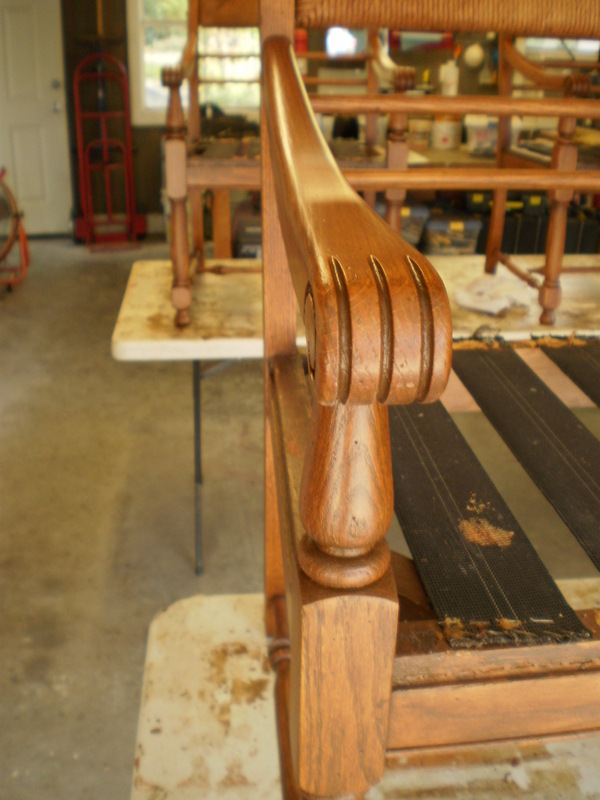 It was carefully striped, cleaned, stained to match the original aged look, and refinished with conversion varnish. 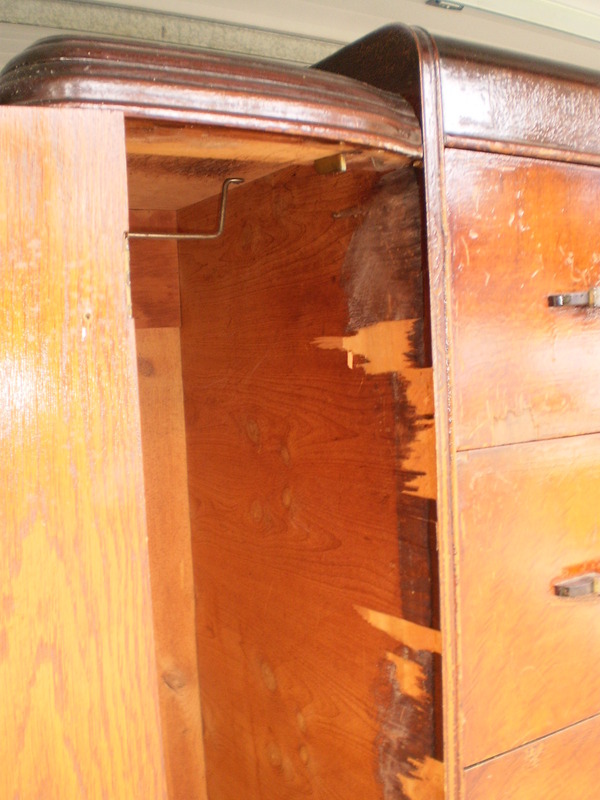 It's now suitable for another 40 years! 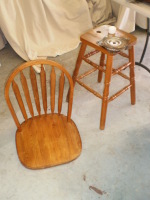 Although this is not a woodworking project, it does demonstrate my ability to restore just about anything. 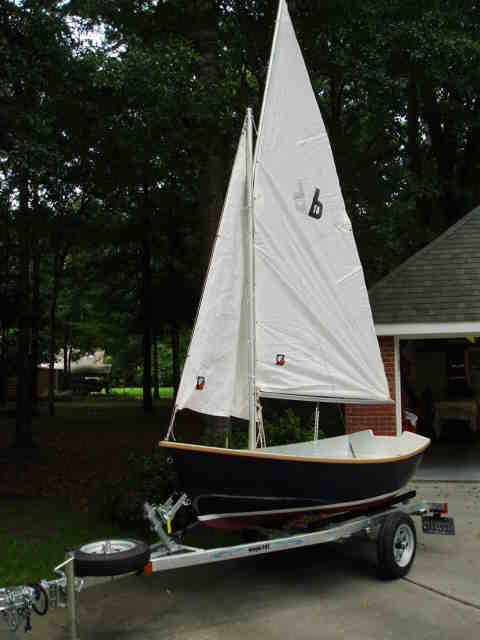 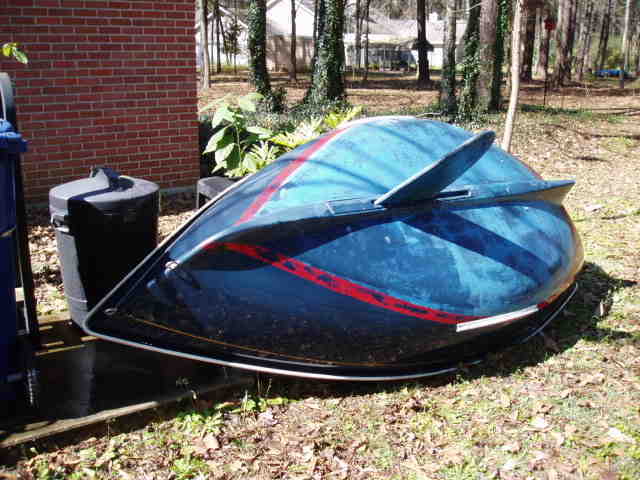 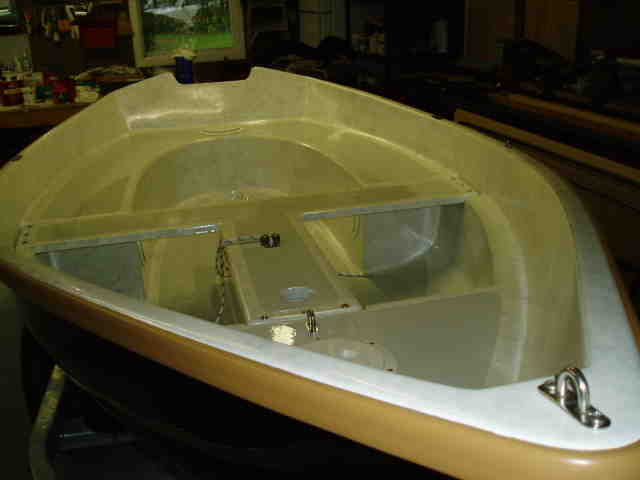 This is a custom Bauer 10' fiberglass dingy. 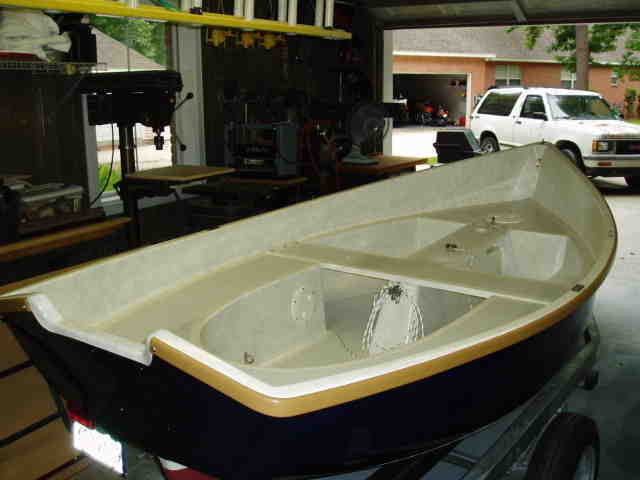 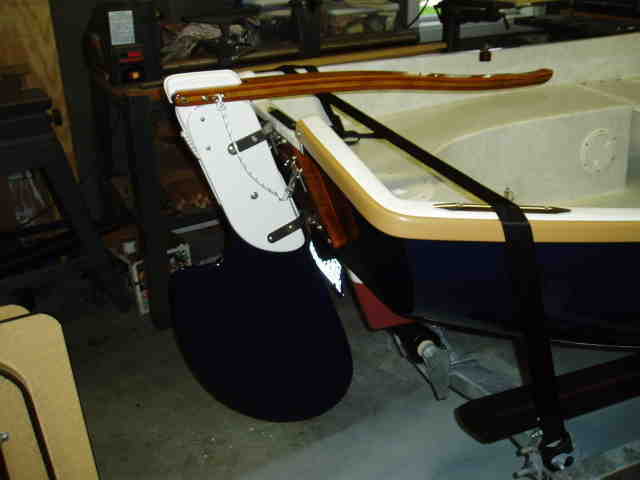 I completely rebuilt it with Awlgrip epoxy marine paint. 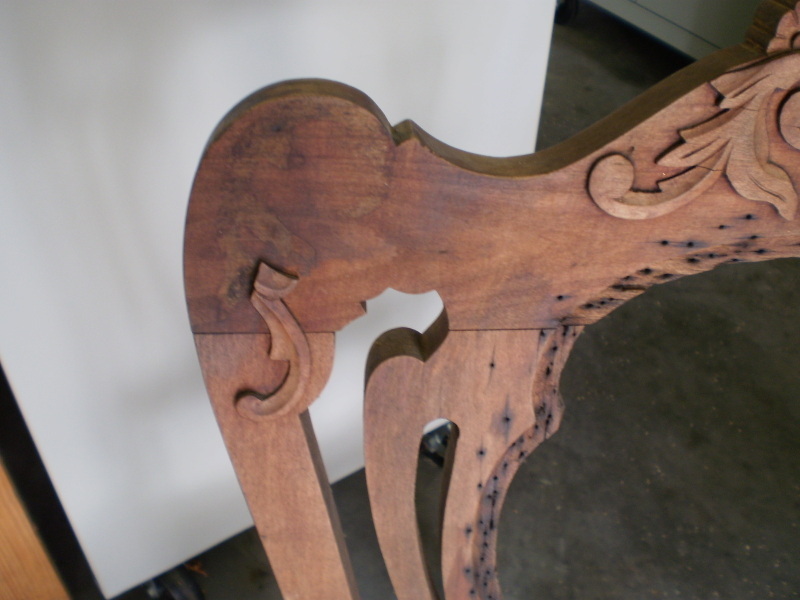 This was a special restoration. 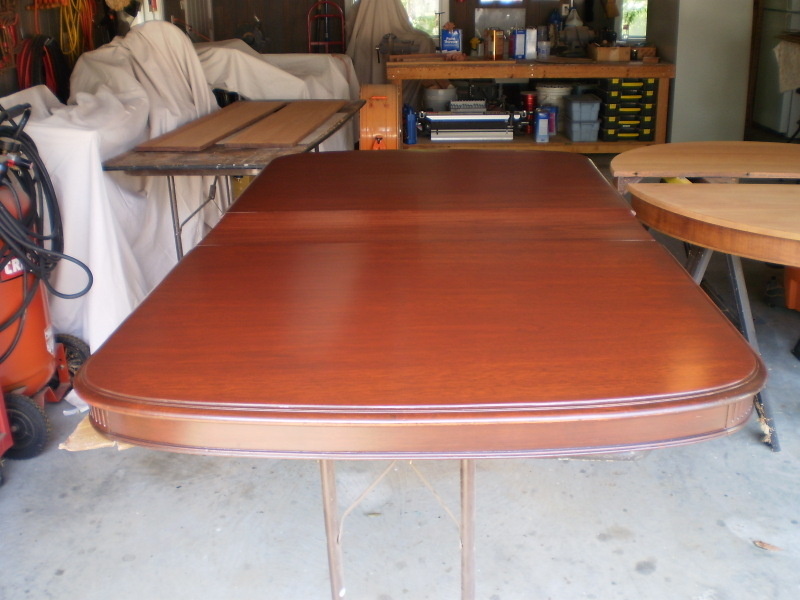 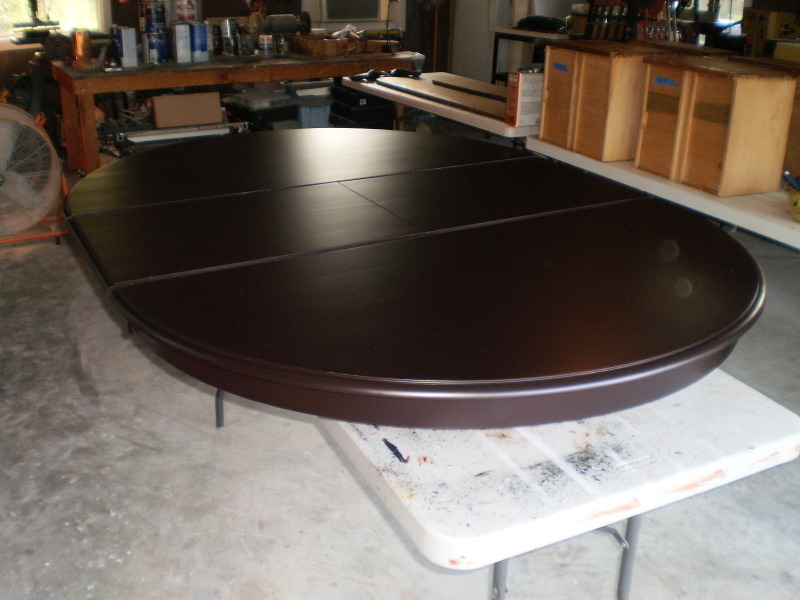 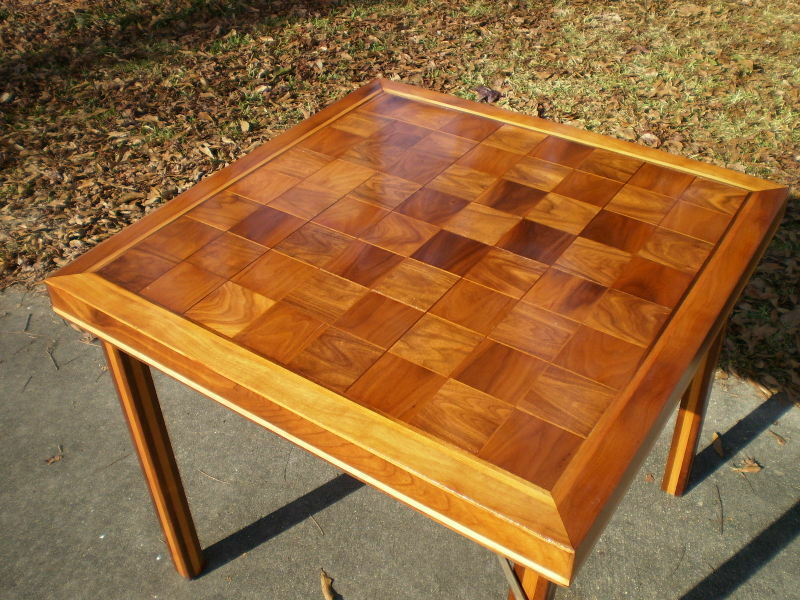 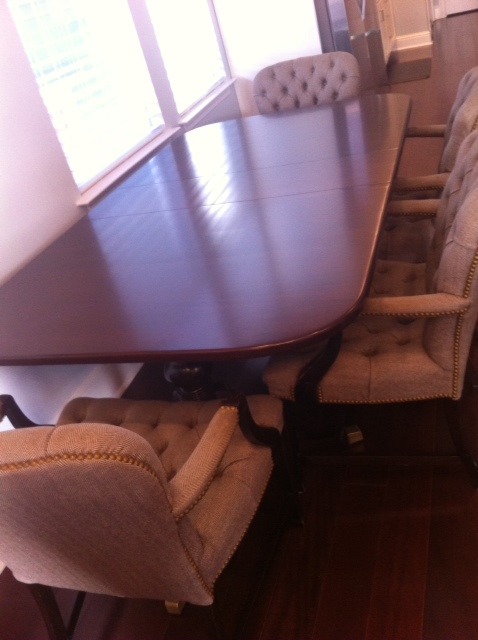 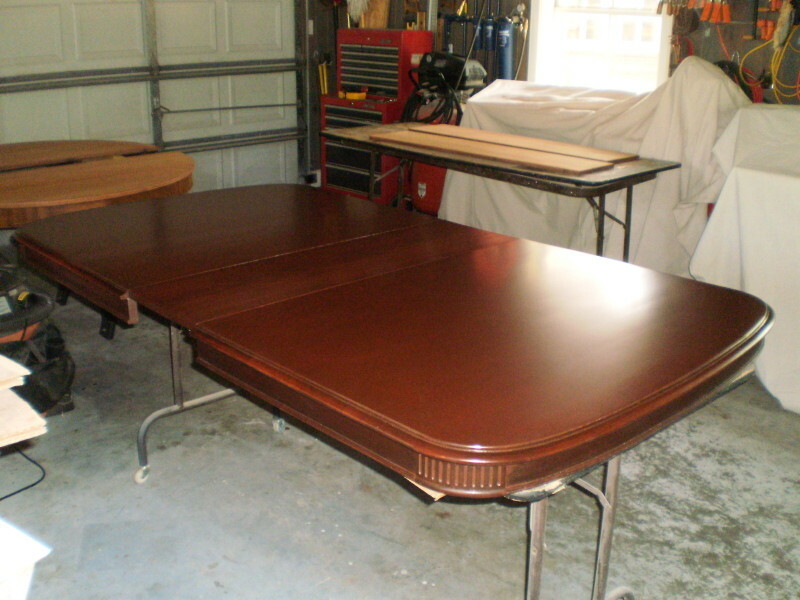 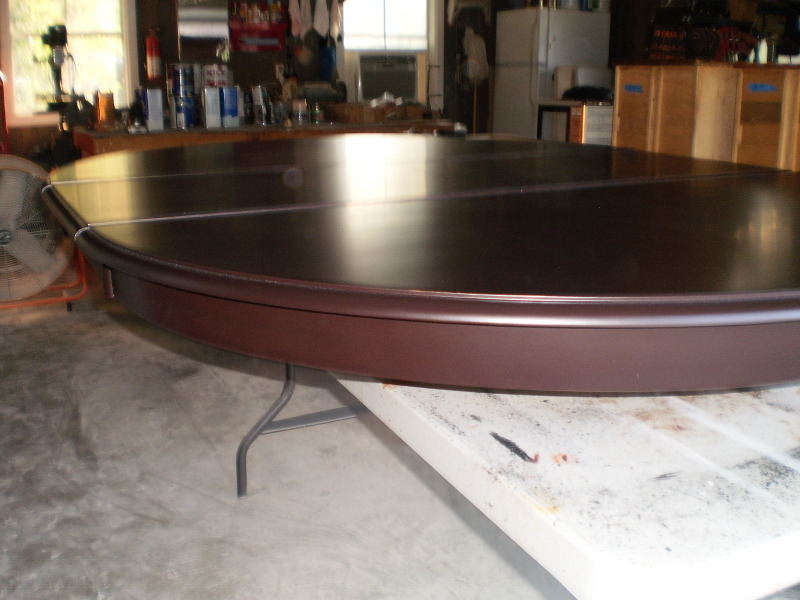 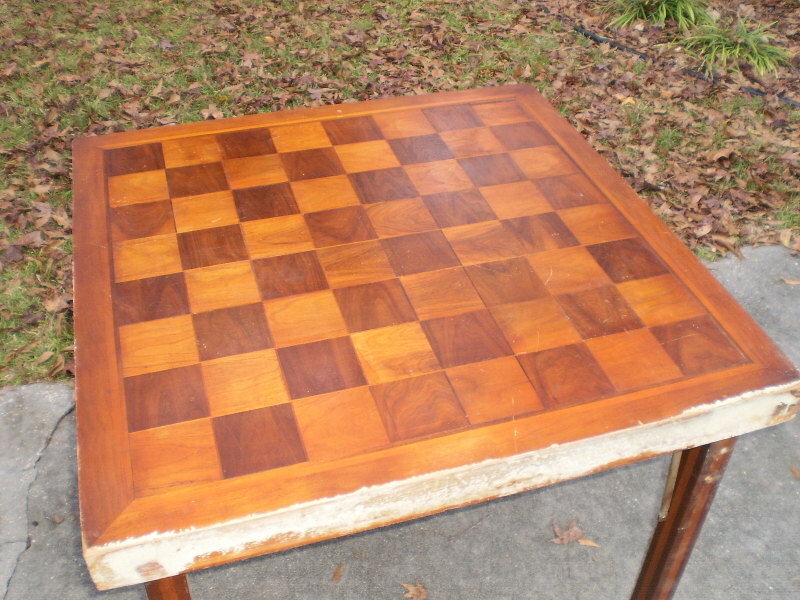 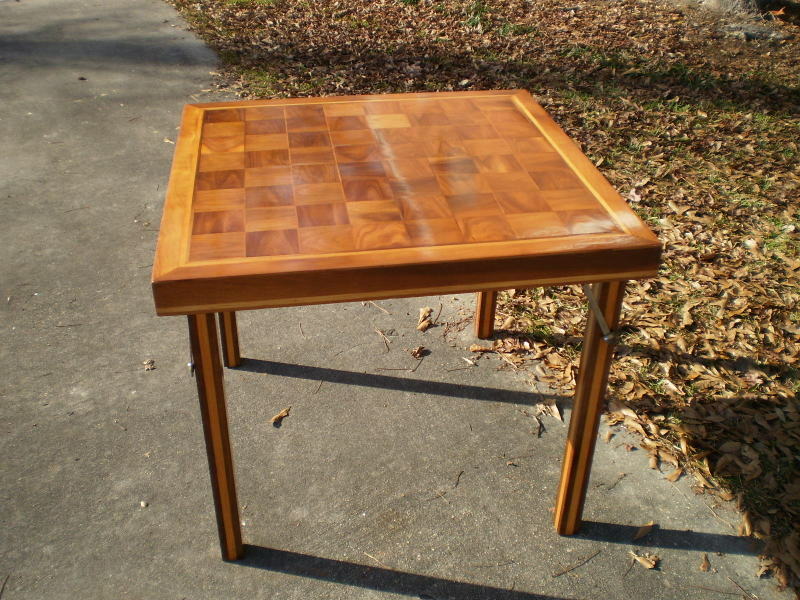 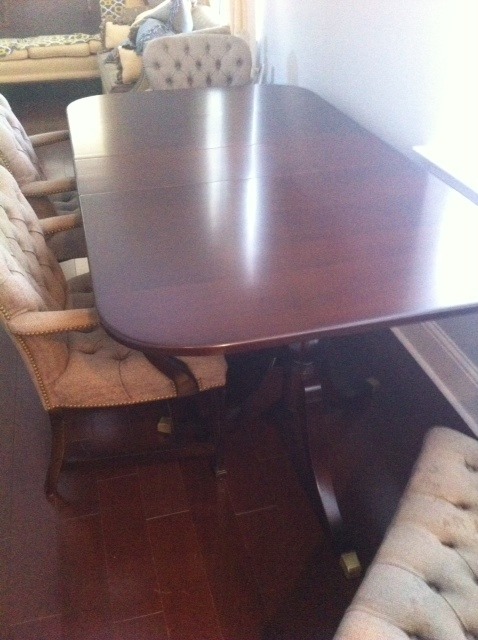 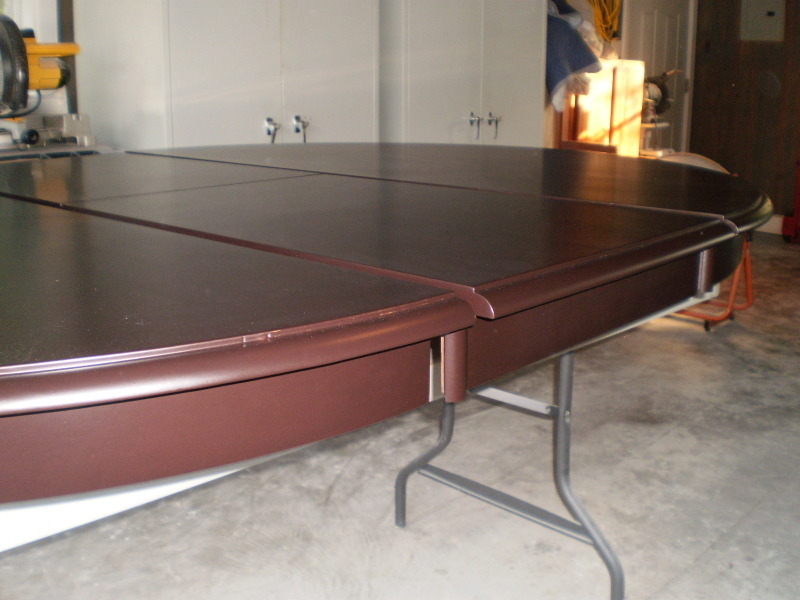 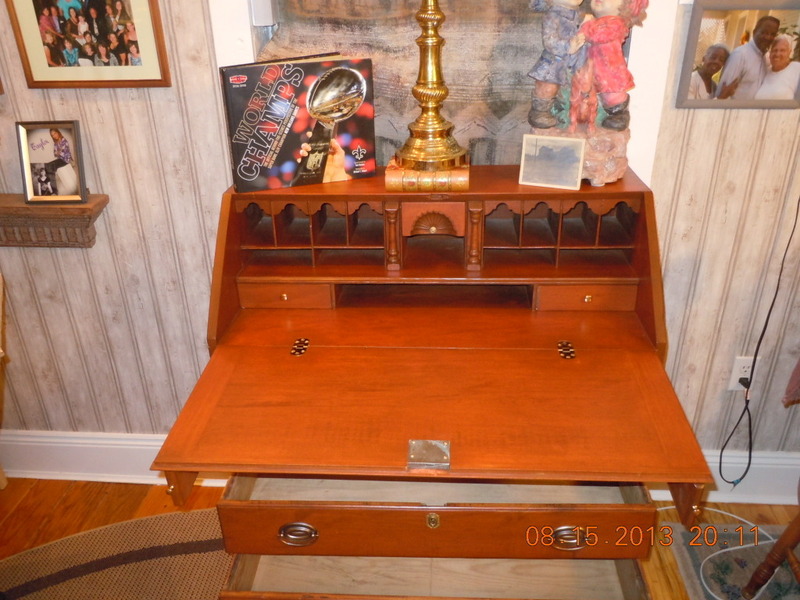 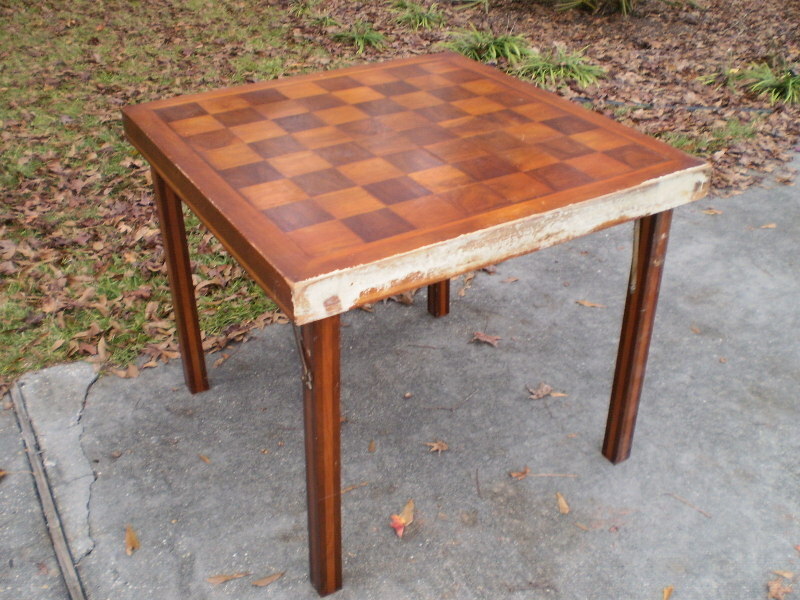 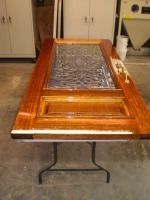 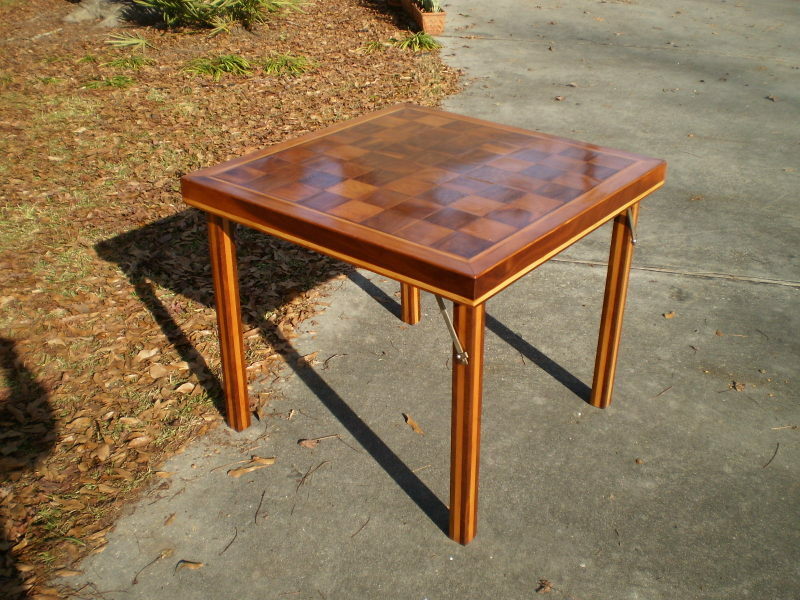 The customer's great-great uncle crafted this gaming table -- a precious family heirloom. 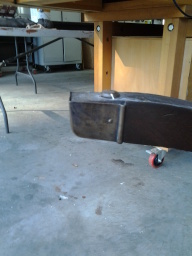 One of the legs was missing some hardware that had to be fabricated. 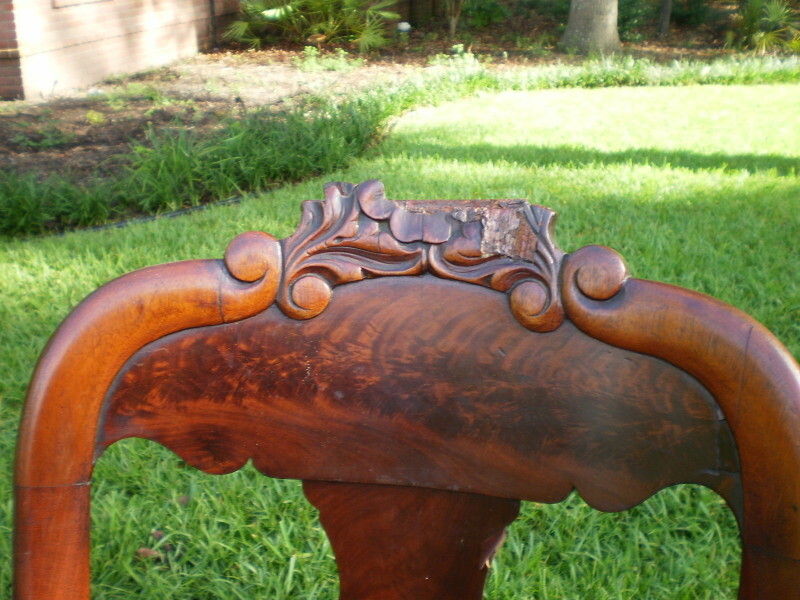 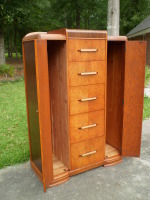 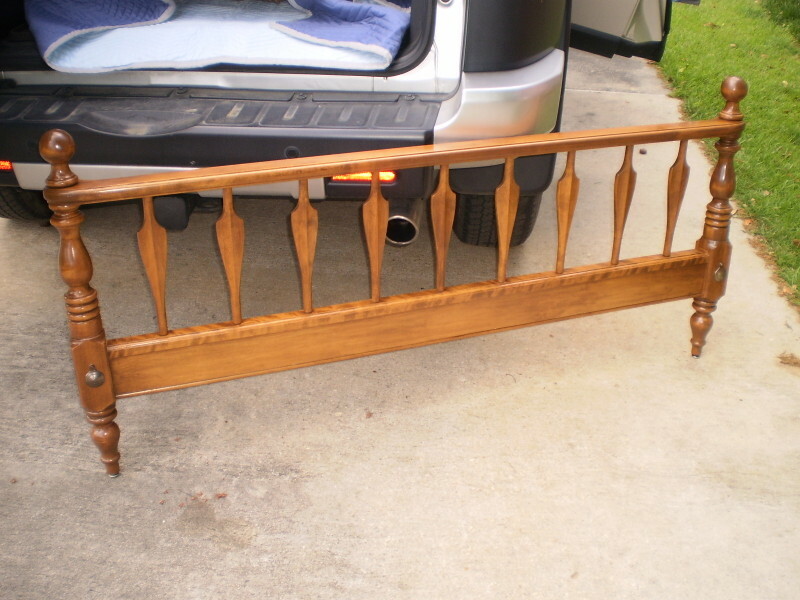 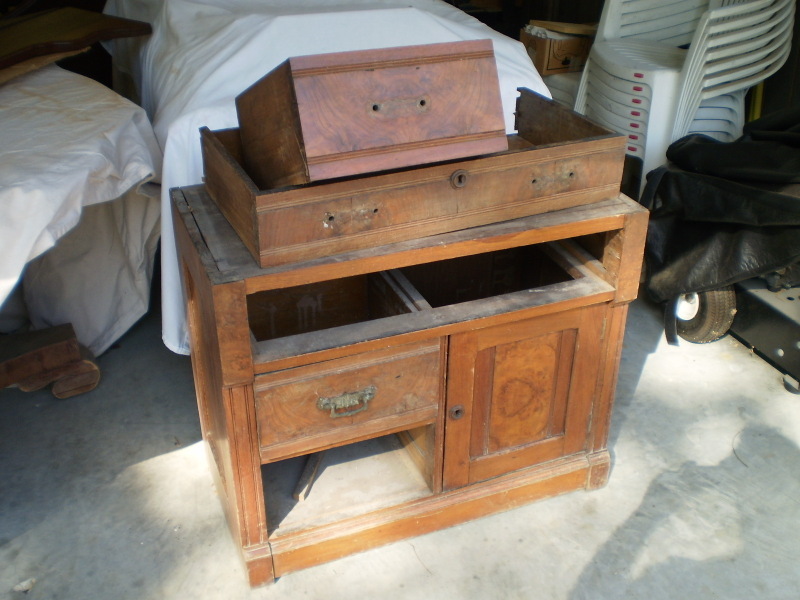 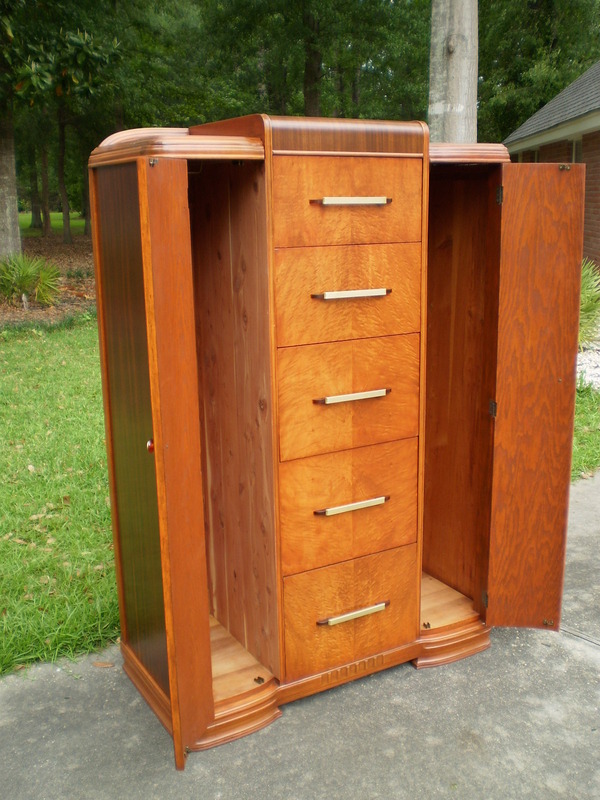 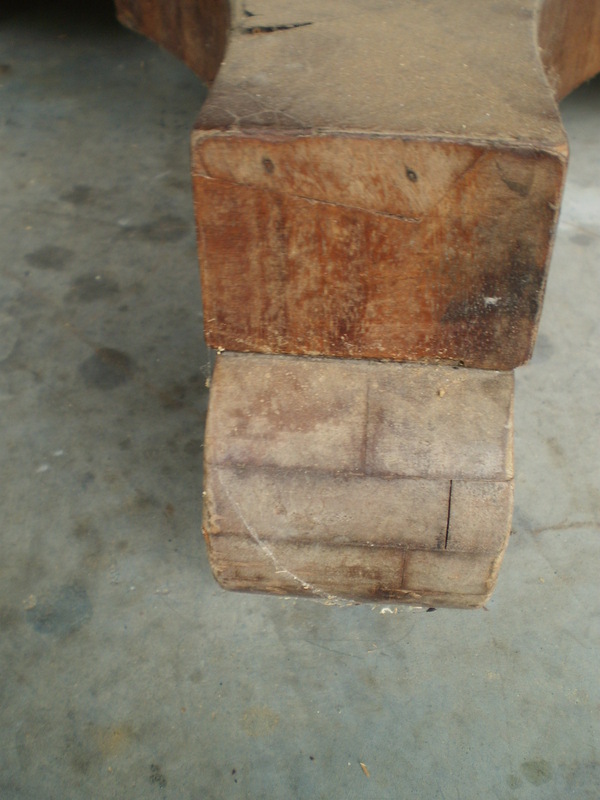 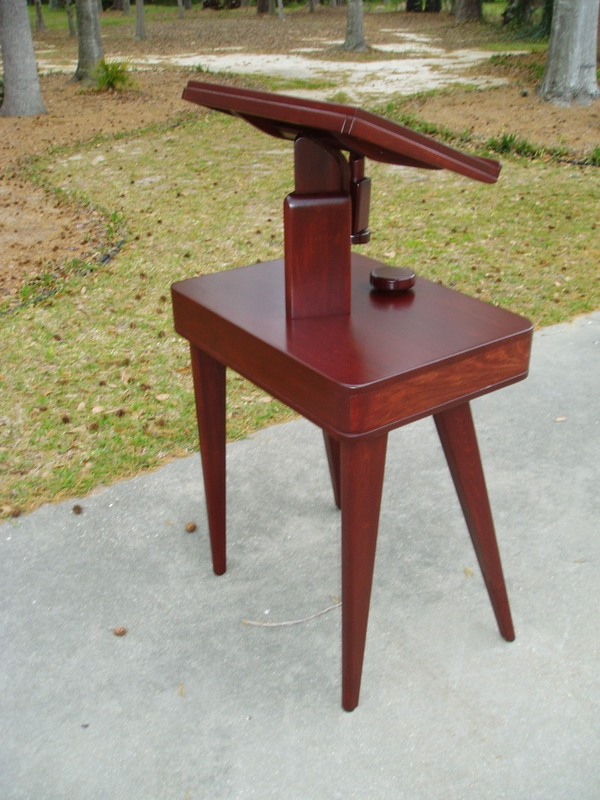 The top is a beautiful walnut and was water damaged from Hurricane Katrina. 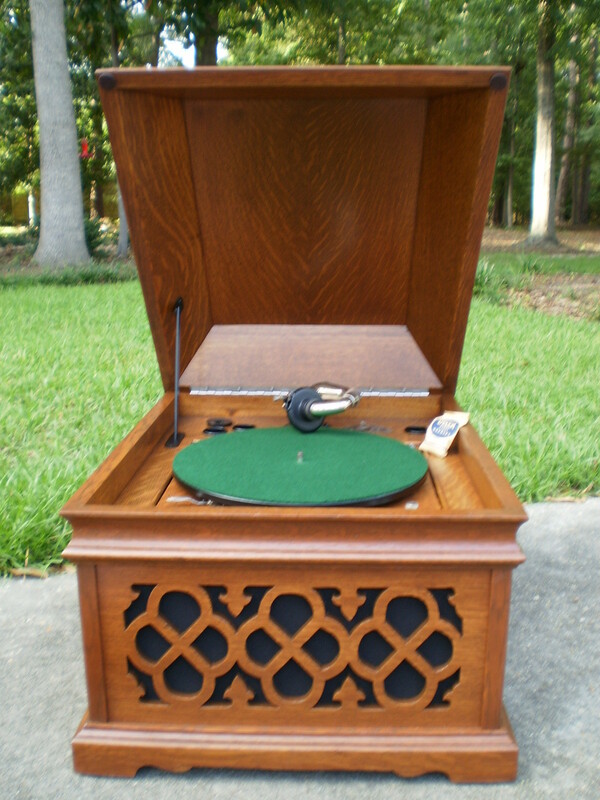 Restored back to its prime now for the family to enjoy. 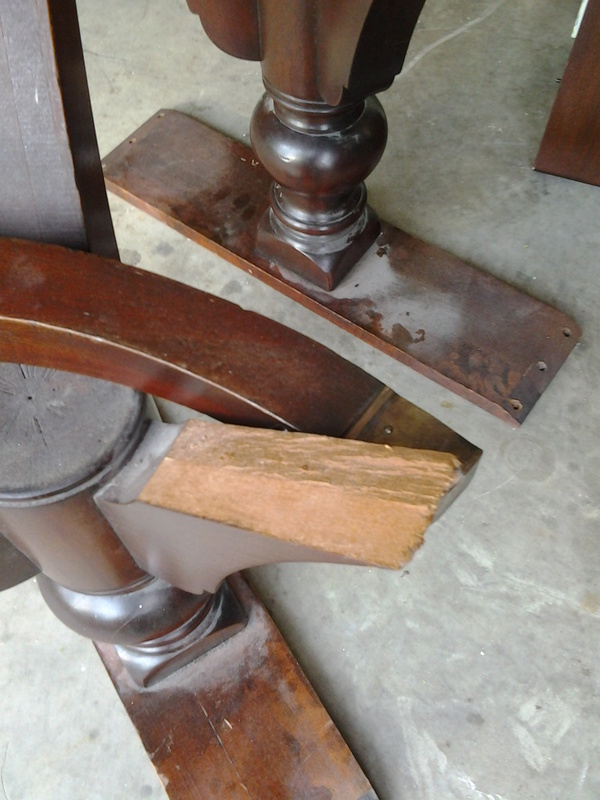 The customer was just about ready to throw these wooden chairs away. 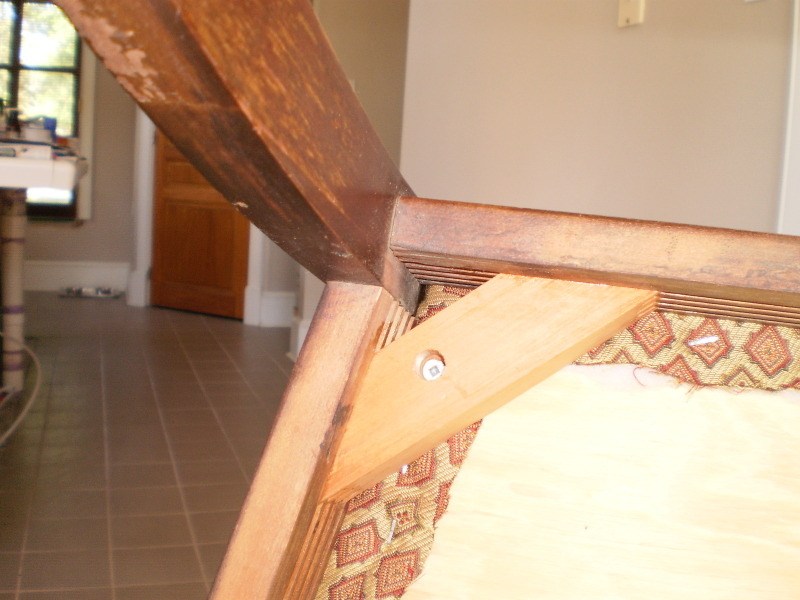 I was able to repair some of the doweled joints and fabricate some missing applique work. 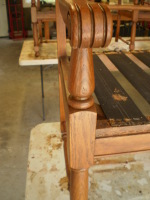 After careful refinishing with staining and some conversion varnish, they are ready to be upholstered and become an heirloom one day. 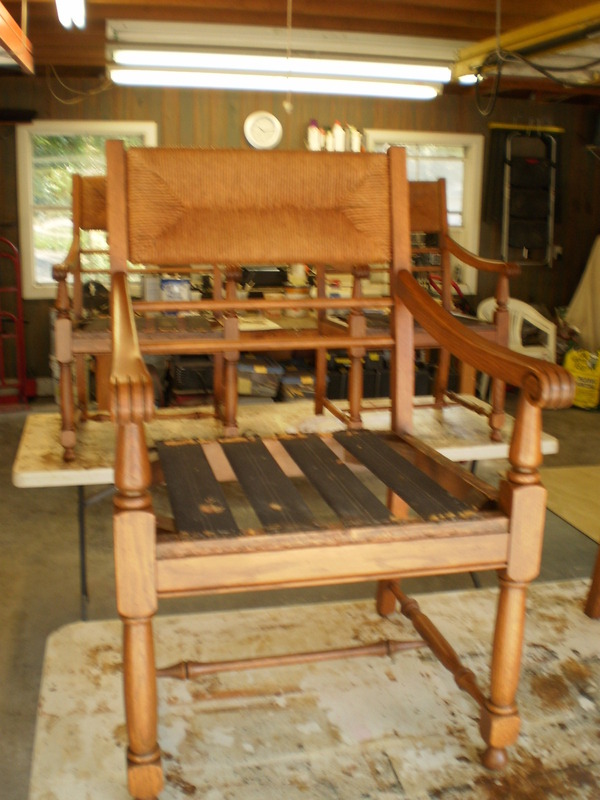 These 4 dining room chairs needed the glue blocks re-glued and I needed to create a missing block. 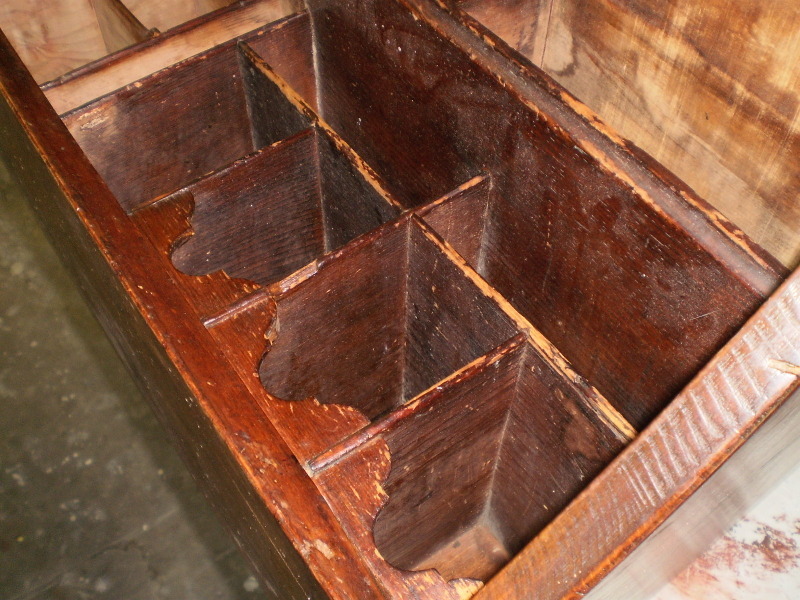 I also cleaned off any grime with some oil soap. 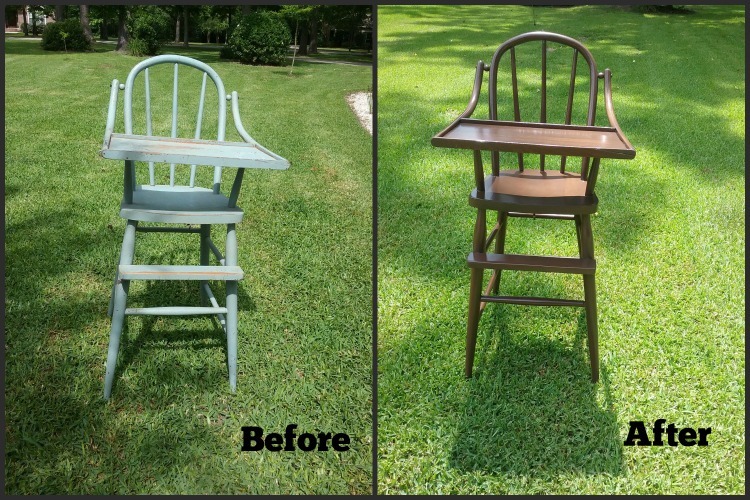 Restored and refinished just in time for a family gathering. This antique chair was in the customer's garage for a long time. 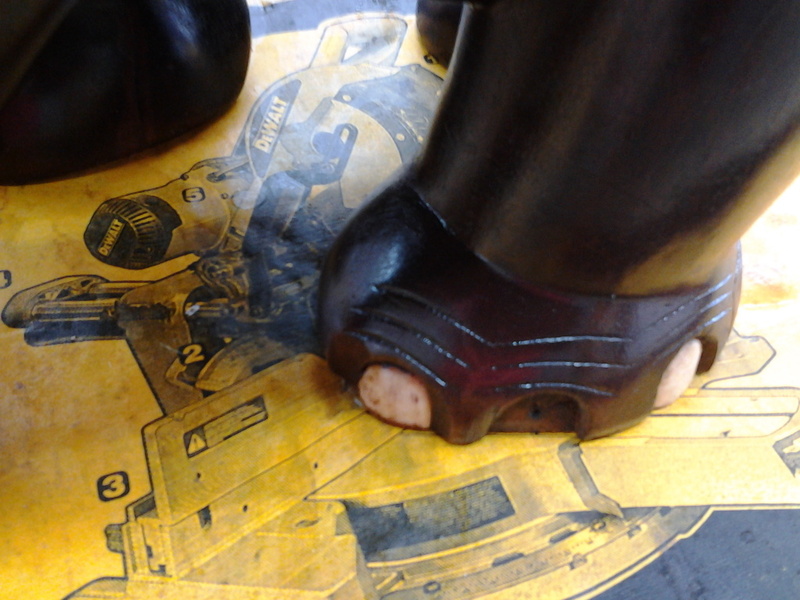 It needed some applique repairing. 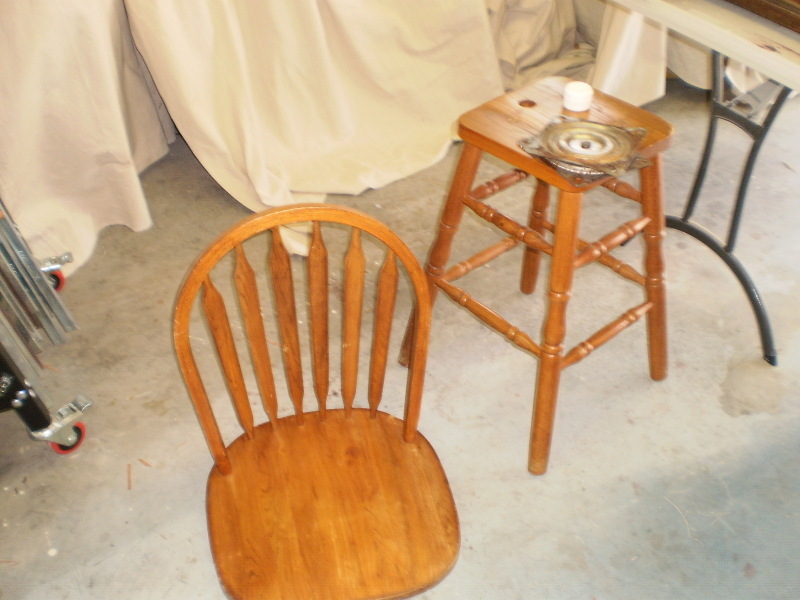 I stained and finished with conversion varnish. 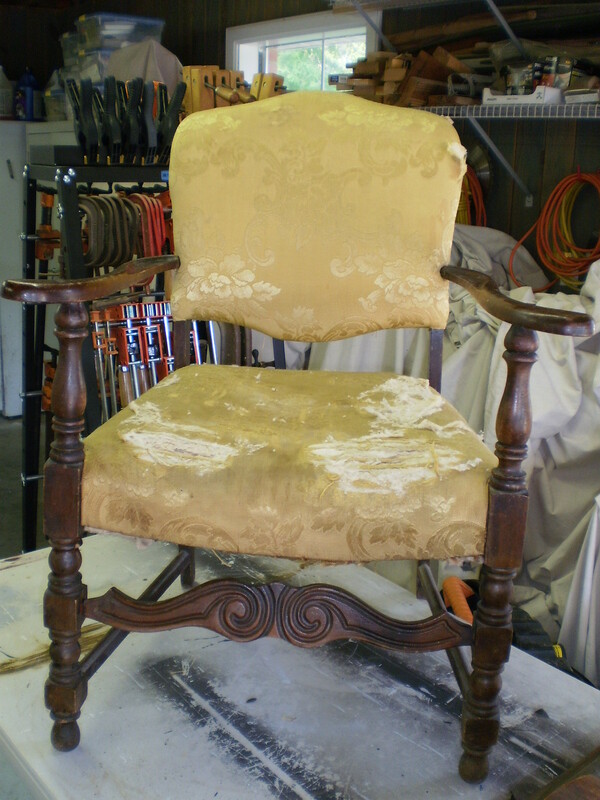 It's now ready to be upholstered and accepted into the customer's other fine furniture belongings. This quality office furniture had been repaired several times, none of which appeared to have worked or were professionally done. 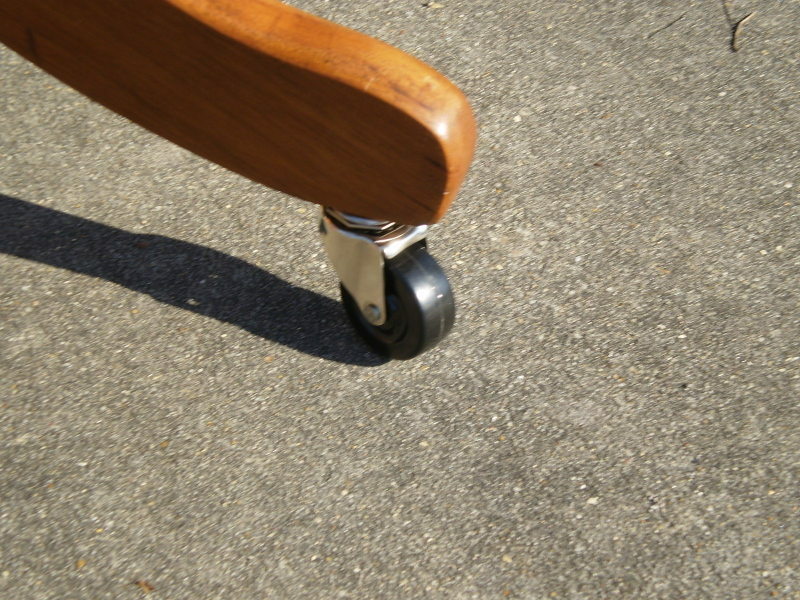 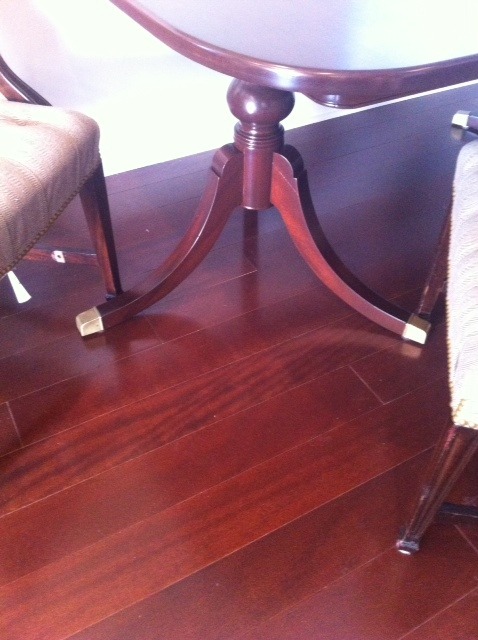 I added new casters and used brass threaded inserts for a permanent fix. 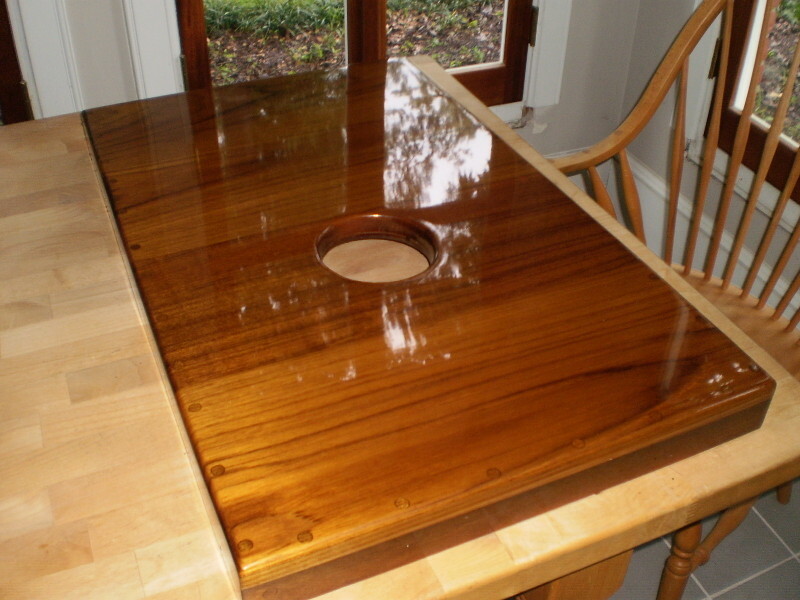 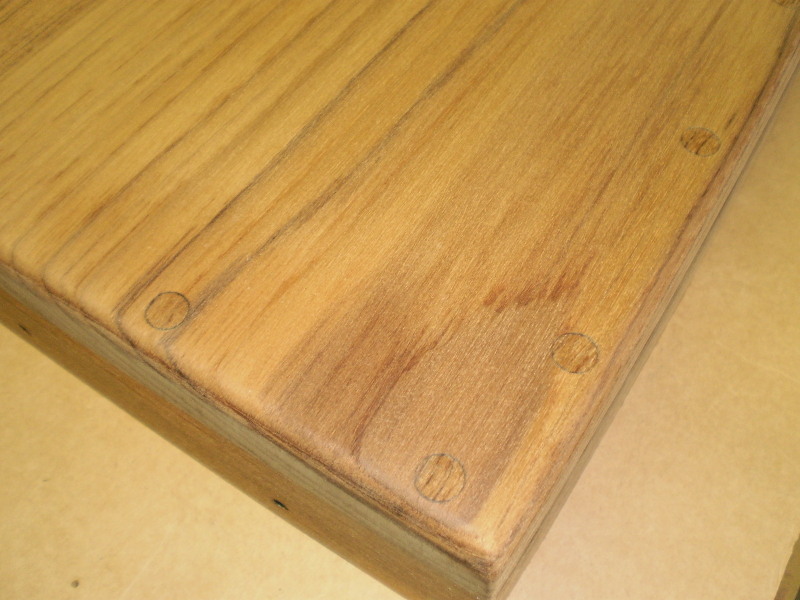 I also refinished using pure tung oil. 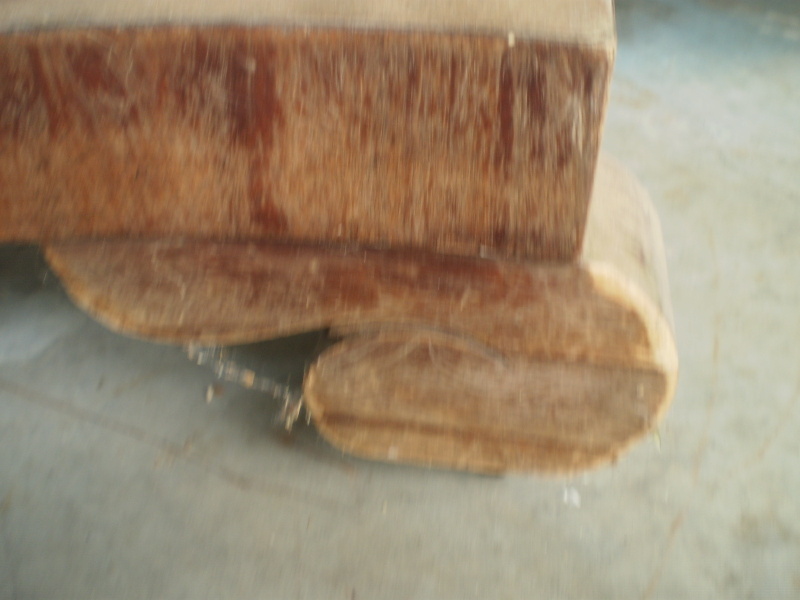 This rocker had been damaged by tipping over. The fall broke some of the spindles and several other spindles were loose. 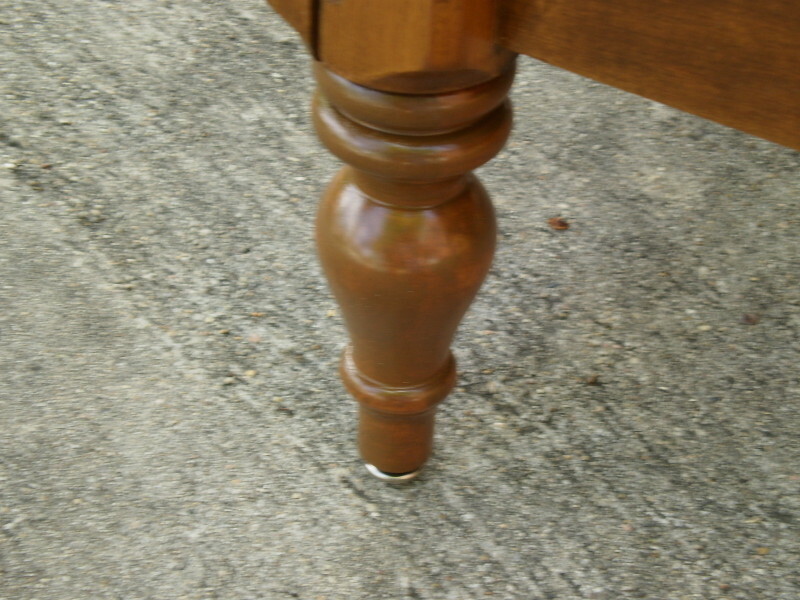 I fixed the loose joints, stained, and finally refinished with conversion varnish. 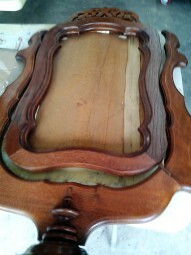 It's now ready for more loving care and use. 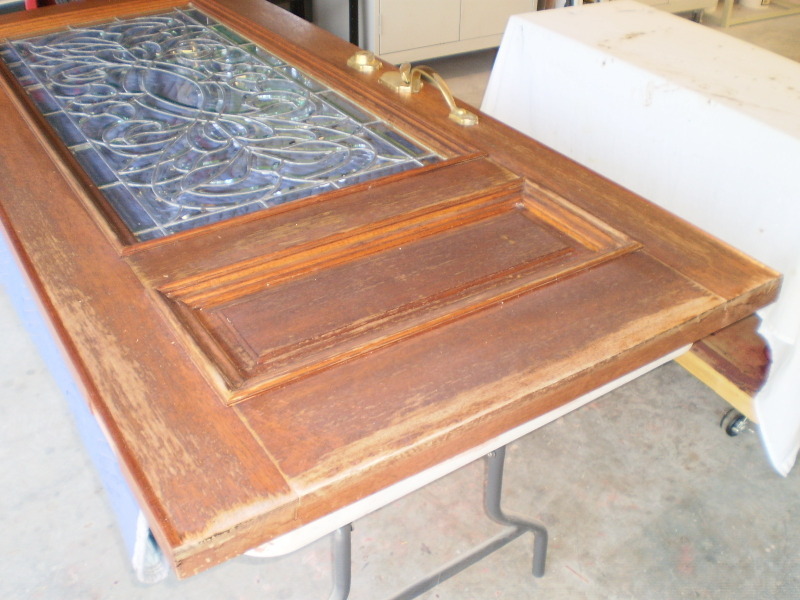 I also refurbish architectural pieces like these high quality front entry doors. 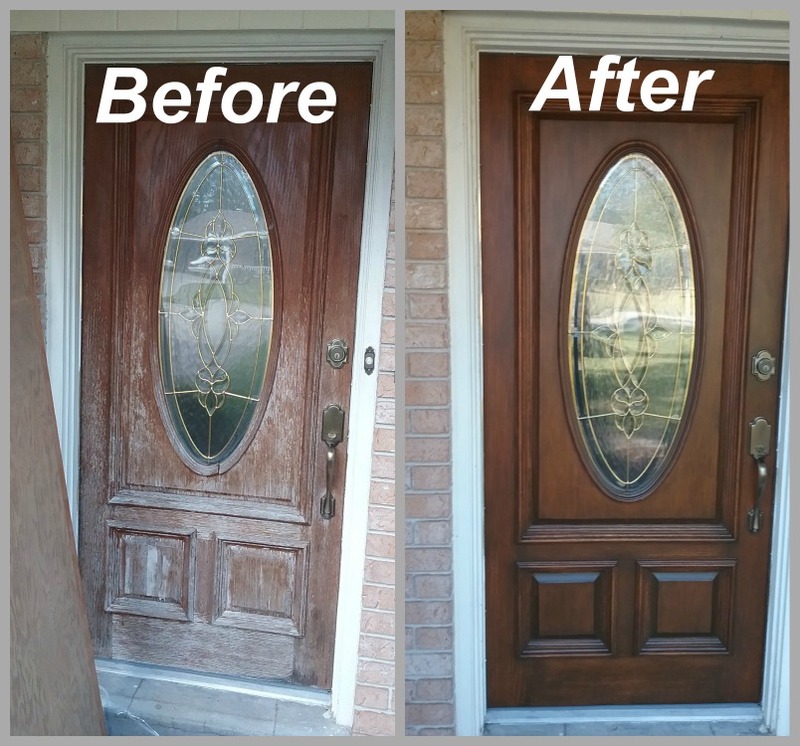 Both doors were weather damaged and some of the original finish was missing. 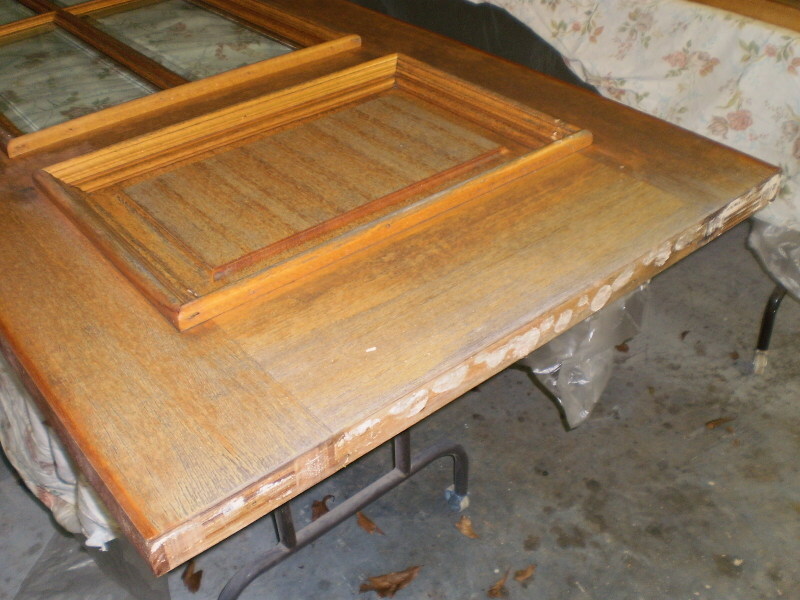 Notice how the bottom of the doors (as well as the tops) were not sealed under the weatherstripping. 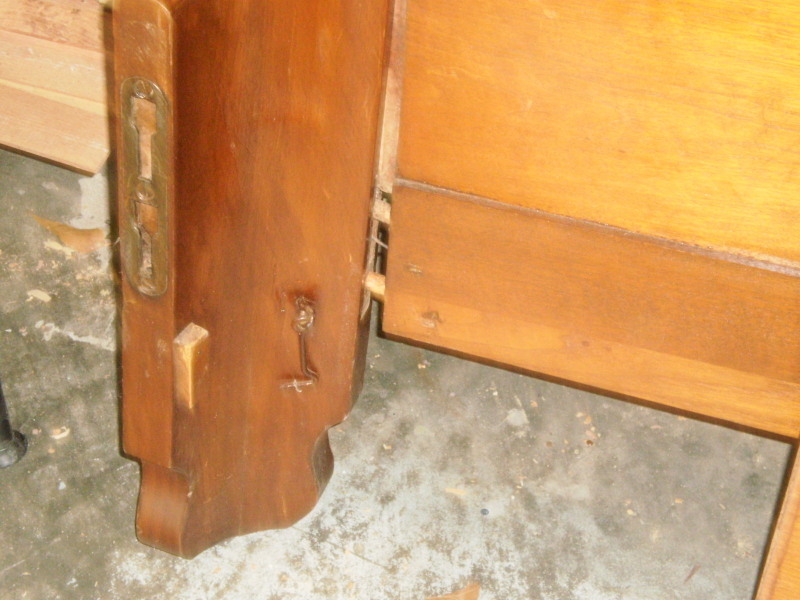 This part of the door can easily wick up moisture and this destroy the door. 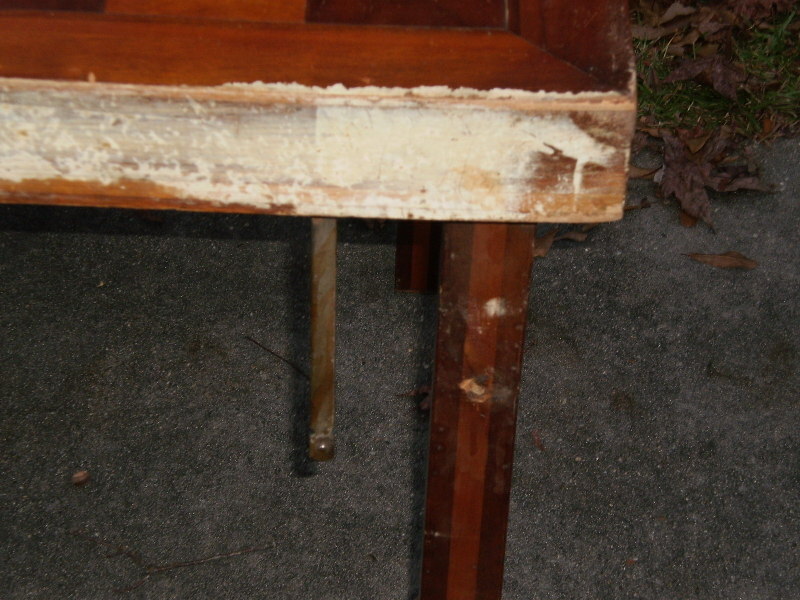 These legs of a bed frame had water damage in a flood and thus came apart. 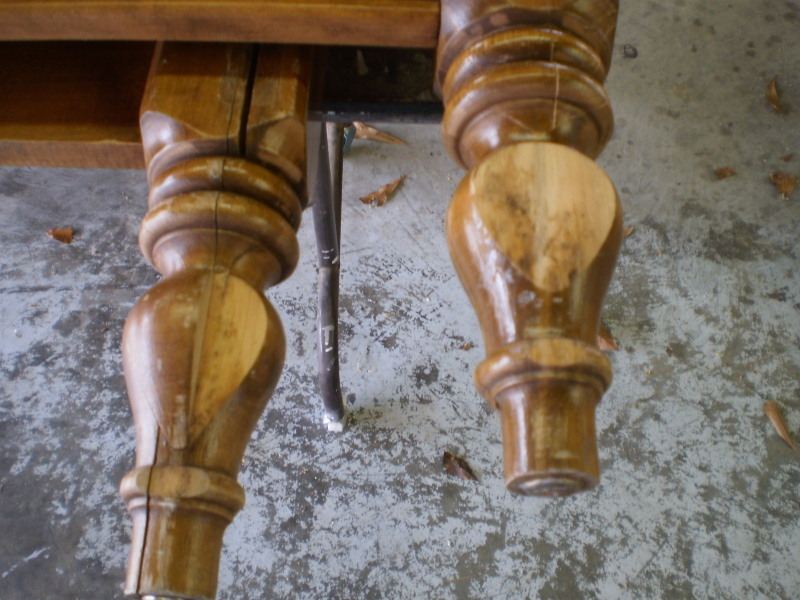 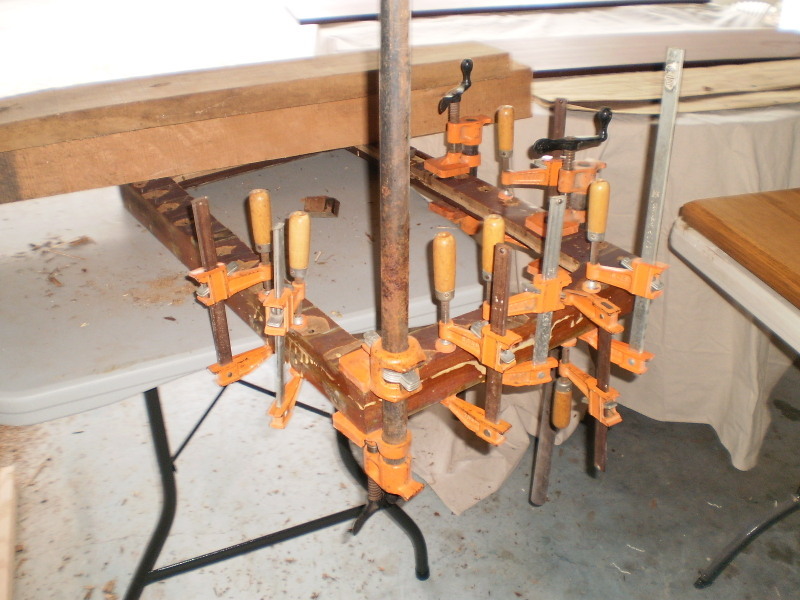 I sawed off each leg and scarfed in replacement wood and then turned on a lathe. 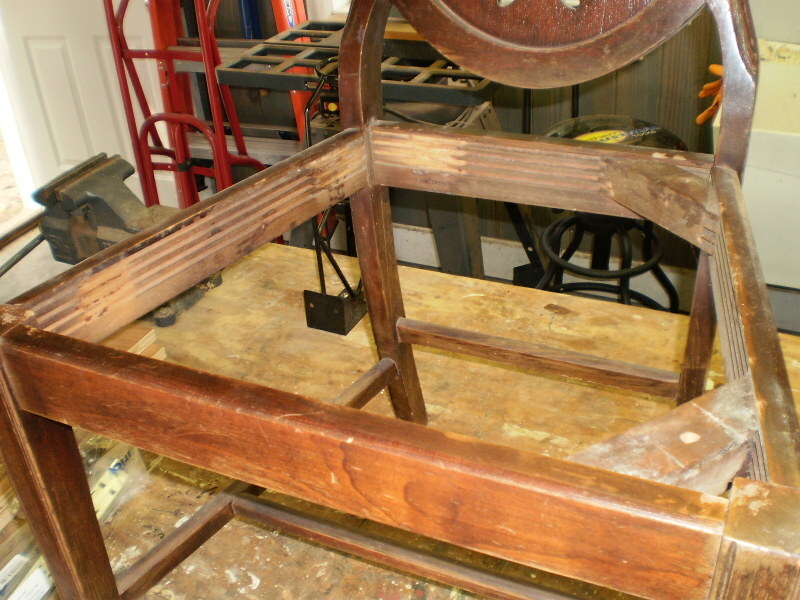 I then installed dowel screws to complete the repair. 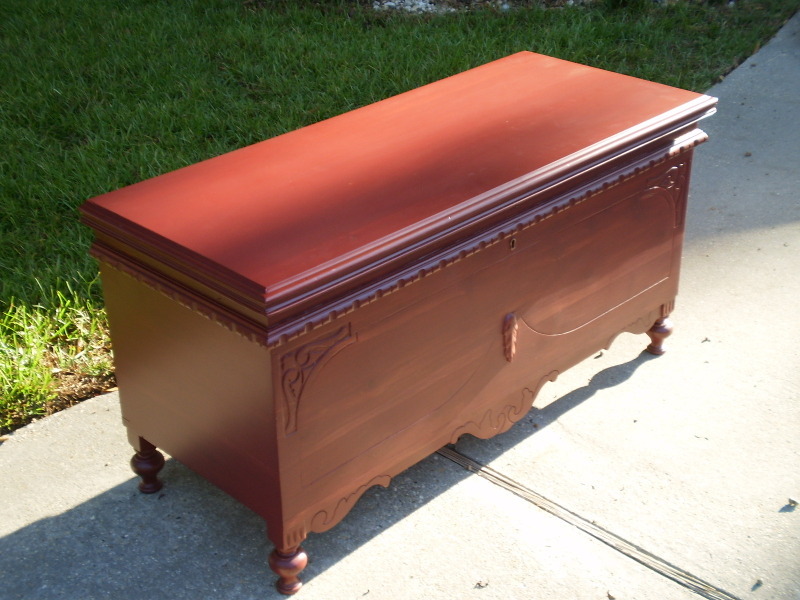 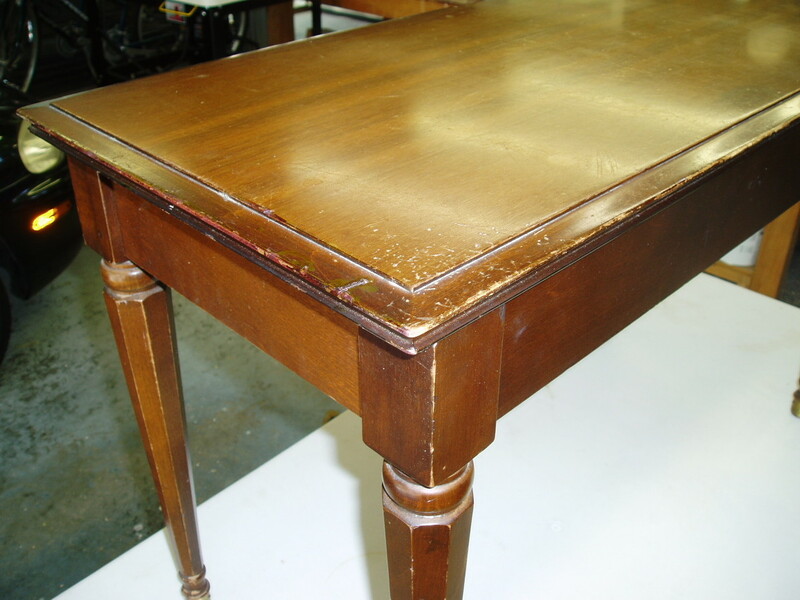 The final part of the restoration was refinishing with Minwax polyurethane as per the client's request. 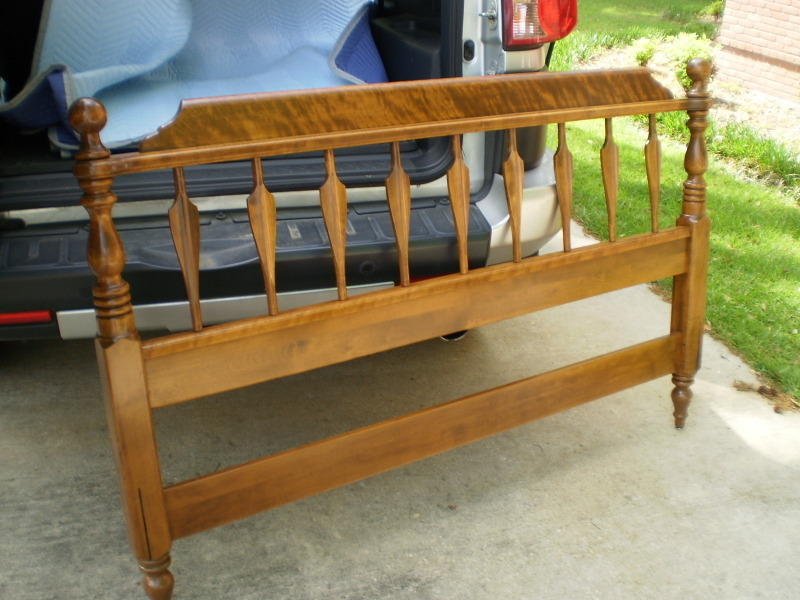 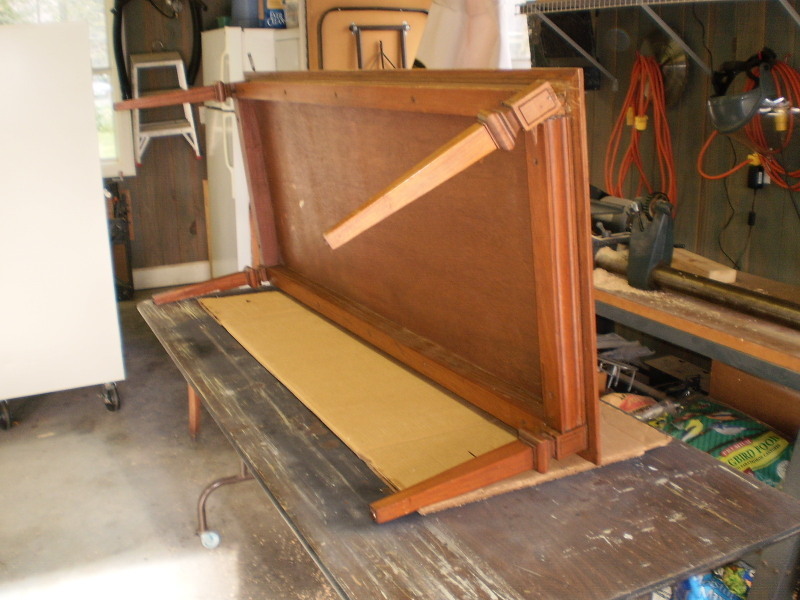 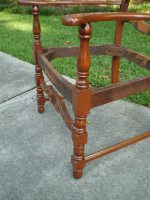 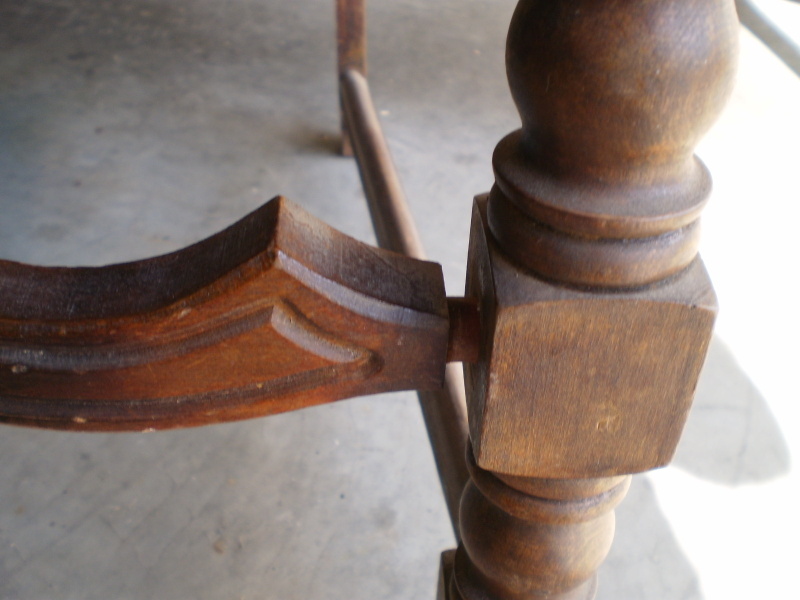 This antique bed frame needed a delicate repair since it required some new molding to be replicated as well as new dowels. I completely broke down all the pieces and then stripped and sanded each piece. 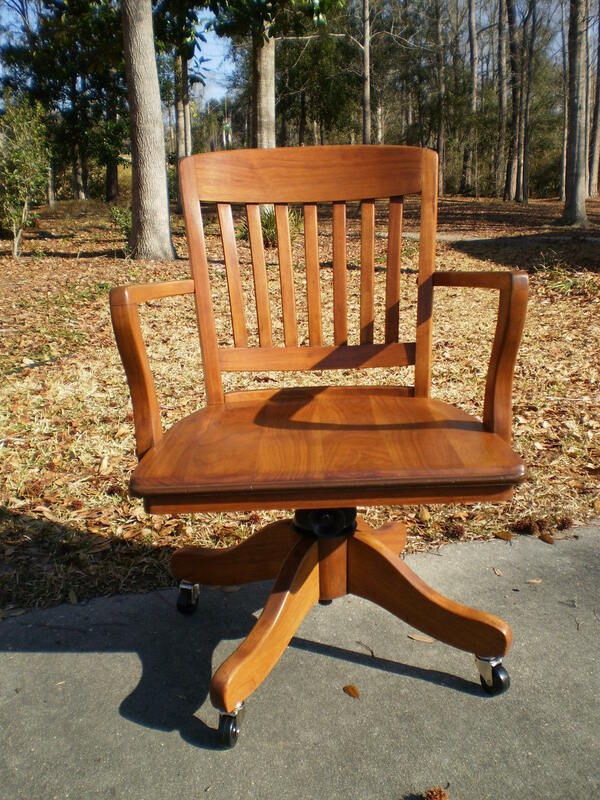 The entire suit is made of walnut. 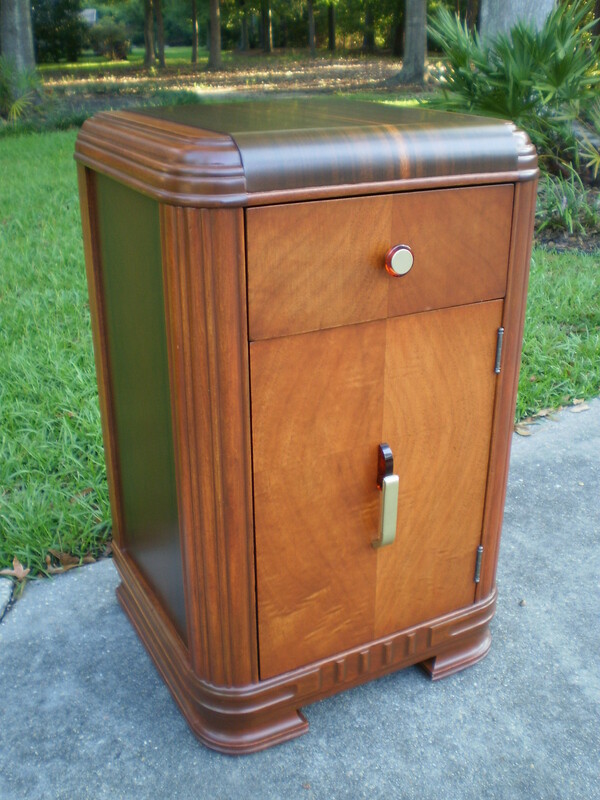 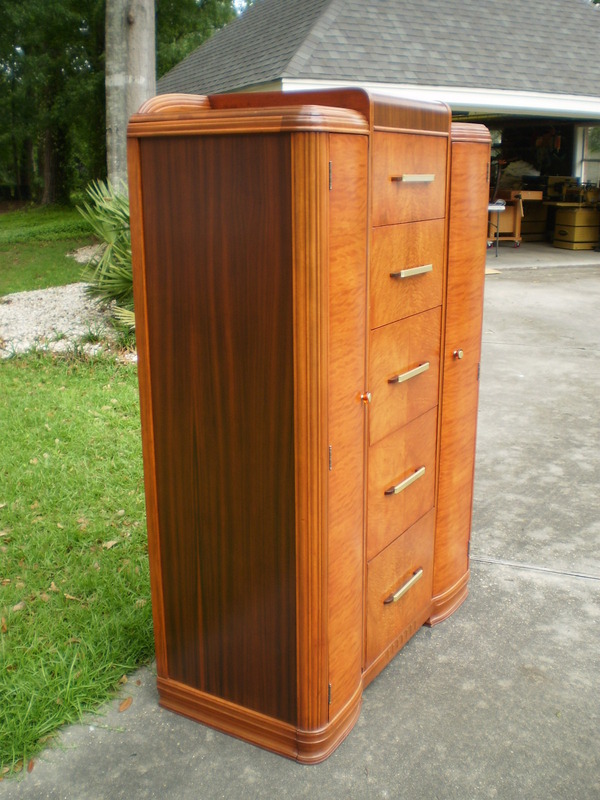 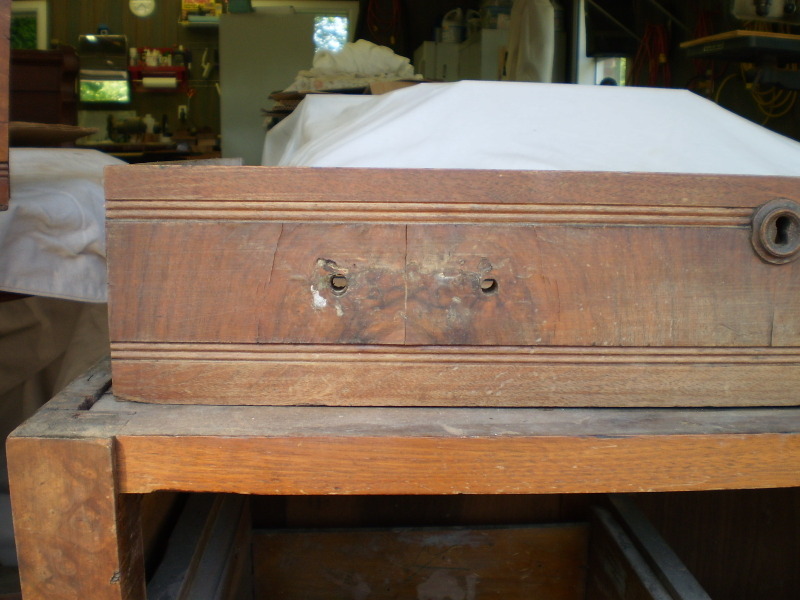 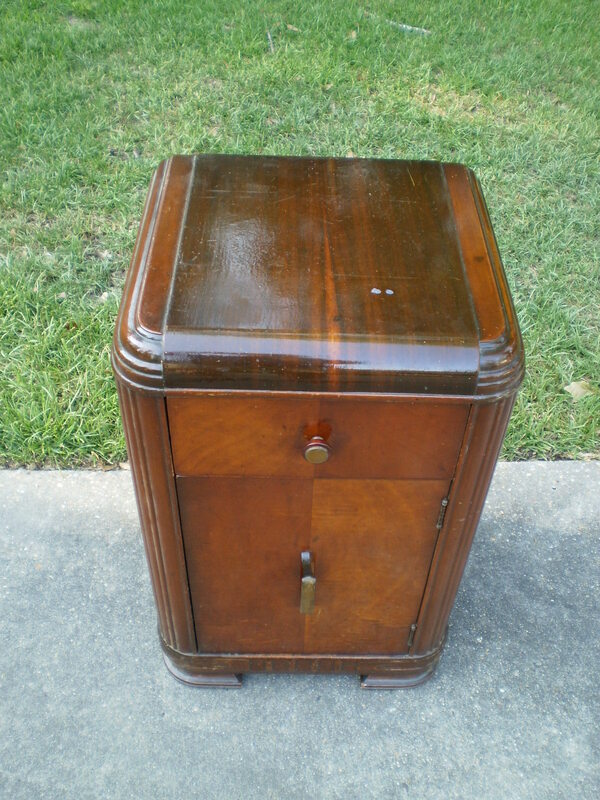 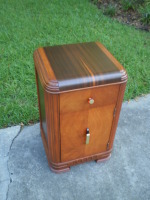 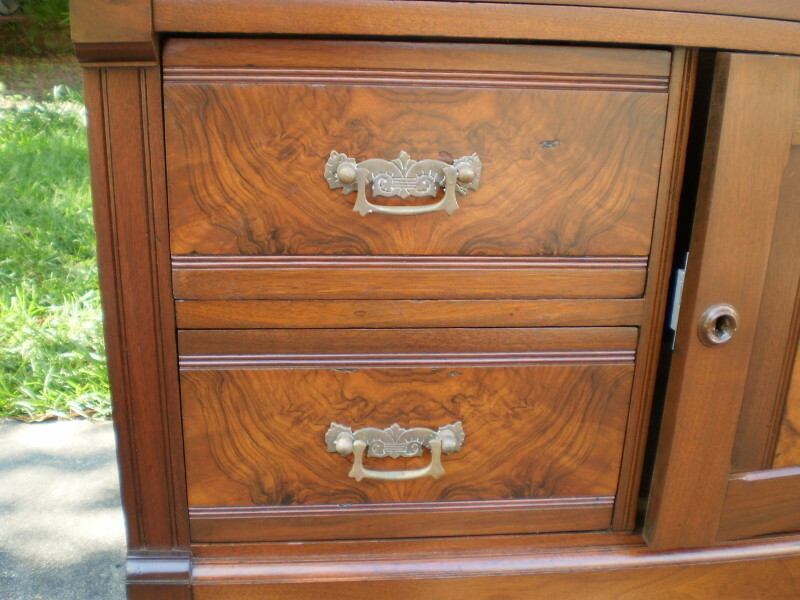 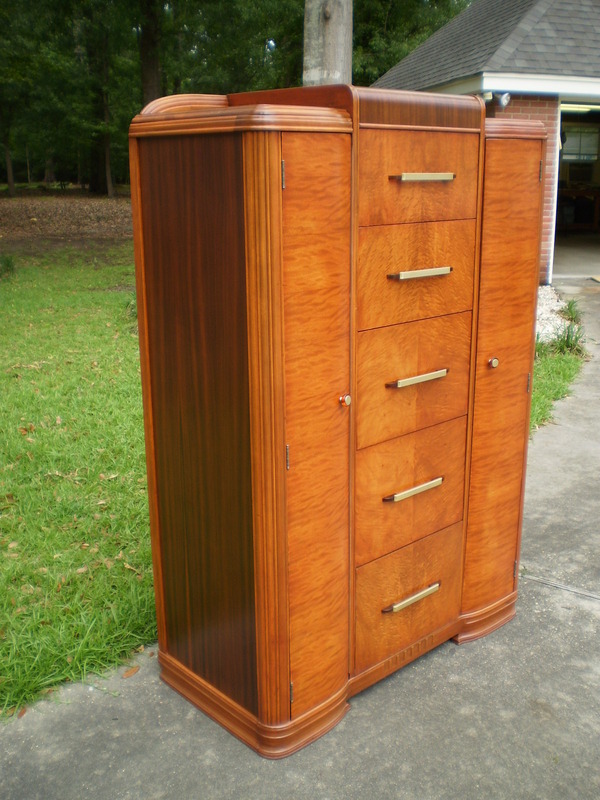 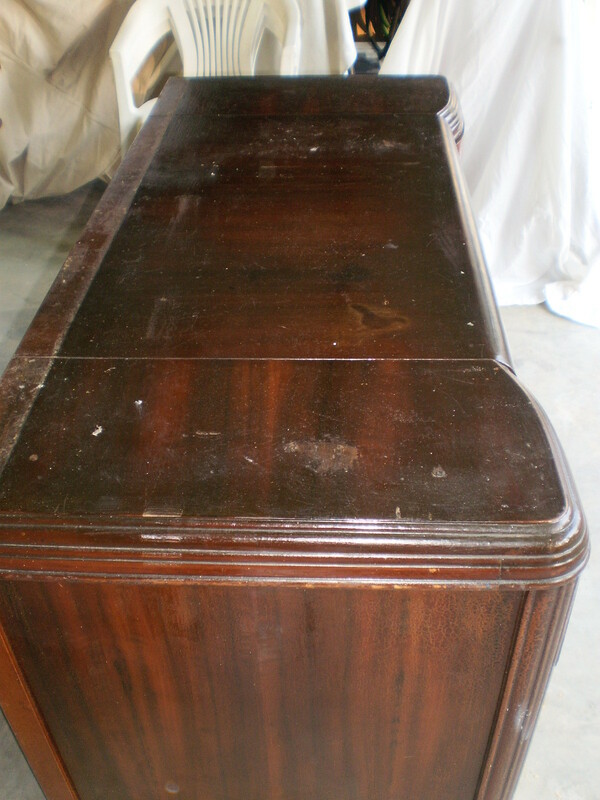 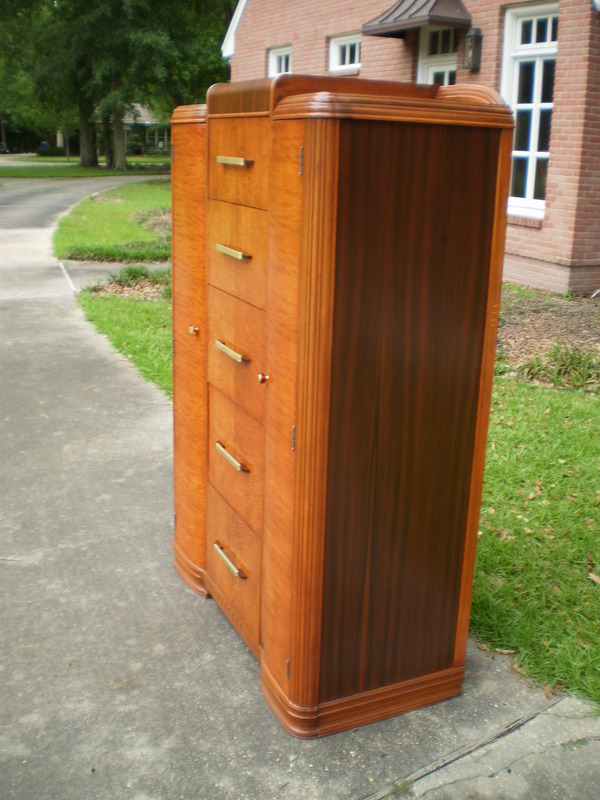 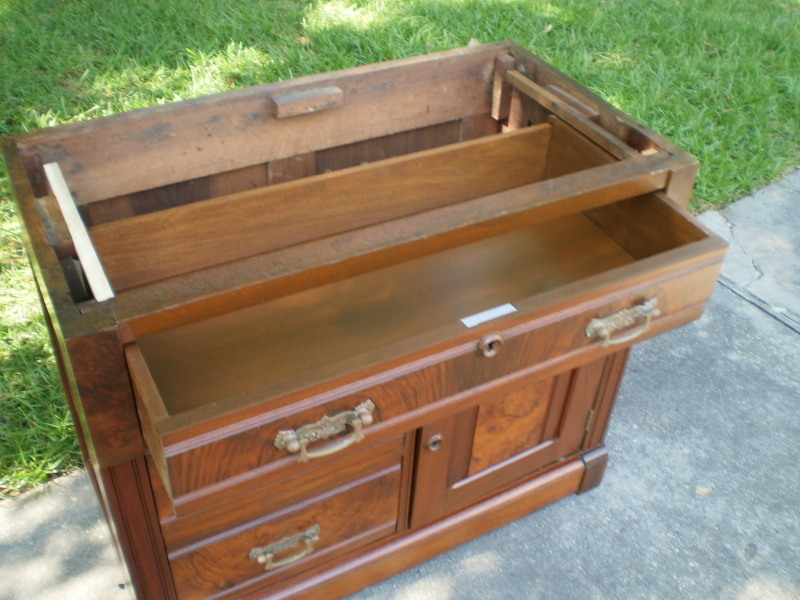 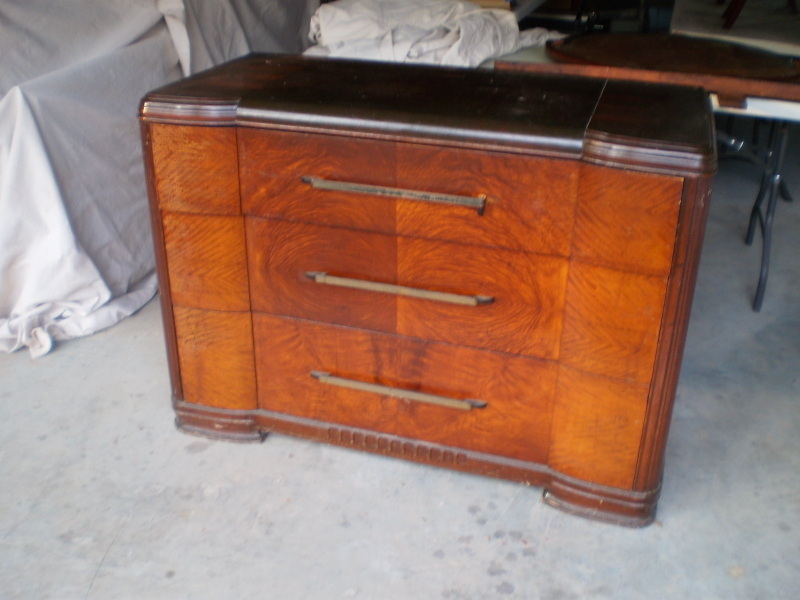 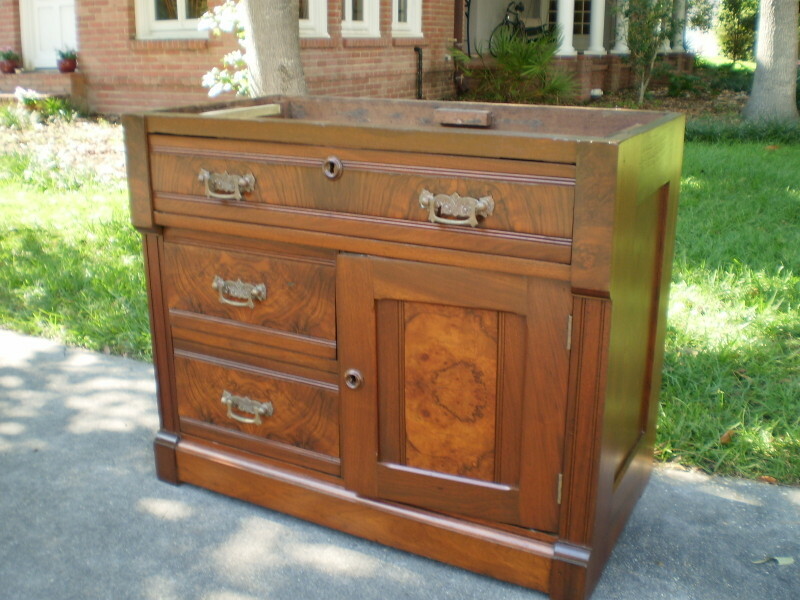 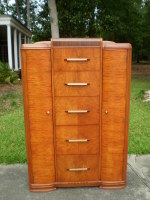 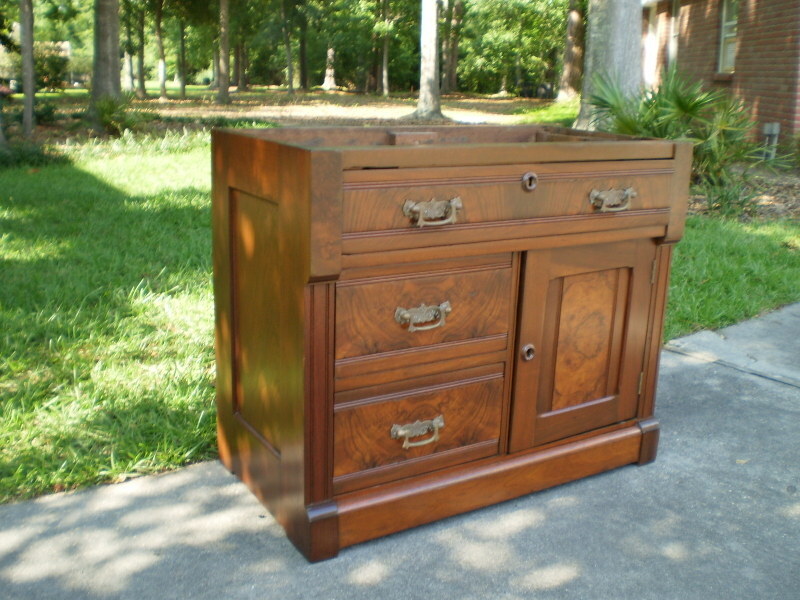 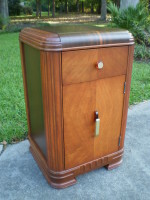 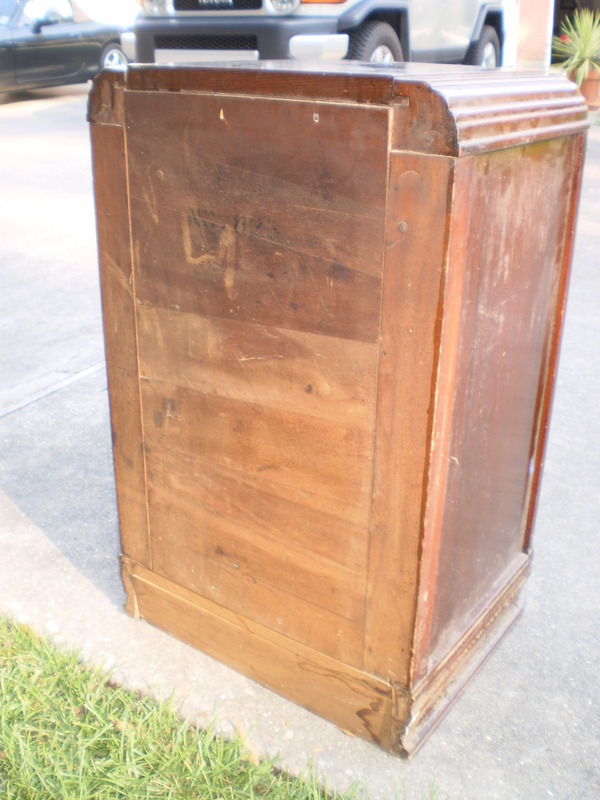 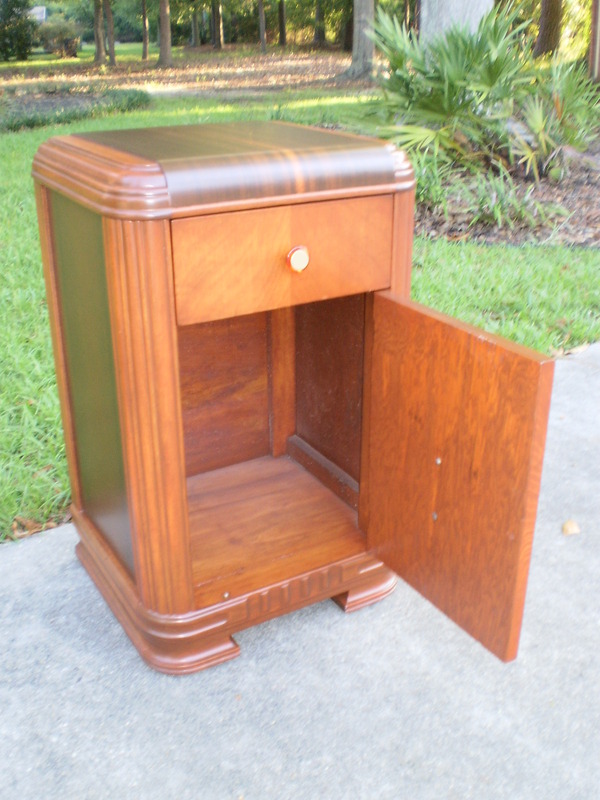 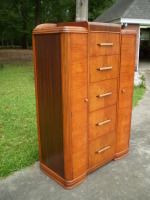 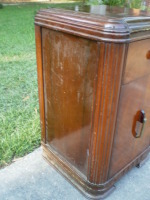 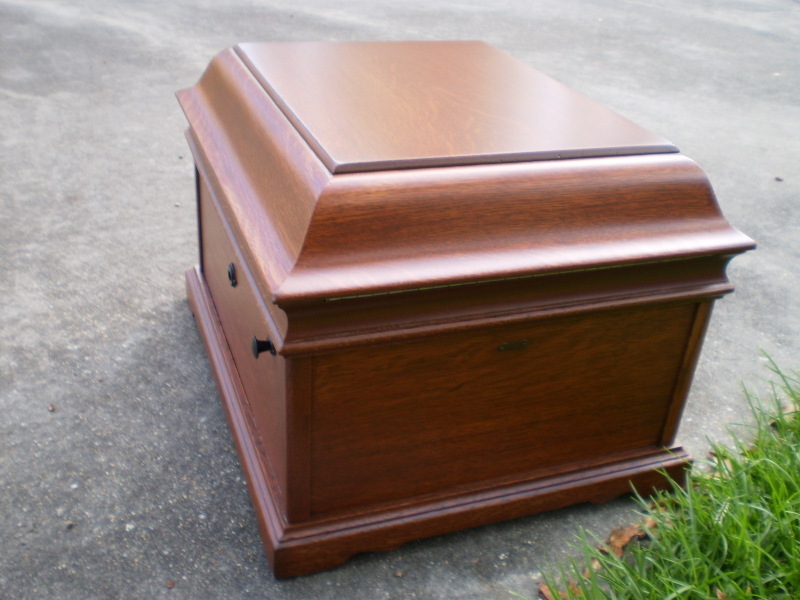 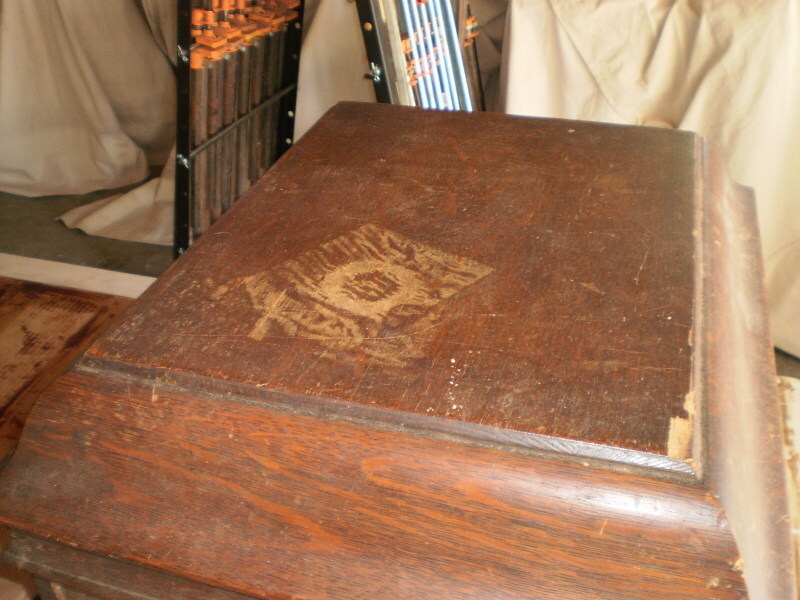 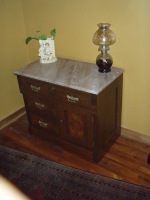 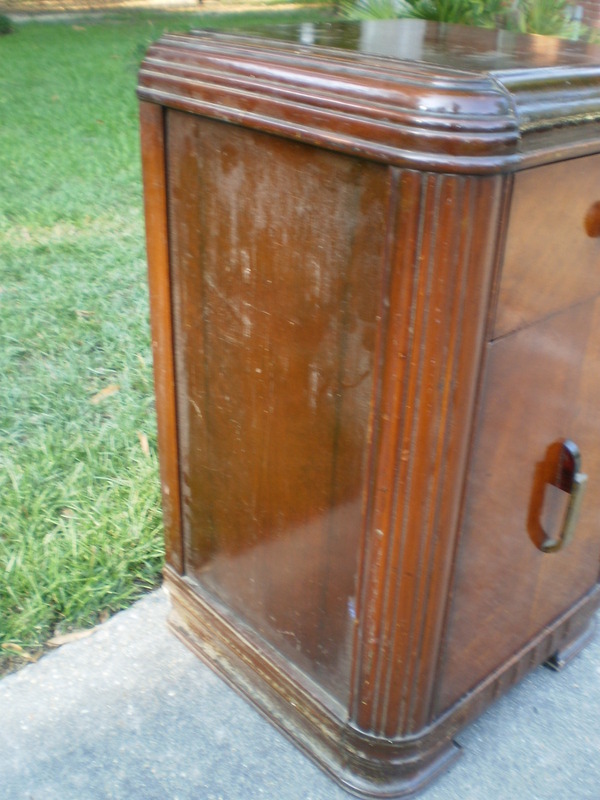 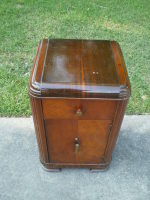 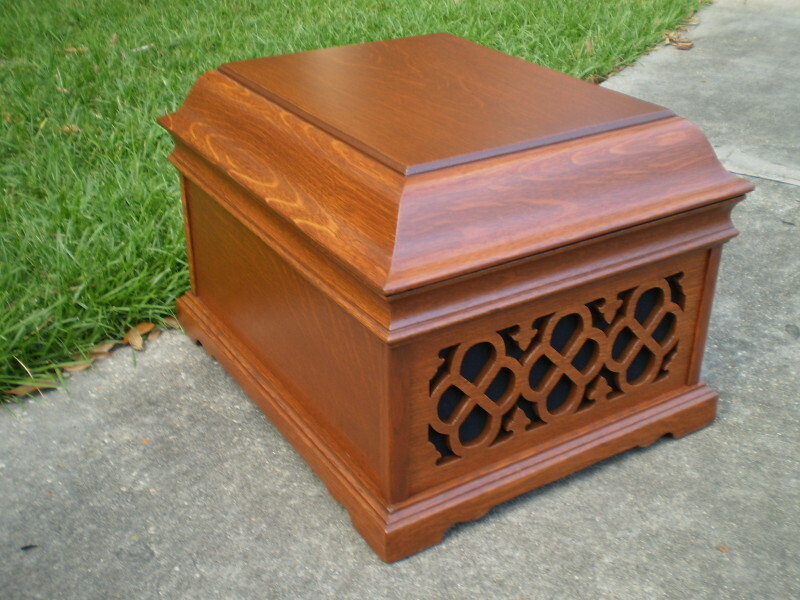 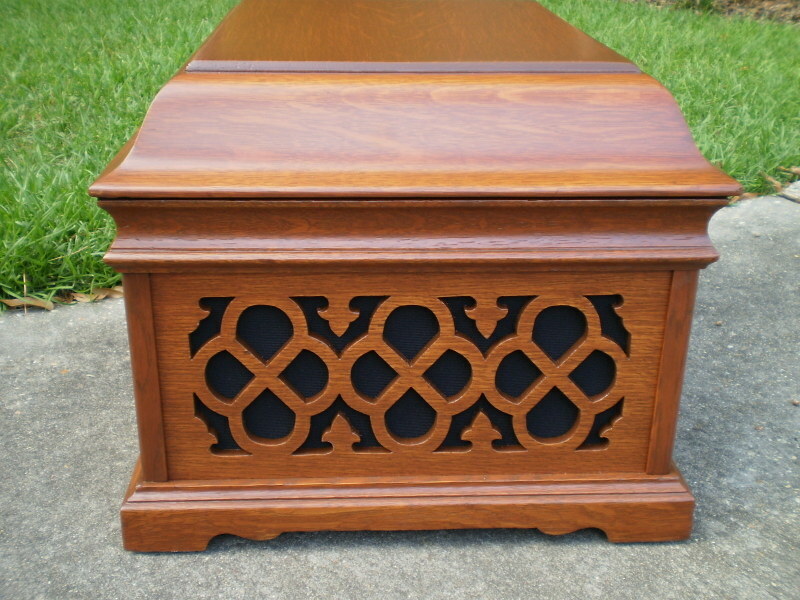 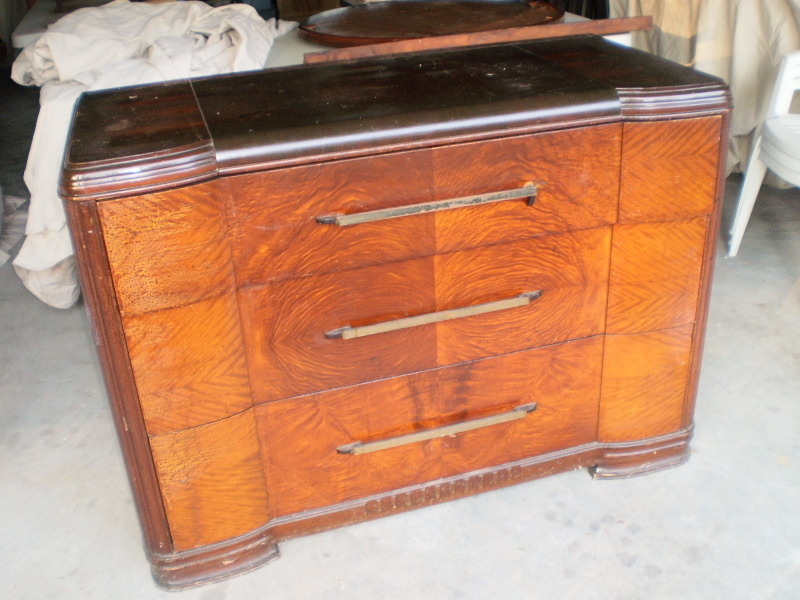 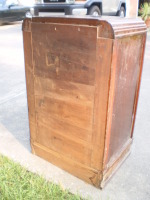 This antique solid walnut chest suffered flood damage during Katrina. 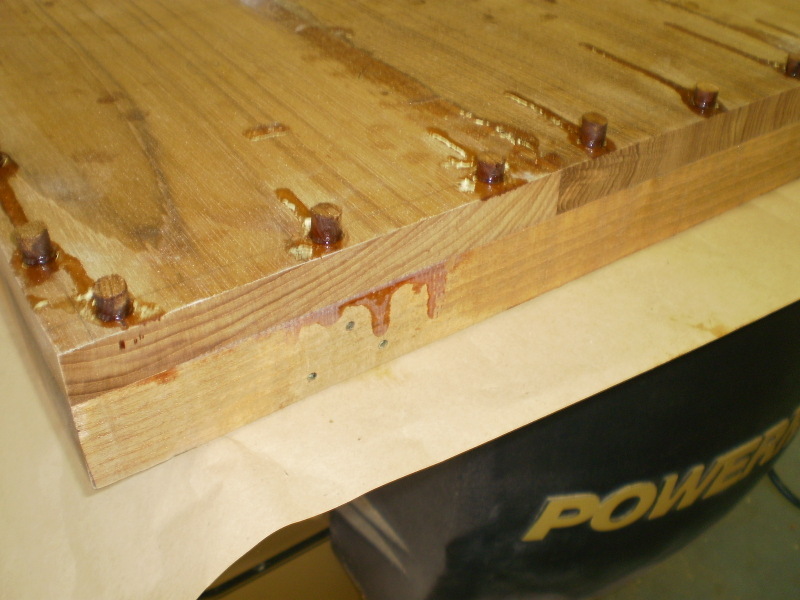 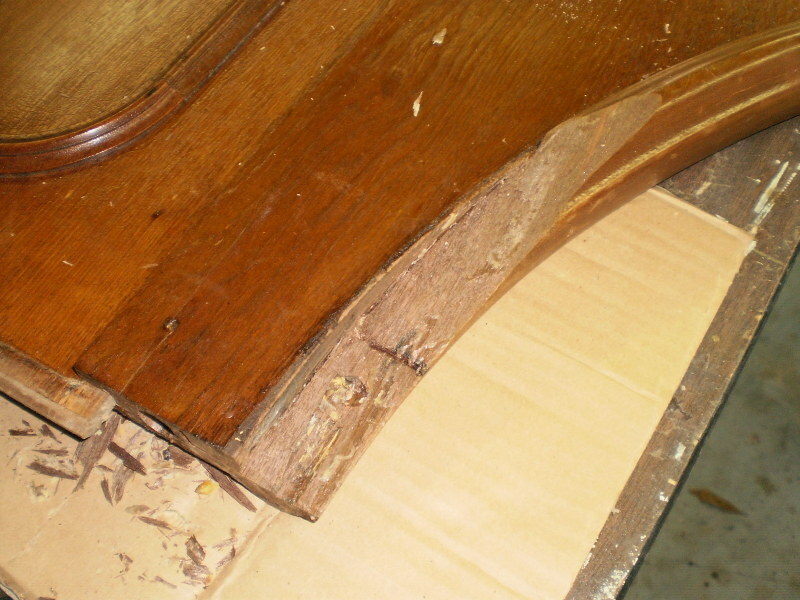 Most joints survived, but some have to be re-glued. 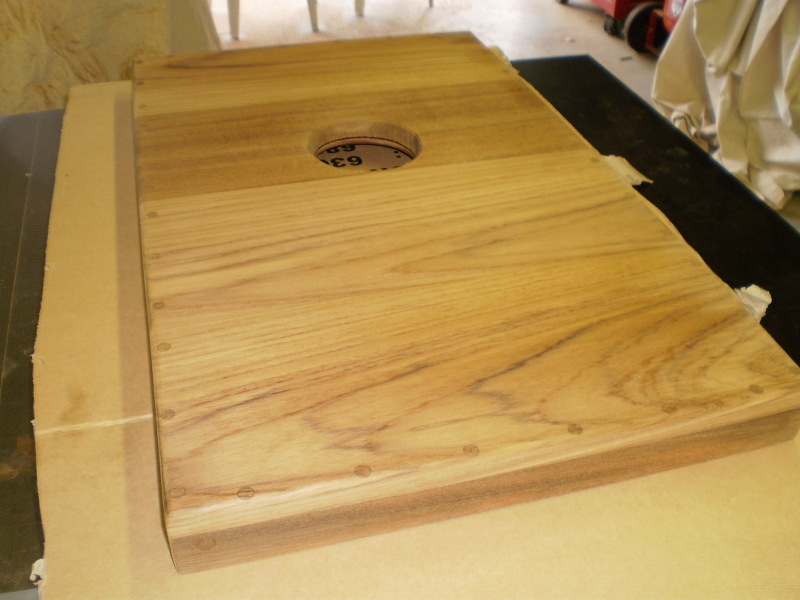 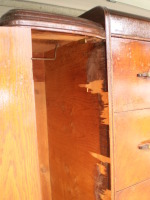 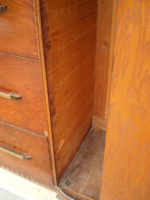 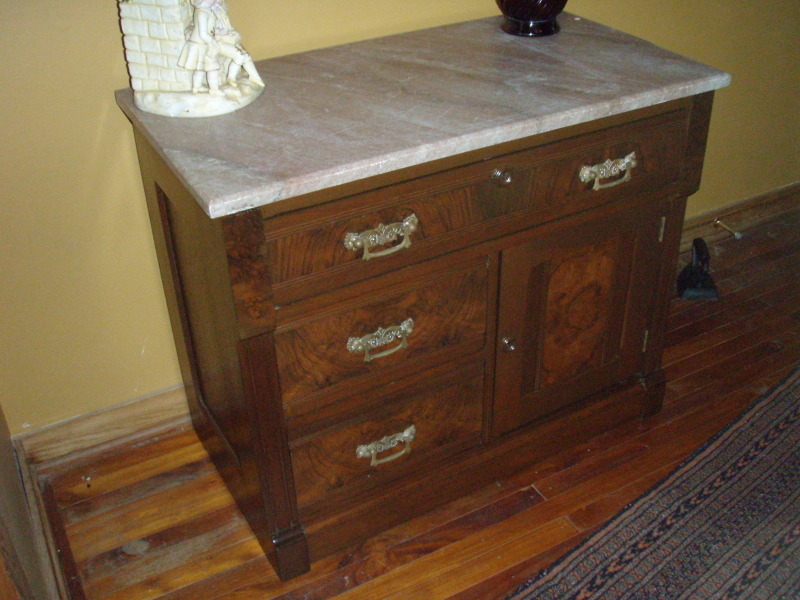 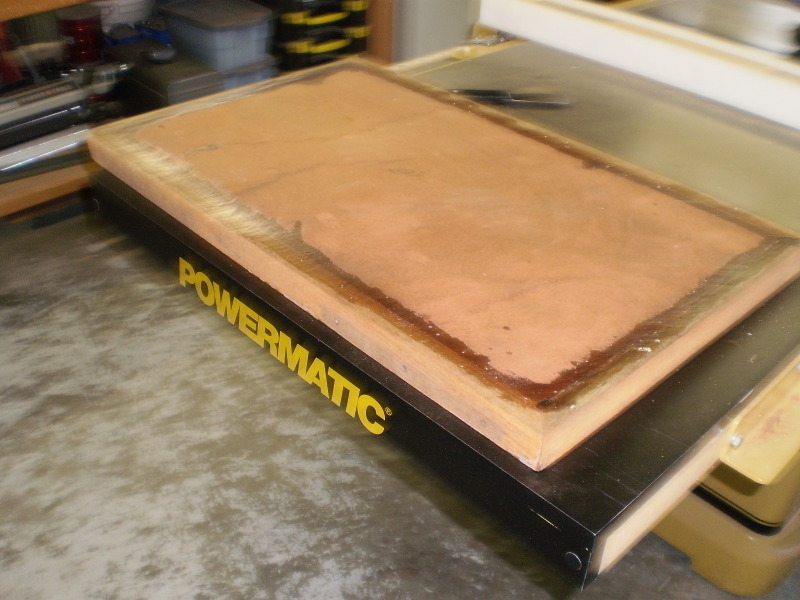 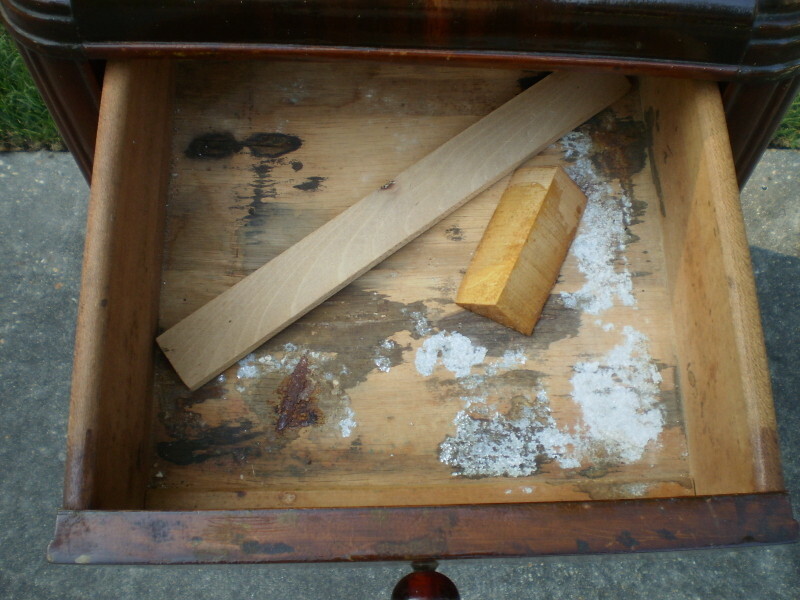 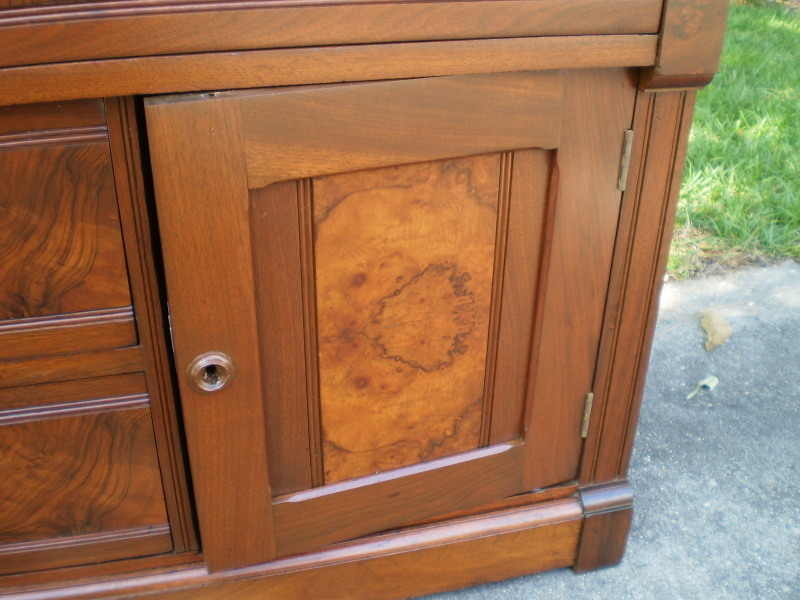 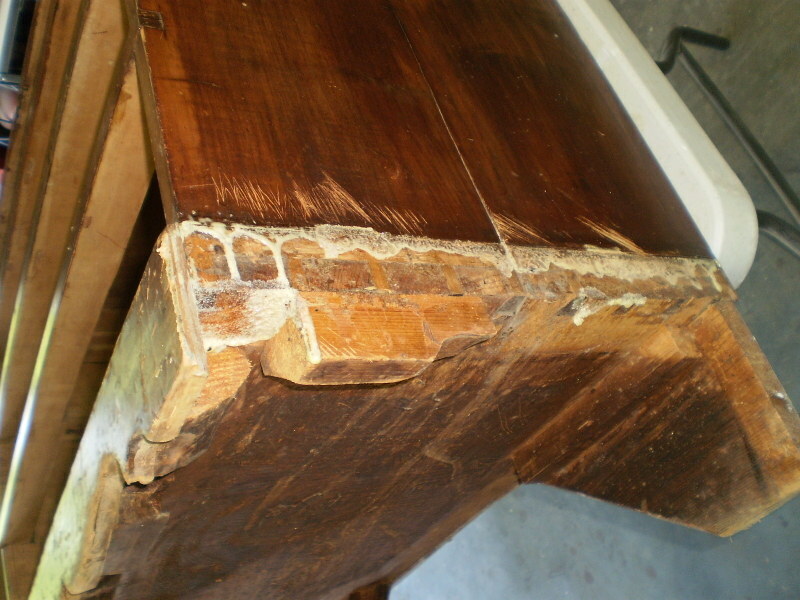 The burl veneer was cracked in several places and some drawer boards needed repairing or replacing. 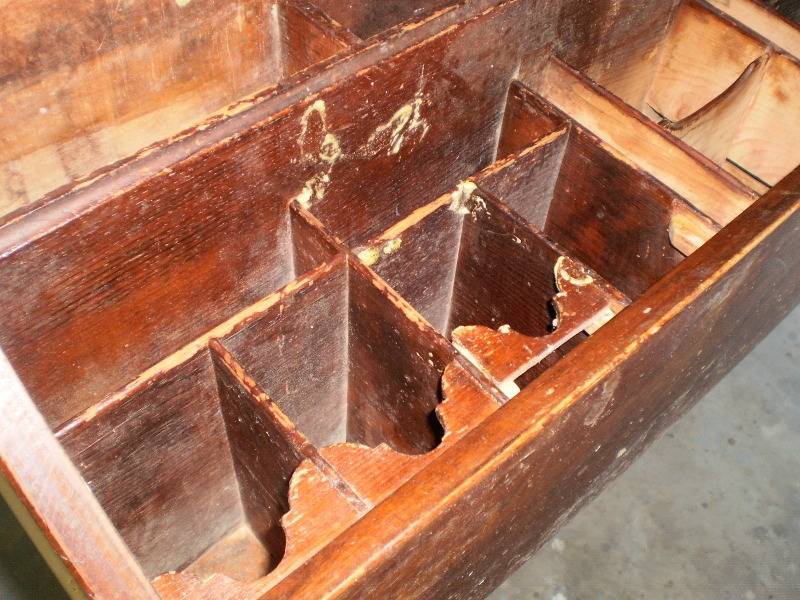 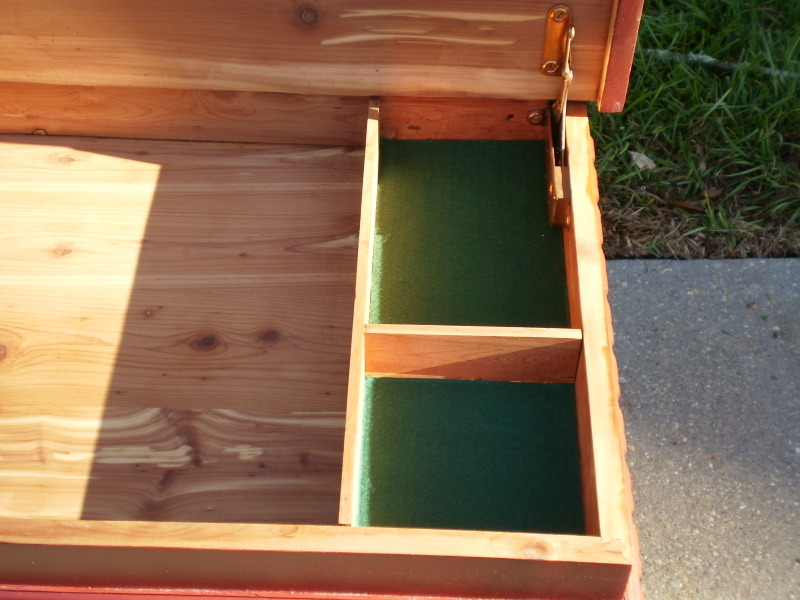 All drawers were taken apart and re-glued. 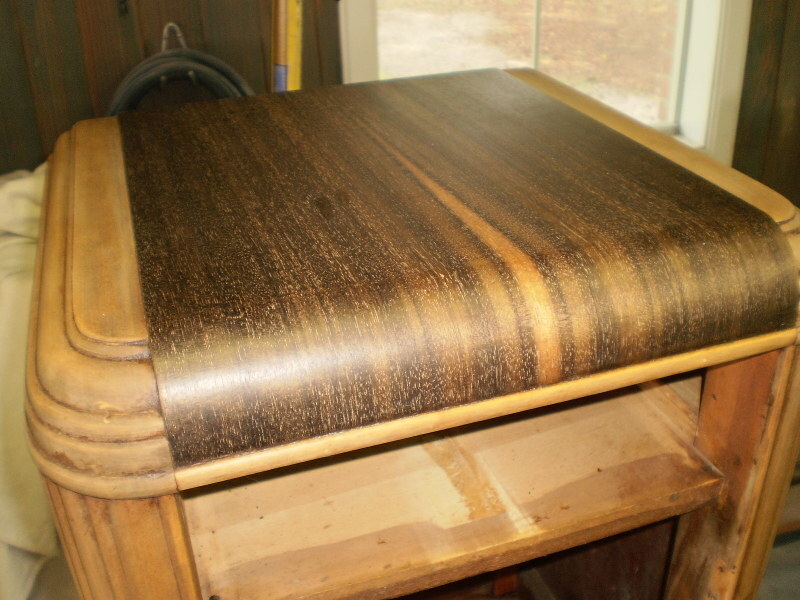 I finally refinished with conversion varnish. 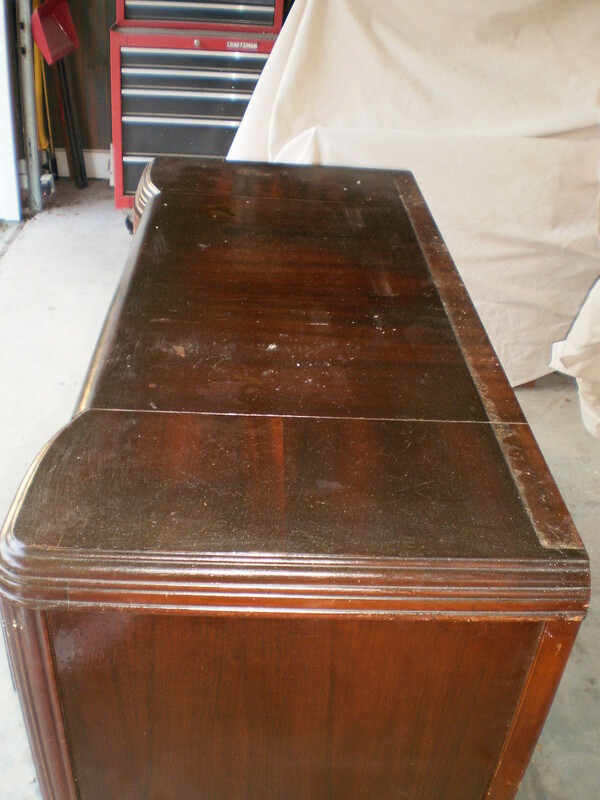 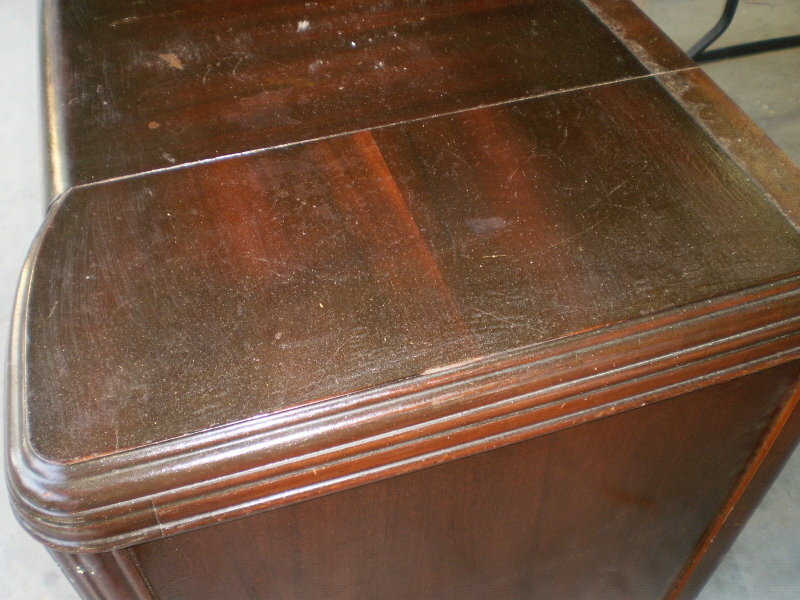 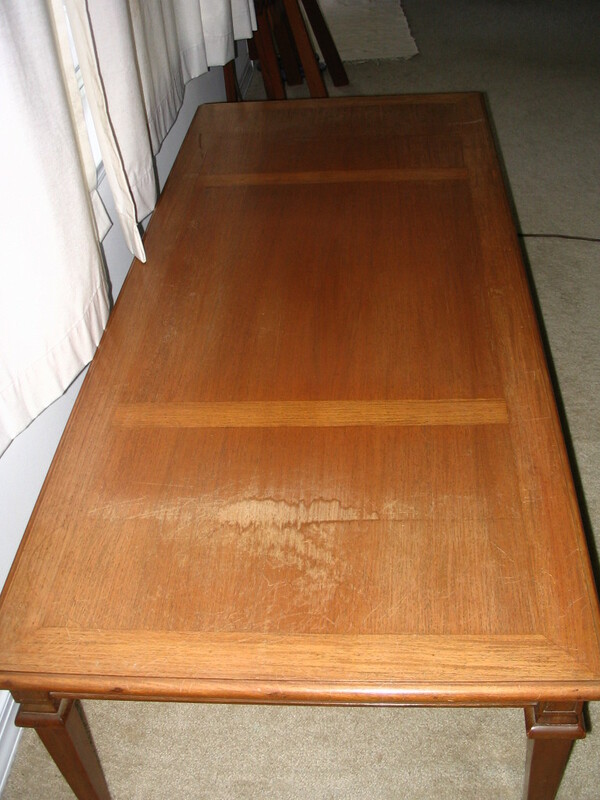 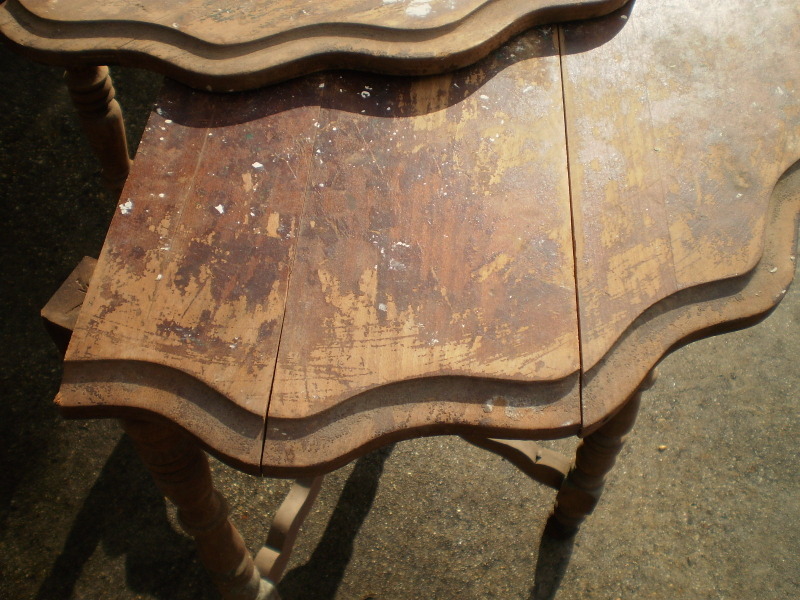 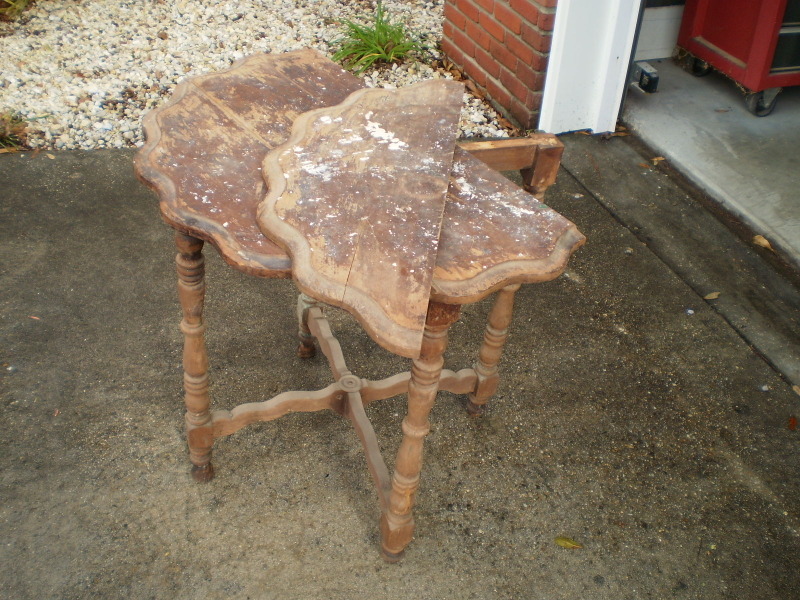 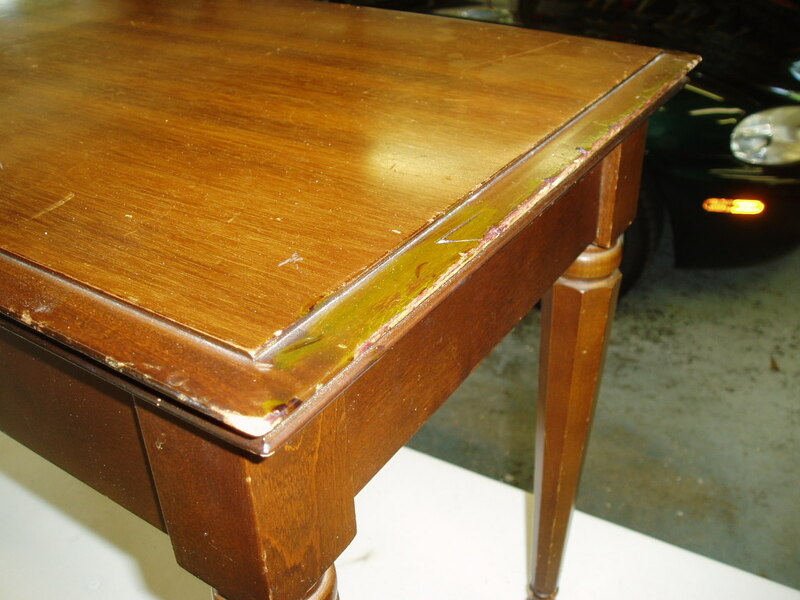 This antique table was originally coated with with shellac. 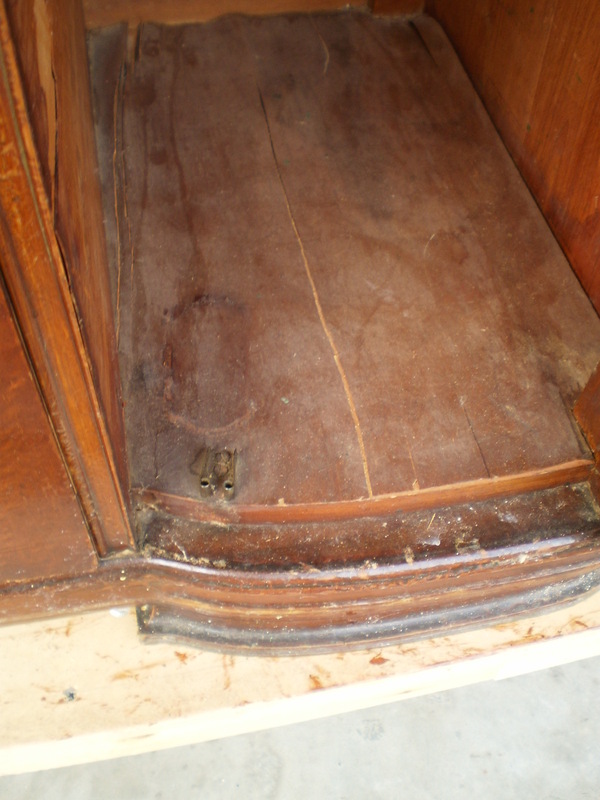 However, it was unfortunately cleaned with an alcohol based product which literally dissolved the shellac. 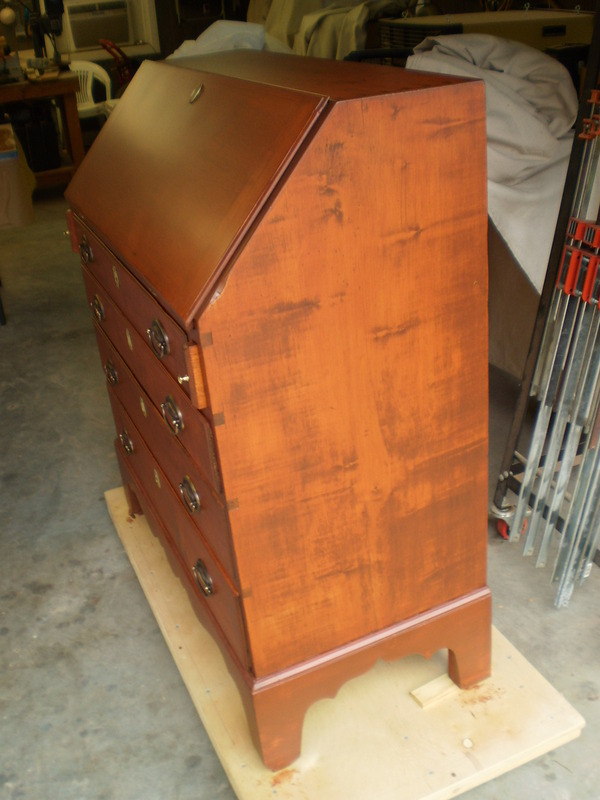 To restore this treasured piece of furniture I had to completely refinish down to bare wood, stained it to match the sides, and then refinish with a conversion varnish. 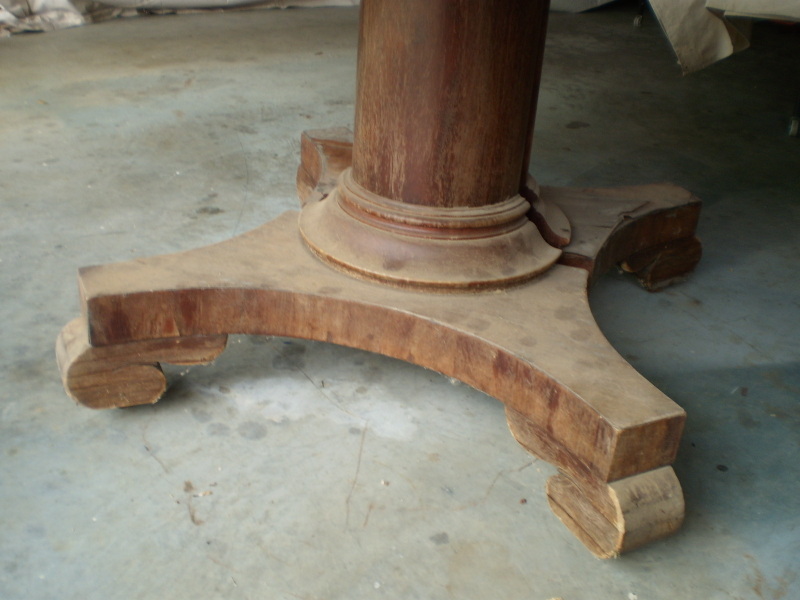 I also fabricated a leaf that was missing and match this to the rest of the table. 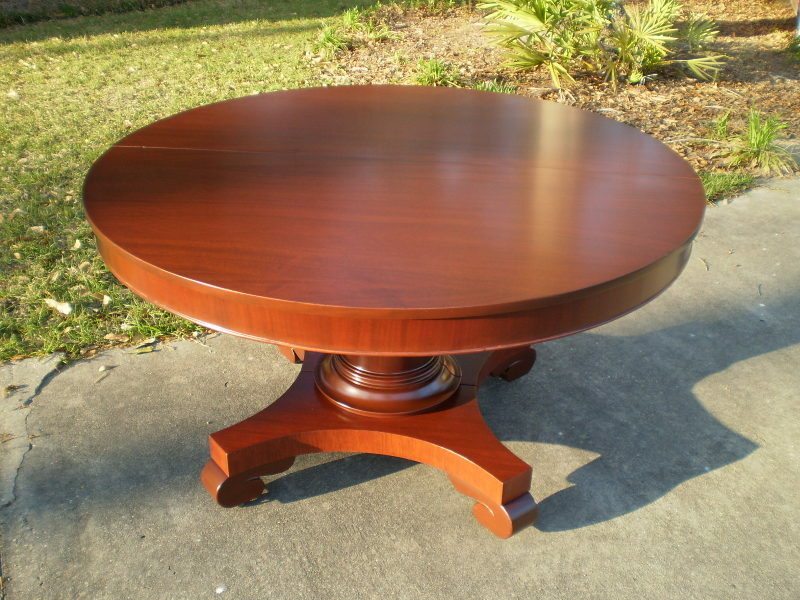 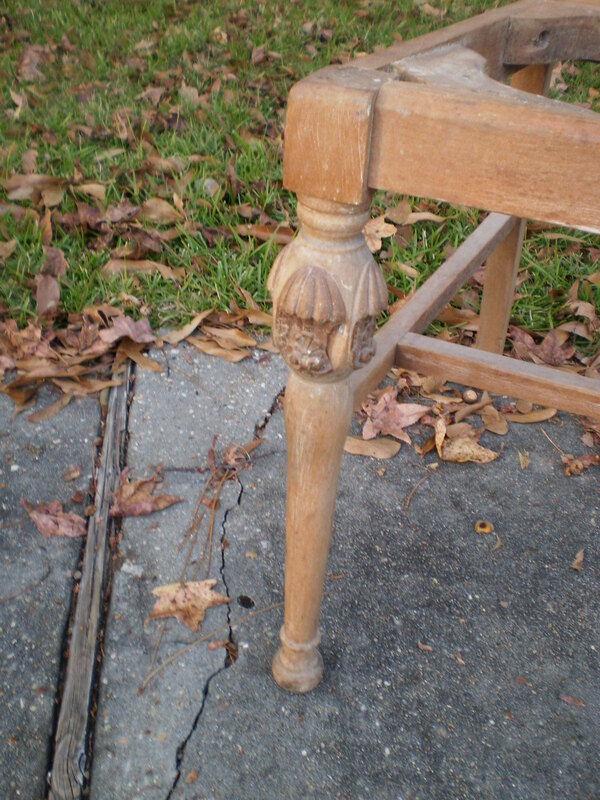 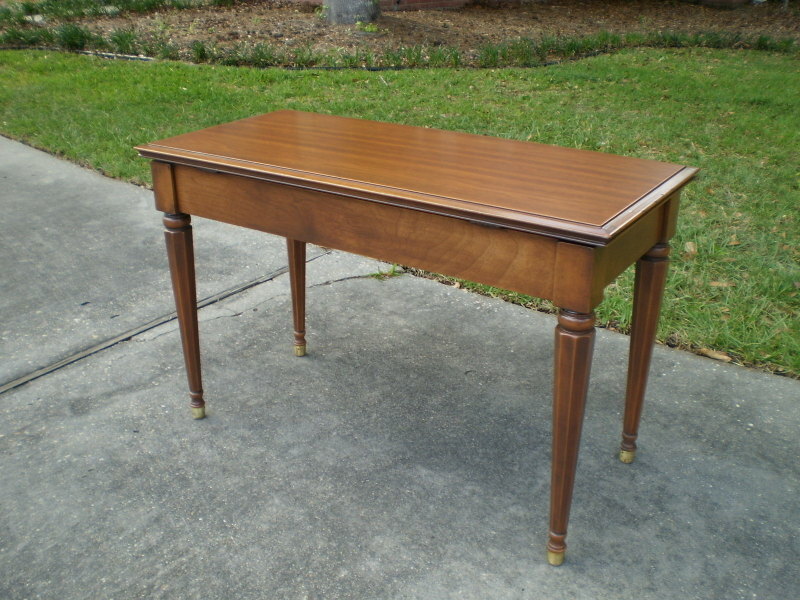 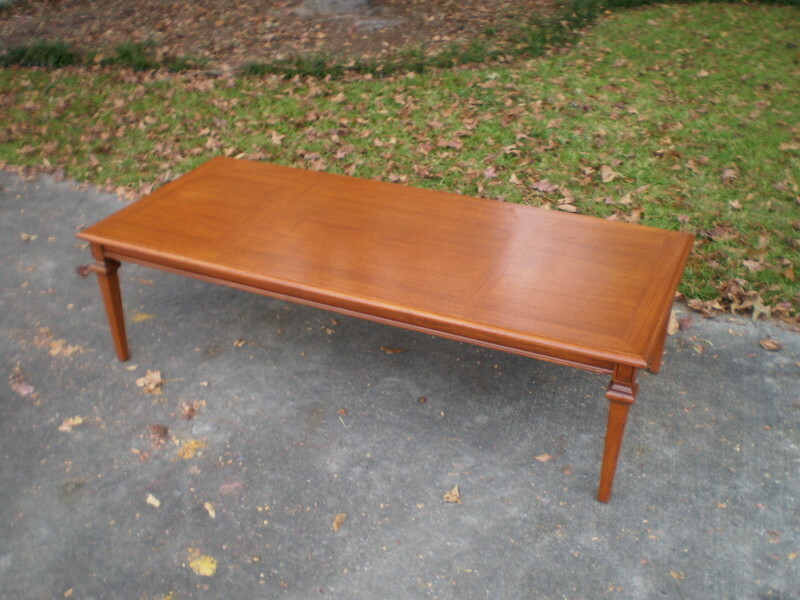 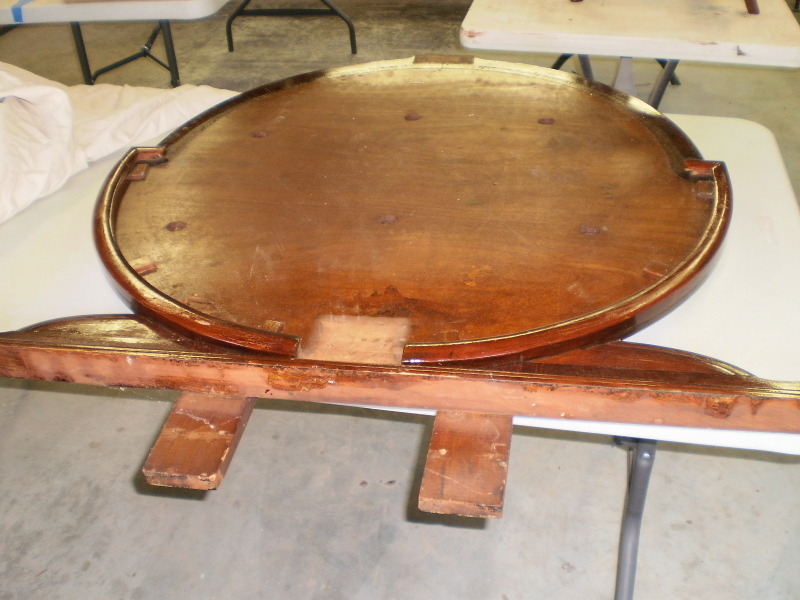 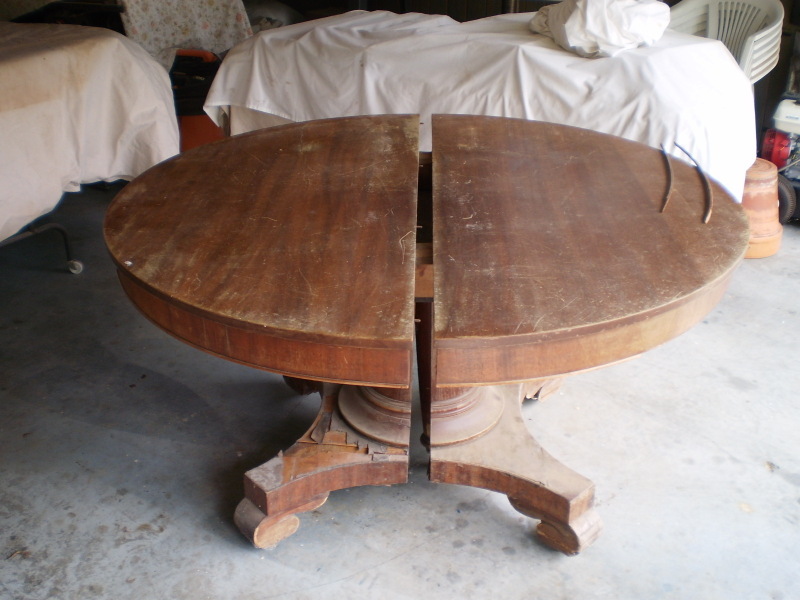 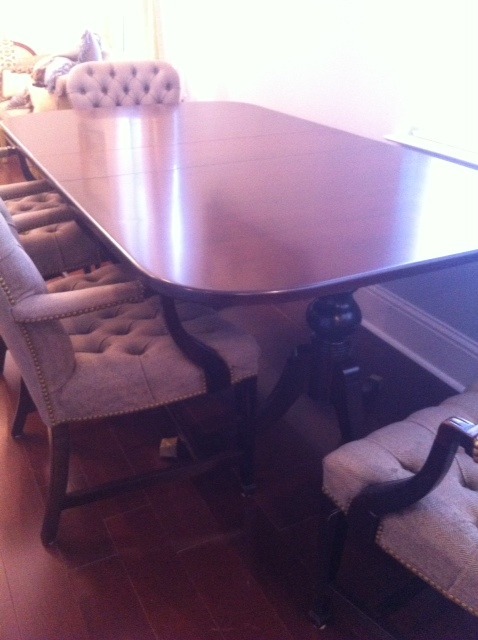 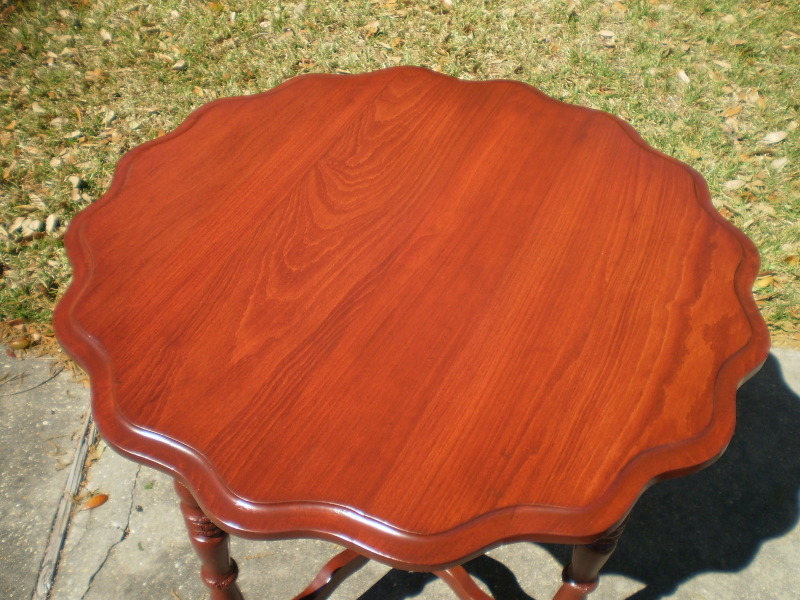 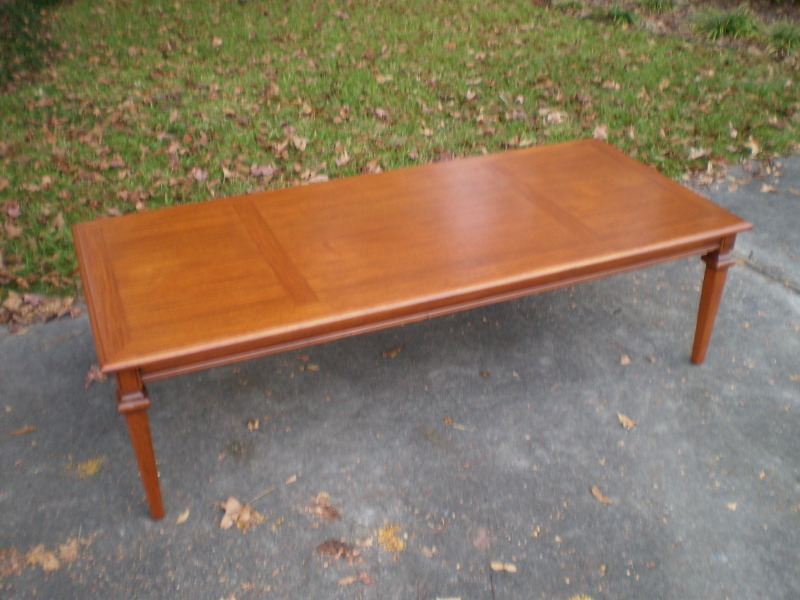 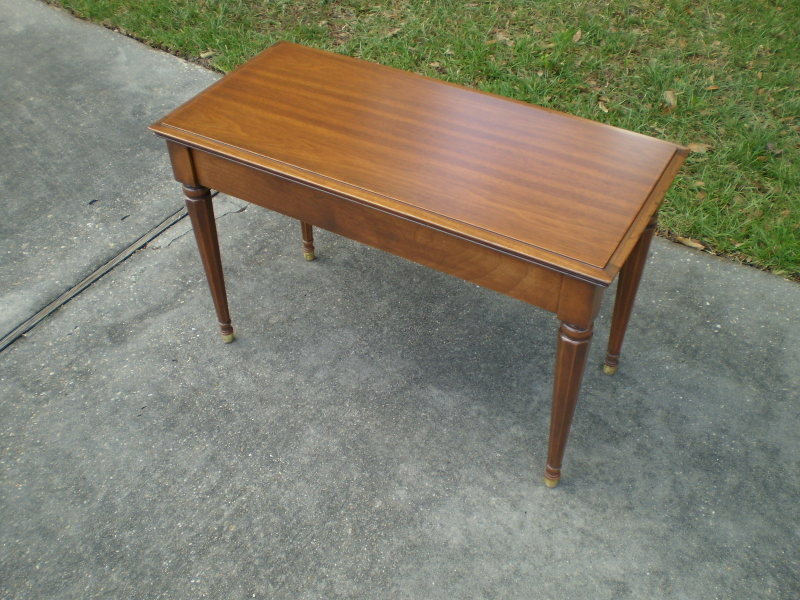 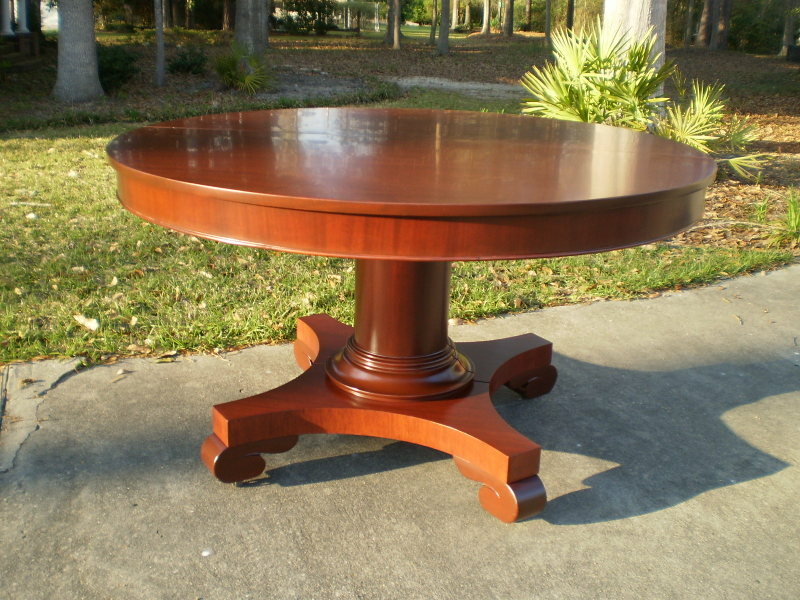 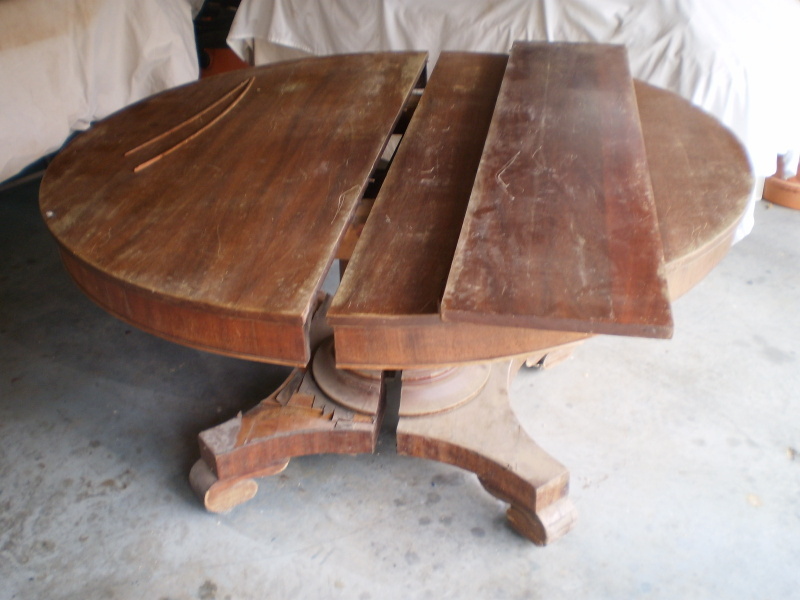 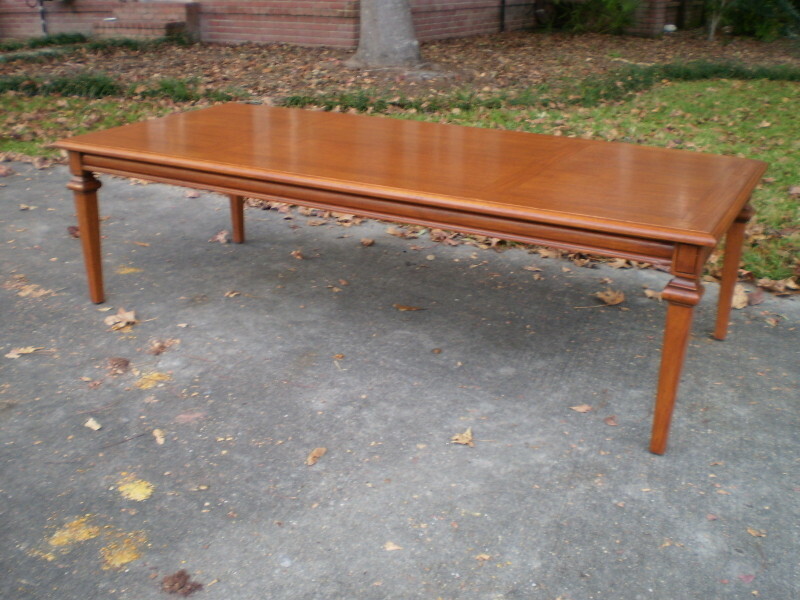 Another antique mahogany dining room table that survived Katrina with some damage. 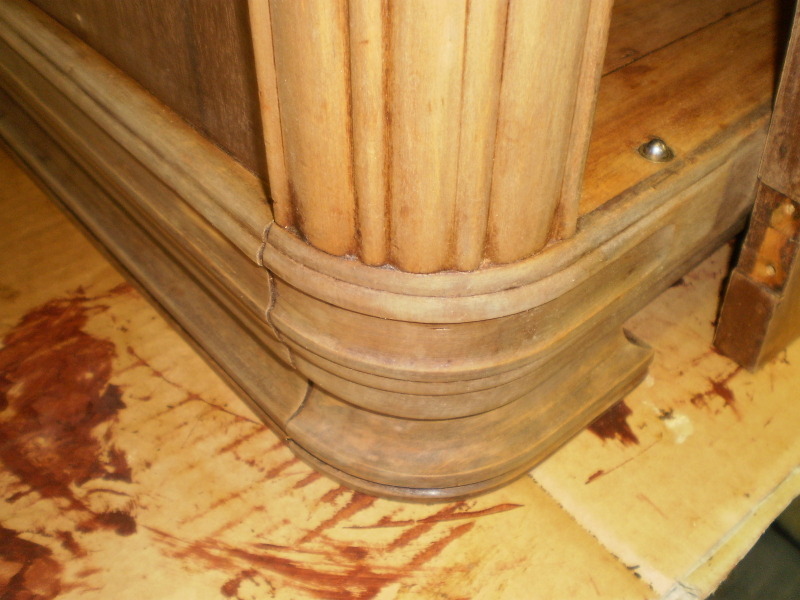 Swelled joints and several major scratches to top and both leafs to repair as well as the bottom support suffered de-lamination and most veneers have damage. Table now restored and refinished back to its prime! 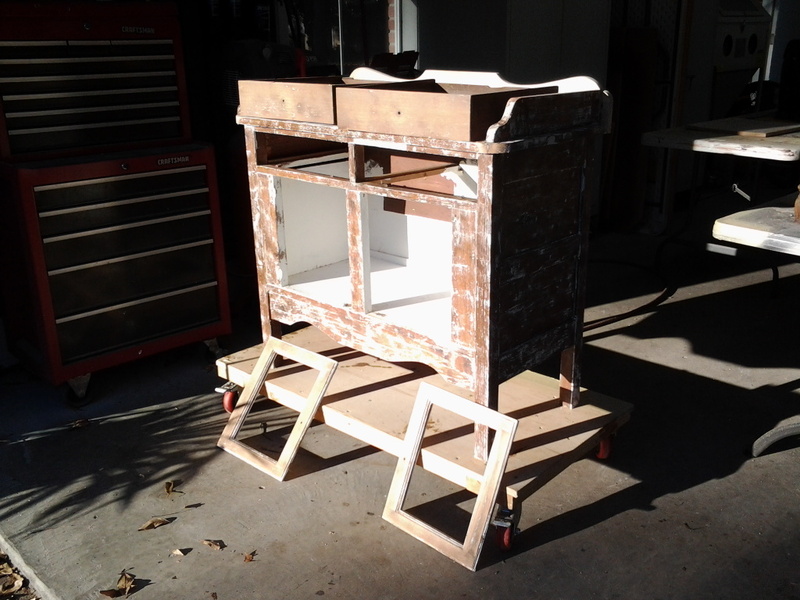 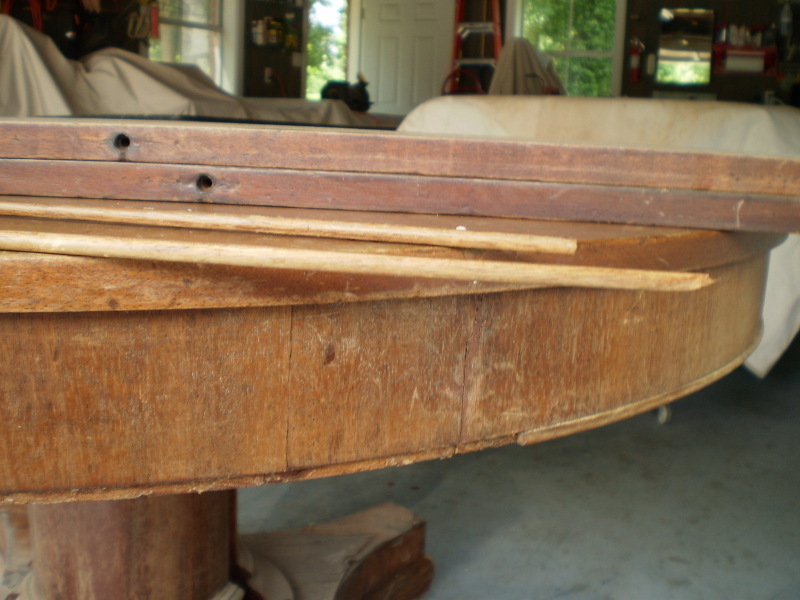 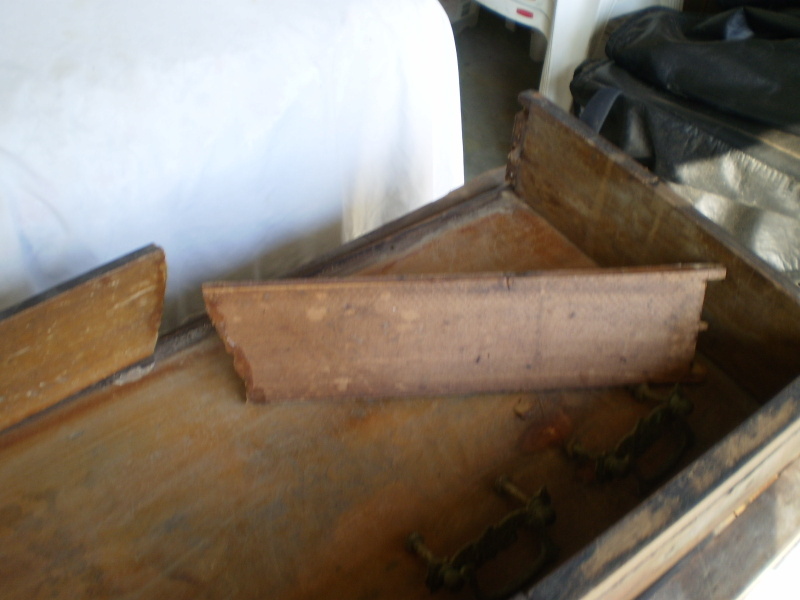 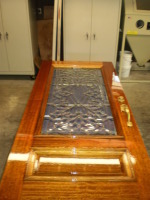 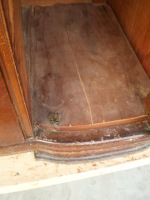 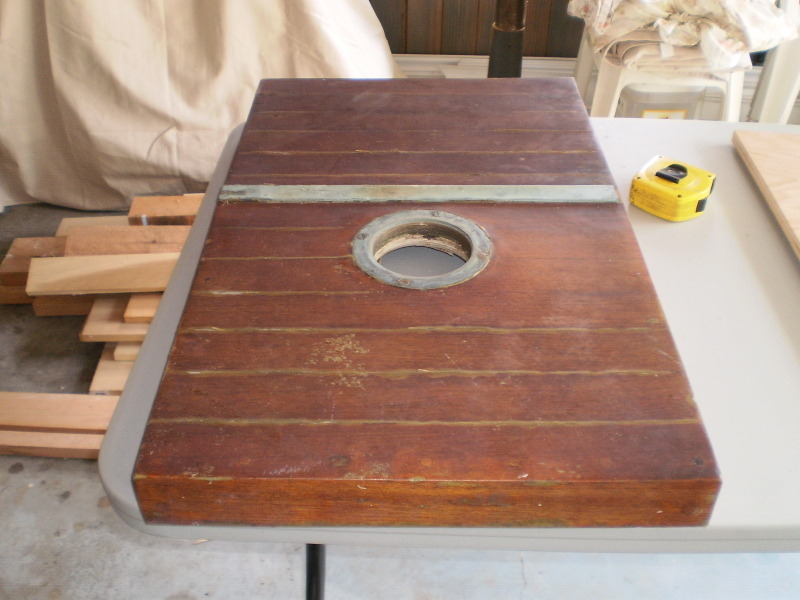 Another boat hatch to restore. This one was in better shape, but the customer wanted much stronger one. 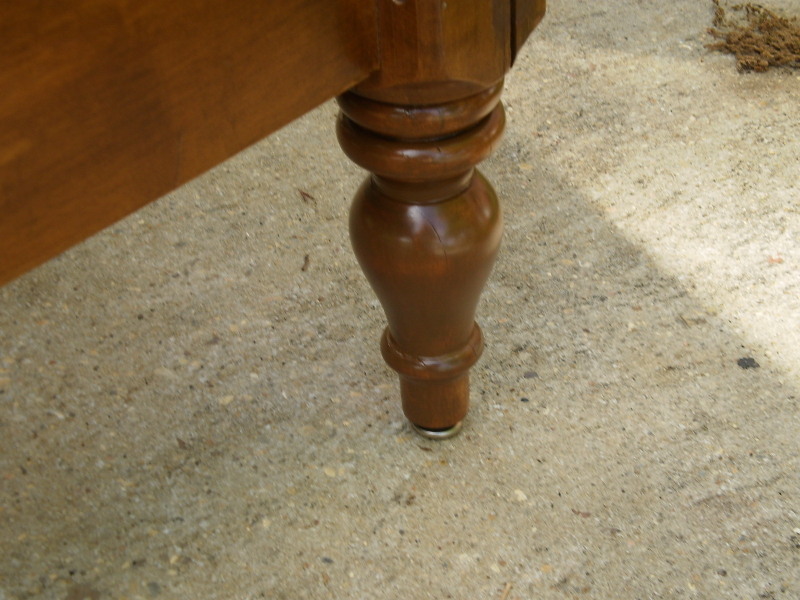 I replaced the supporting plywood and topped with solid Teak. 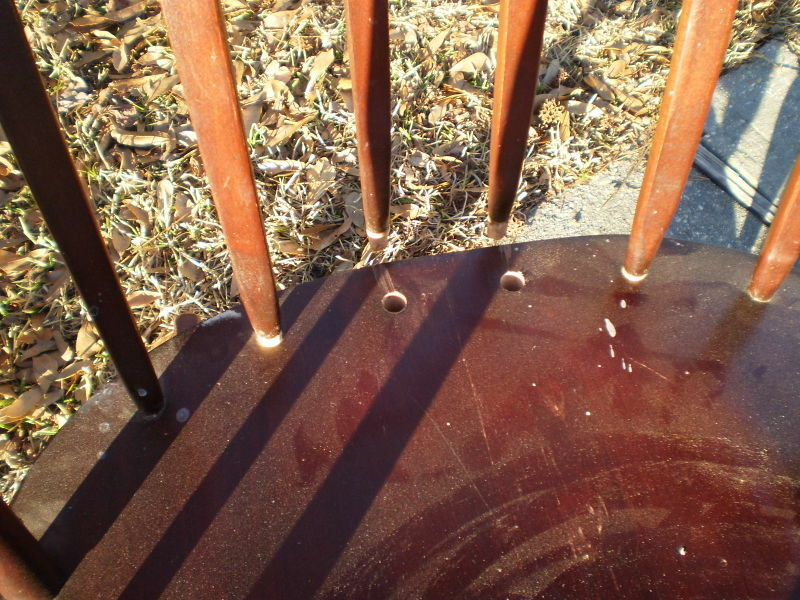 Used bronze screws and then bunged the holes. 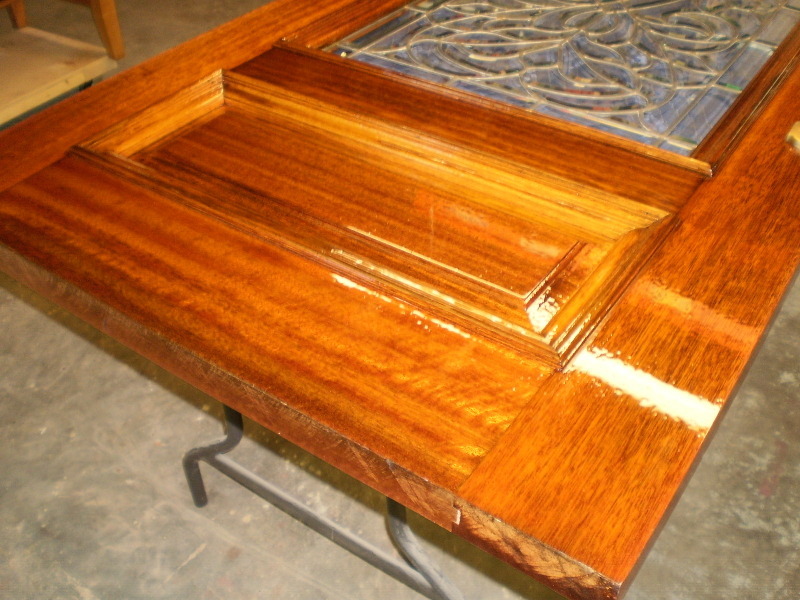 10 coats of Epifanes were applied to the hatch to give a coating to withstand the elements. 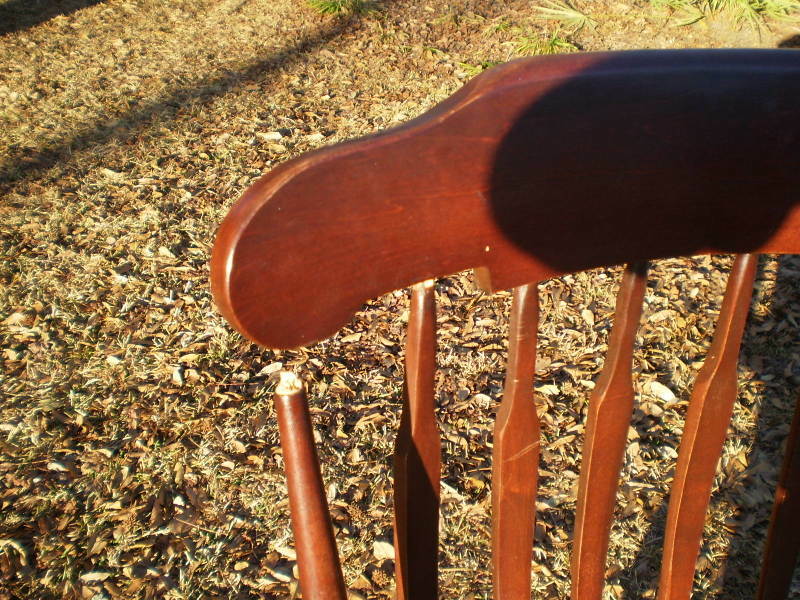 This client had difficulty in putting the swivel chair back together after discovering a loose screw. 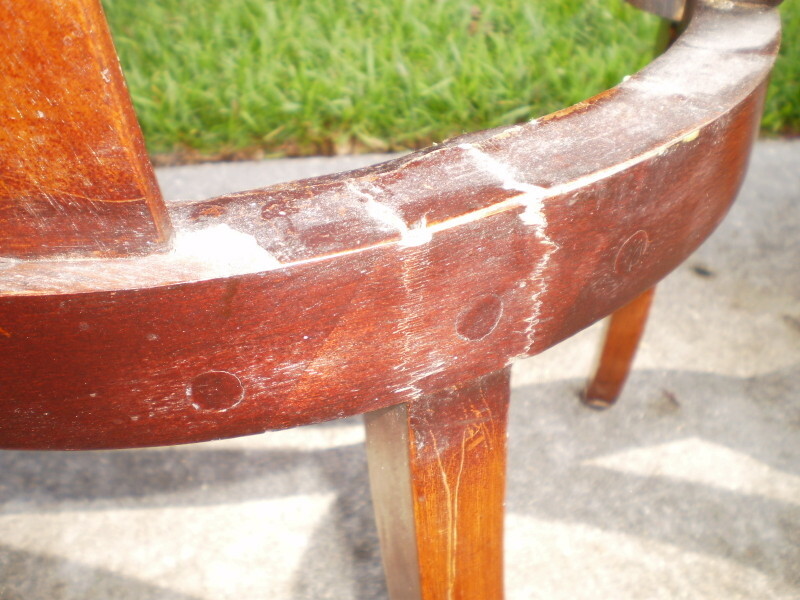 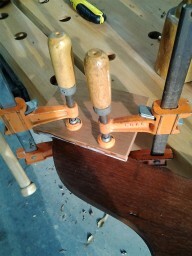 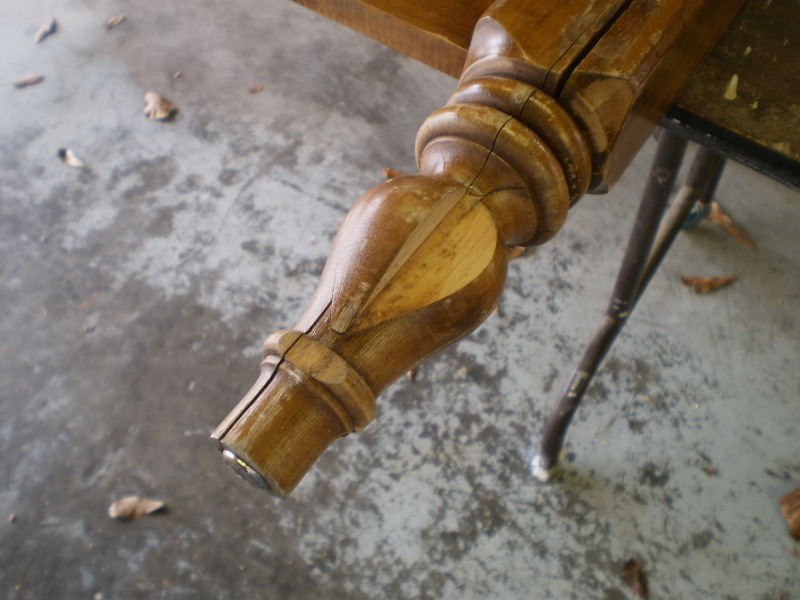 A tricky repair, but after examining the chair base it became obvious what to do. 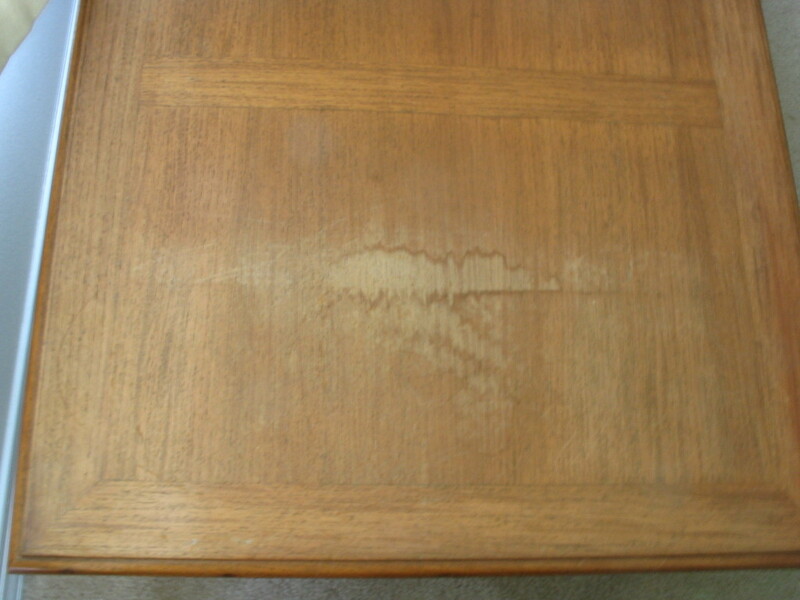 A quick wipe over with some matching stain makes this look as good as ever! 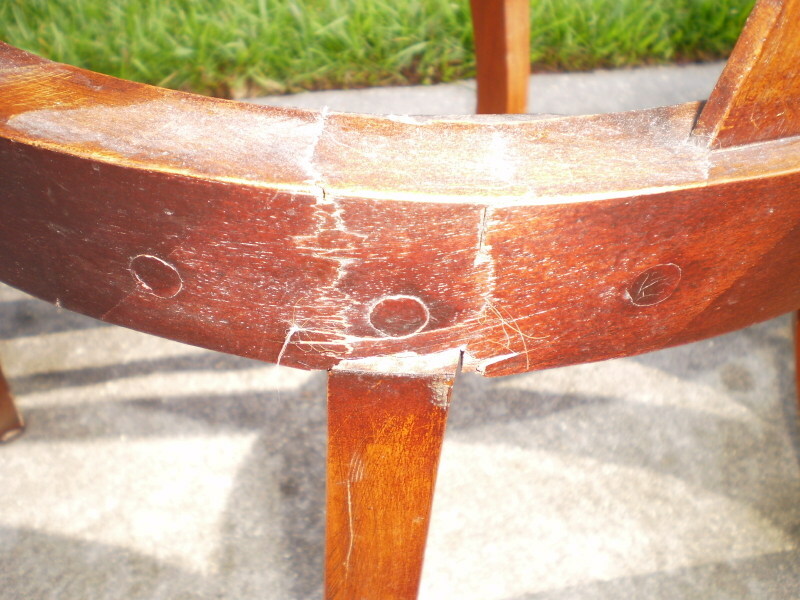 This antique chair had several problems. 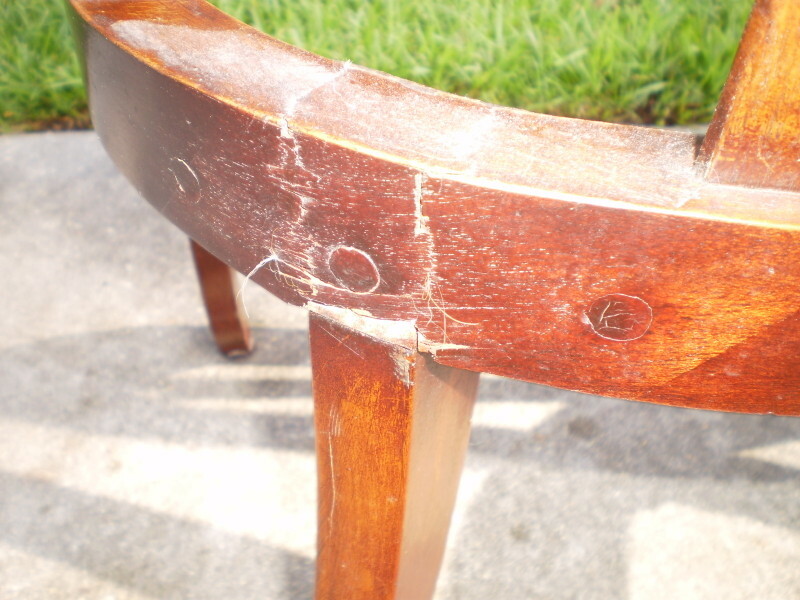 Not only was it reupholstered several times, but some of the joints were failing. 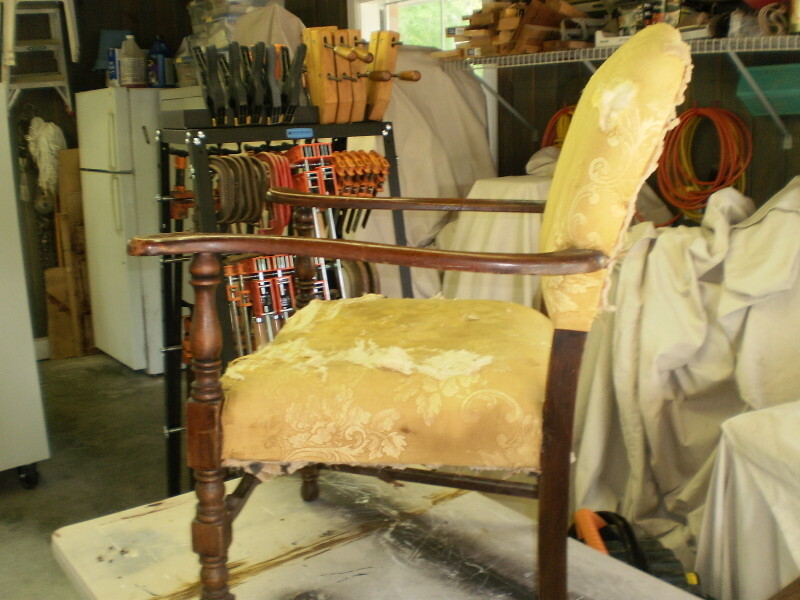 An heirloom indeed as the owner wanted to restore in memory of her mother. 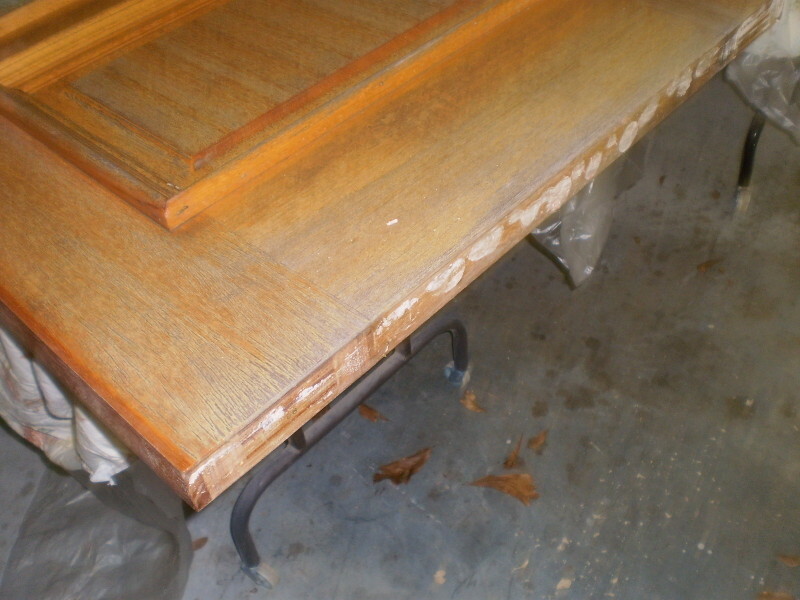 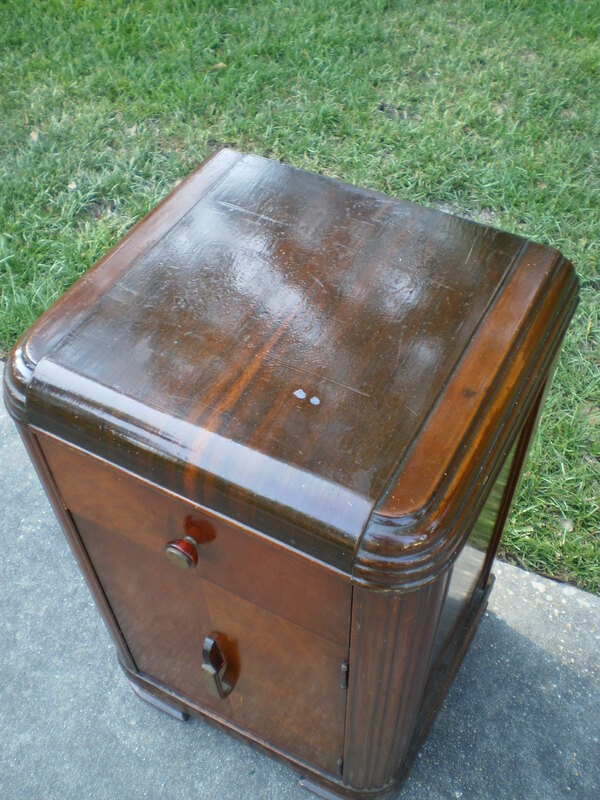 I first secured all the joints and then stripped it and restained and refinished to restore it to glory. 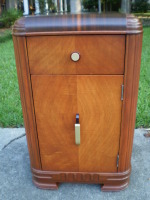 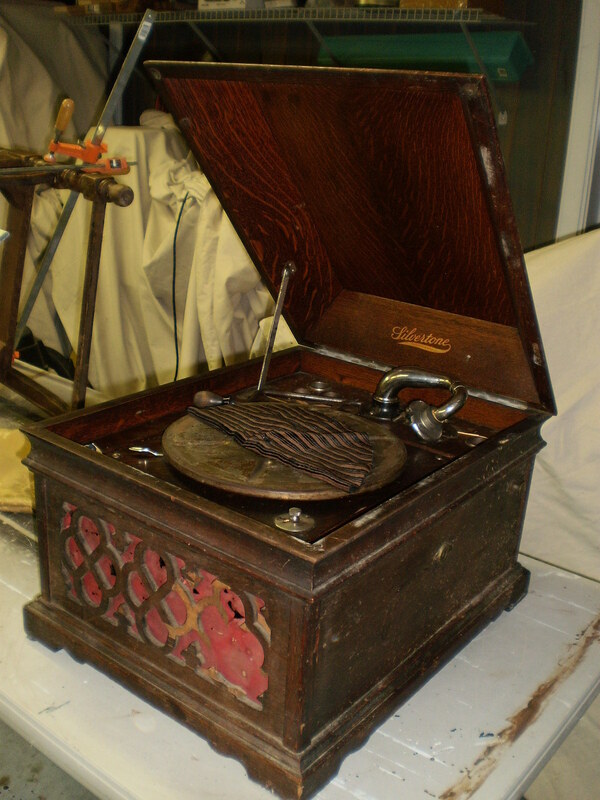 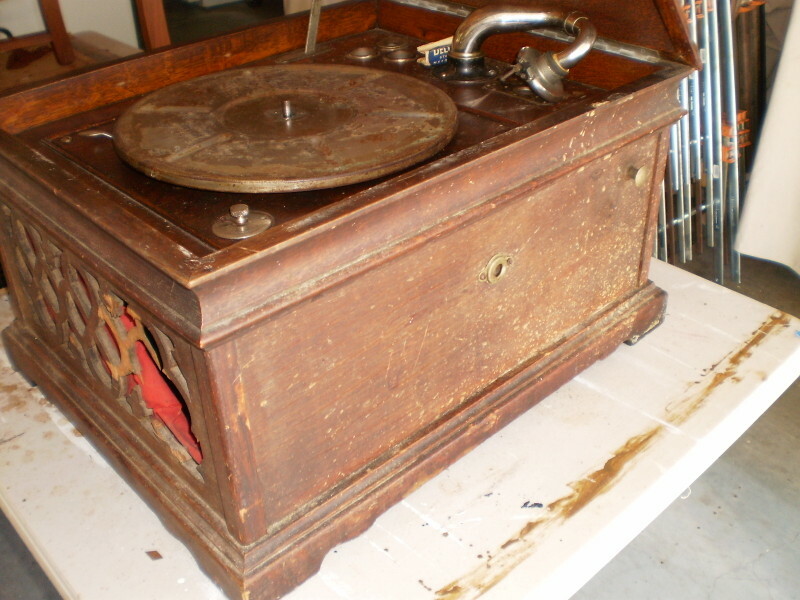 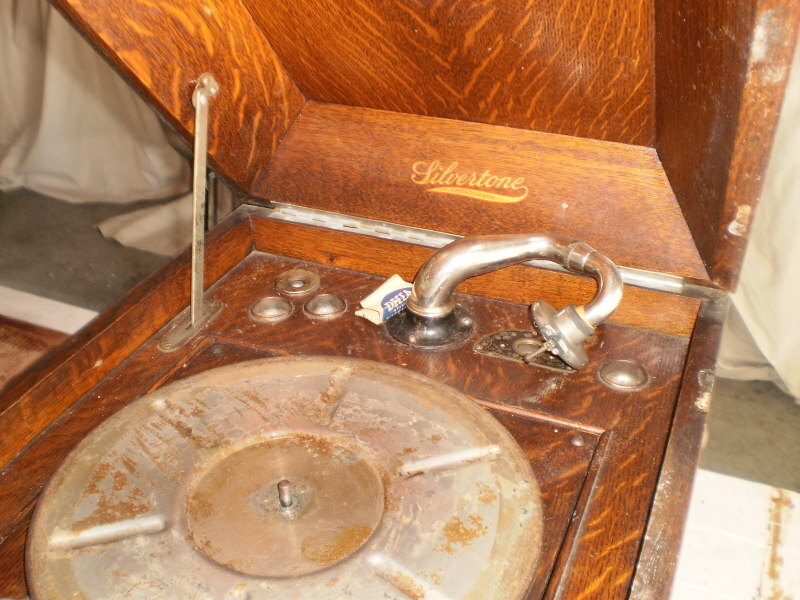 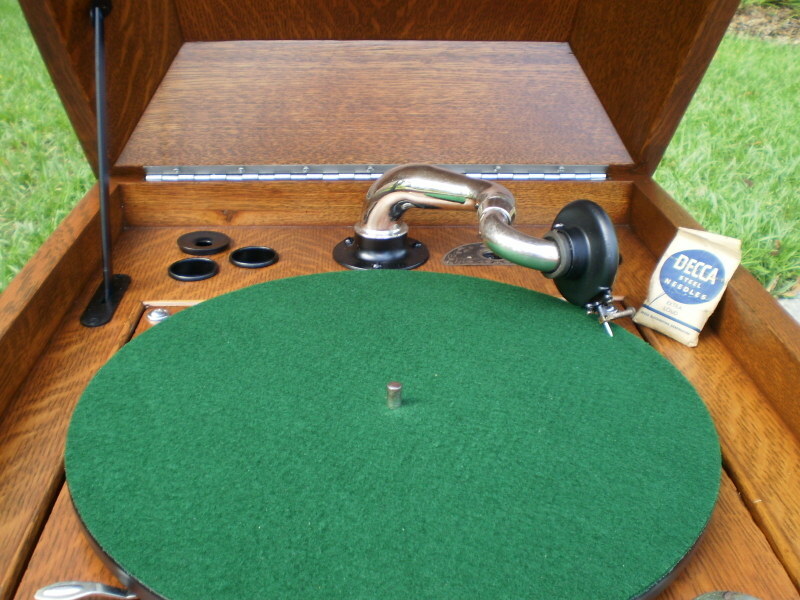 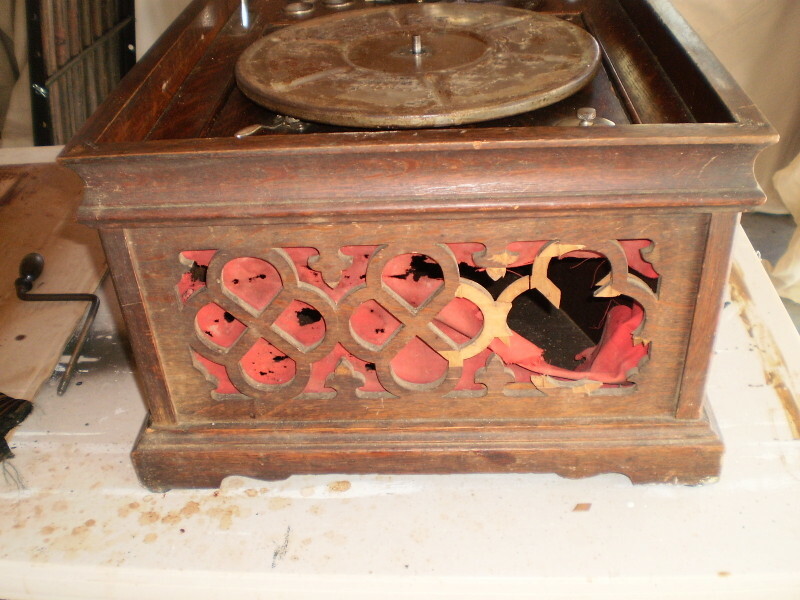 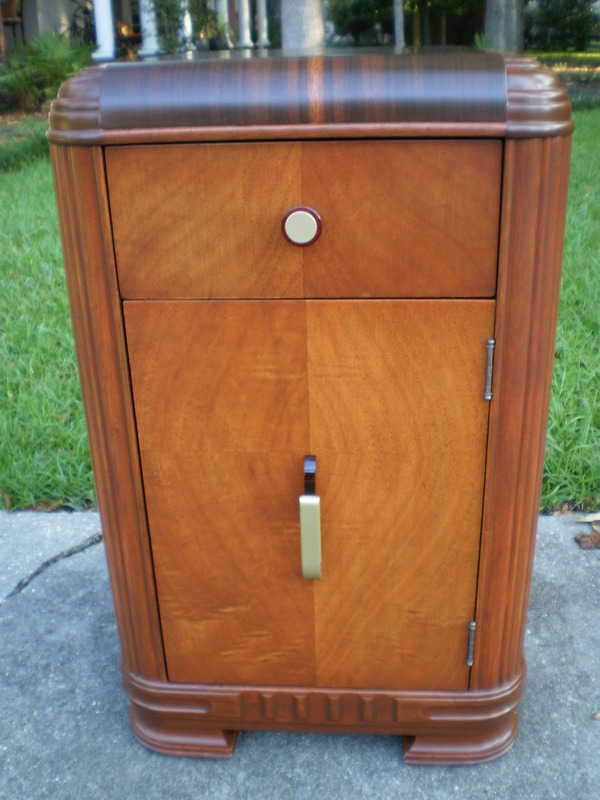 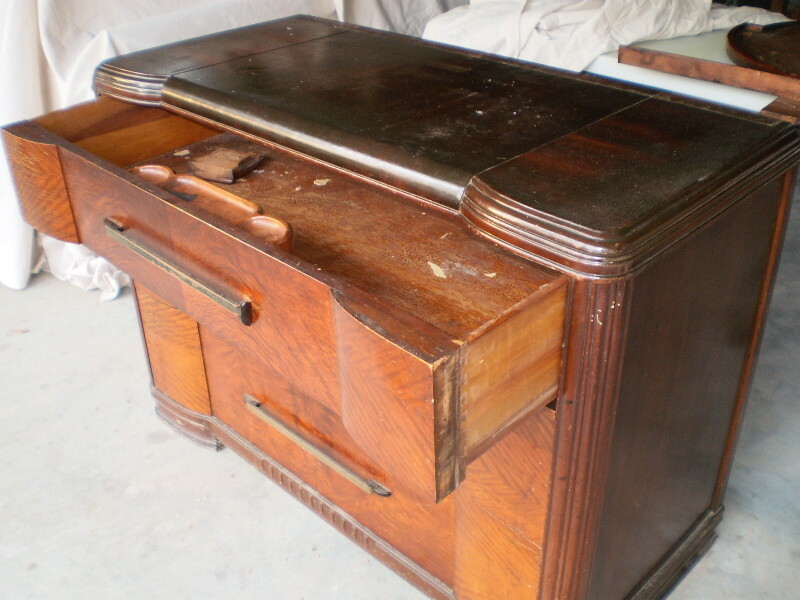 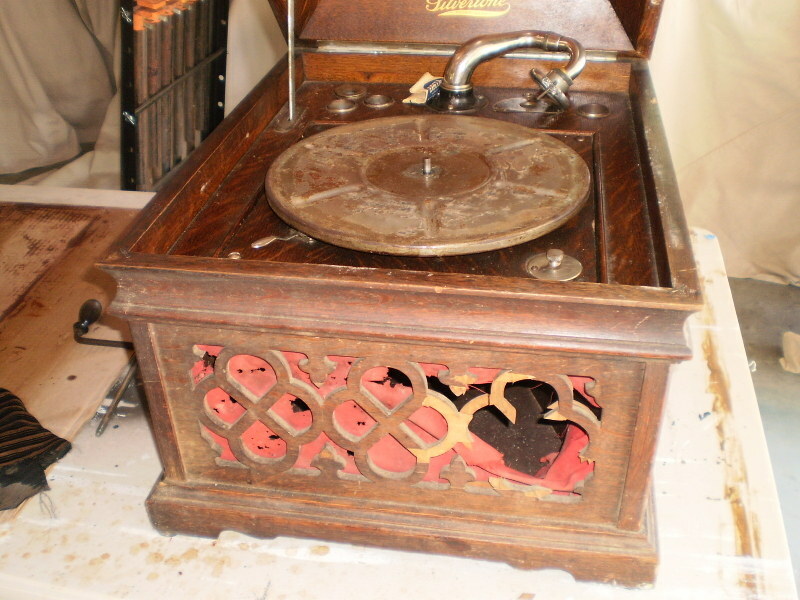 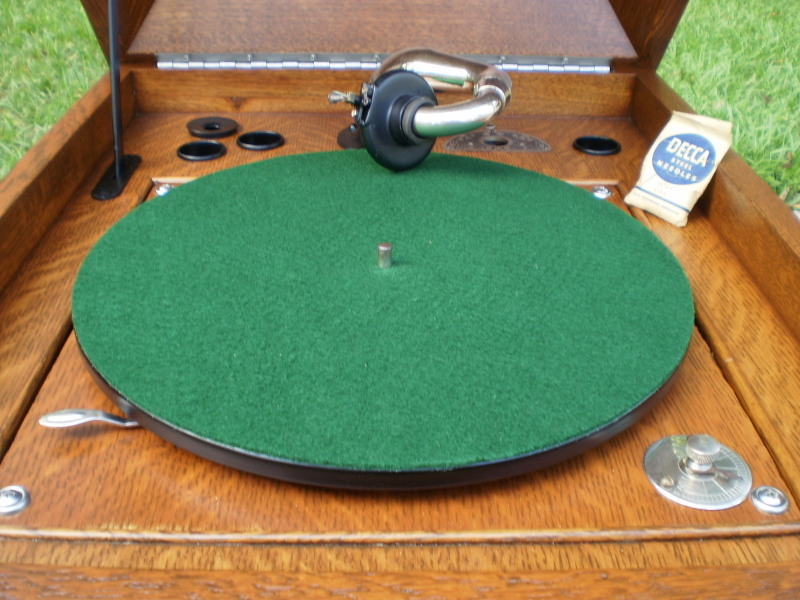 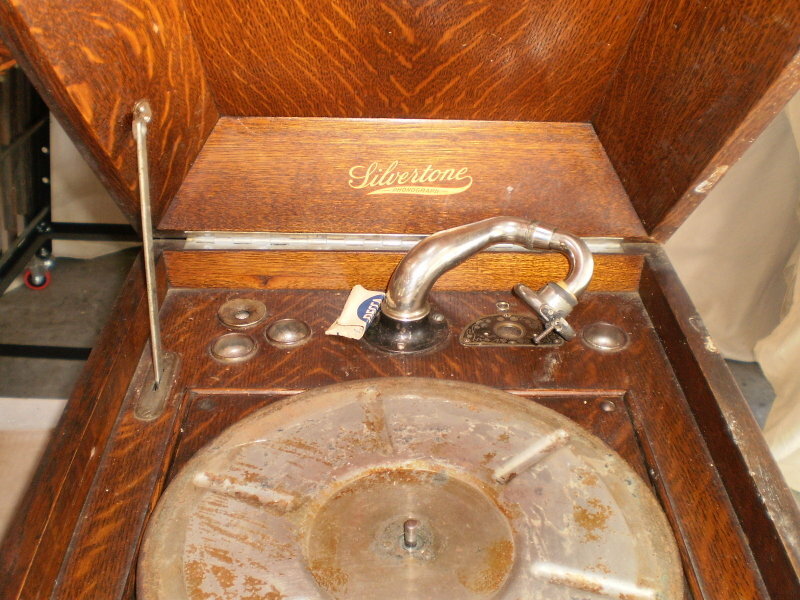 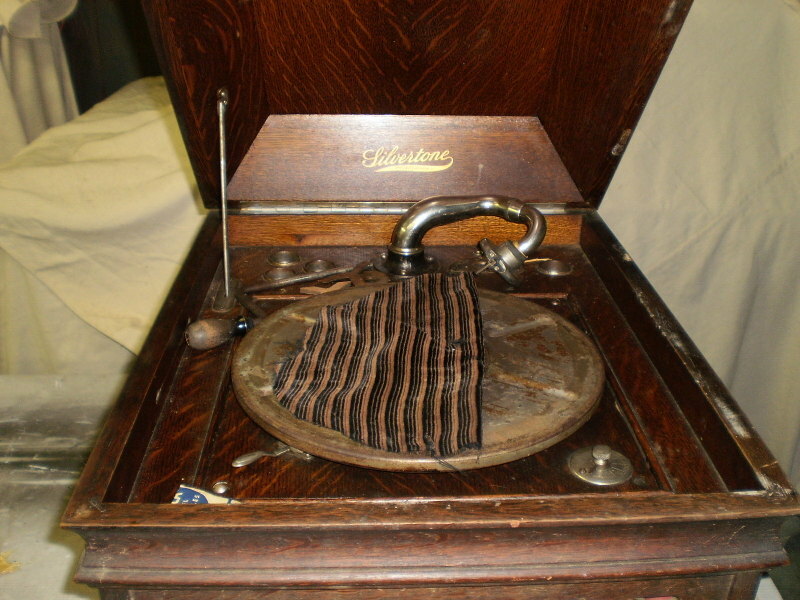 This customer wanted this antique phonograph restored to like-new condition. 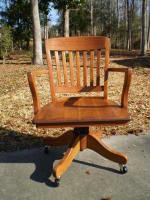 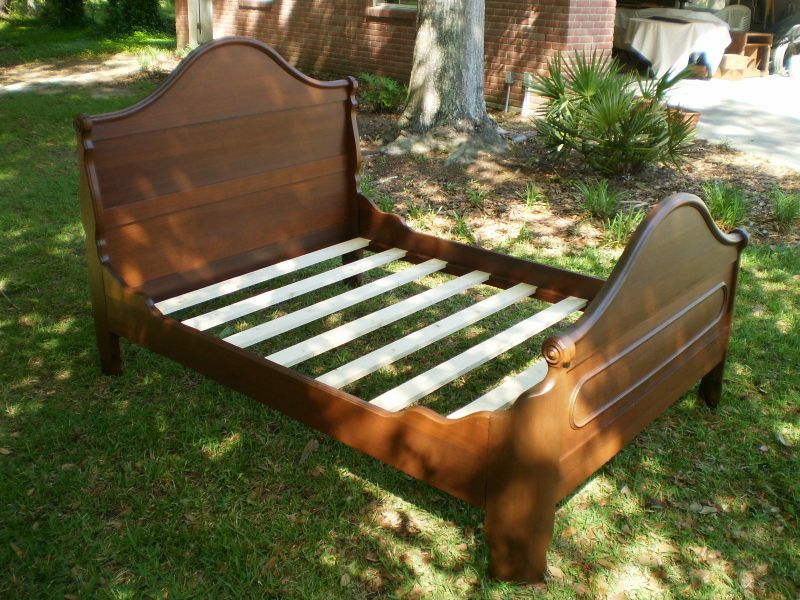 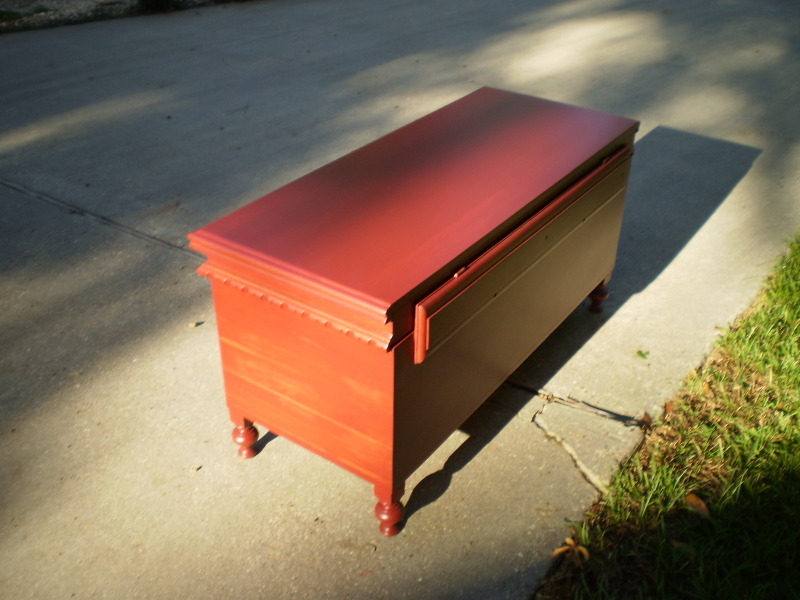 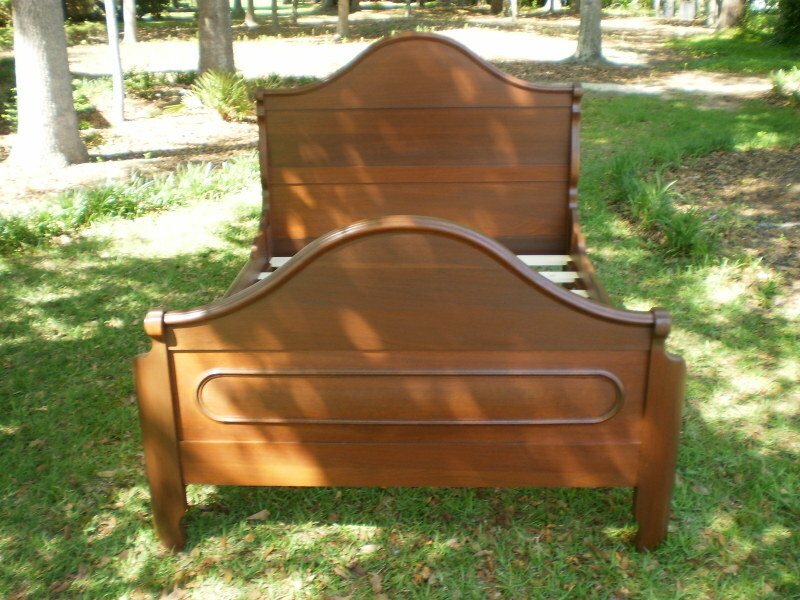 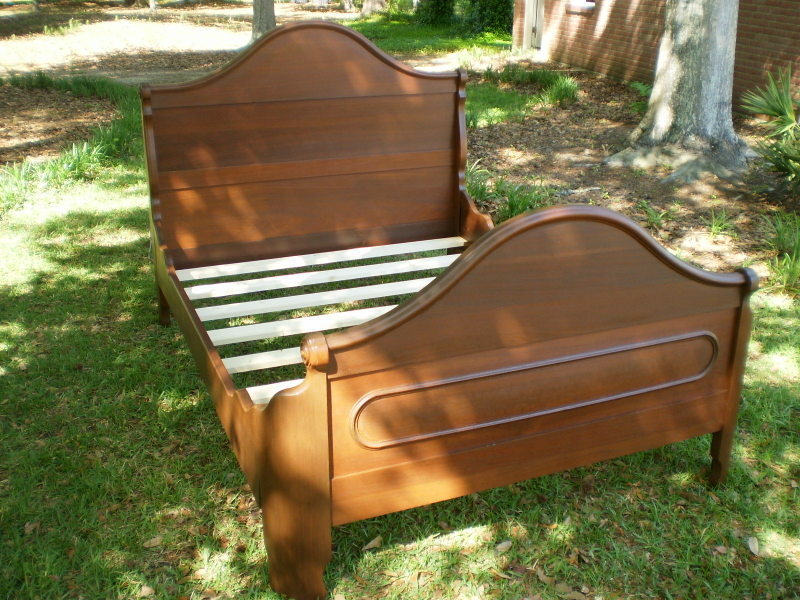 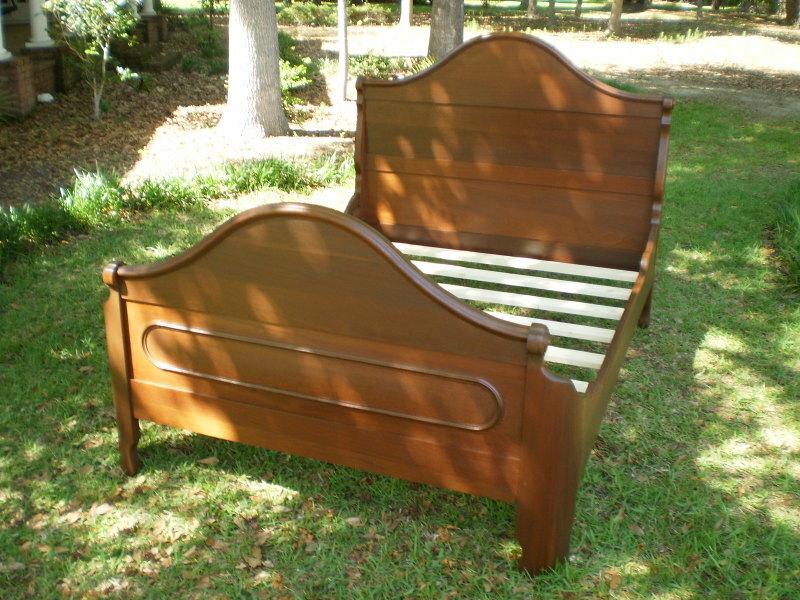 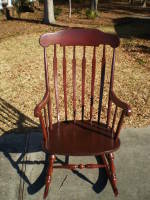 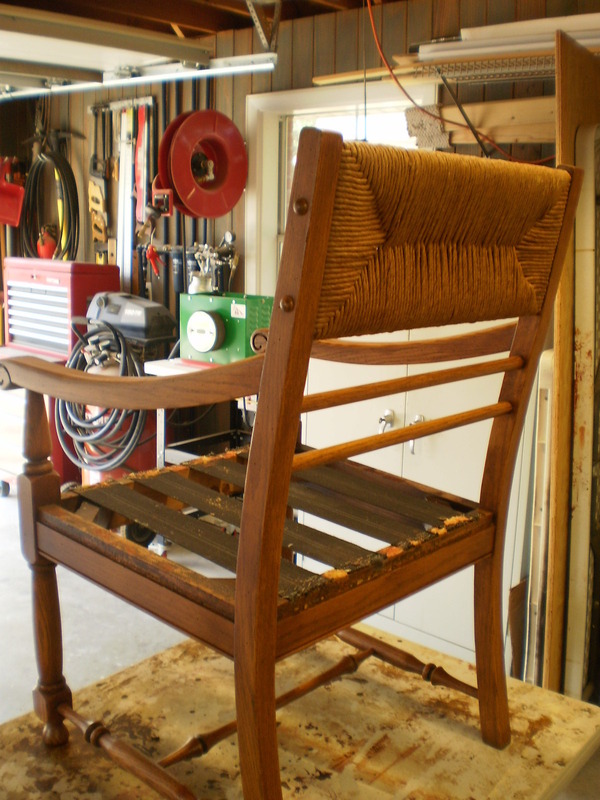 A slight different family heirloom project which ended up back to its prime after careful restoration and refinishing. 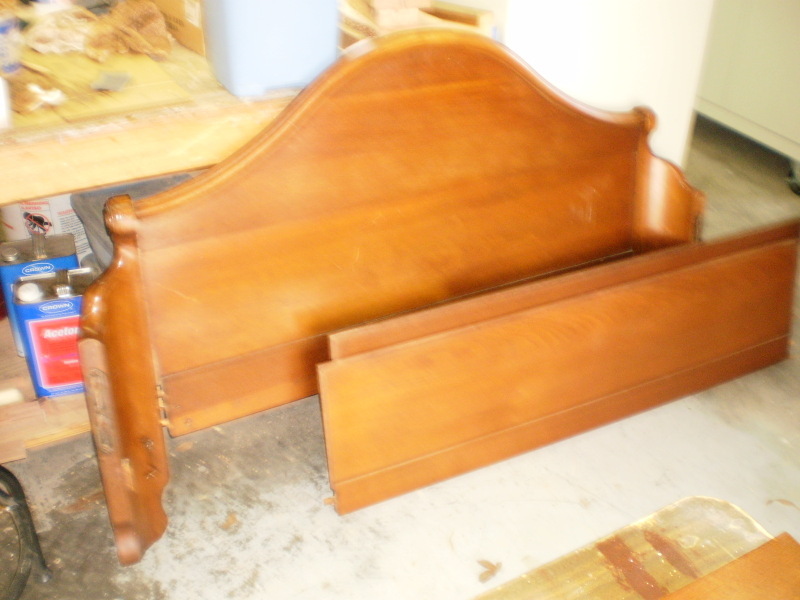 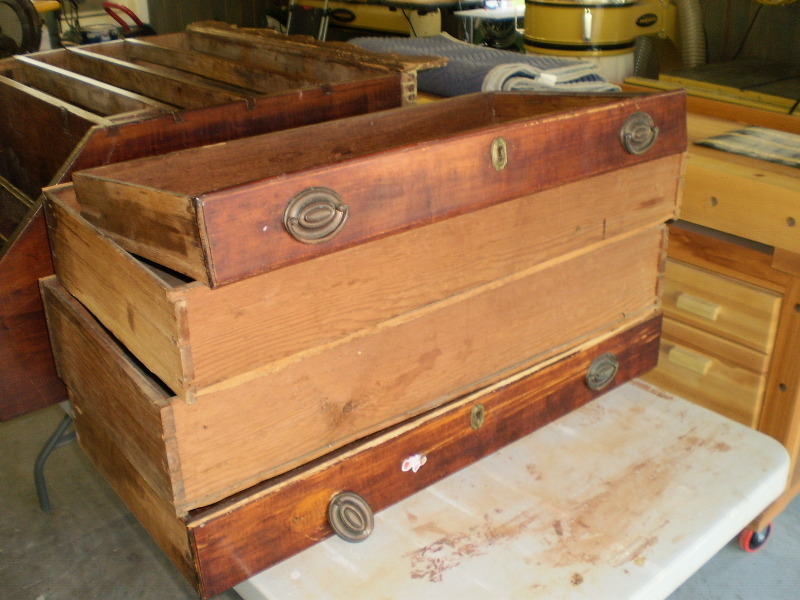 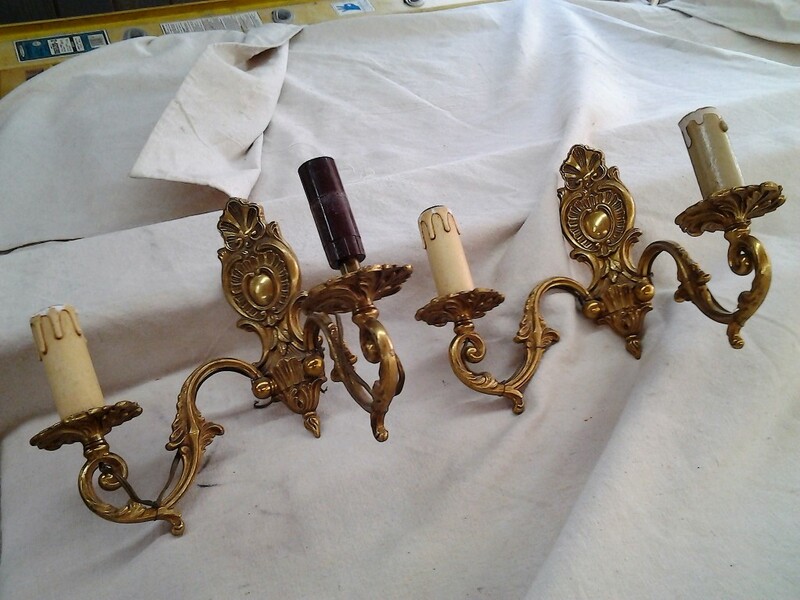 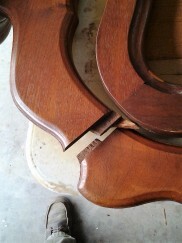 These are 3 pieces of a bedroom suite that needed restoration. 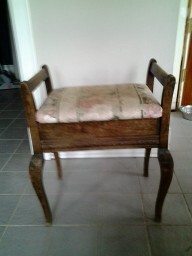 This heirloom was from around 1950, although it might be older than that. 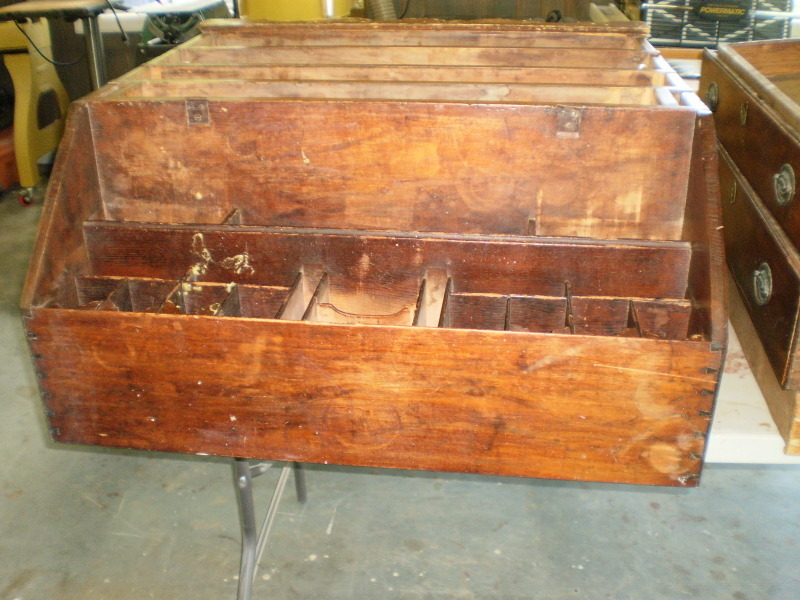 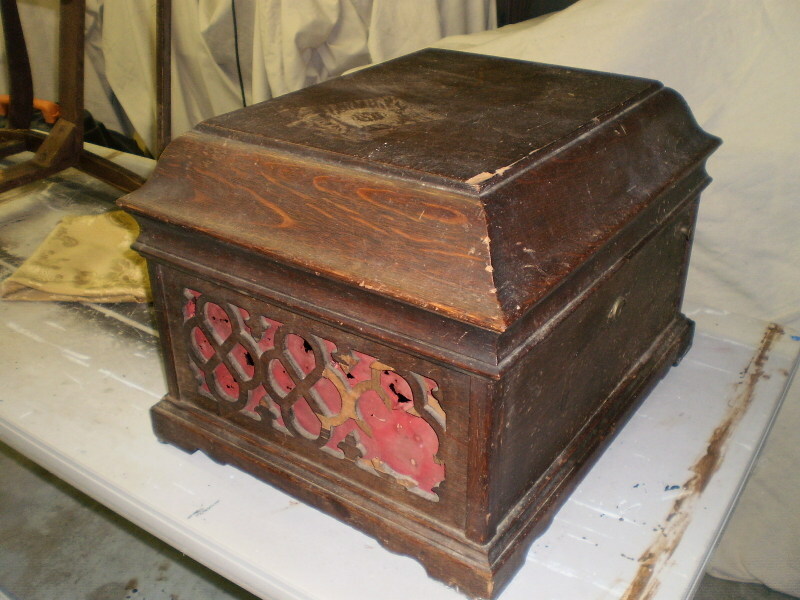 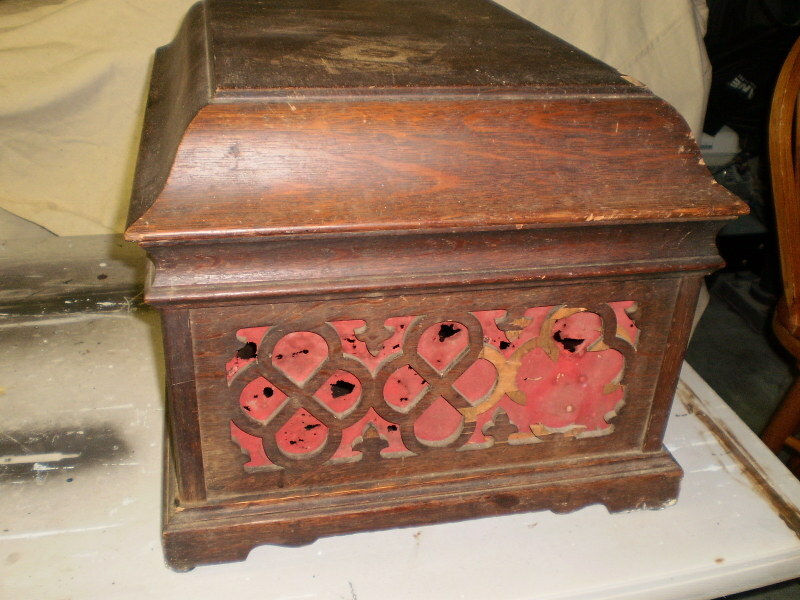 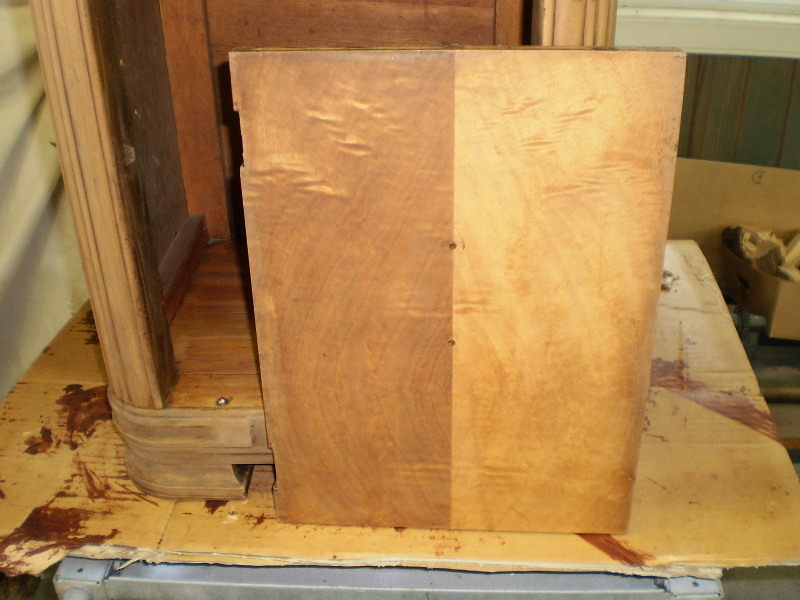 It was heavily coated with shellac but in good condition structurally and needed a sympathetic restoration. 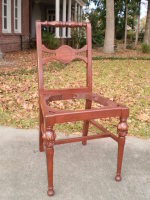 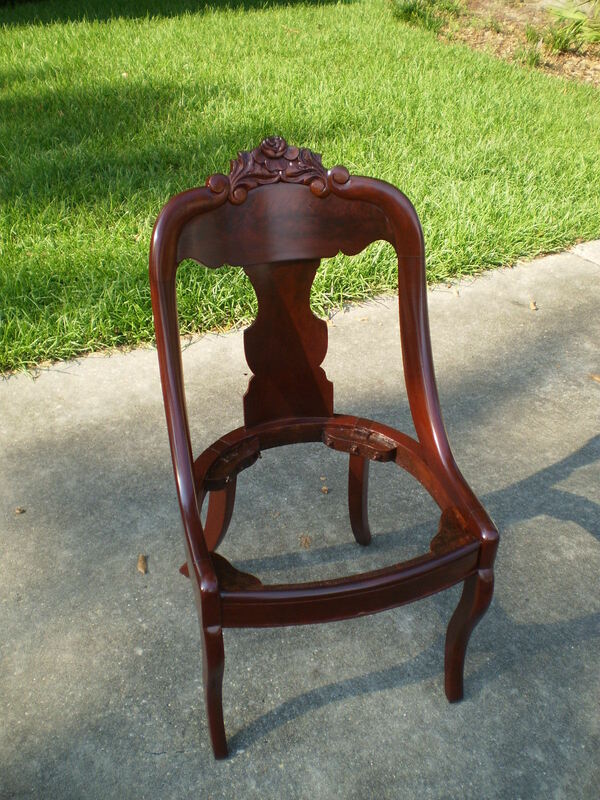 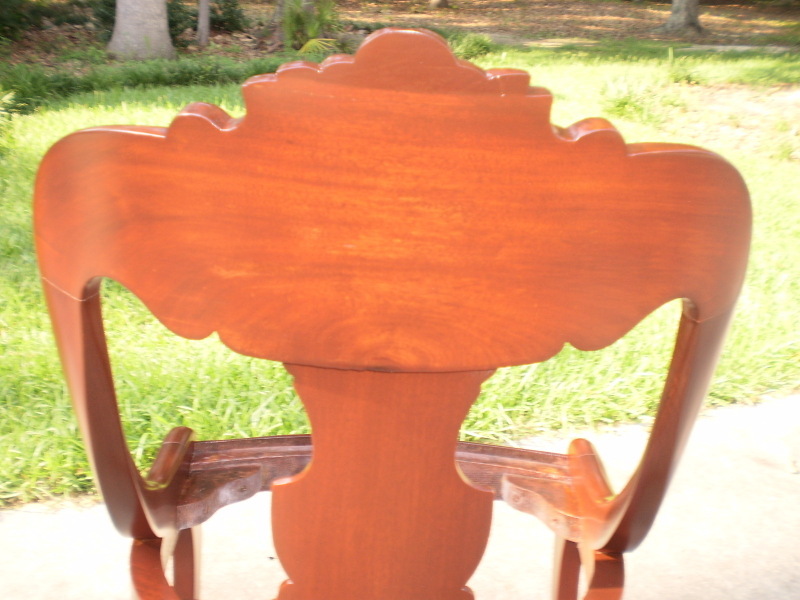 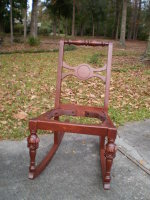 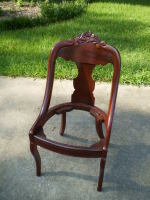 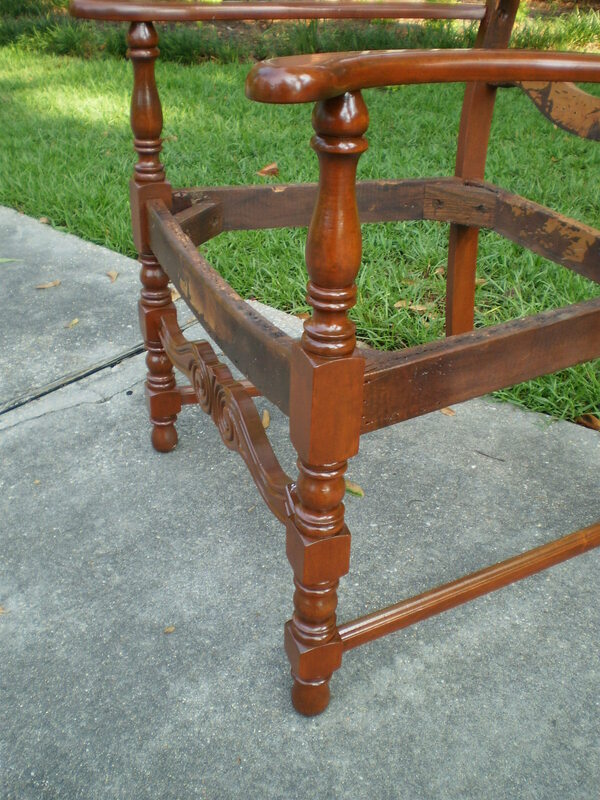 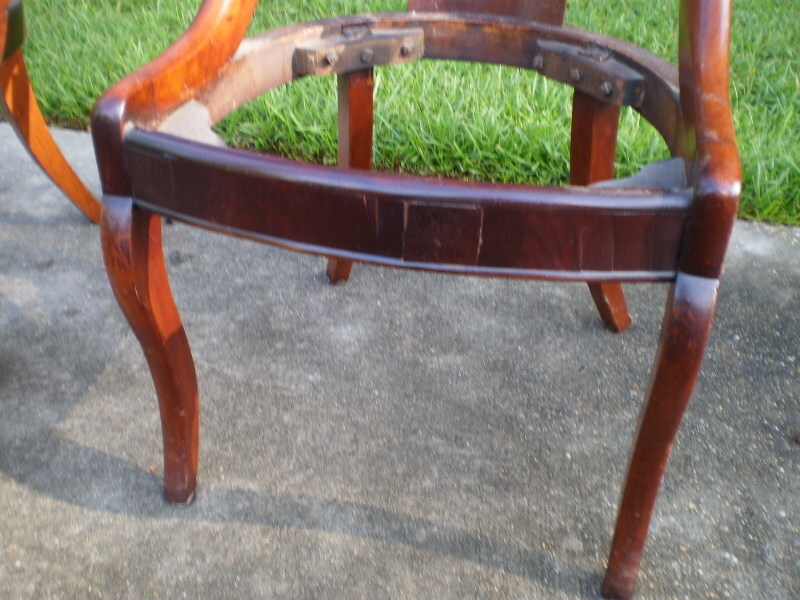 These antique mahogany dining room chairs needed some repairs as well as refinishing. 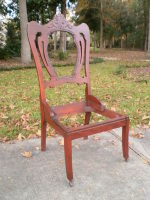 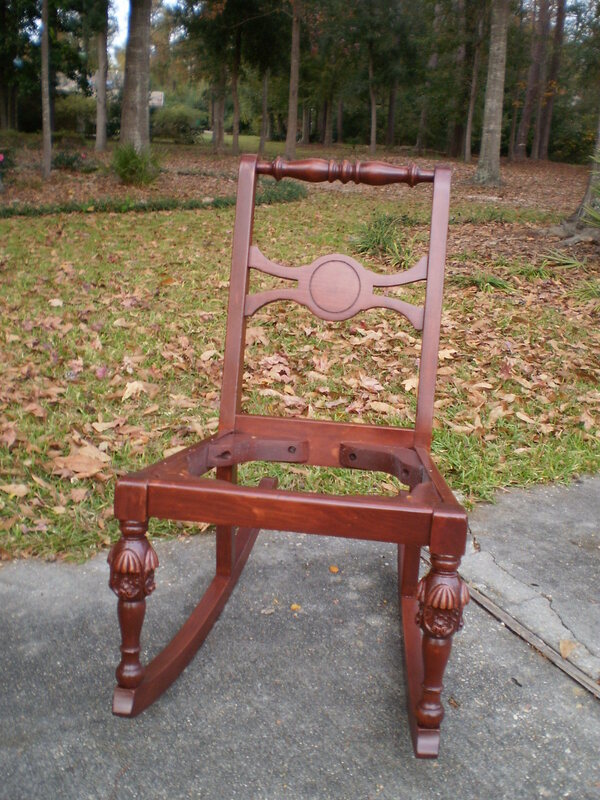 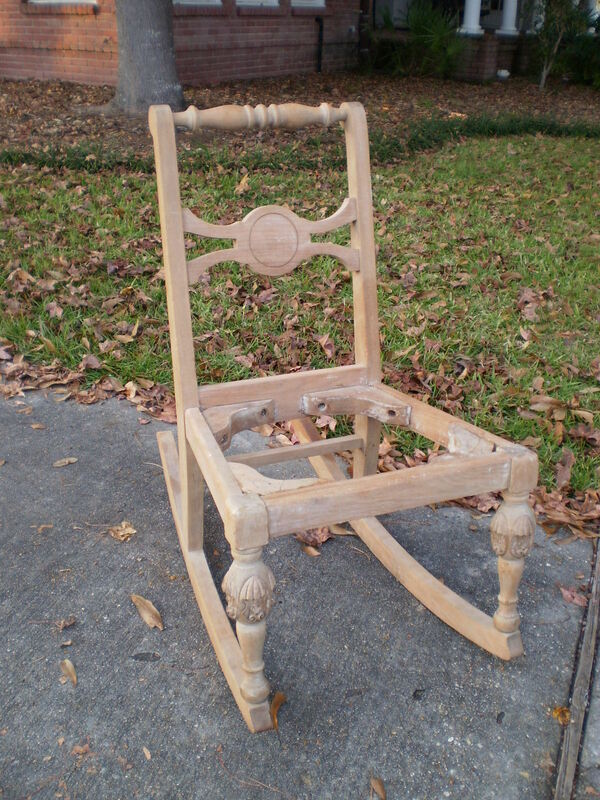 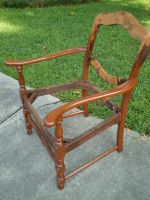 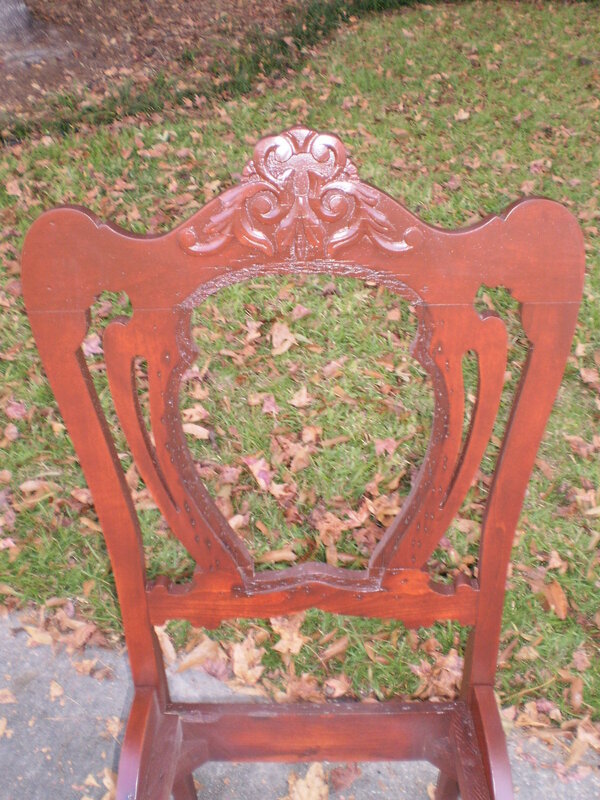 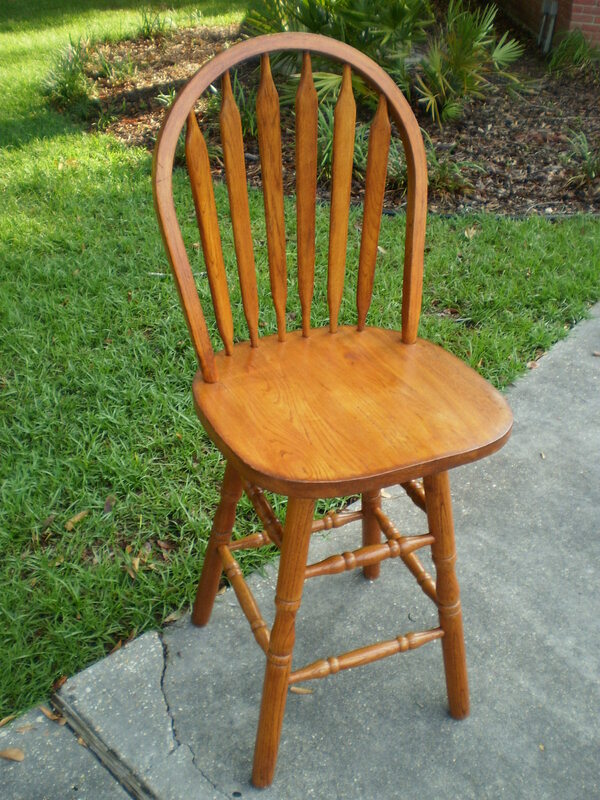 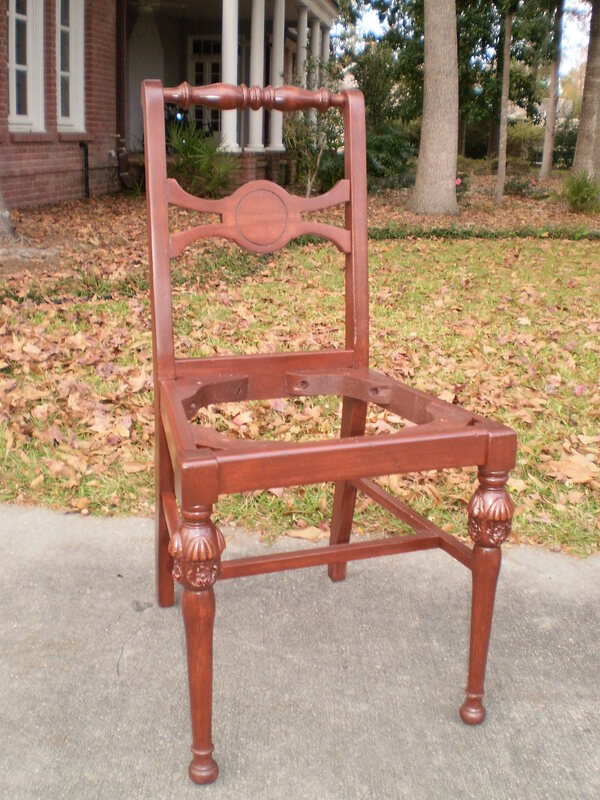 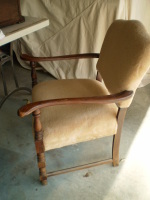 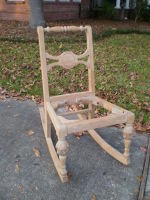 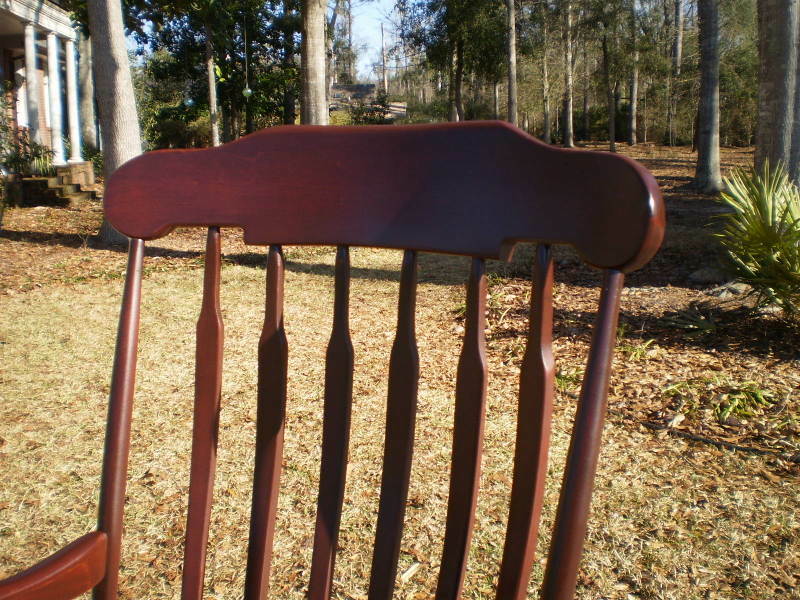 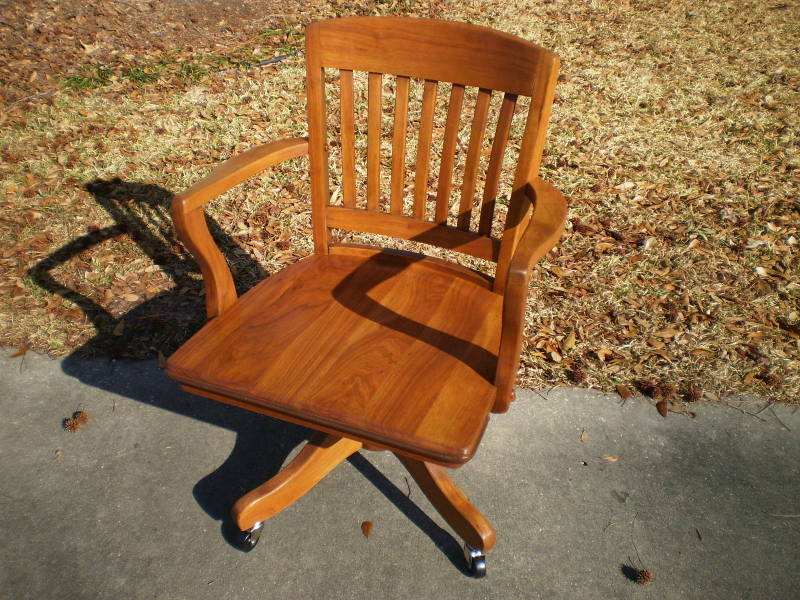 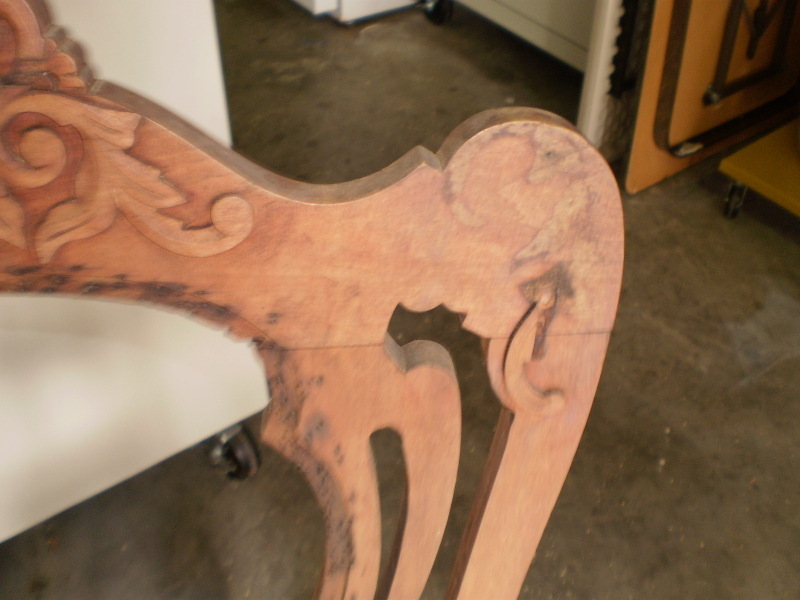 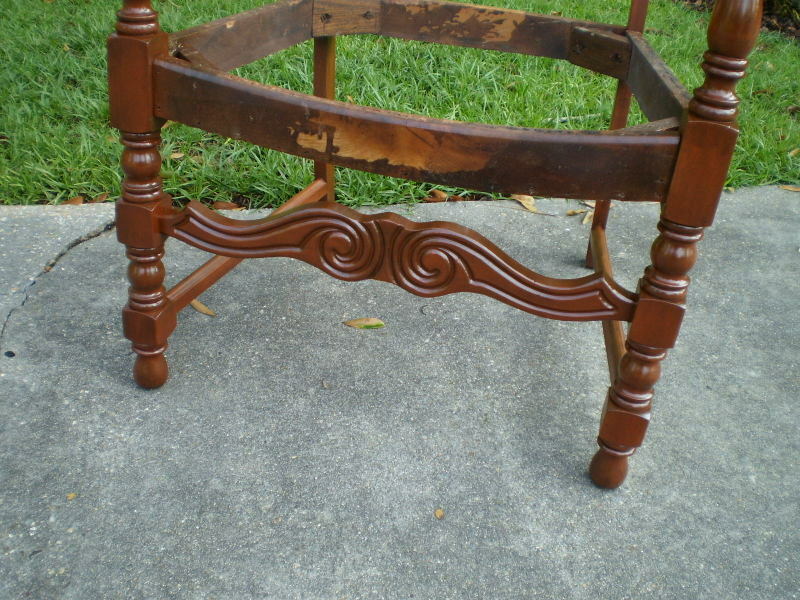 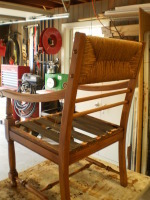 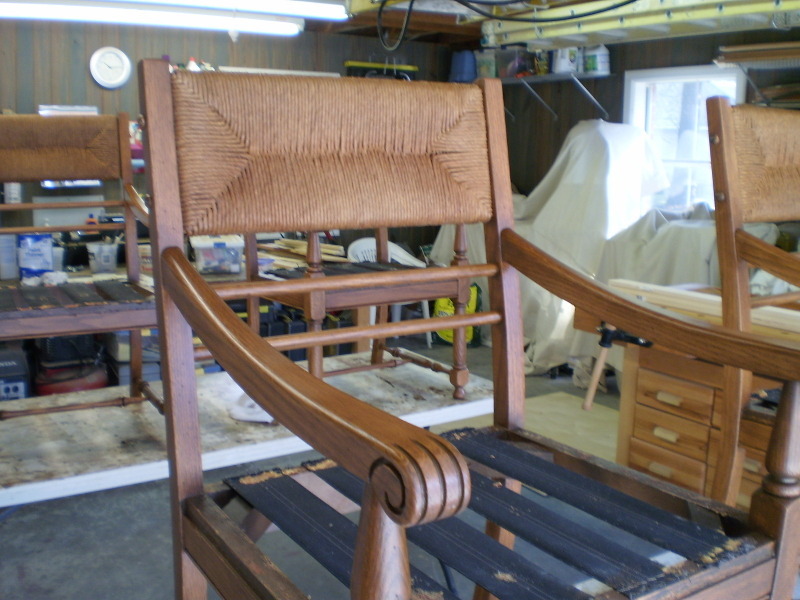 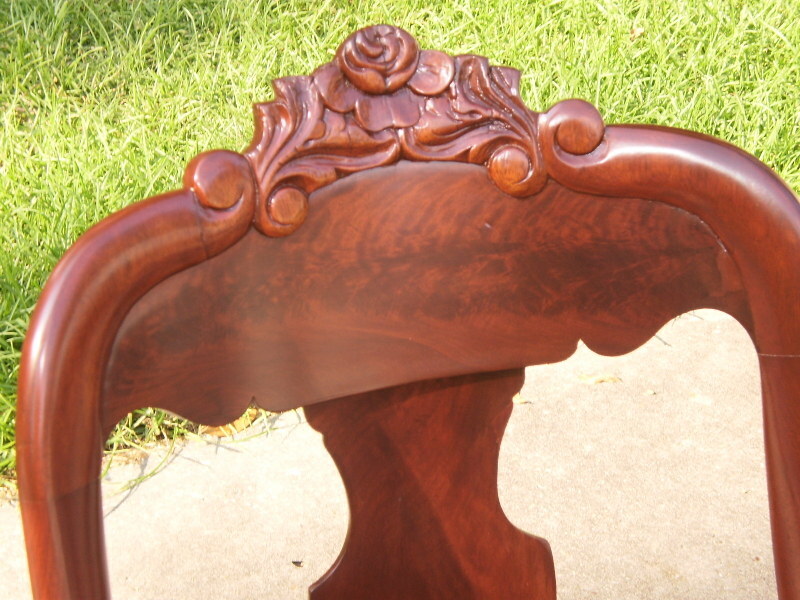 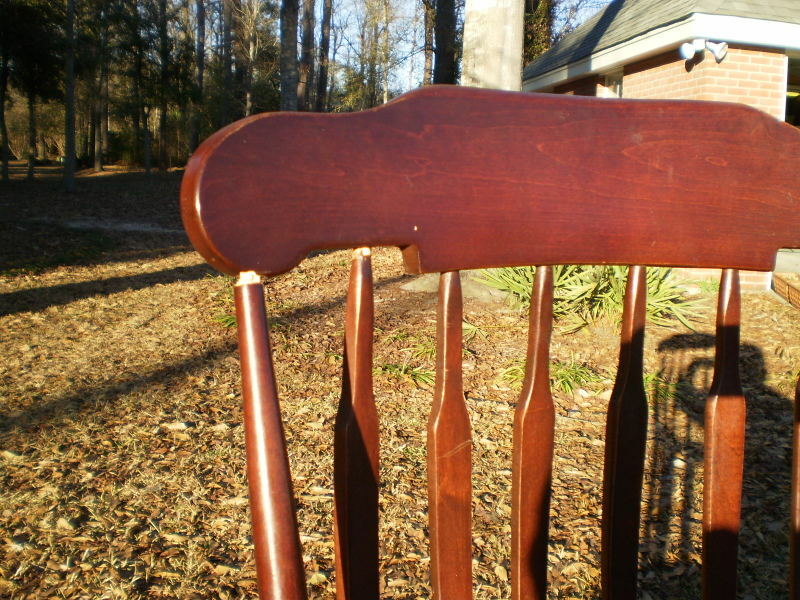 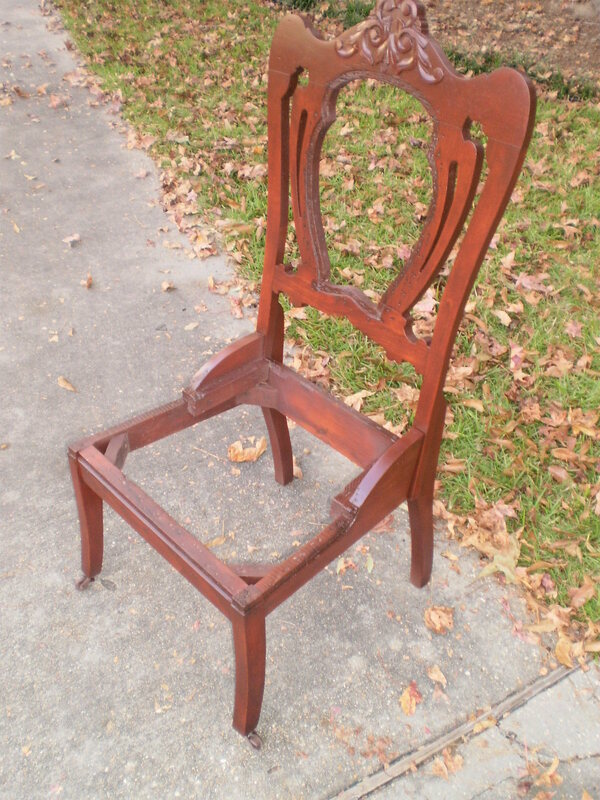 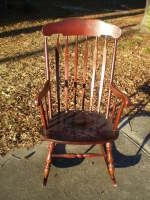 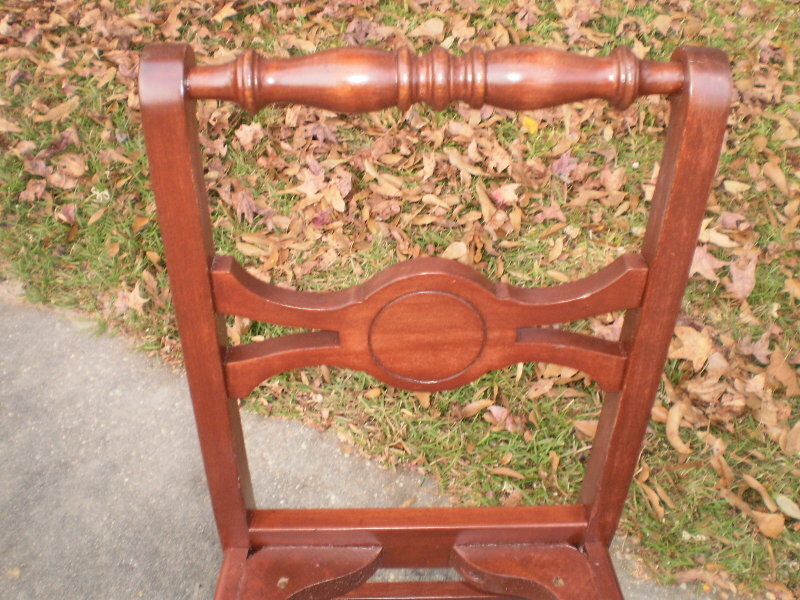 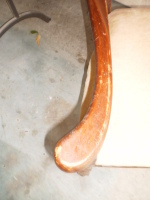 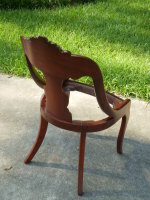 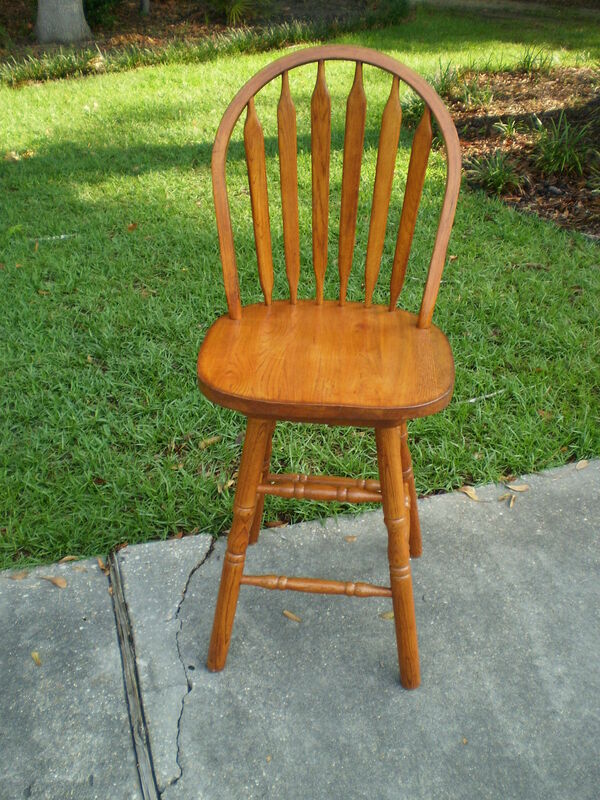 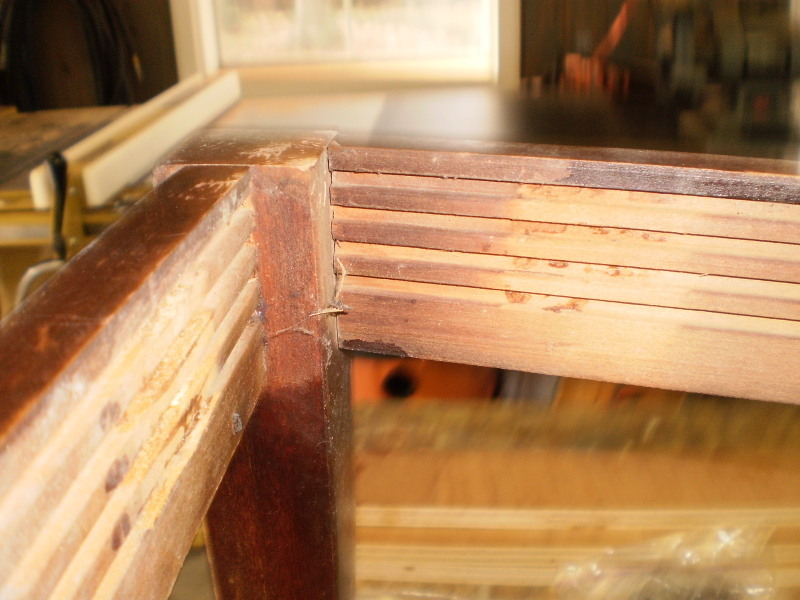 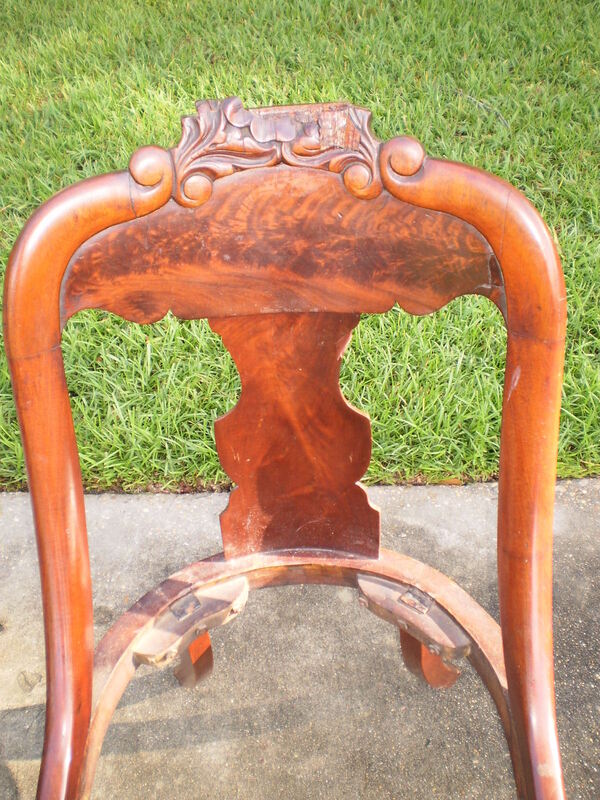 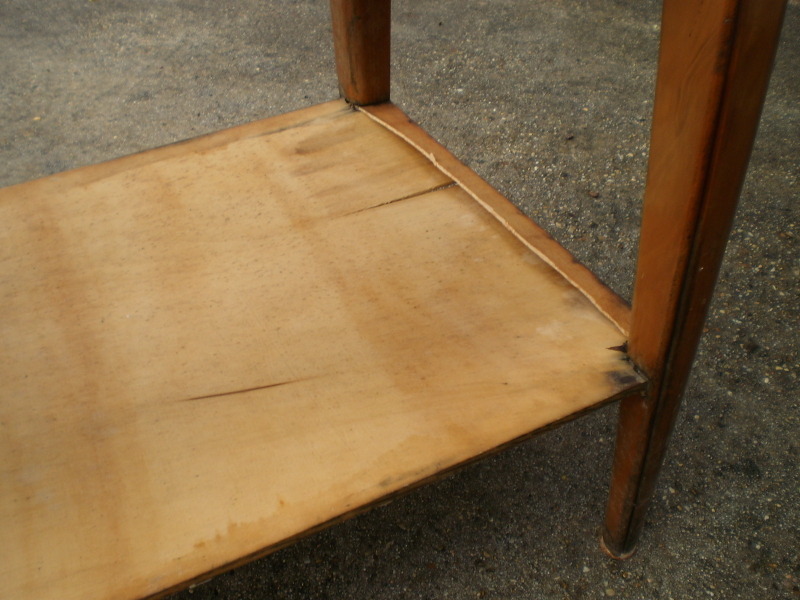 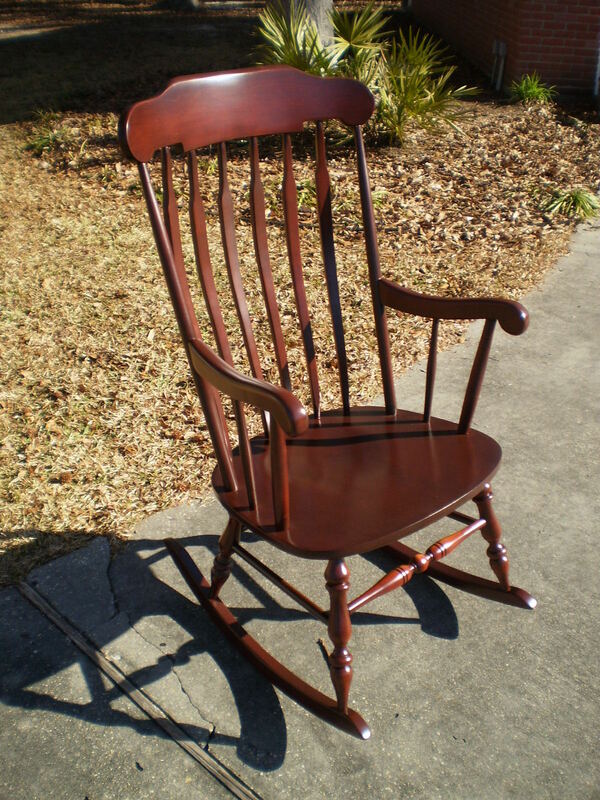 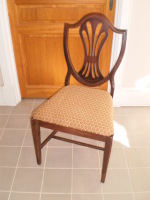 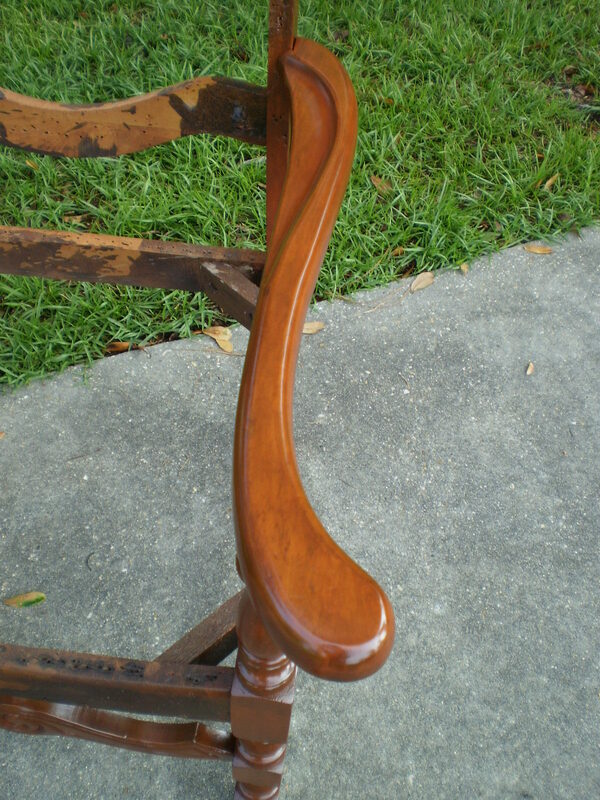 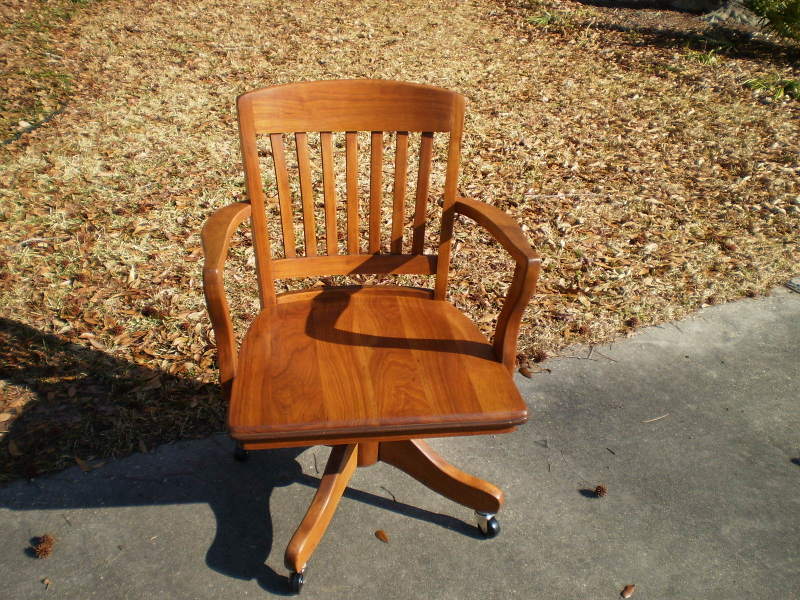 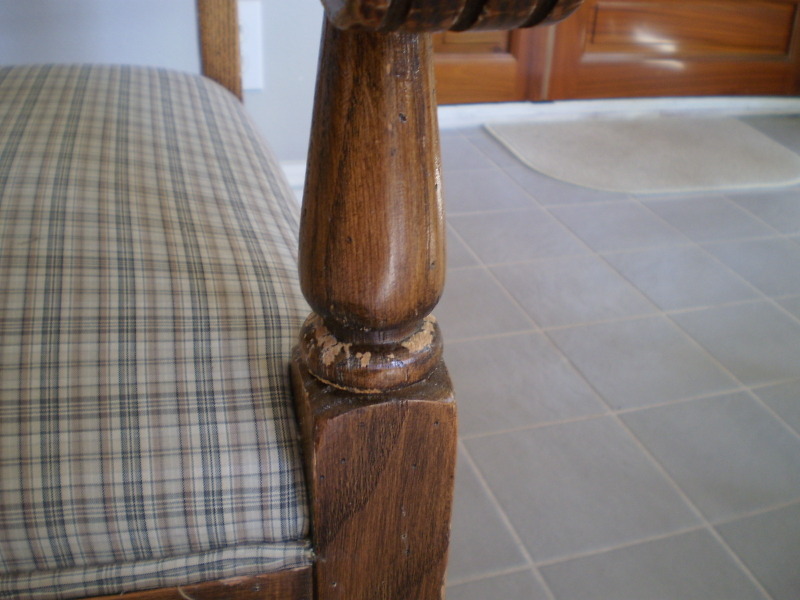 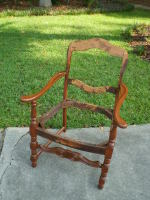 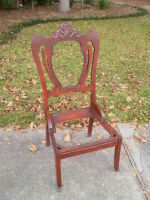 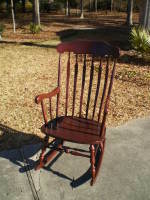 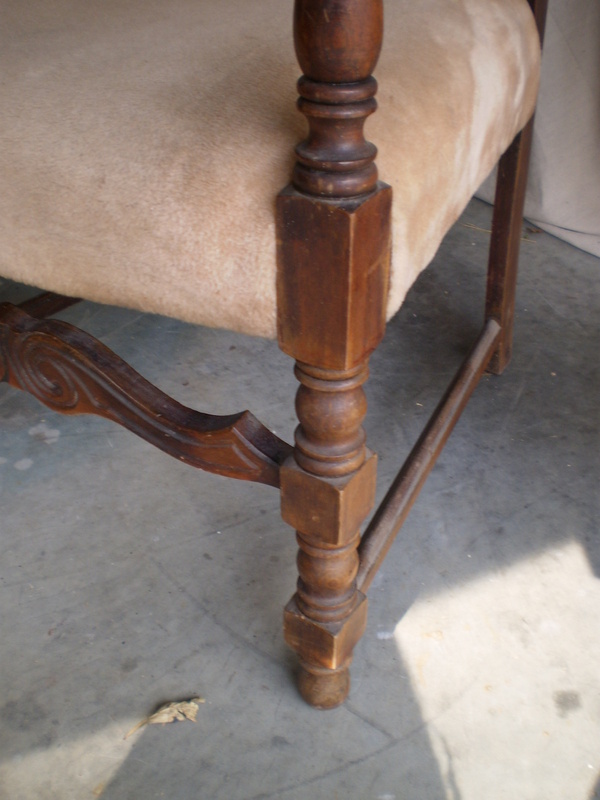 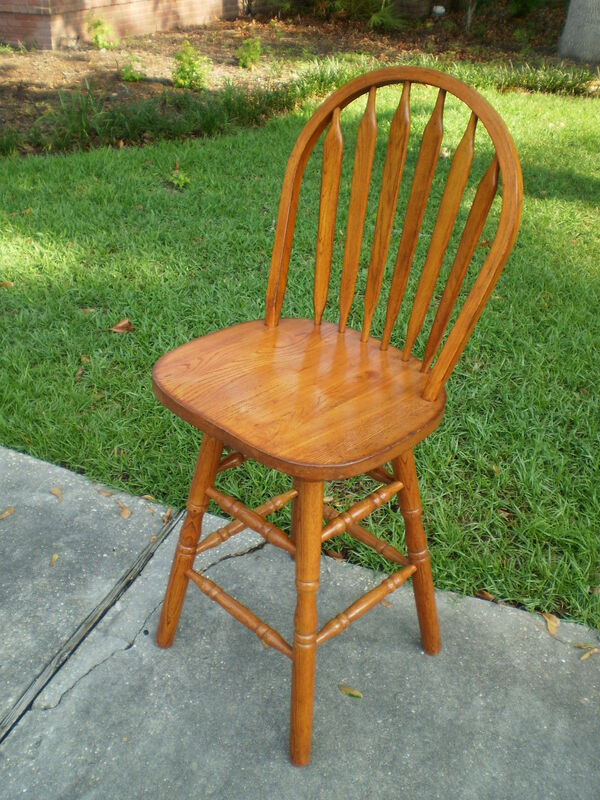 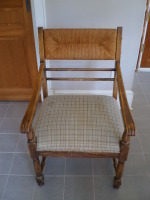 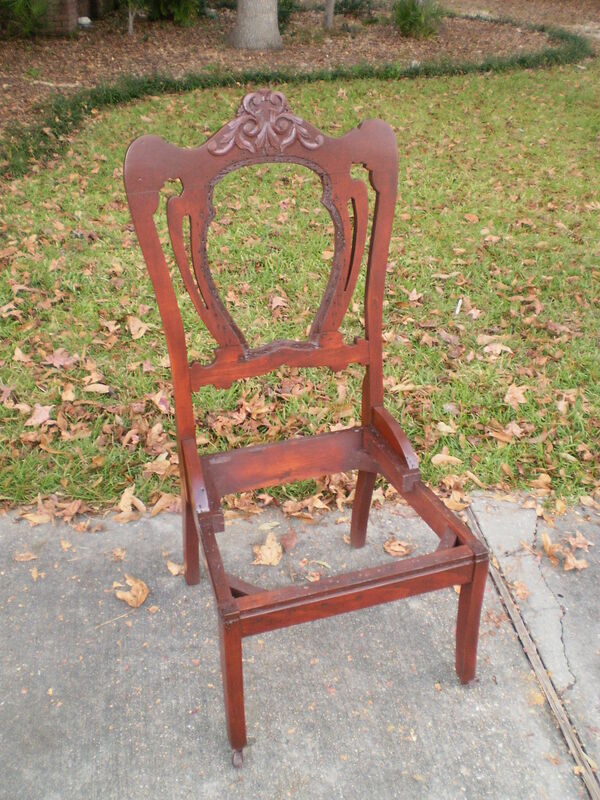 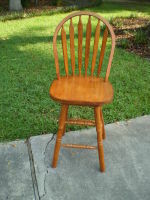 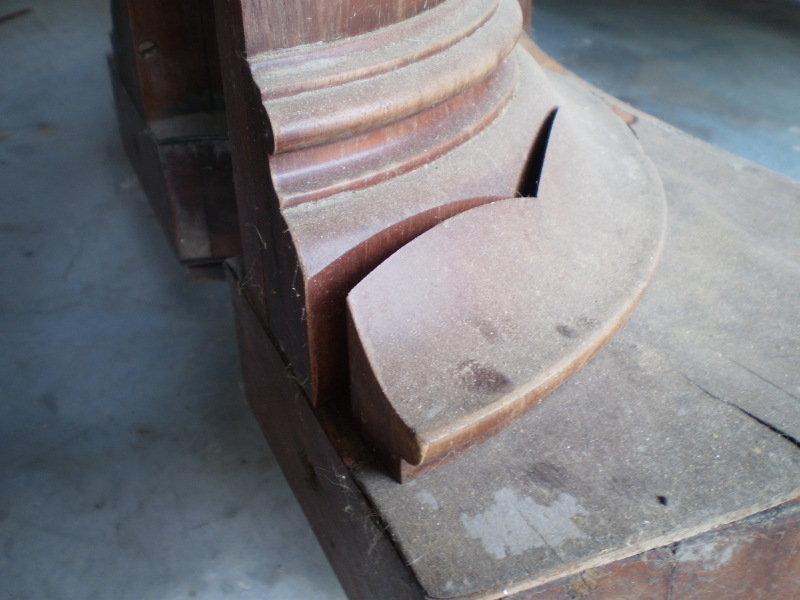 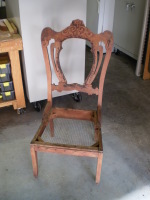 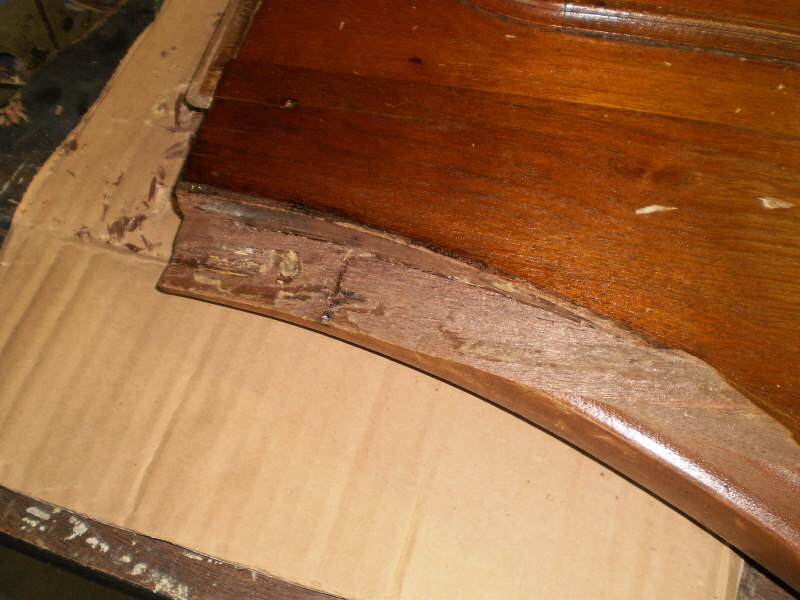 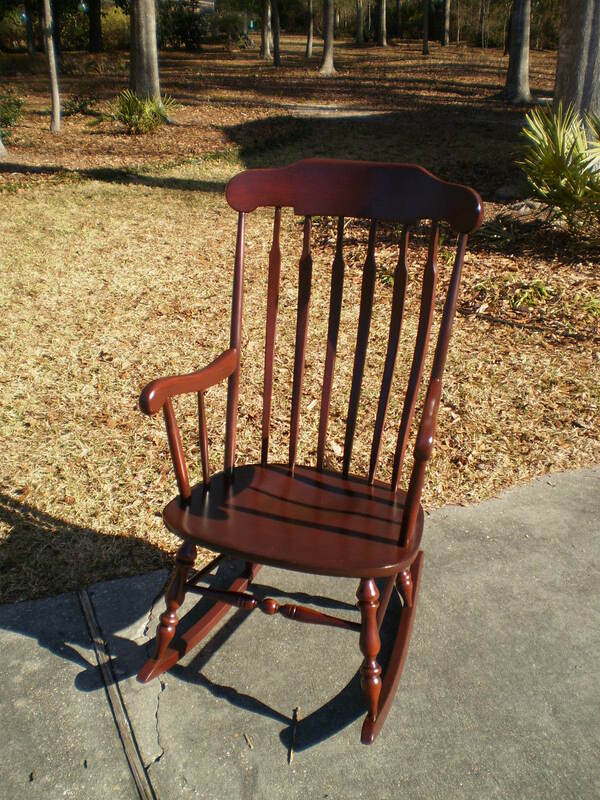 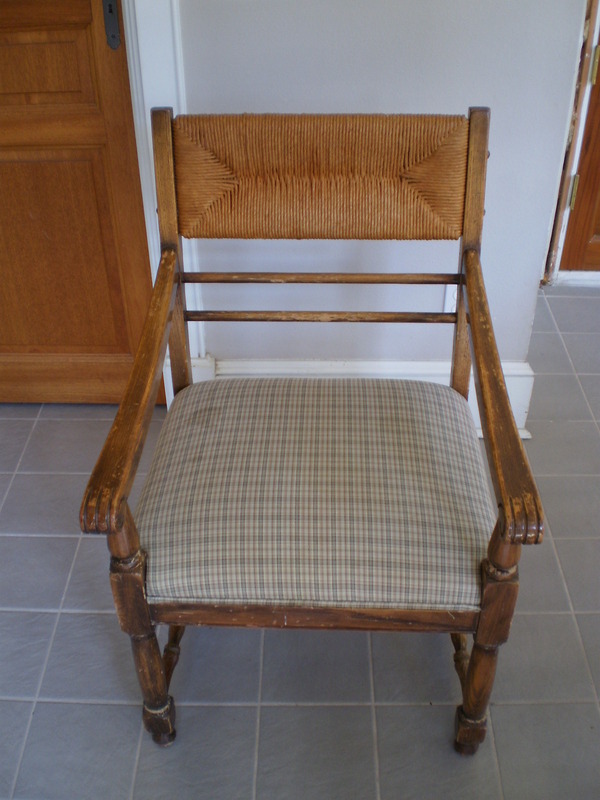 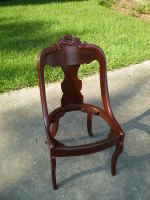 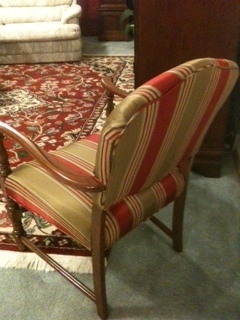 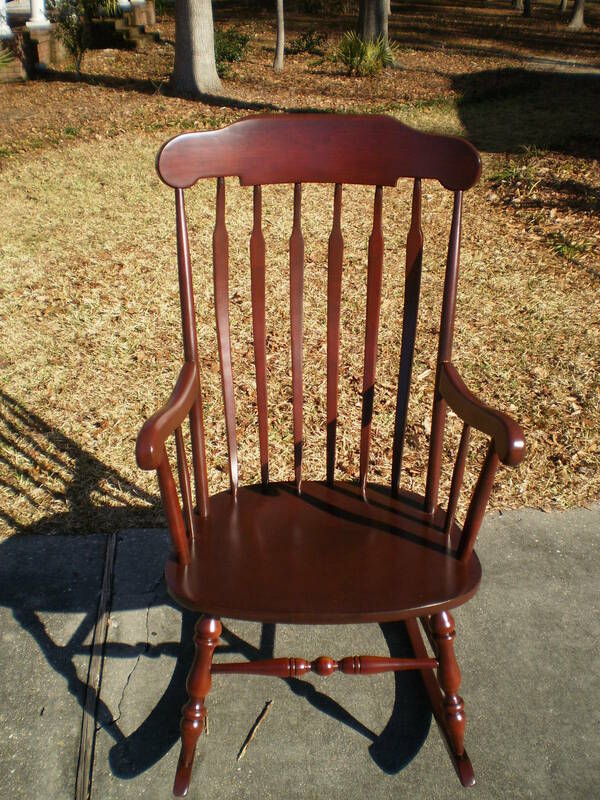 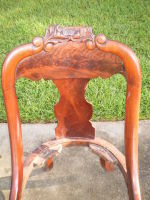 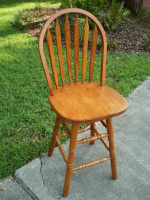 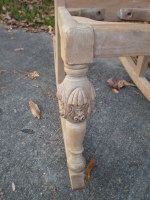 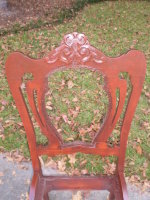 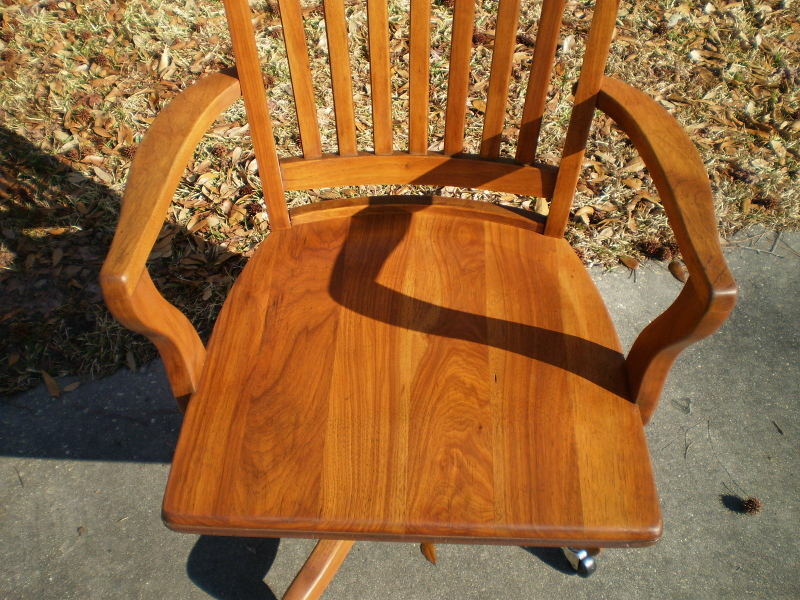 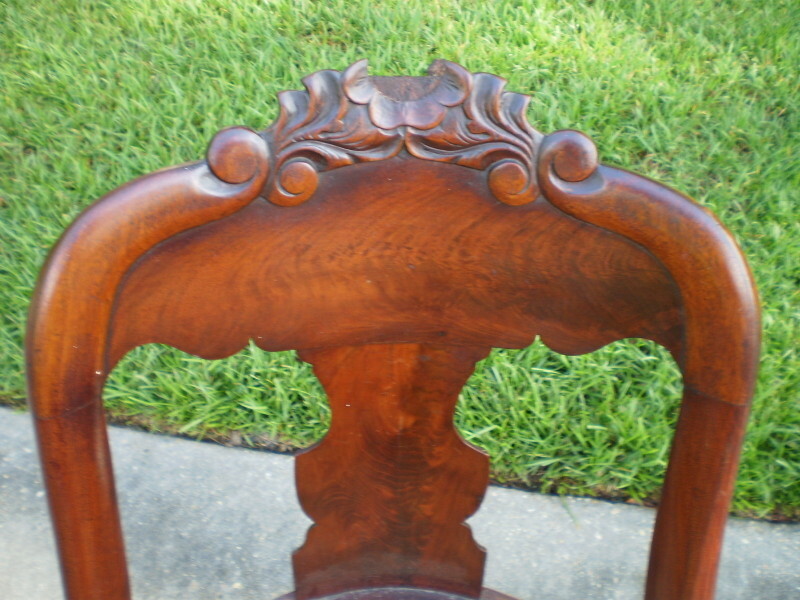 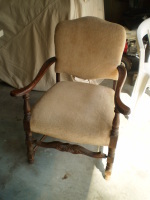 The front veneer had been replaced at one time and did not match the rest of the chair. 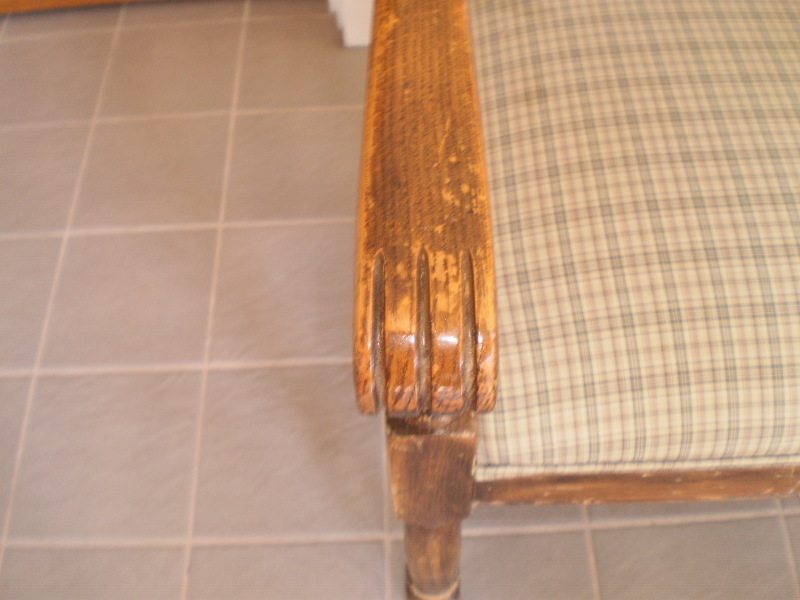 This was carefully replaced to ensure all chairs matched and then gently refinished. 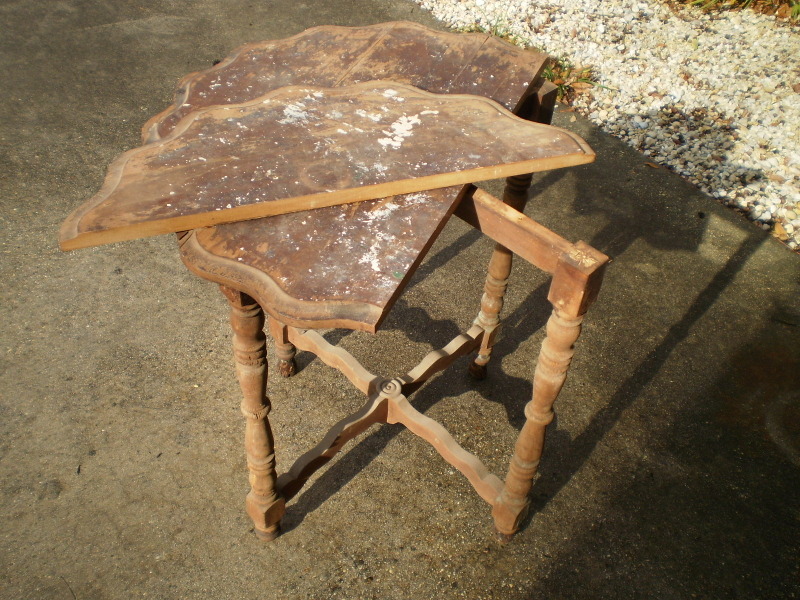 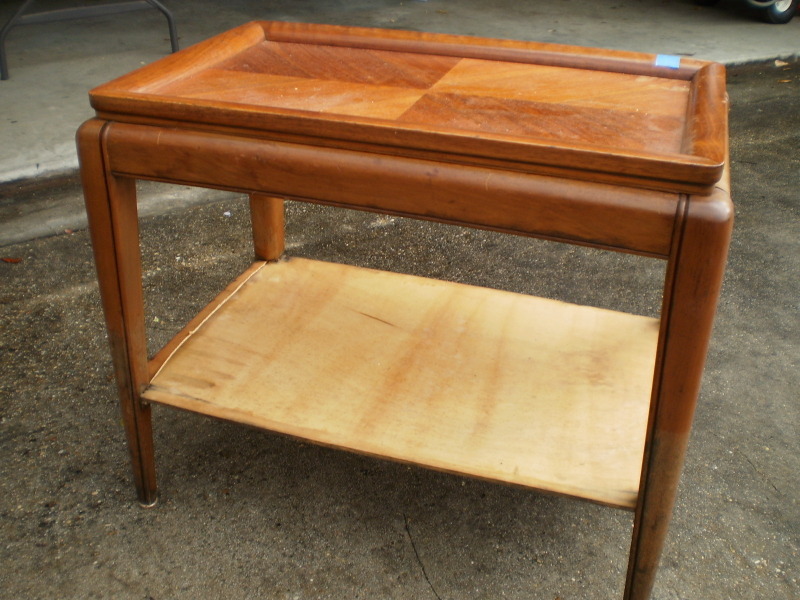 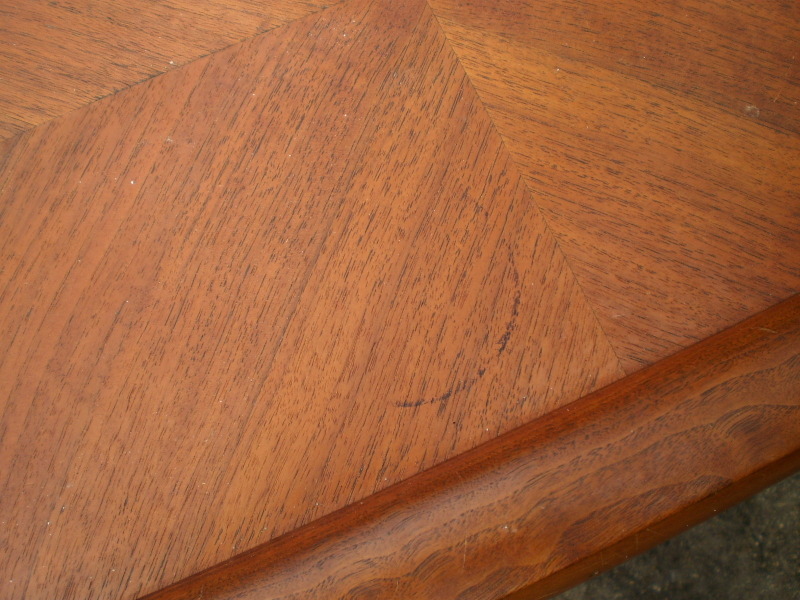 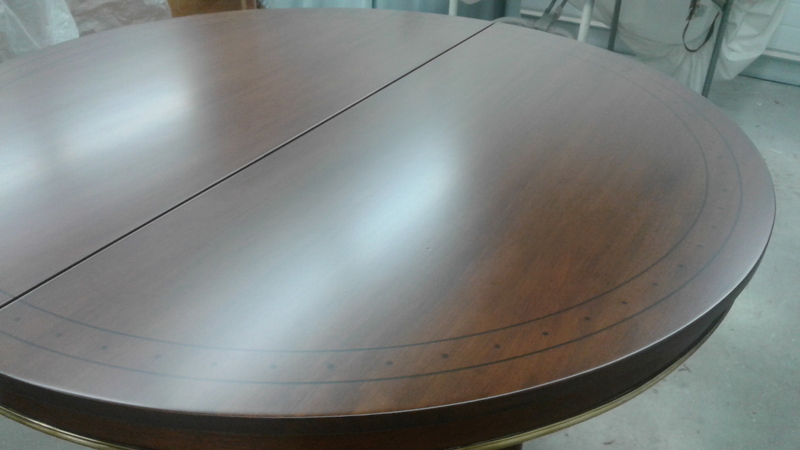 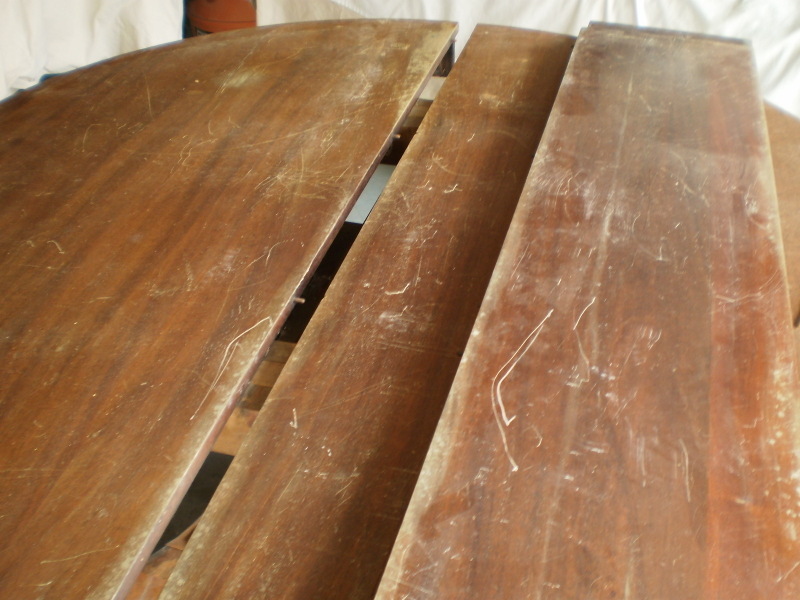 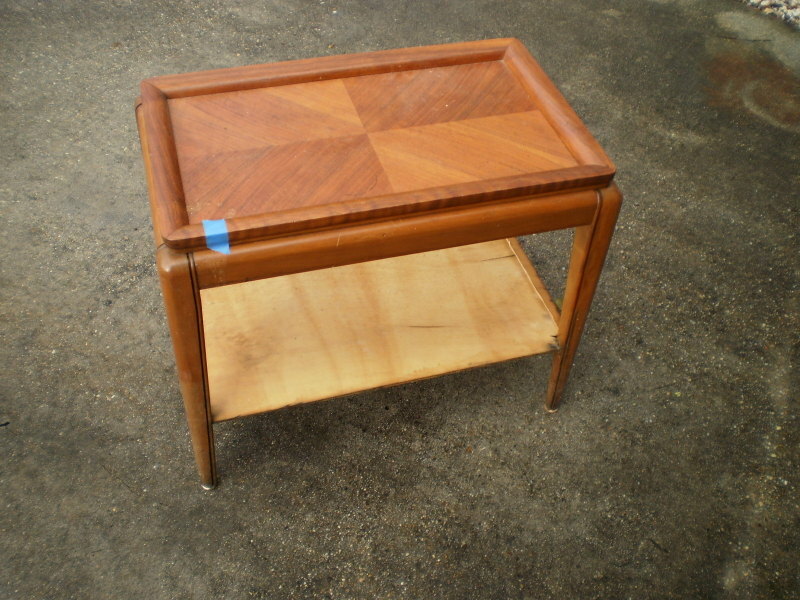 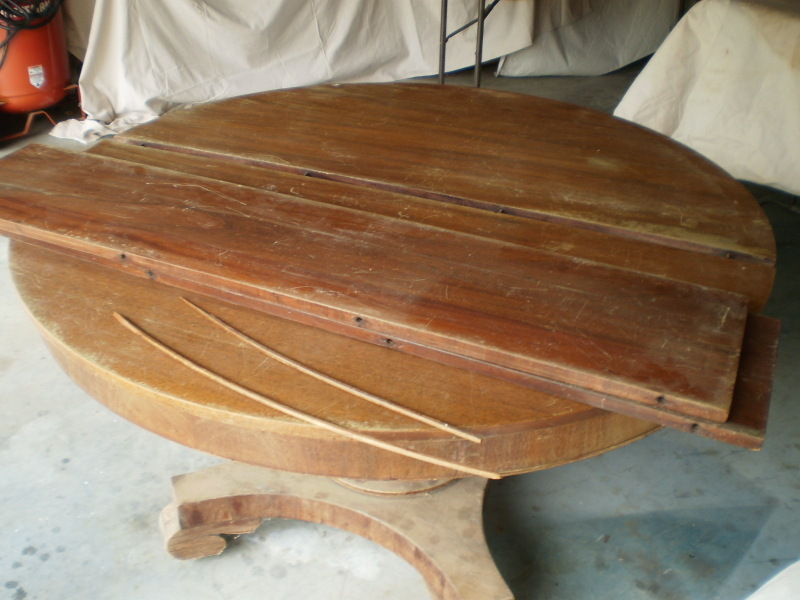 The customer had this well constructed table but the original coating was showing its age. 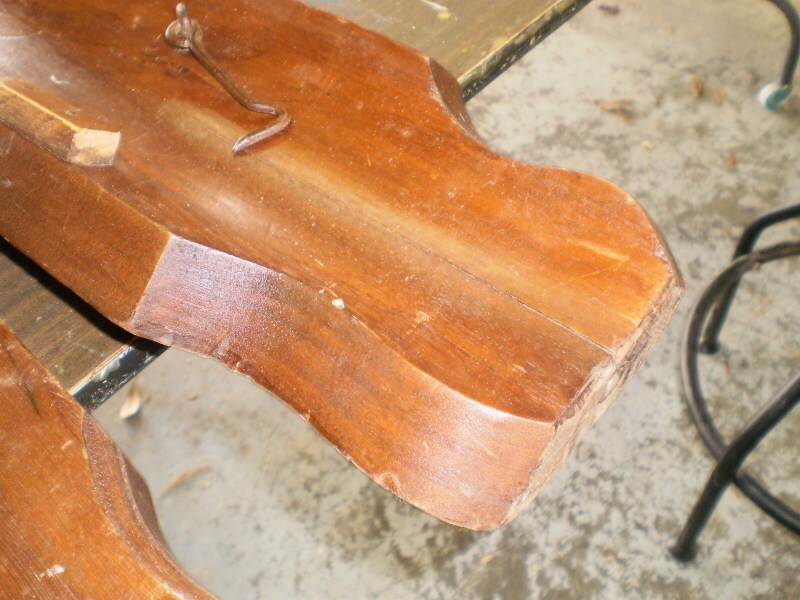 There were also a few scratches that had to be removed. 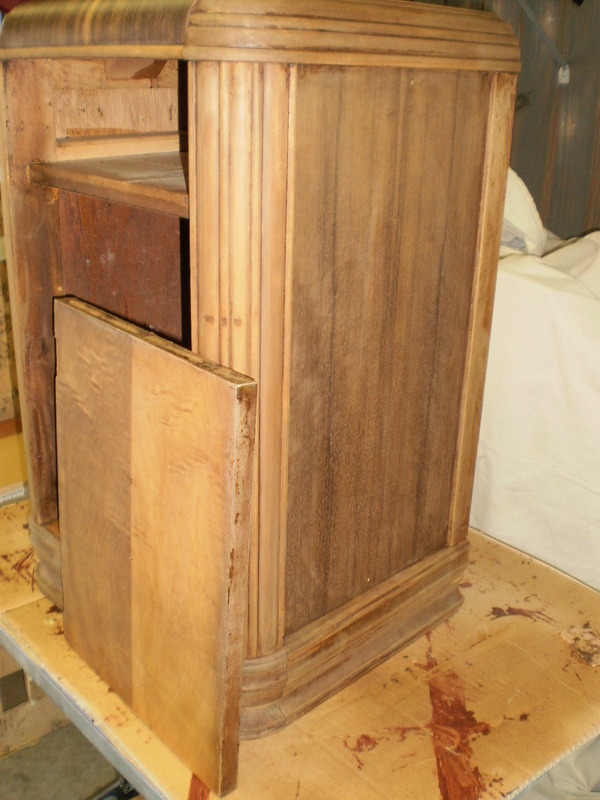 I stripped only the top and then matched the stain of the apron and then refinished with conversion varnish. 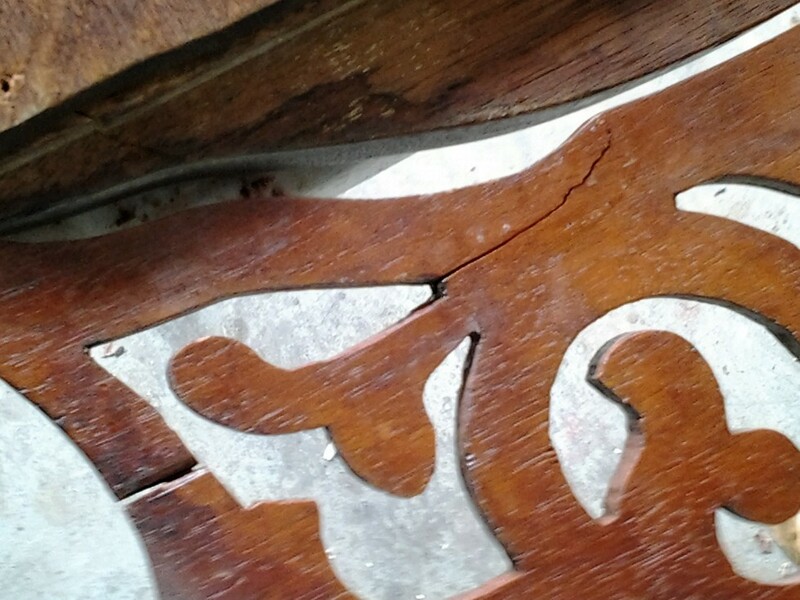 These pieces were flooded during Hurricane Issach. 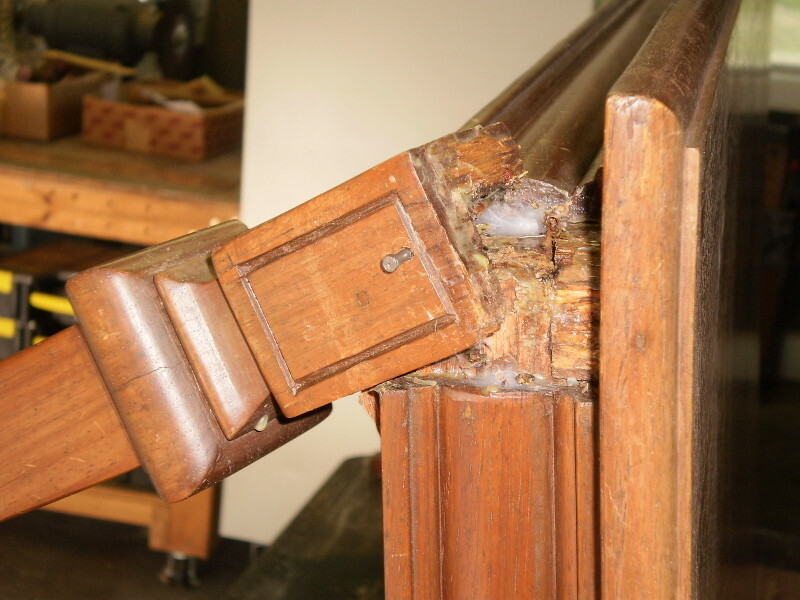 They had to be completely disassembled, fixed, and put back together before the wood was carefully restored and refinished back to its best. 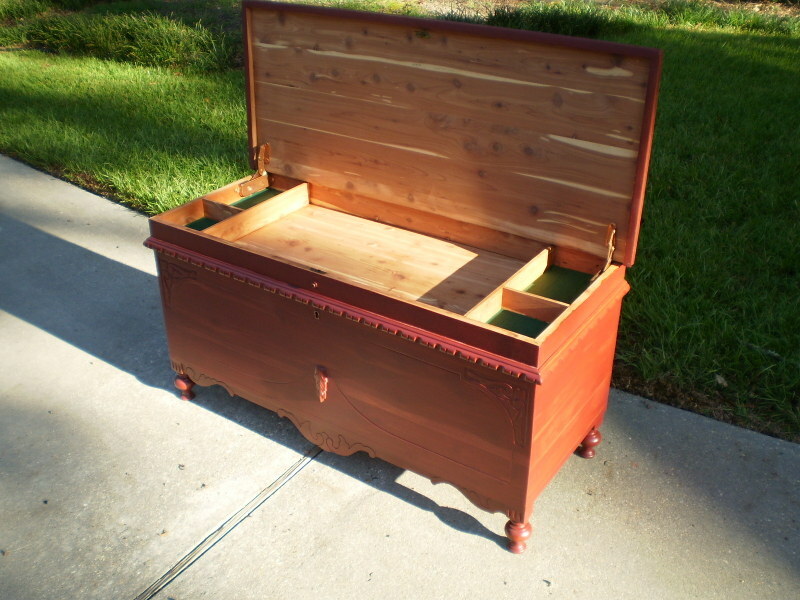 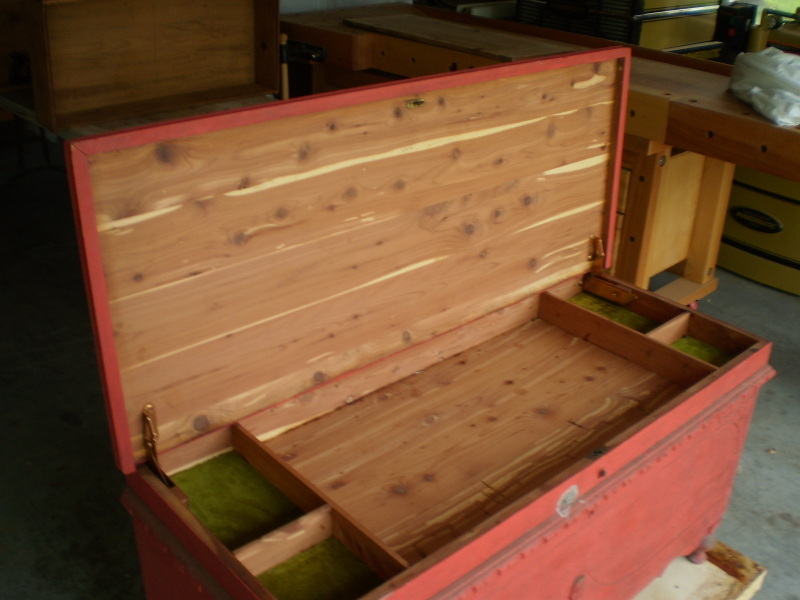 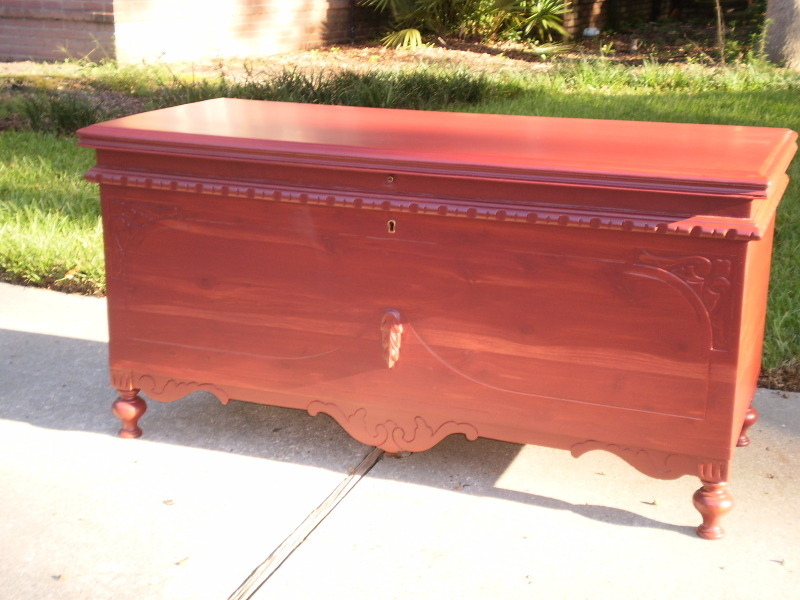 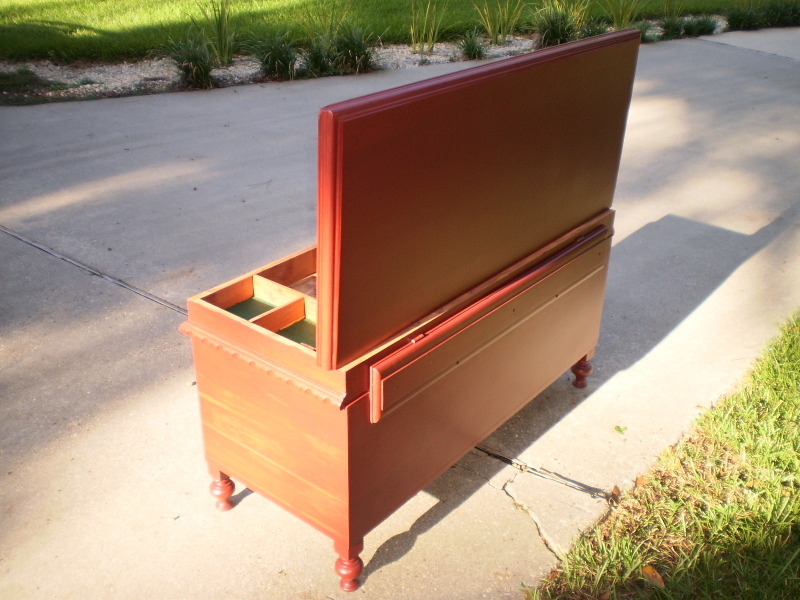 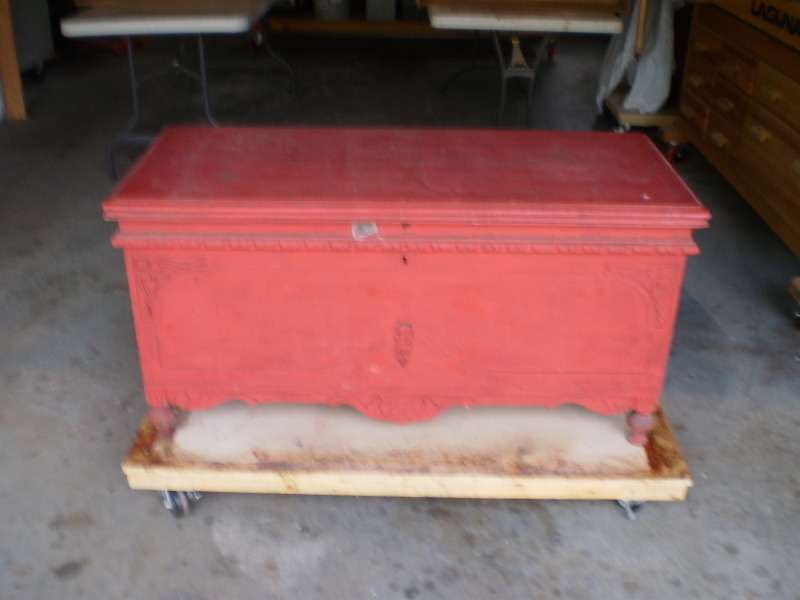 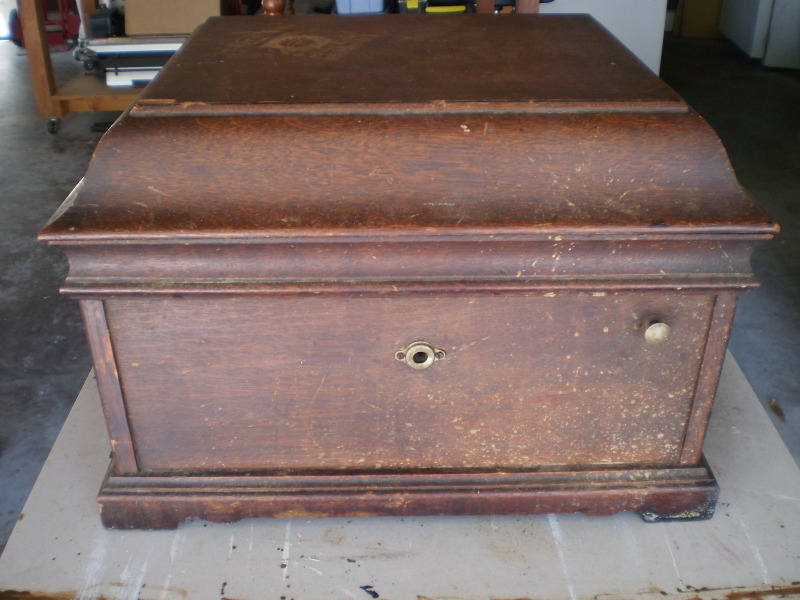 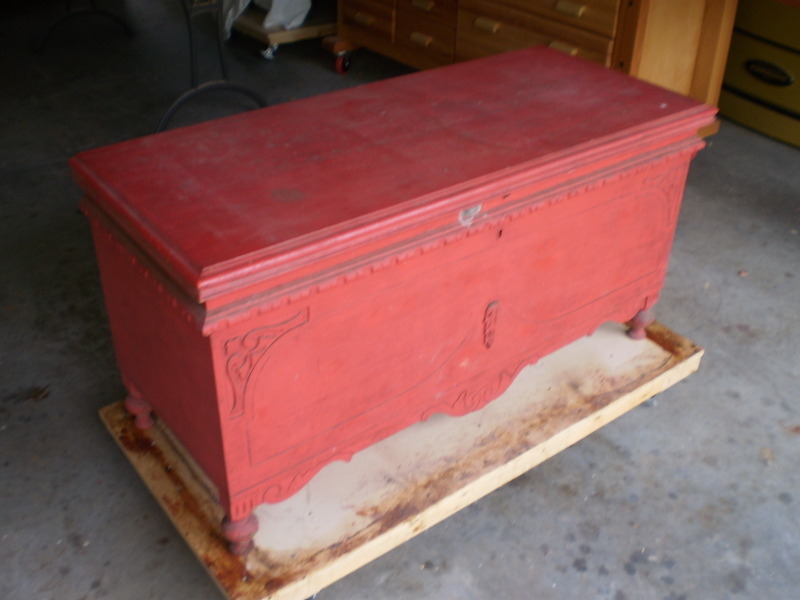 This is a antique cedar chest that was painted at one time. 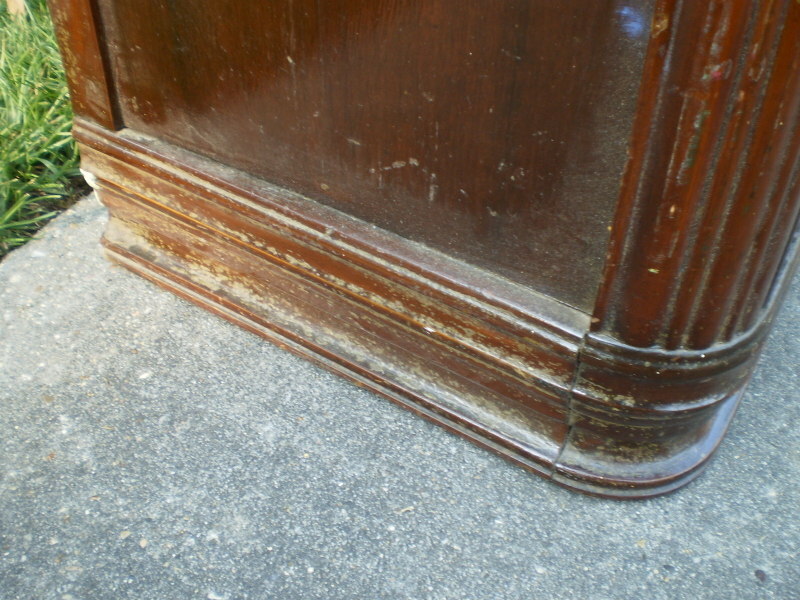 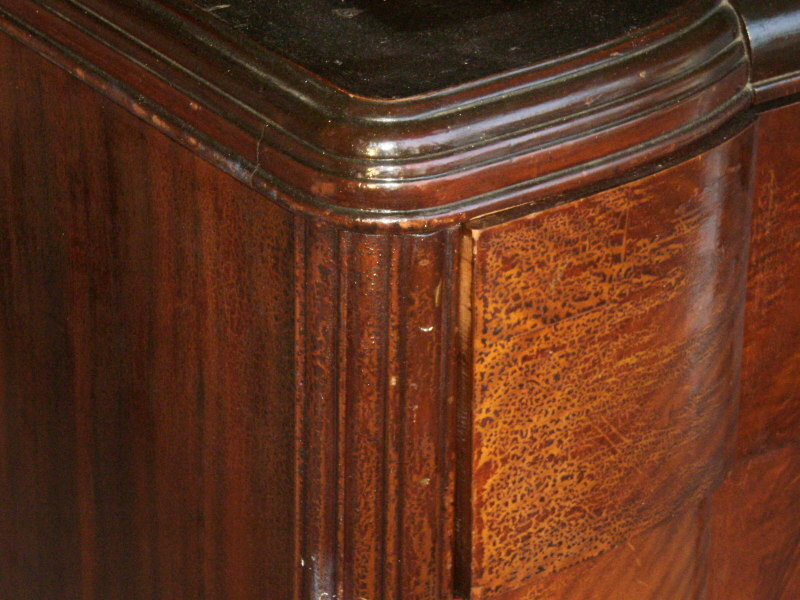 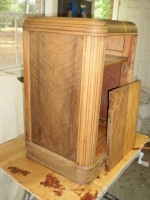 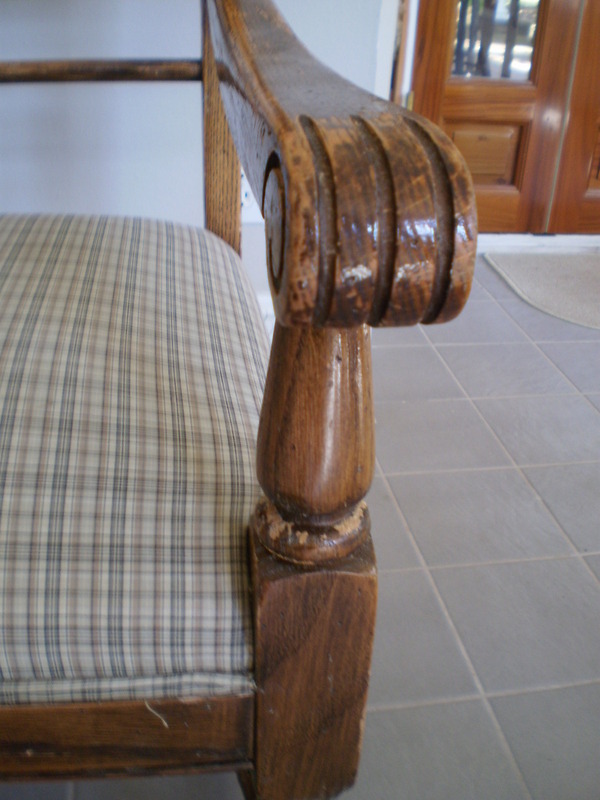 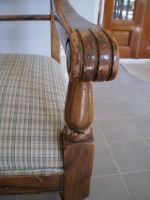 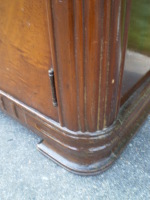 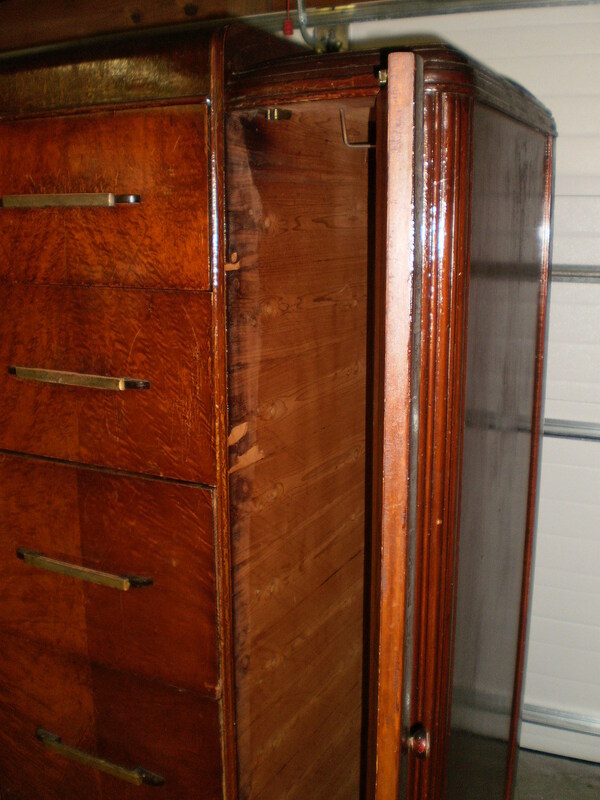 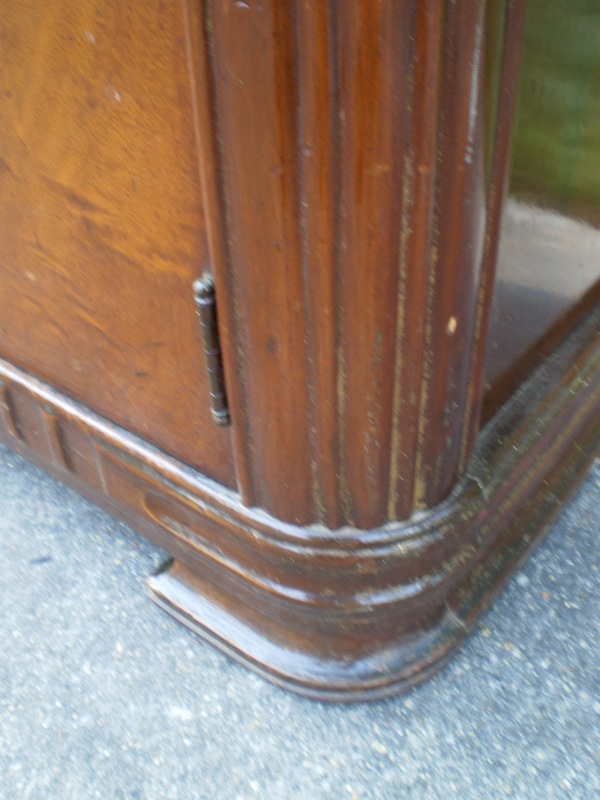 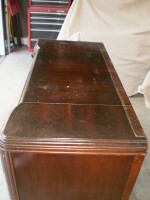 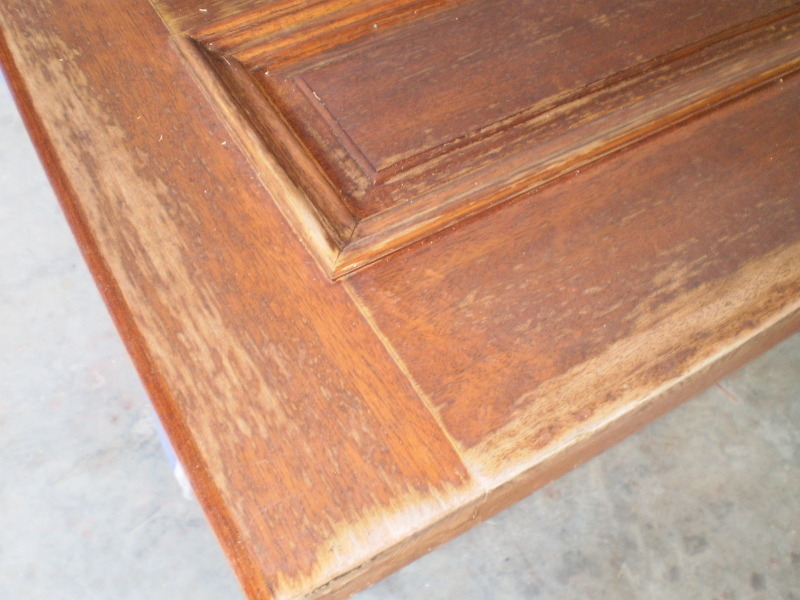 The client wanted it restored to the natural wood finish. After stripping, sanding, staining and refinishing it is now in pride of place in the family home! 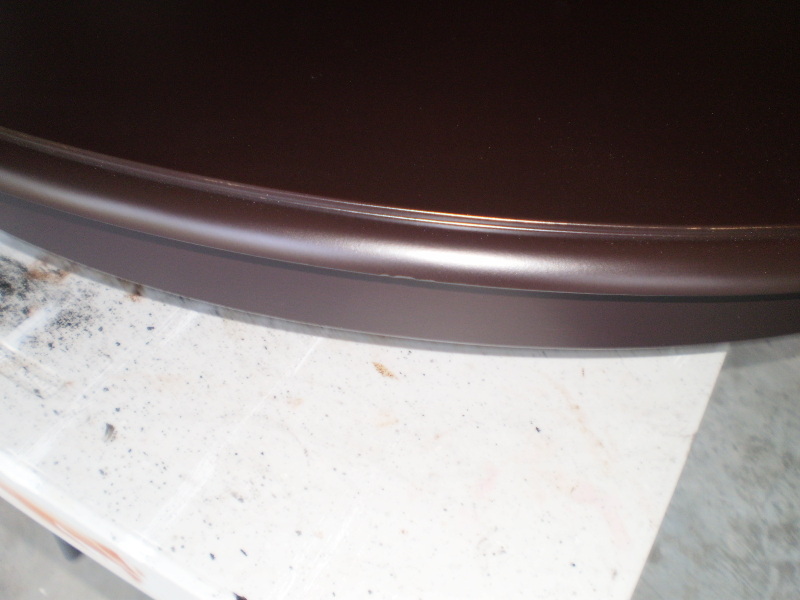 New felt was also applied. 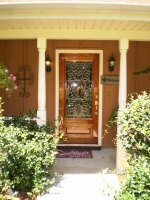 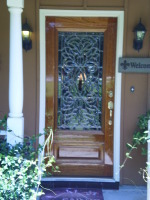 Refinished this beautiful Mahogany front door to withstand the best of Louisiana's rain and shine. 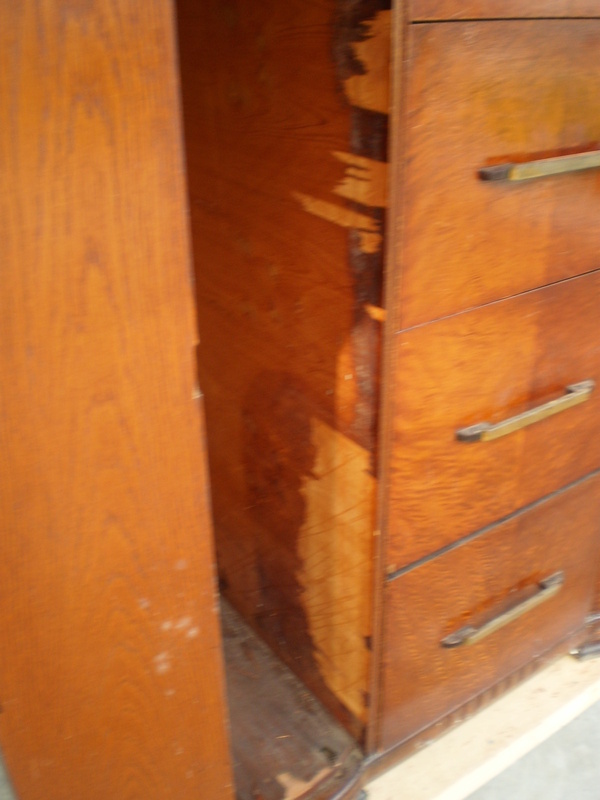 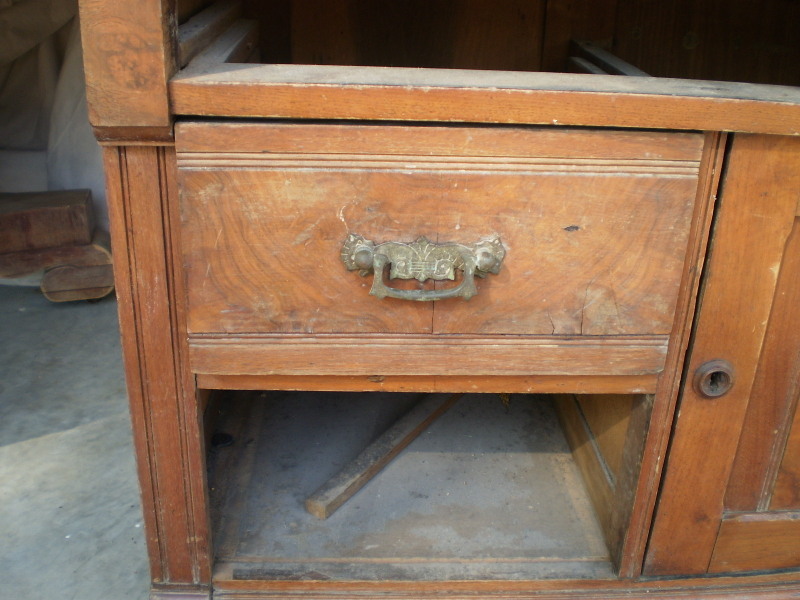 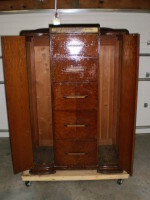 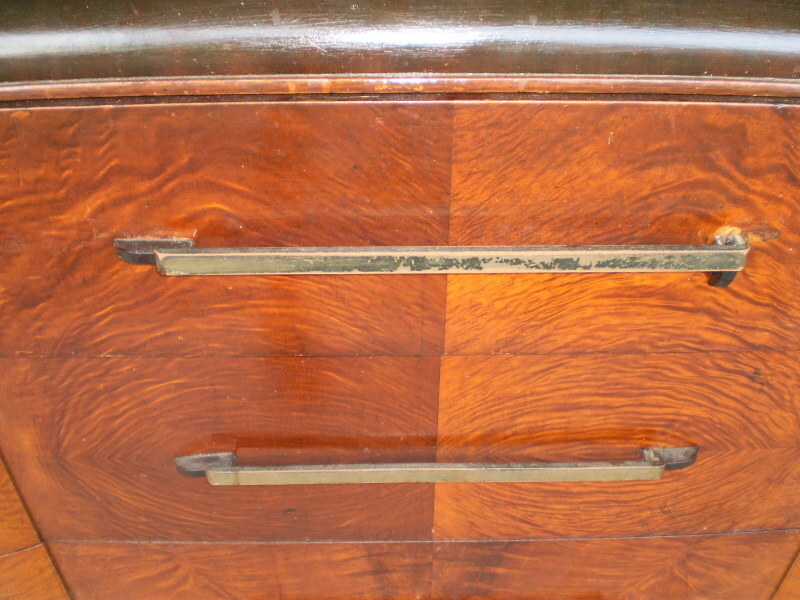 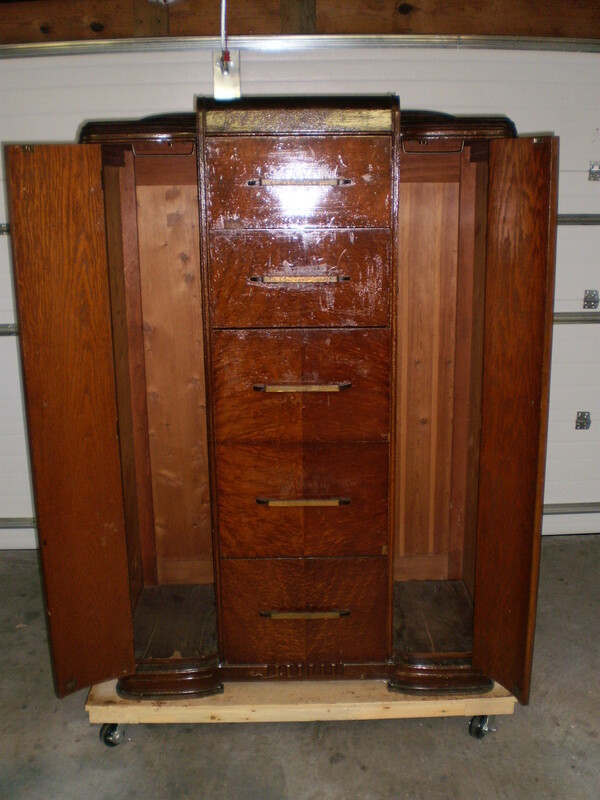 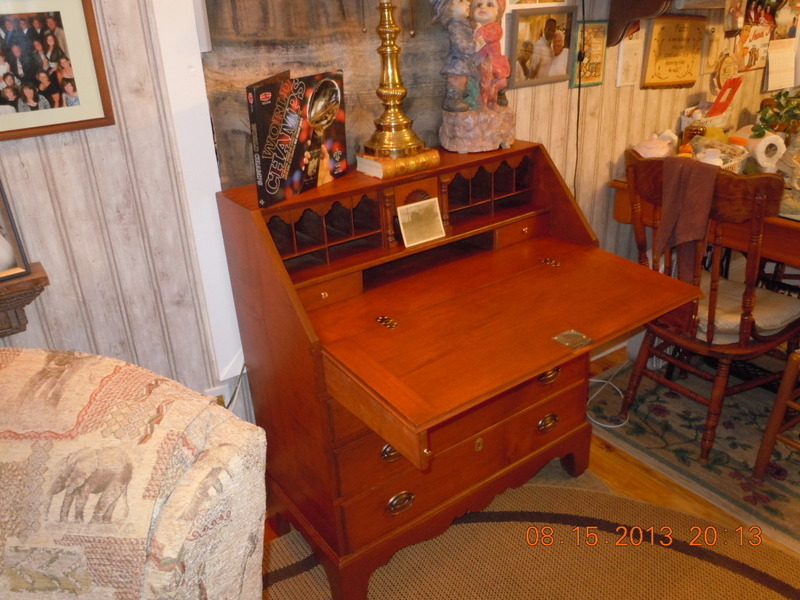 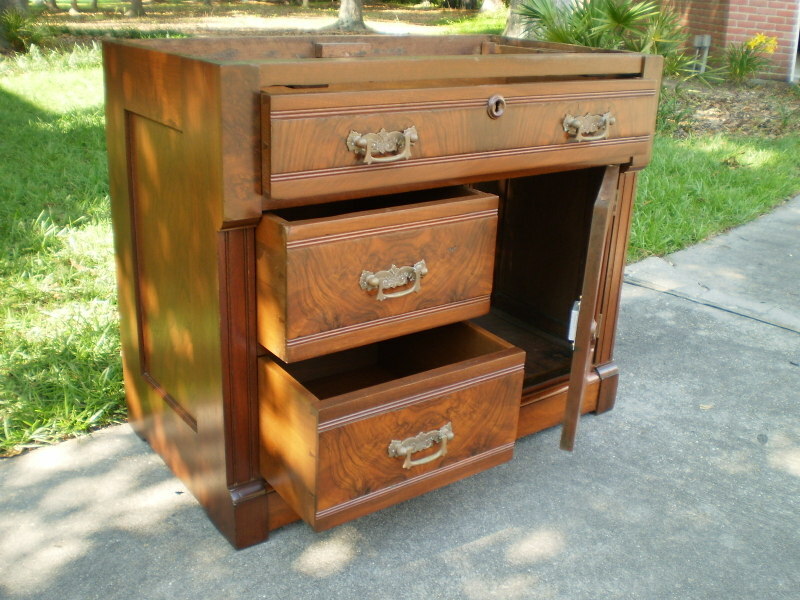 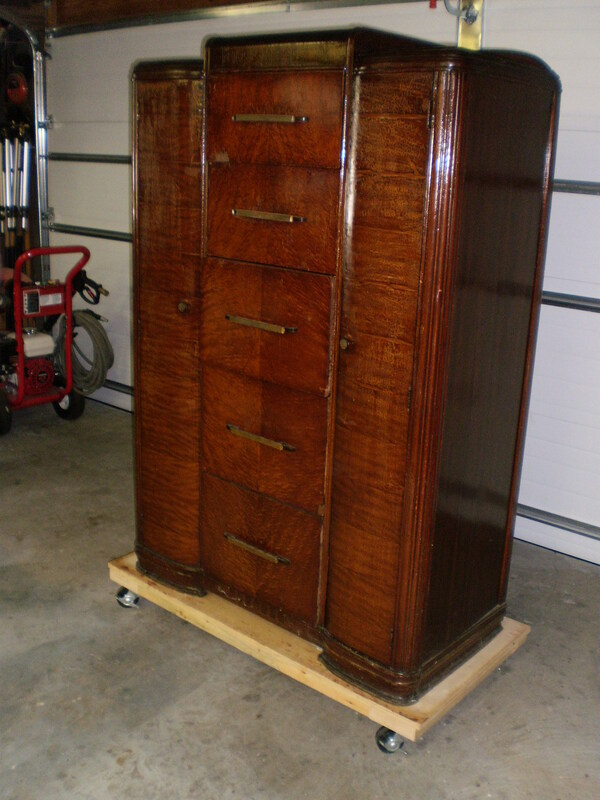 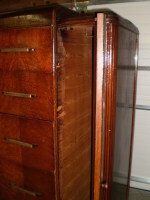 This is an antique secretary that was literally in pieces. 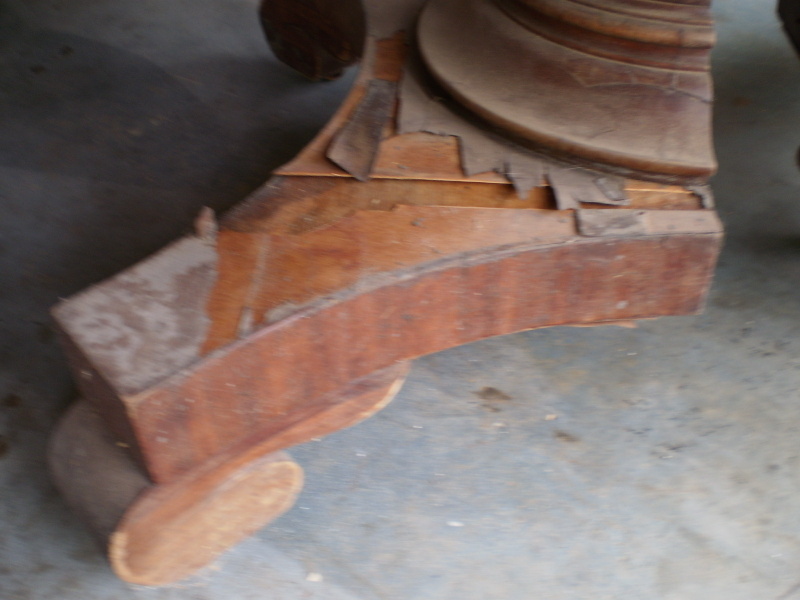 I had to figure out what went where as far the molding and feet. 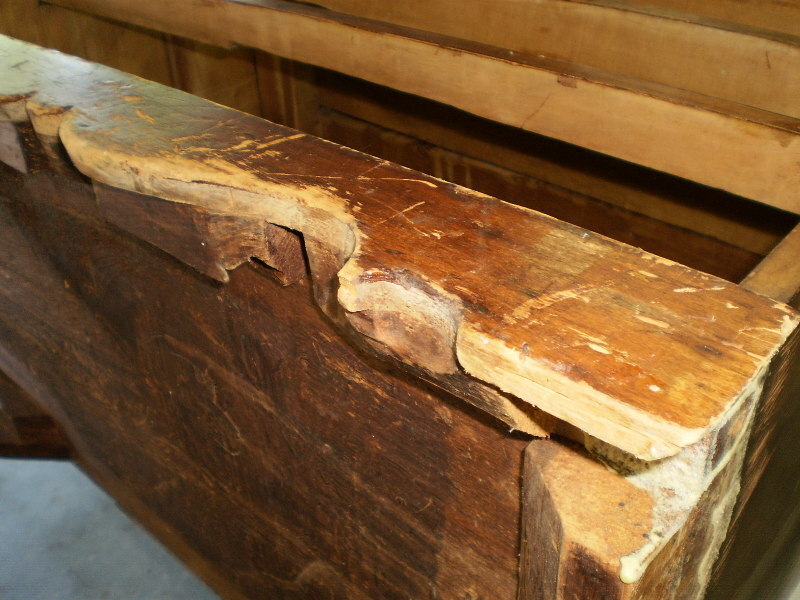 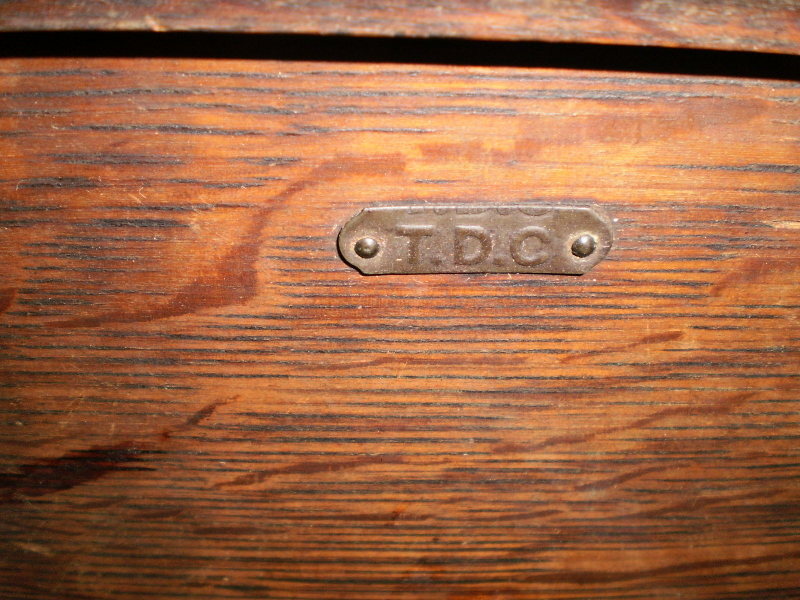 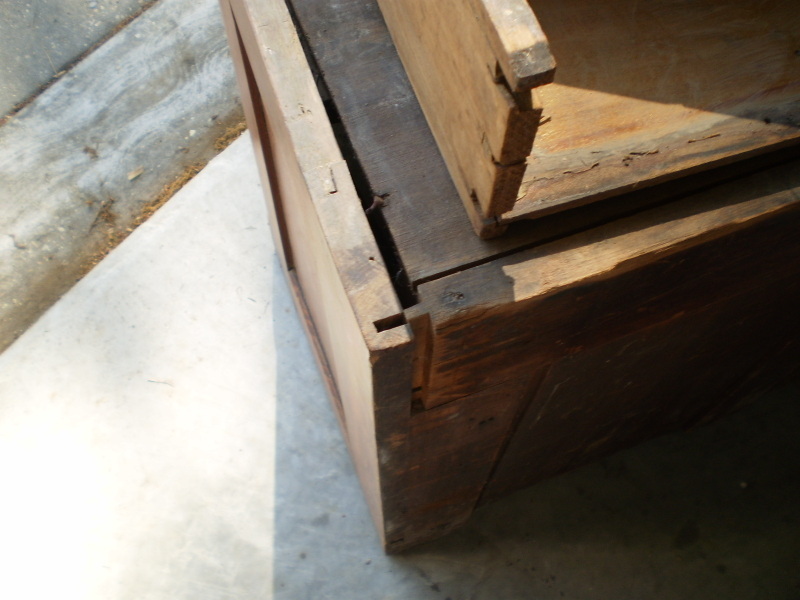 It's so old that it has hand cut dovetails. 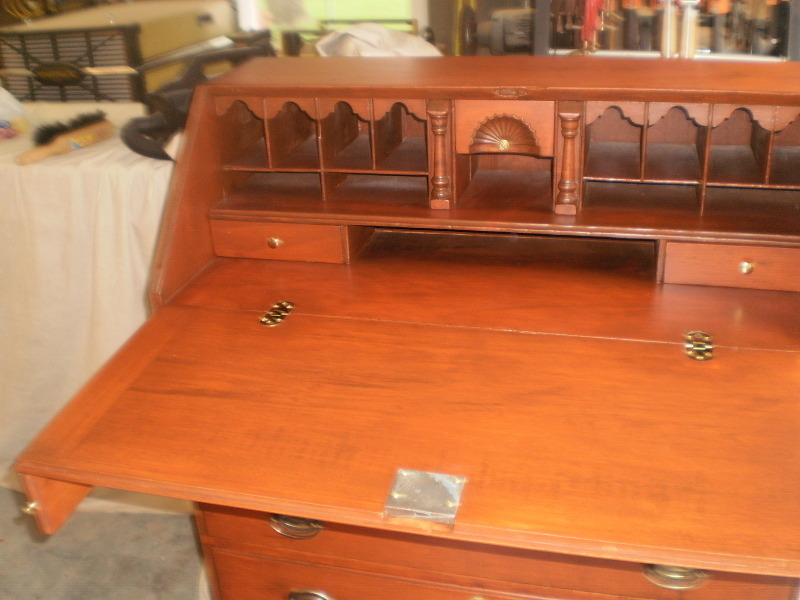 After repairing and replacing any missing pieces I then carefully restored it back to its glory days! 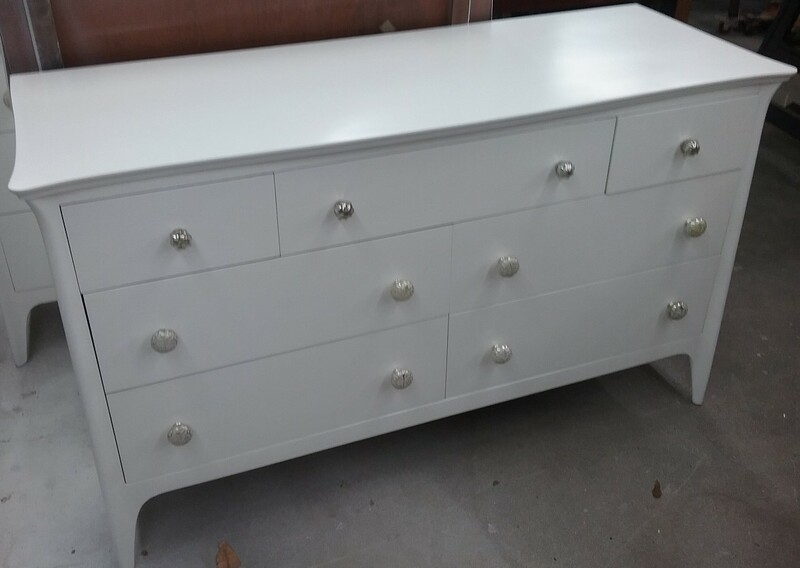 This inclued sourcing Hepplewhite drawer pulls. 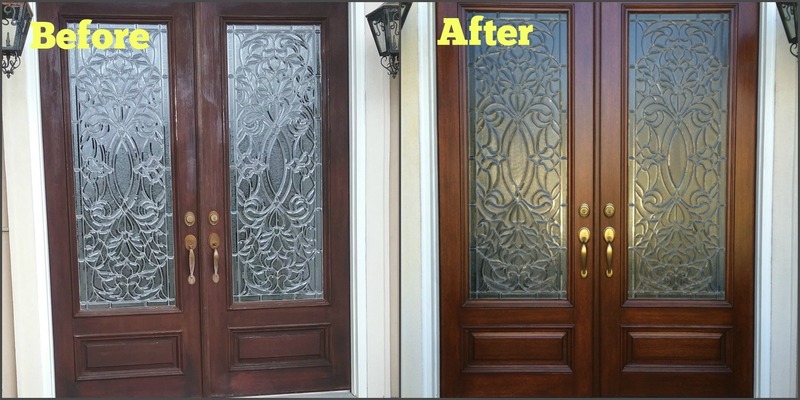 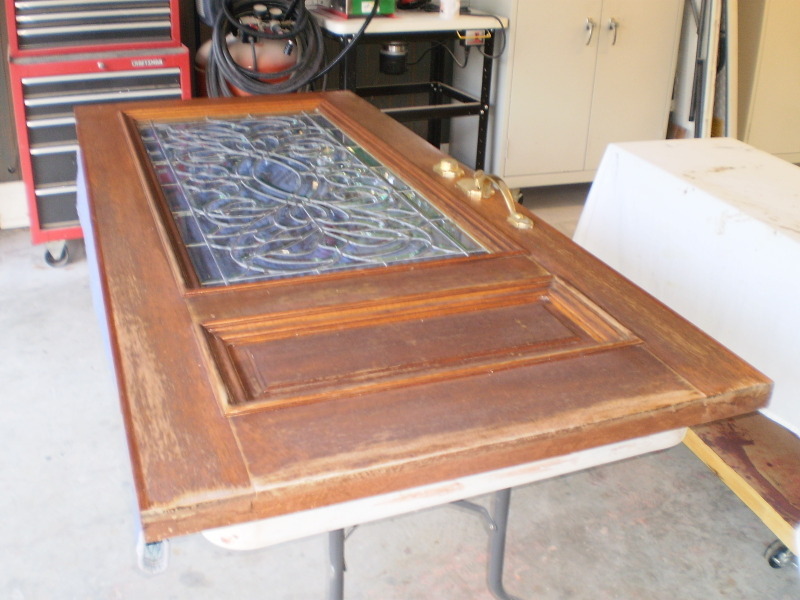 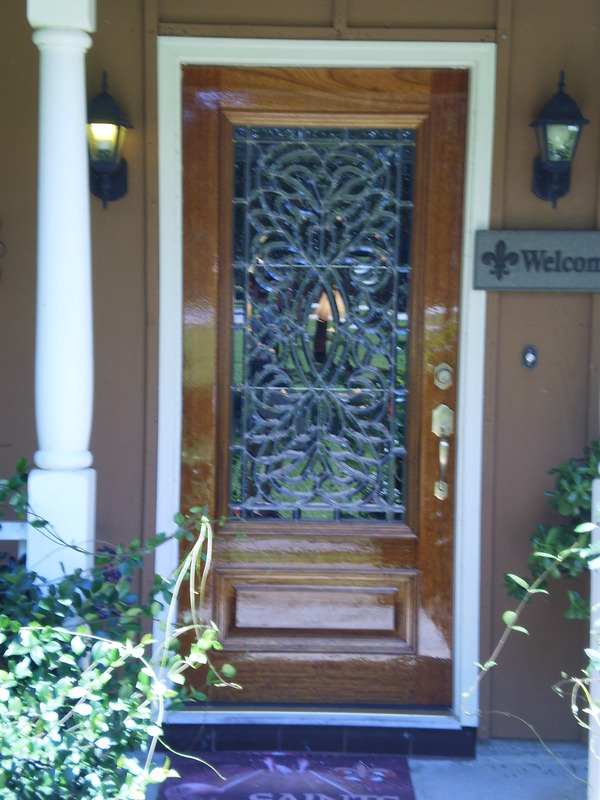 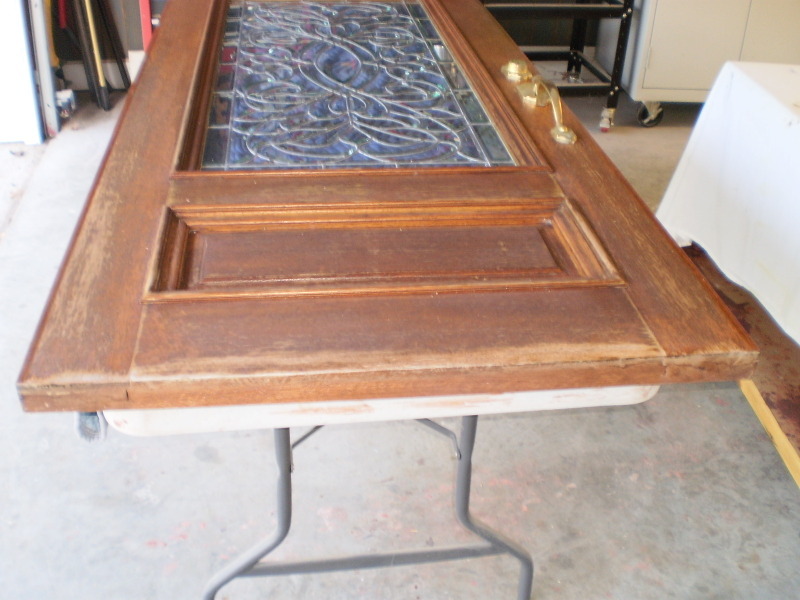 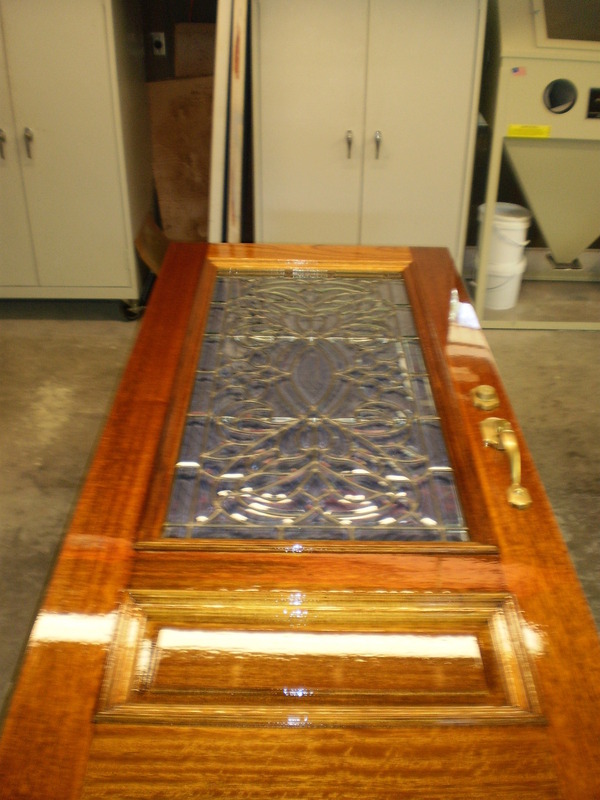 This solid Mahogany leaded glass door was in need of a refinish. 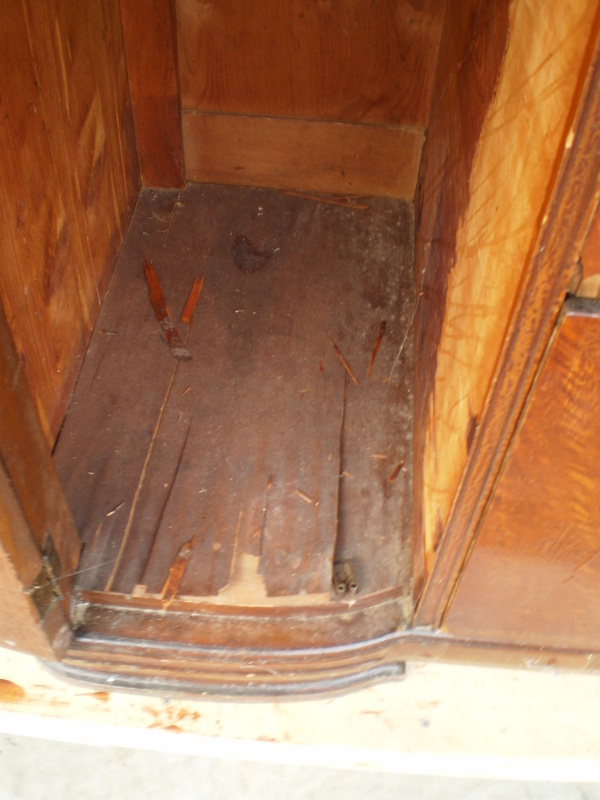 It had no water damage or rot, but needed to be completely stripped. 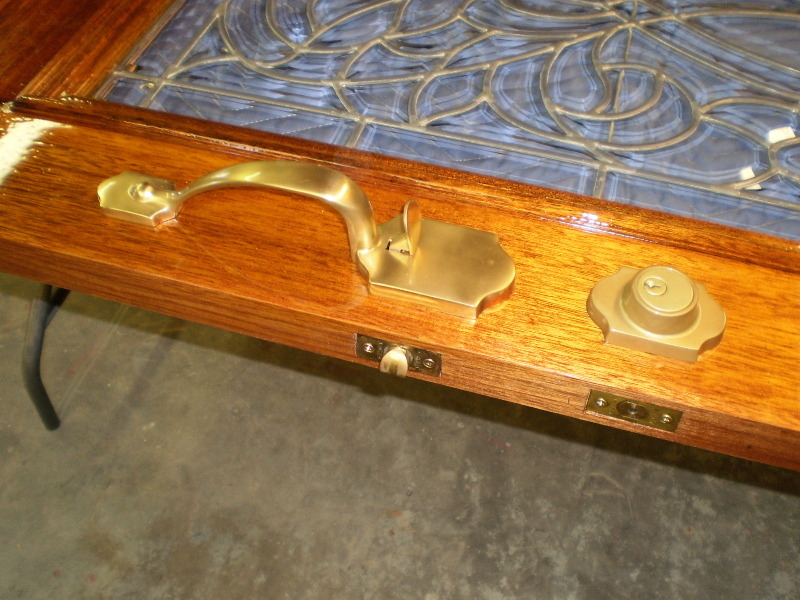 The owner also wanted to see if I could restore the solid brass handset which I did succesfully. 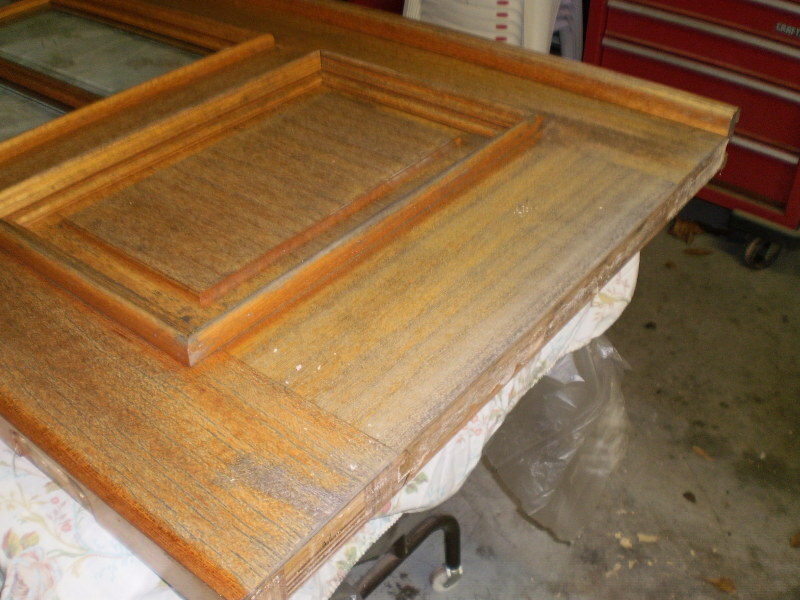 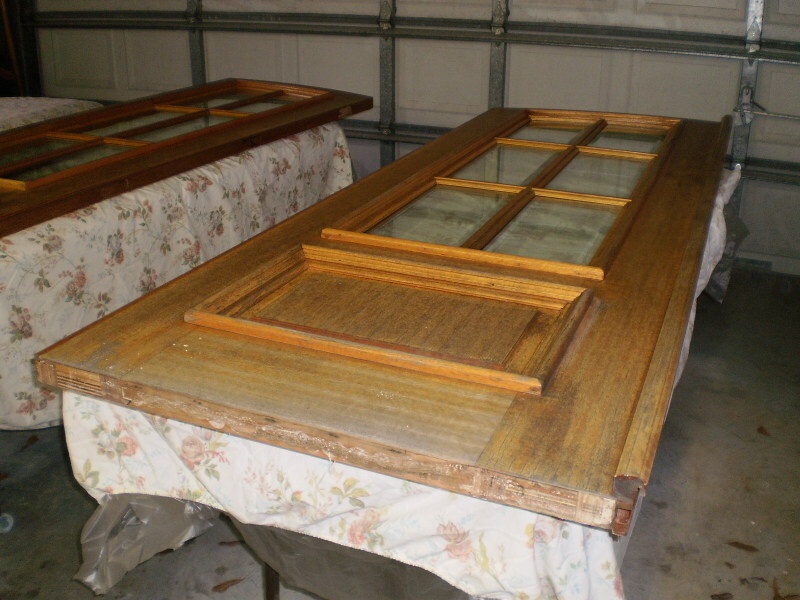 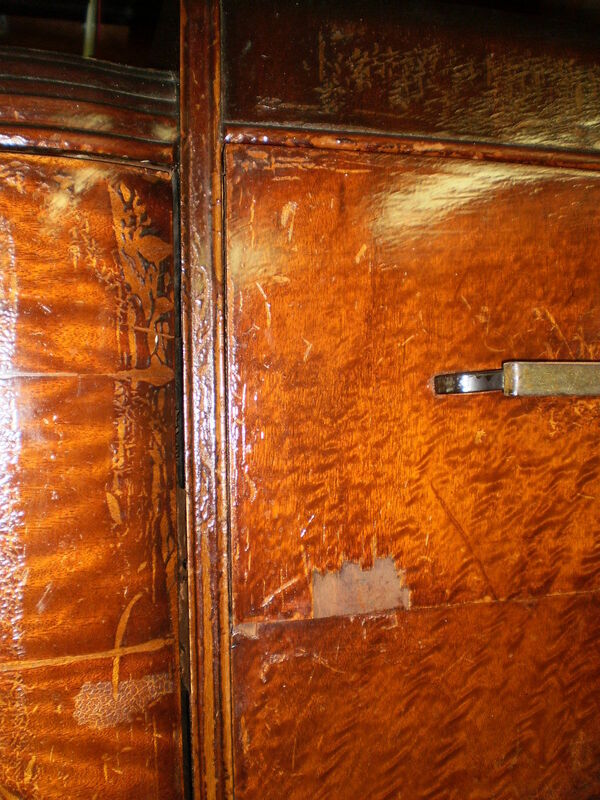 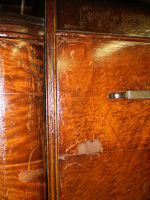 I finish this restoration by refinishing the door with epifanes to give a very hardwearing coating. 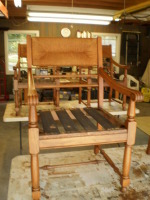 These are White Oak chairs that needed refinishing. 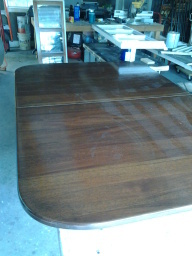 I used a Walnut stain and 3 coats of conversion varnish. 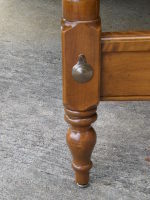 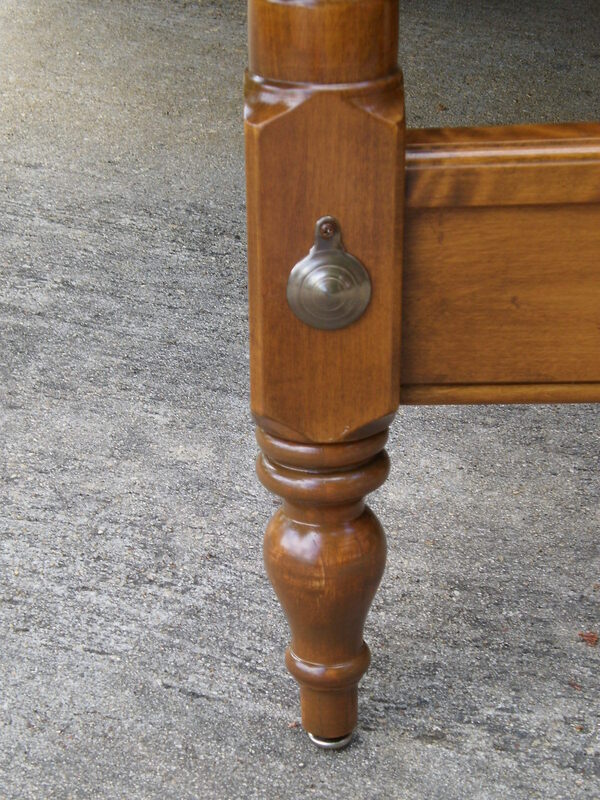 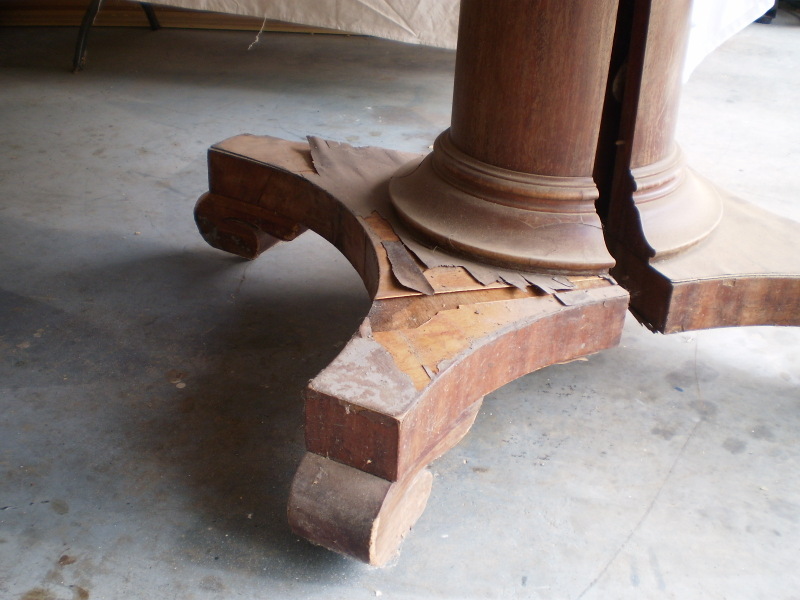 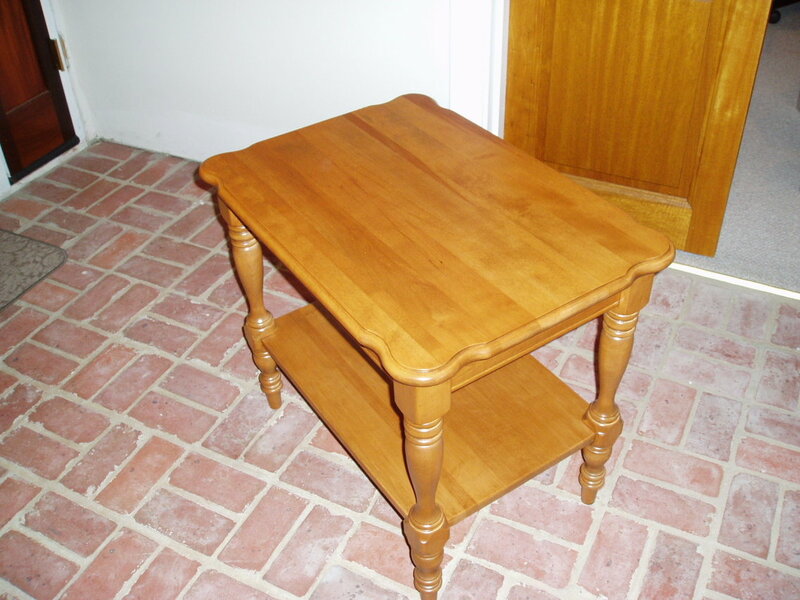 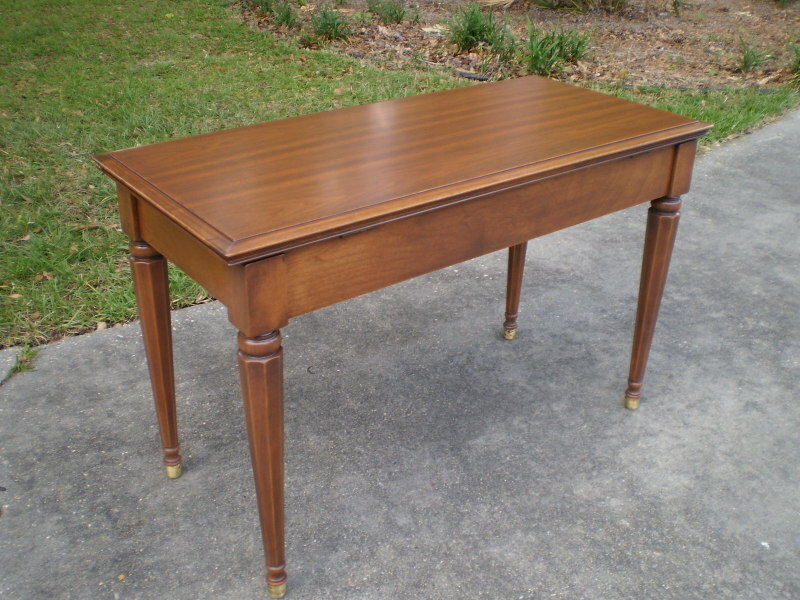 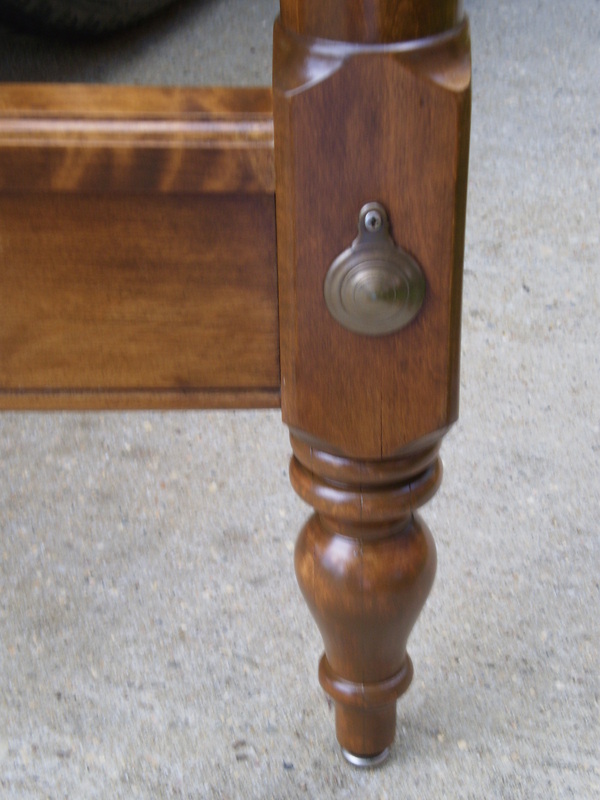 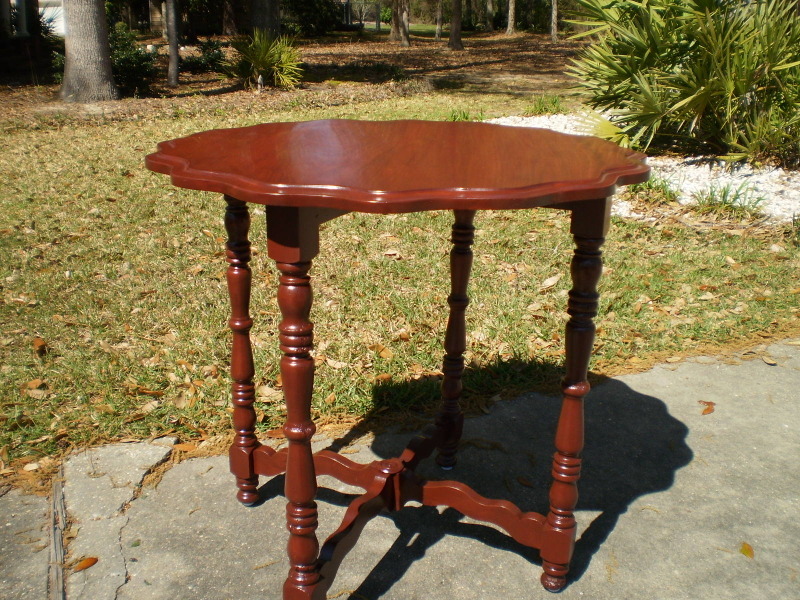 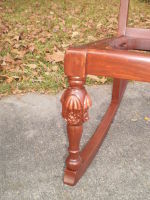 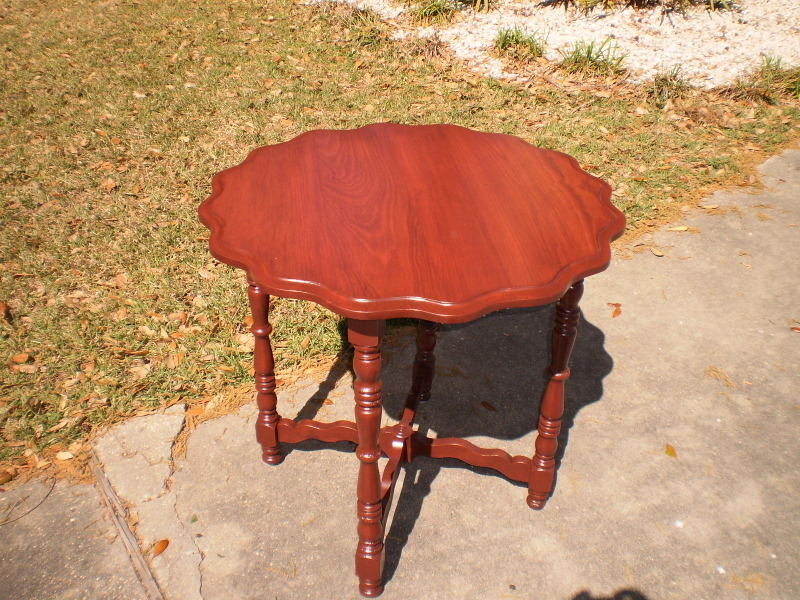 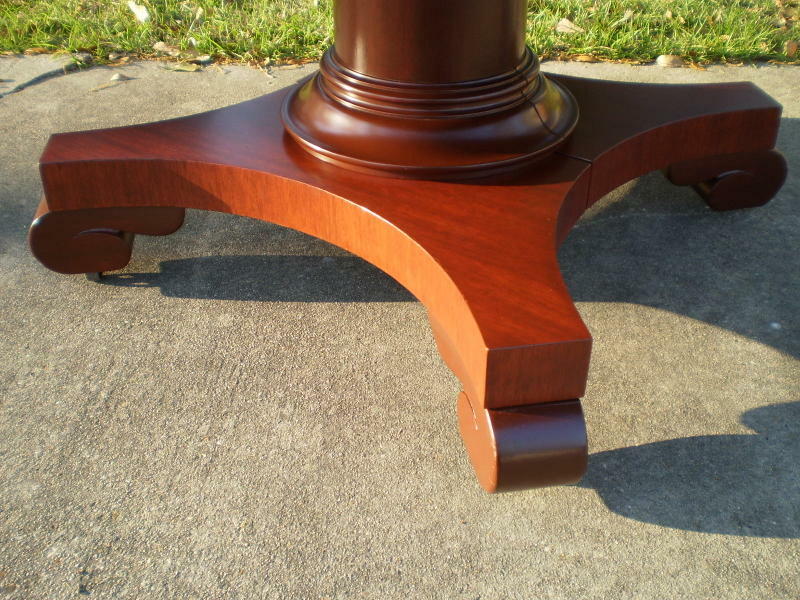 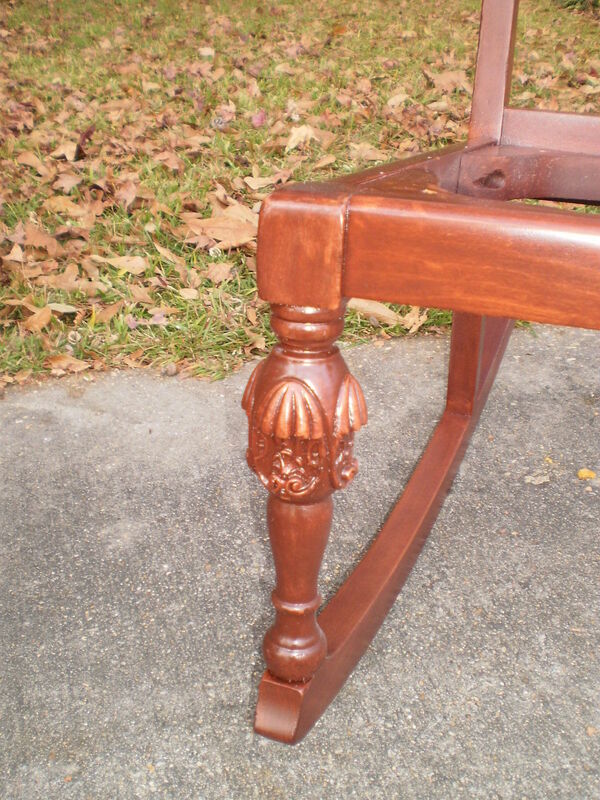 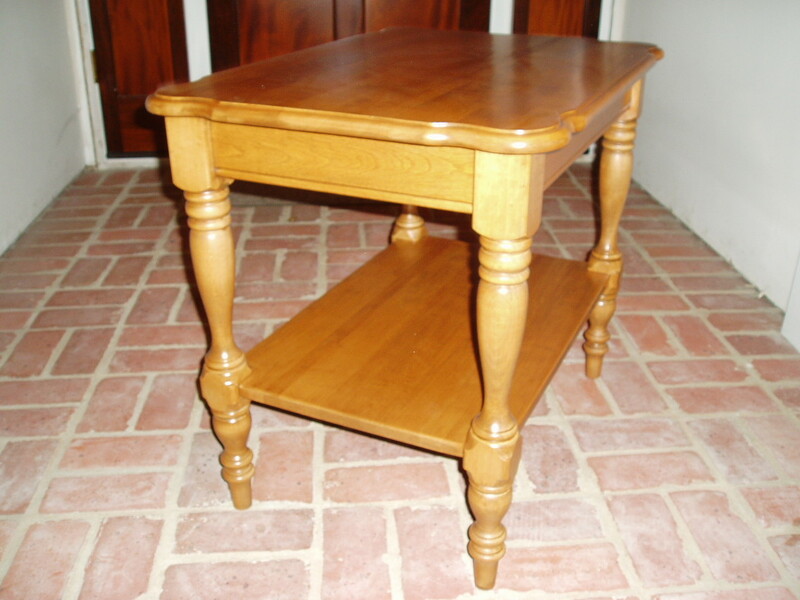 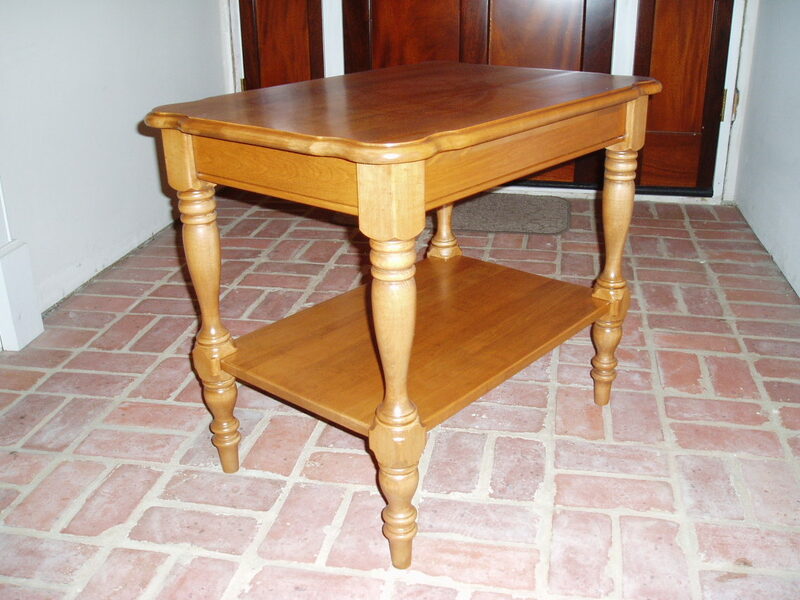 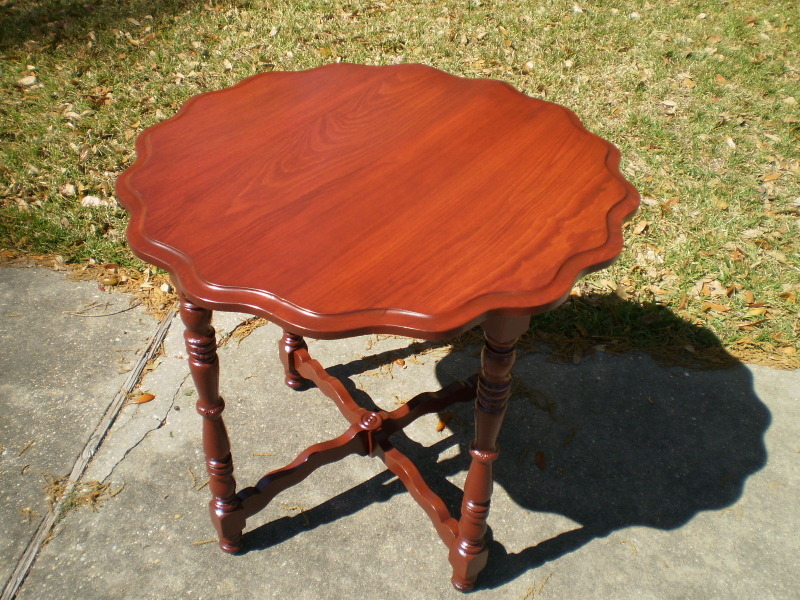 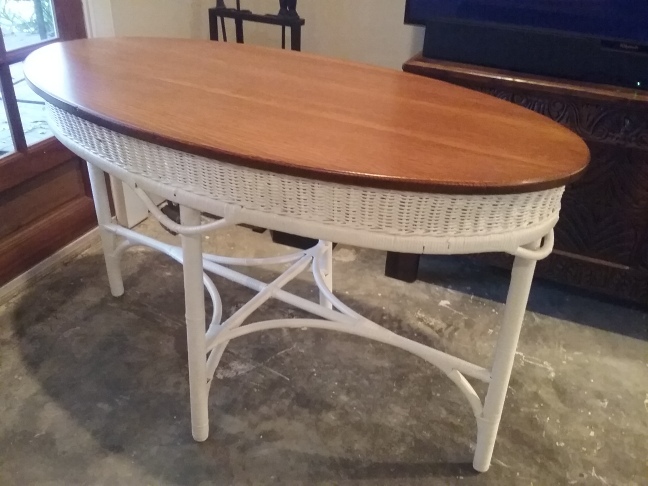 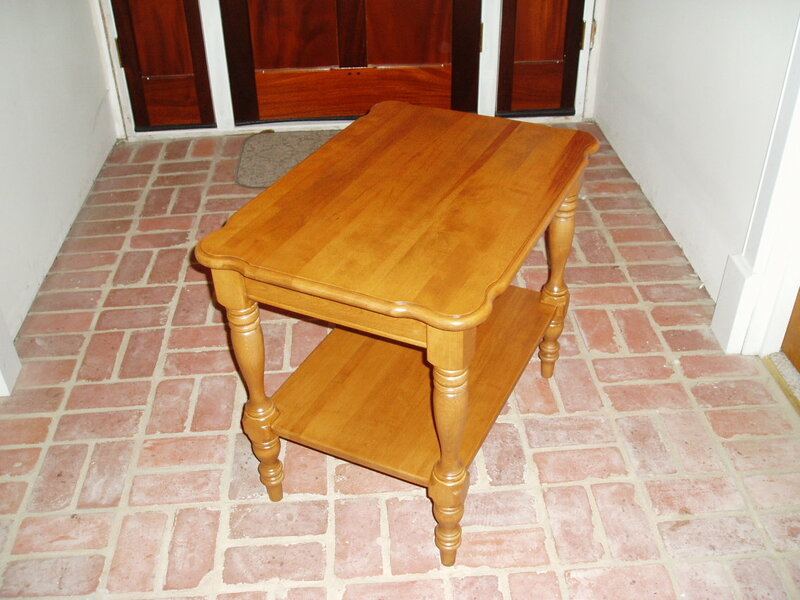 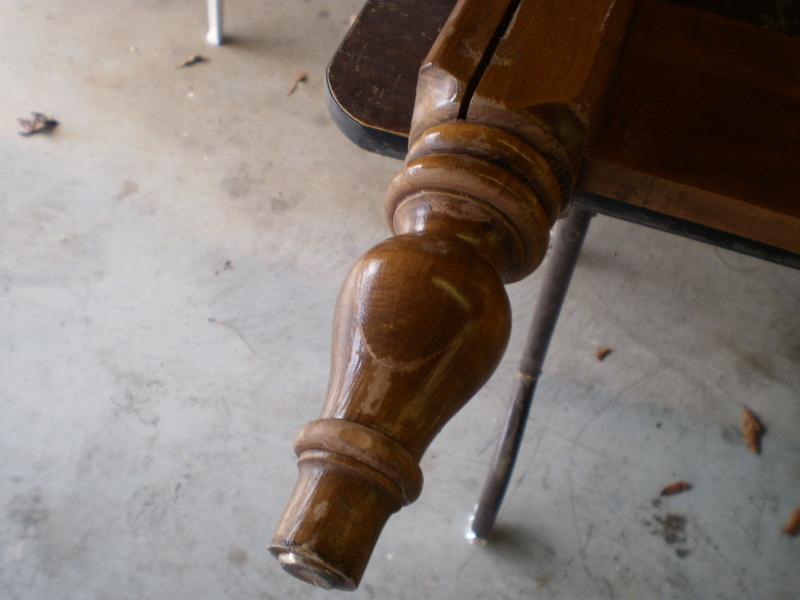 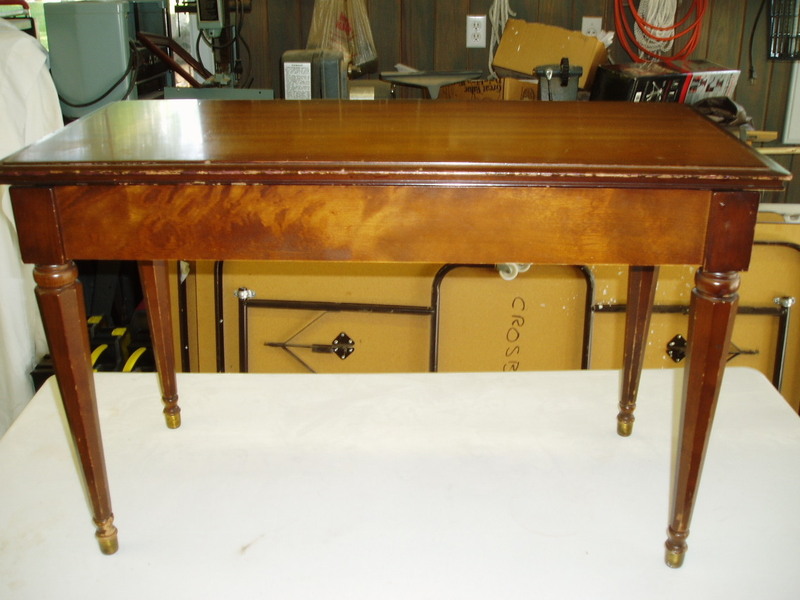 This table needed refinishing and one leg of the pedestal was broken. 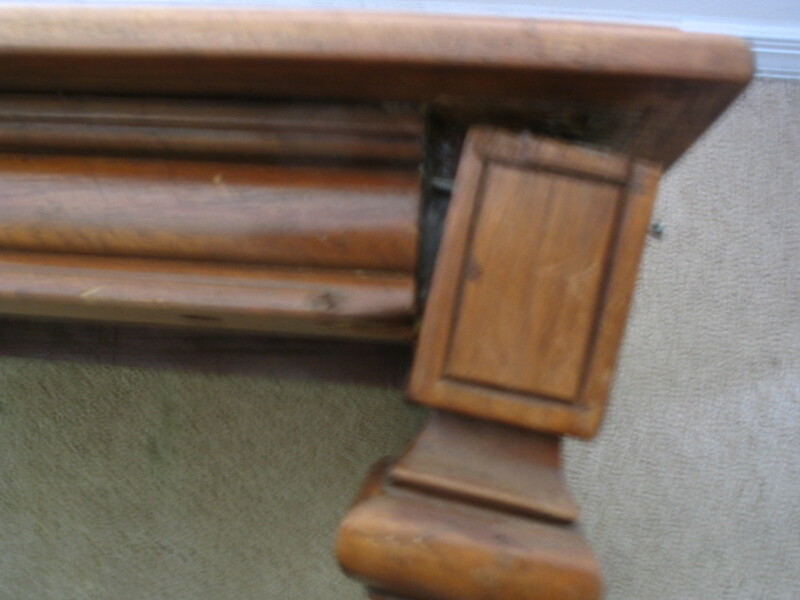 I carefully repaired this so that the joint was almost impossible to spot! I then carefully stripped the table back to reveal beautiful mahogany grain, and refinished to restore this valued heirloom back to its best. 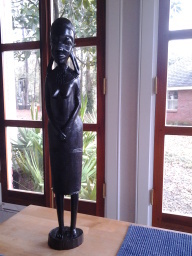 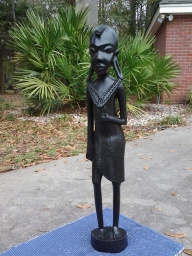 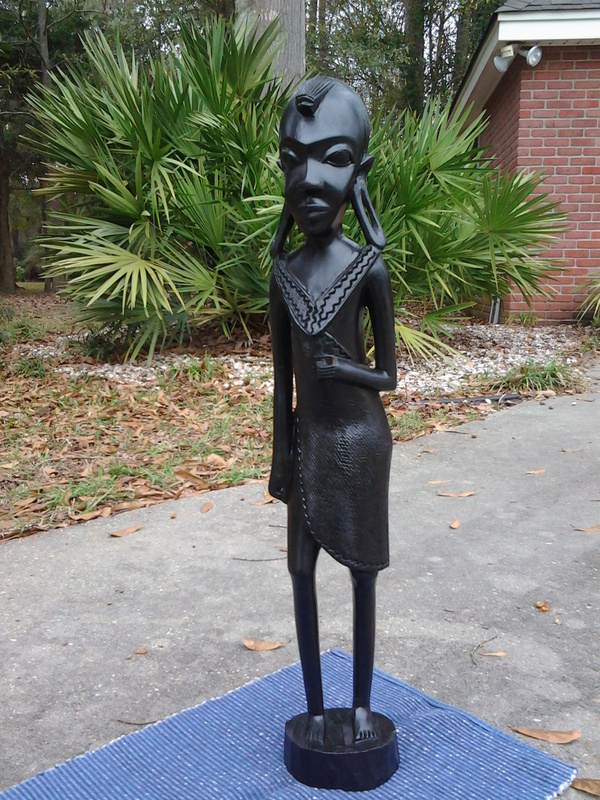 These wooden figurines, originally from travels in Africa, were sadly water damaged by Hurricane Katrina. The 'surgeries' included constructing a new shield using Spanish cedar, repairing a broken foot on the large elephant using mahogany plus a little bit of 'tusk restoration', restoring an ear on the African man using a slice of poplar and a creating a tail for the small elephant using cypress. 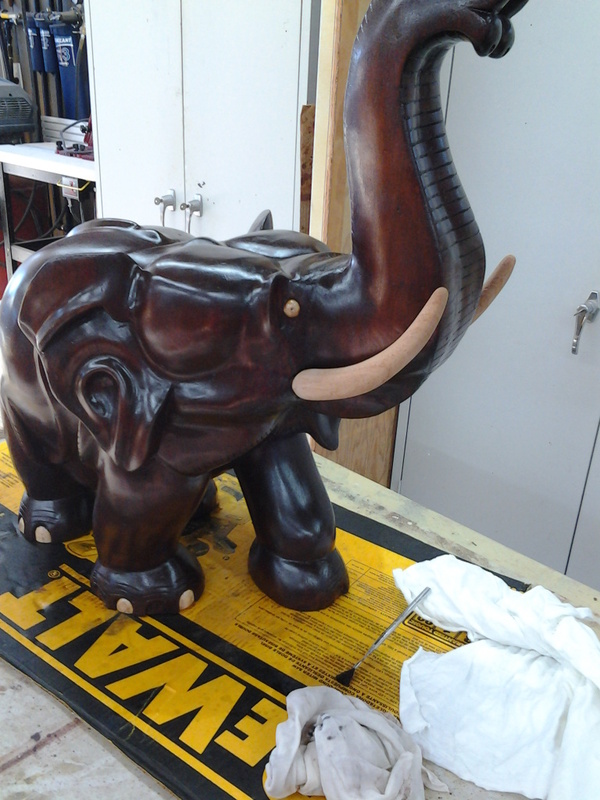 The final 'spa' treatment was a custom 'pedicure' for the large elephant(and we all need a good pedicure from time to time) making those toe nails shine and ready for a busy day in the jungle! 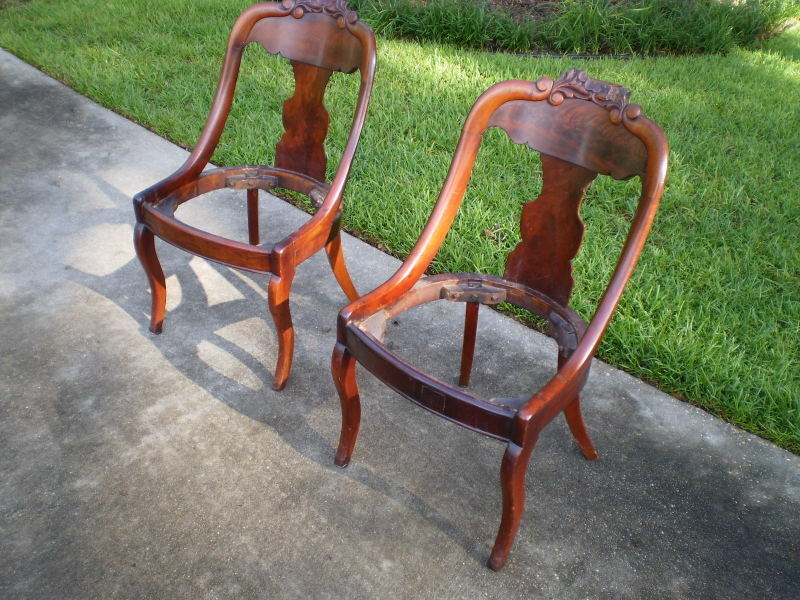 These treasured heirlooms are now back to showroom condition. 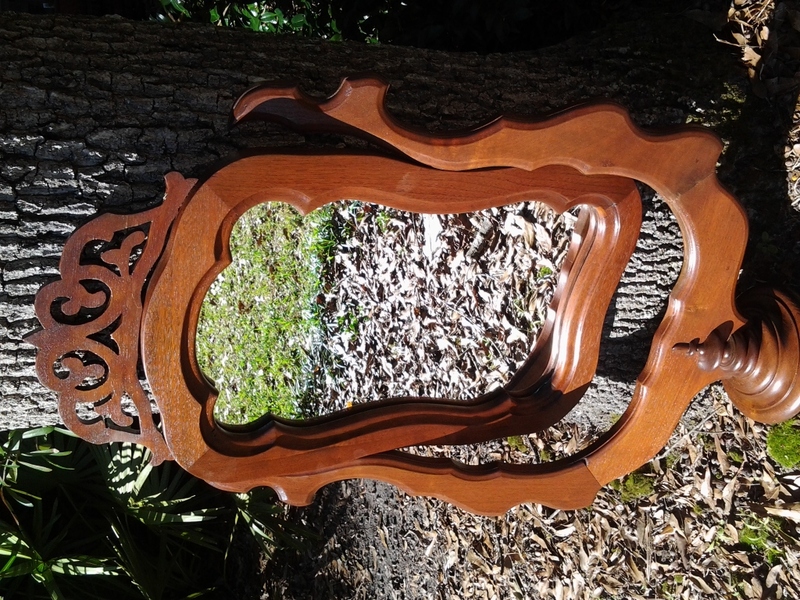 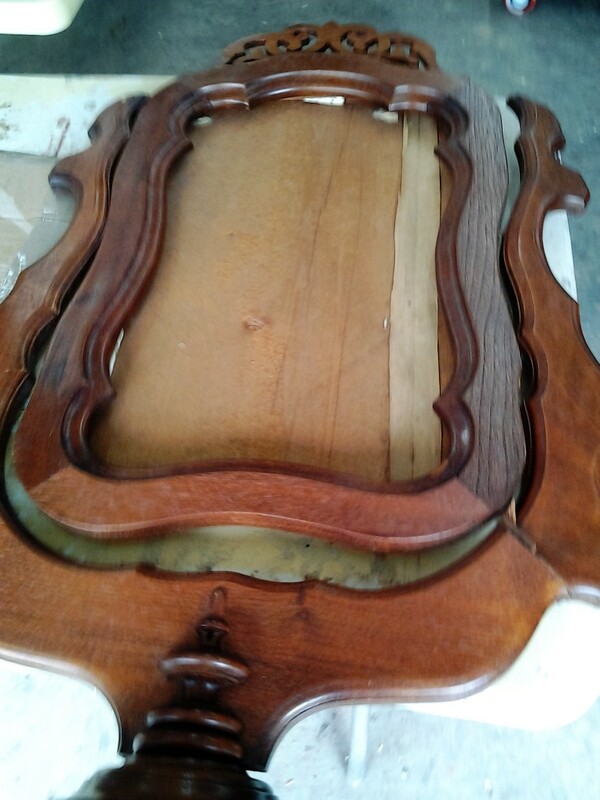 This walnut mirror fell and broke in a few places, damaging both the frame and the fretwork plus the mirror. 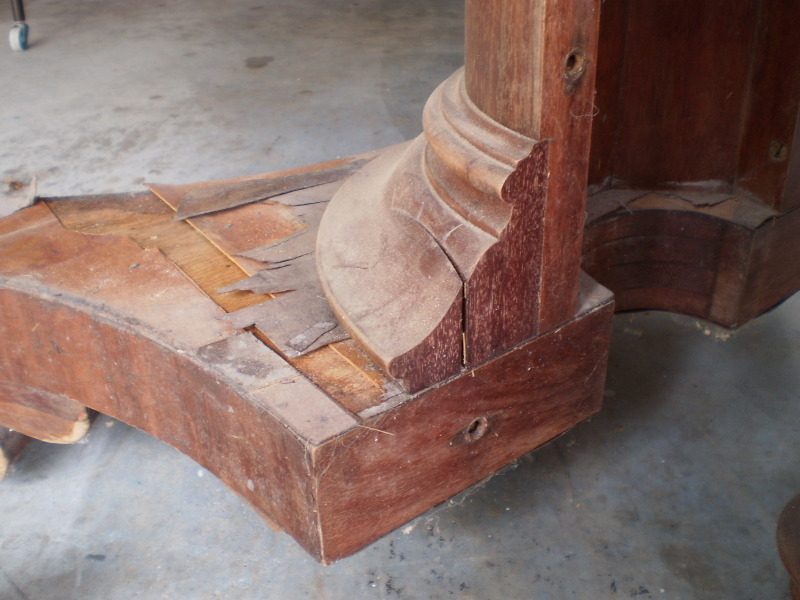 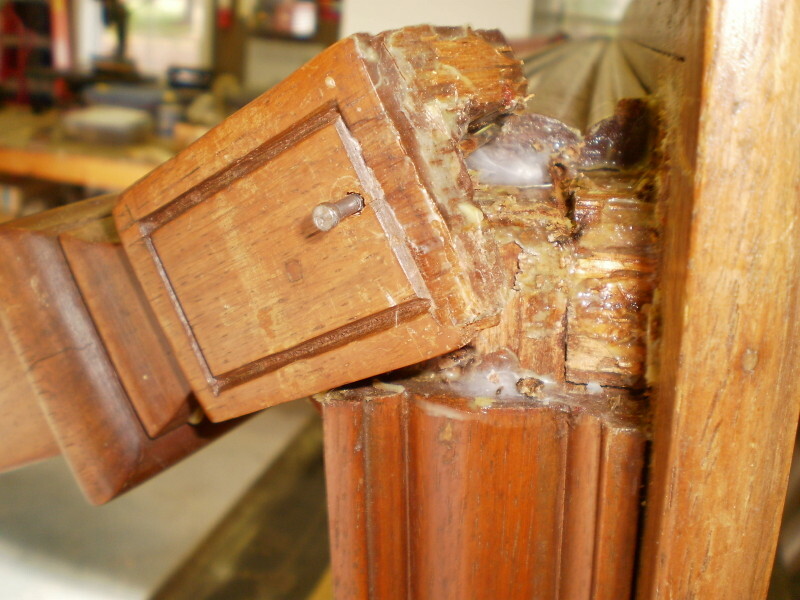 Not an easy repair since a piece of wood needed to be 'grafted' on to replace the missing piece of wood to complete the frame. 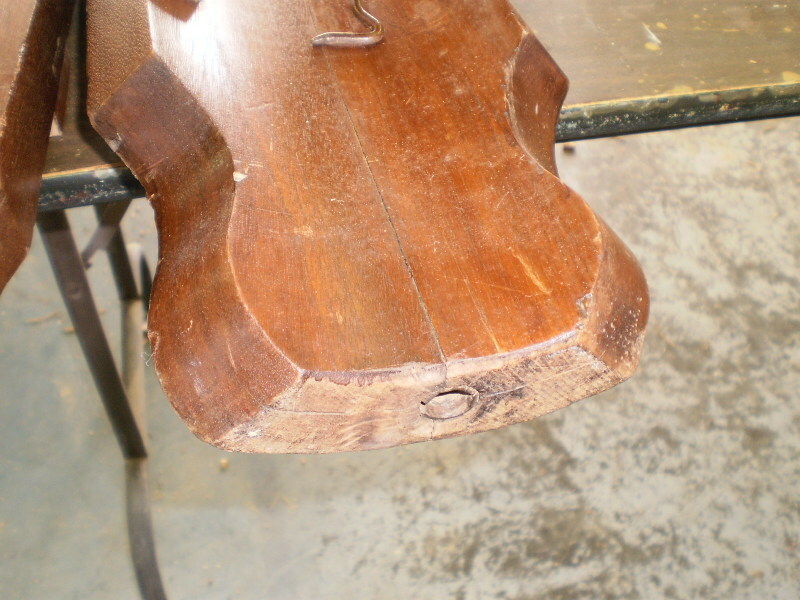 A bowtie joint was added to the back to provide extra strength. 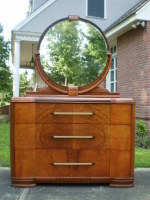 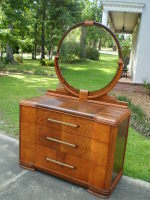 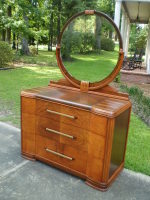 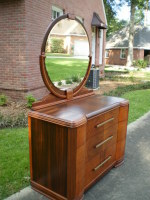 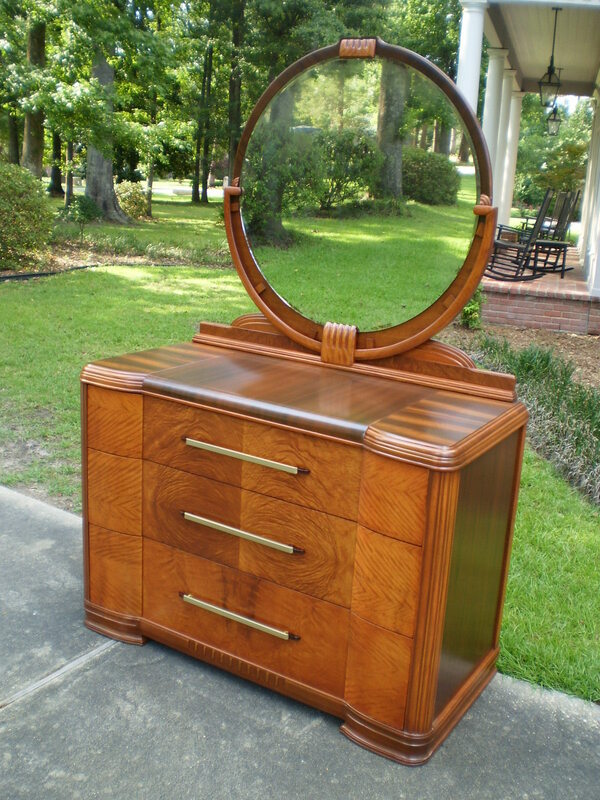 With a replacement mirror added this beautiful piece of furniture is now back at its best. Something different for us at Heirloom Restored: this cabinet has had a few patched up repairs in the past and was painted white (badly). 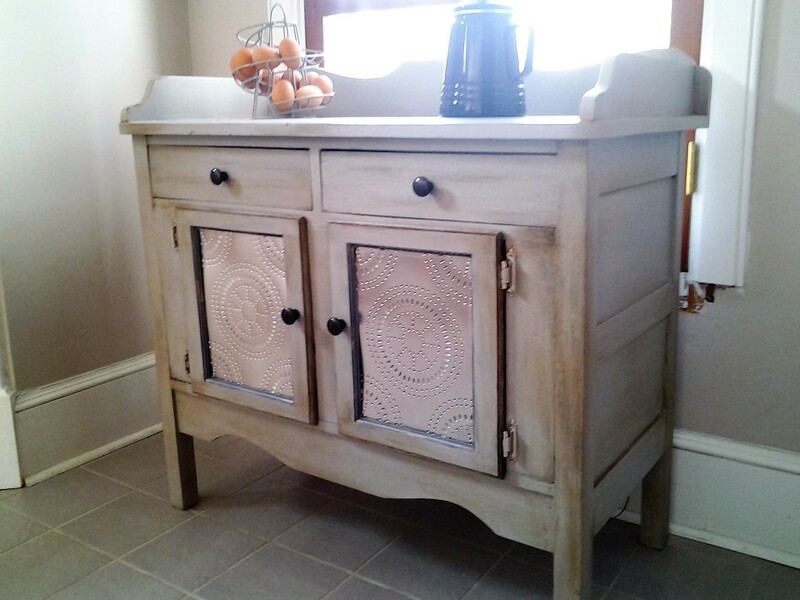 It was more shabby than chic when we got it but with a replacement 'floor' base installed, a redesigned backboard and then stripped back to the bare wood, we then added some pie safe panels, painted it in soft gray chalk paint and finally distressed it slightly and finished in wax. Looks fanastic! 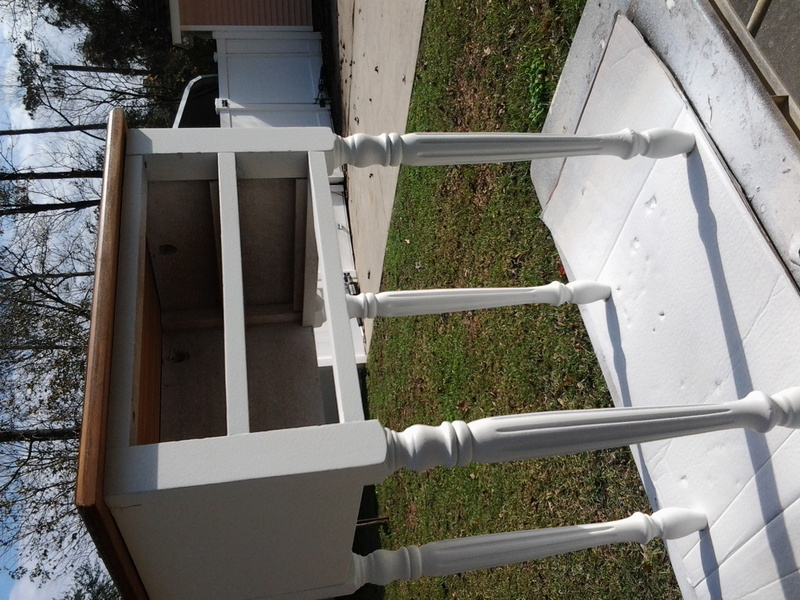 Another shabby chic project. 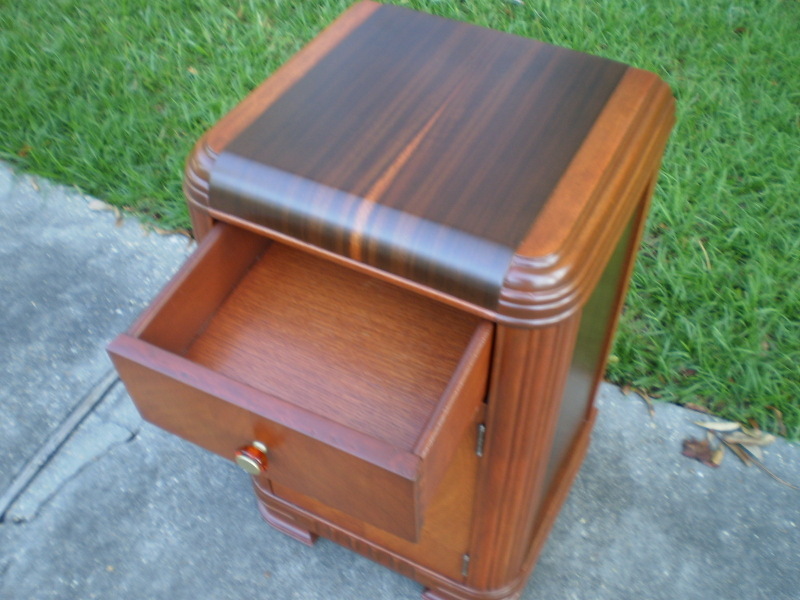 This time a little bedside or telephone table. 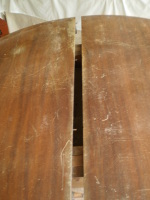 The top was badly warped and needing replacing. 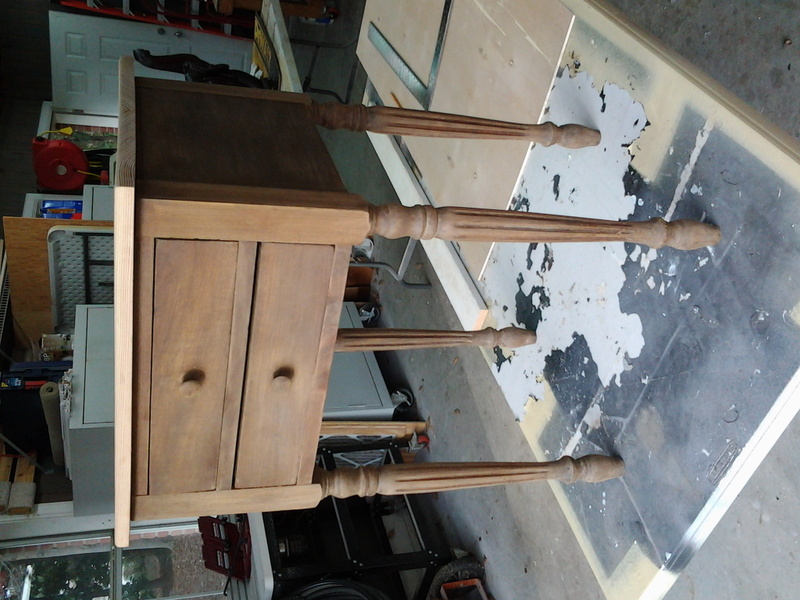 After completely restripping and repainting in a soft gray chalk paint, we highlighted the fluted legs with some gold wax and finally gently distressed and finished with wax. 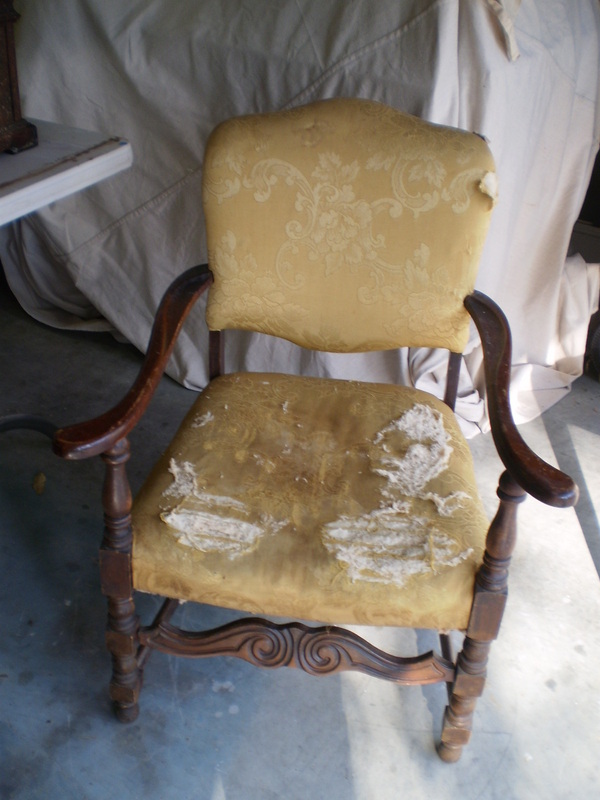 The final 'shabby chic' masterpiece looked amazing. 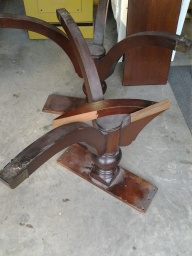 These pieces needed a new look for a nursery. 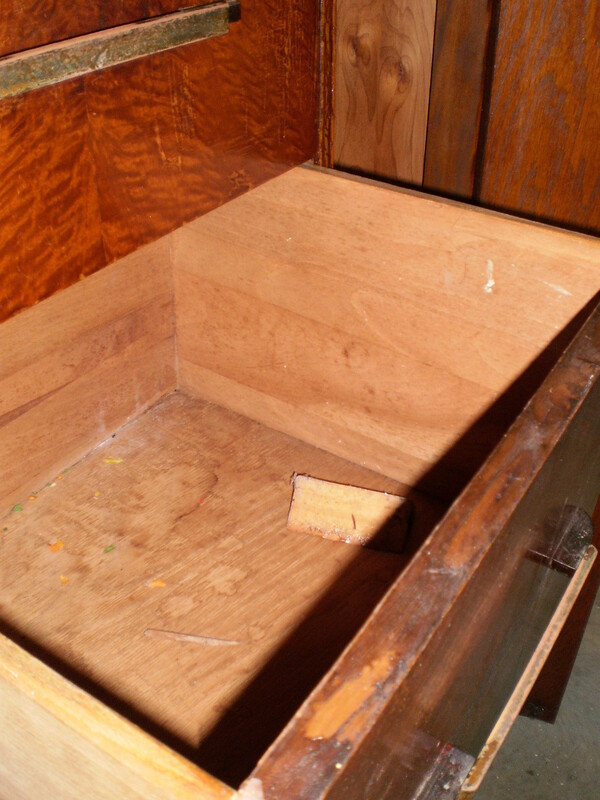 The baby was on its way. 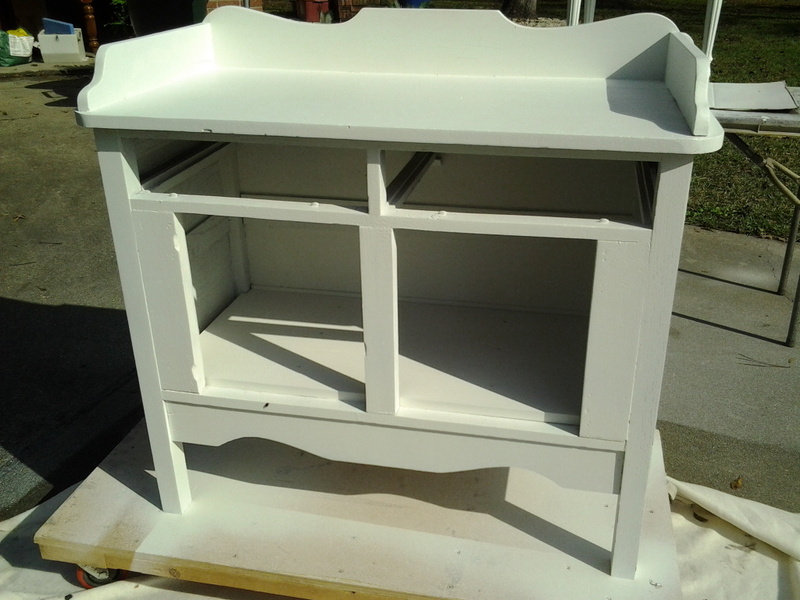 We completely sanded the pieces before priming and then painting in Benjamin Moore Simply White. 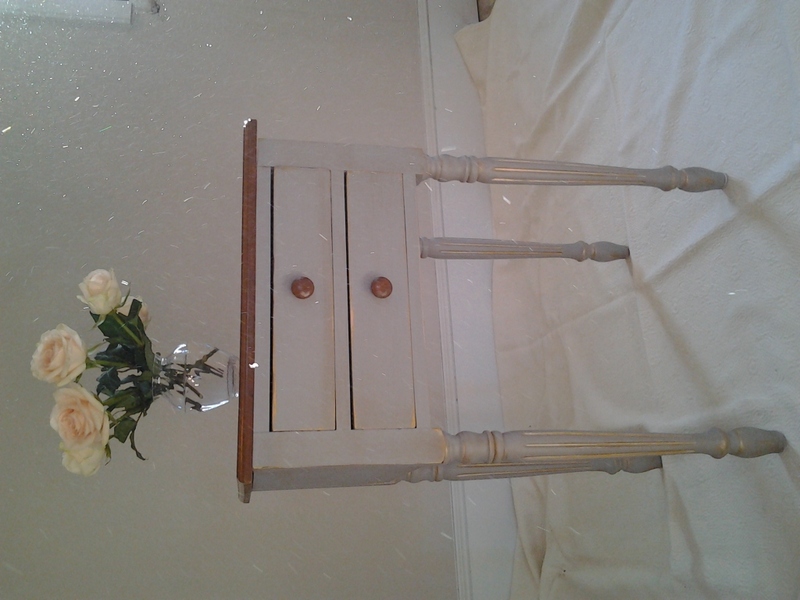 Our client had chosen the sparkly knobs! 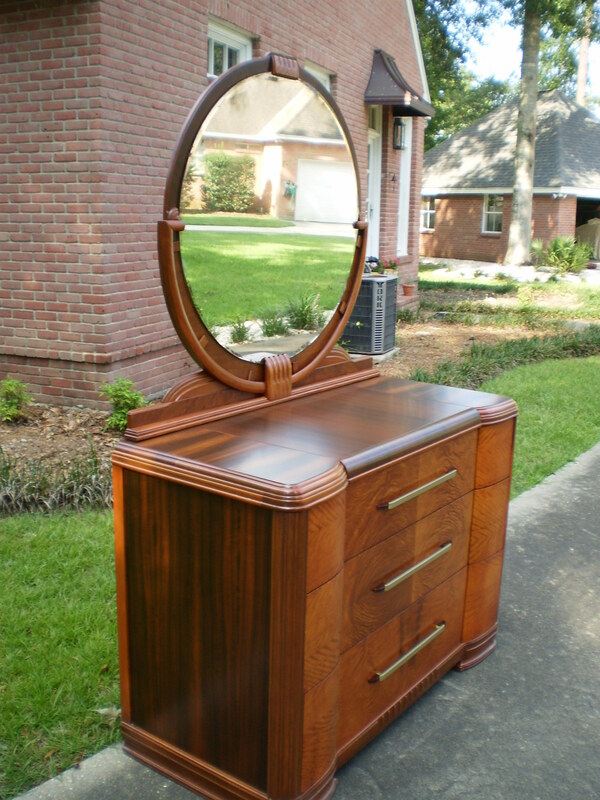 Looked great! 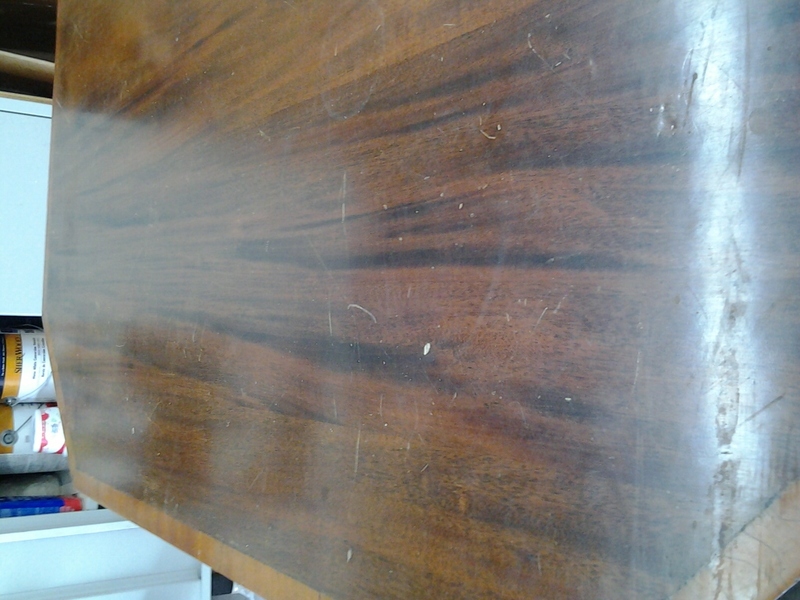 This table came to us looking very worse for wear, black marks on the oak table top that was so dark you could not see the beauty of the wood. 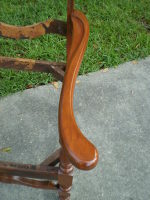 We took the top back to bare wood and restained to highlight the grain before painting the rattan base in a soft white. 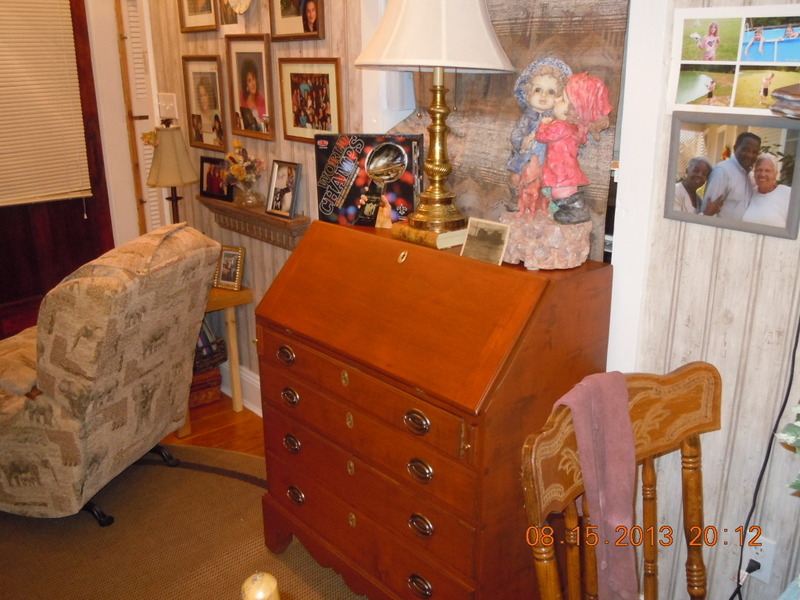 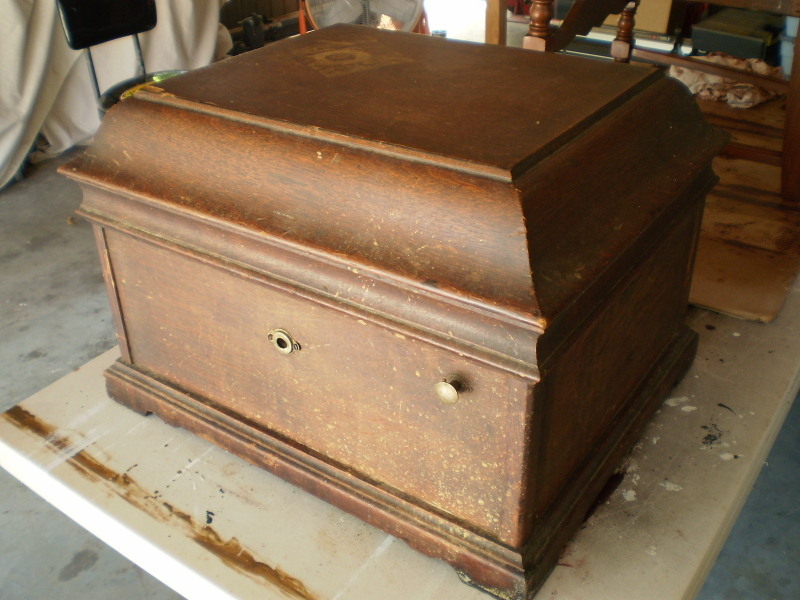 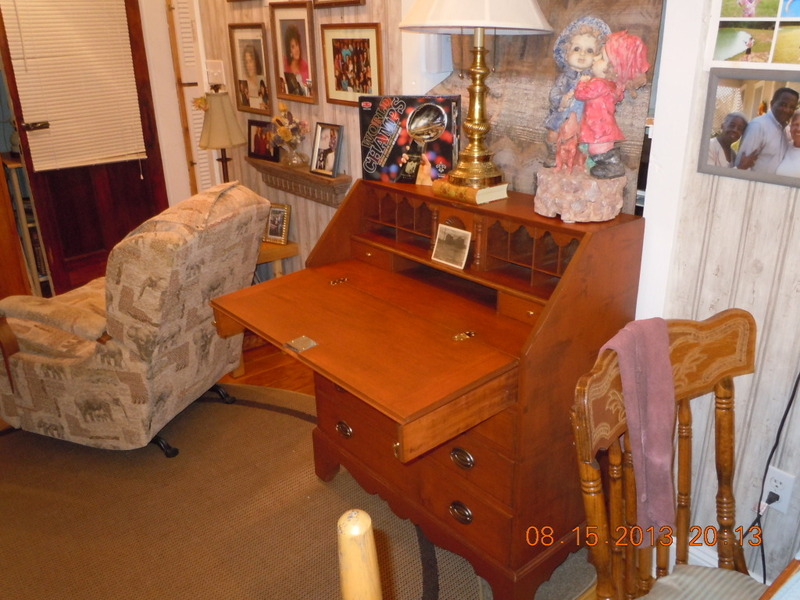 "We treat your family heirlooms like they are our own!